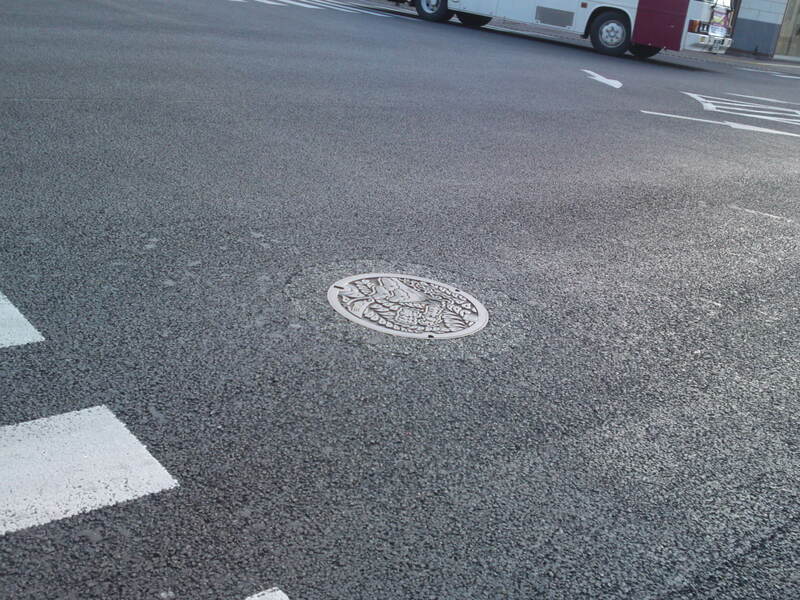 Manhole Covers In Shizuoka Prefecture 35 bis: New Commemorative Fire Hydrant Manhole Cover Being Installed in Shizuoka City! 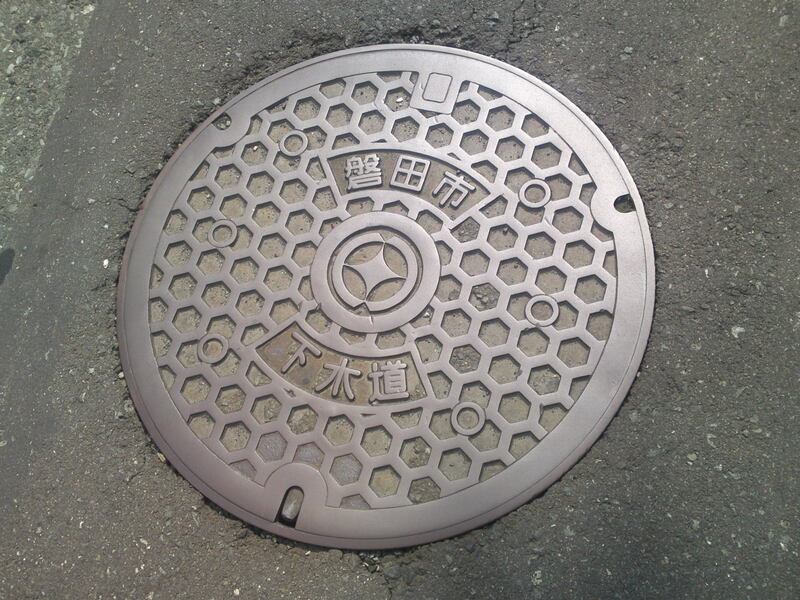 Yesterday some Shizuoka City Civil servants had been already been busy all morning when I reached the spot on the east side of the Shizuoka Municipal Hospital for the official installment of the new manhole cover to be be laid upon 40 out 56 fire hydrants. 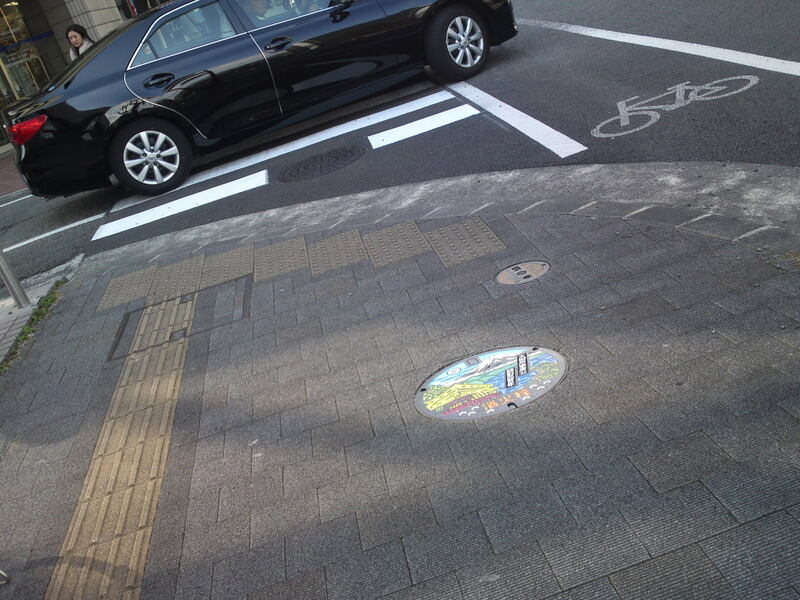 The spot had been conveniently chosen across the street from the Sumpu Castle Park! 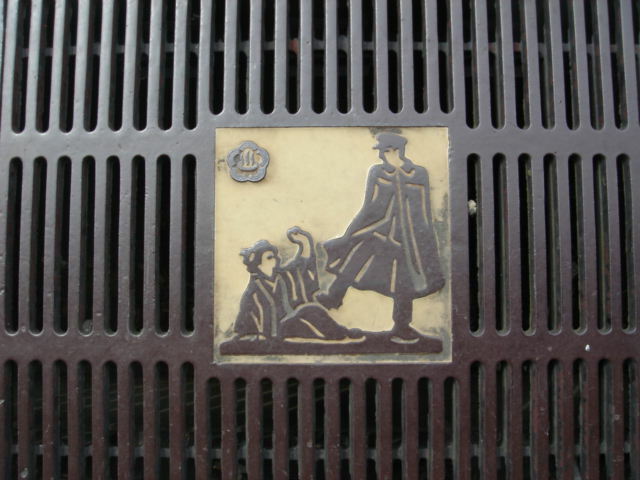 on the street along Cenova Department Store! 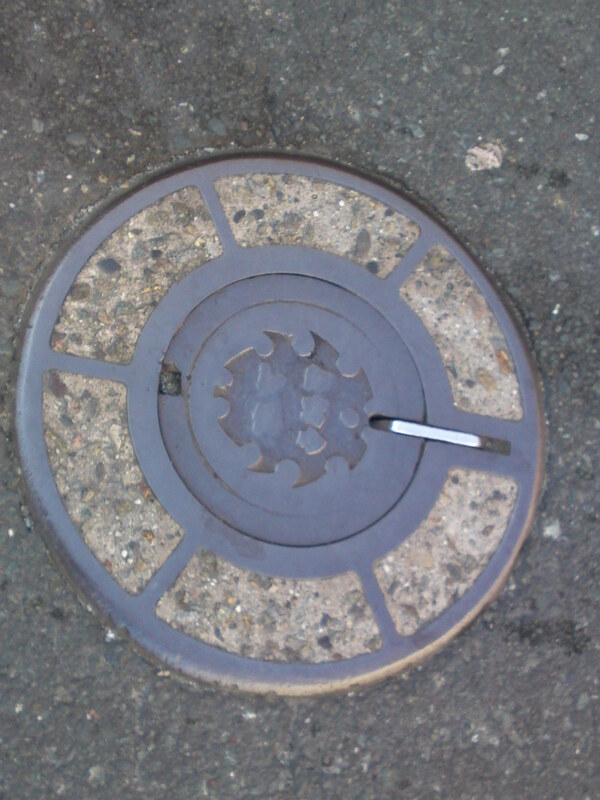 This was the spot chosen for the “media”! 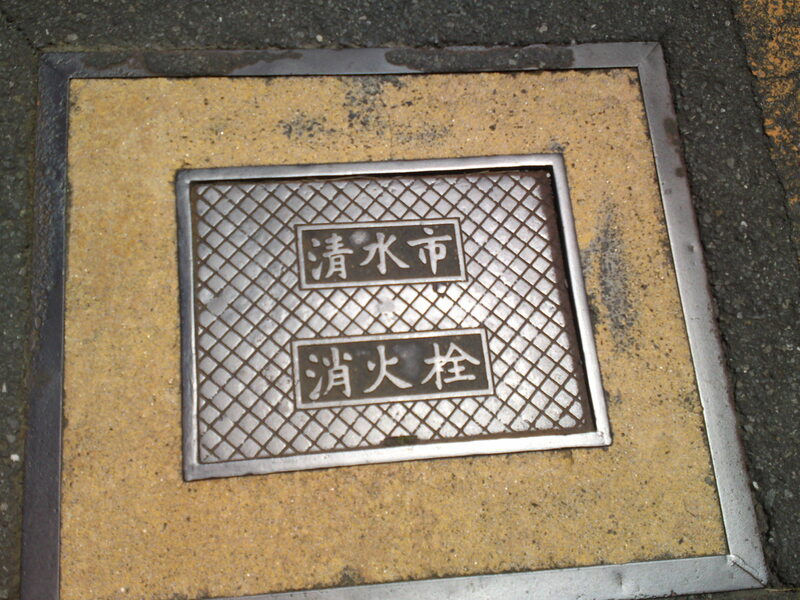 The old plate laid in 2007 to commemorate the 400th Anniversary of Lord Tokugawa Ieyasu retirement to Sumpu Castle in Fuchu as Shizuoka was called then. 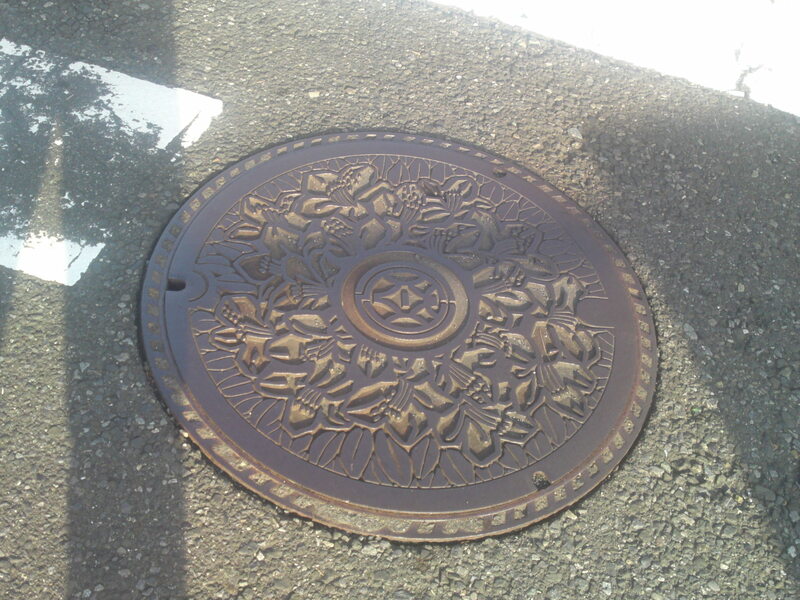 One can discover other beautiful covers nearby but they don’t concern the fire department. 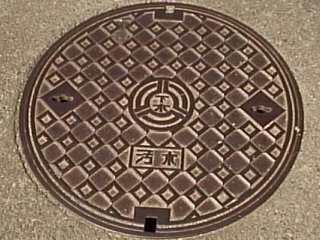 The one above is laid over a manhole for access to spent waters and sewers. 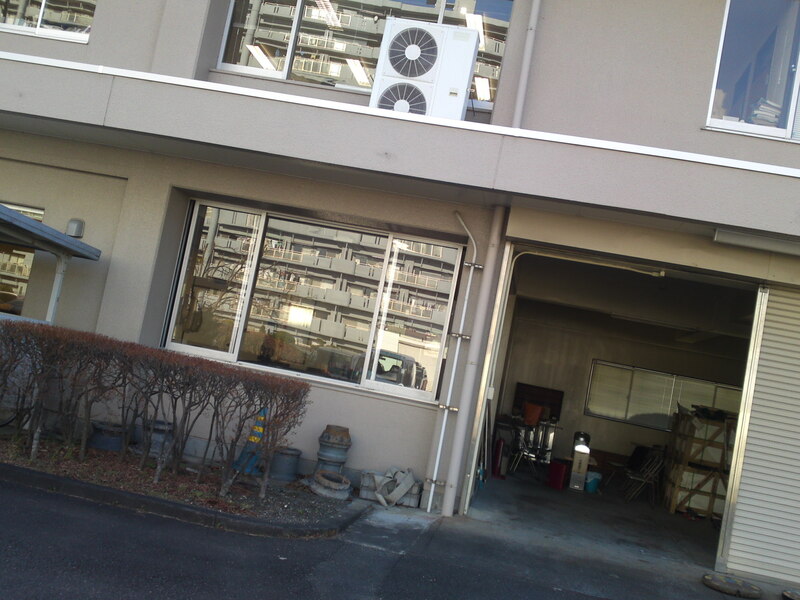 The City Water Department led by my new friend, Mr. Yuuta Fujii/藤井勇太さん, finally arrived at the “spot”! The truck full of covers! The “local media” was just on time! The new cover with its protective layer! Lifting off the old cover! 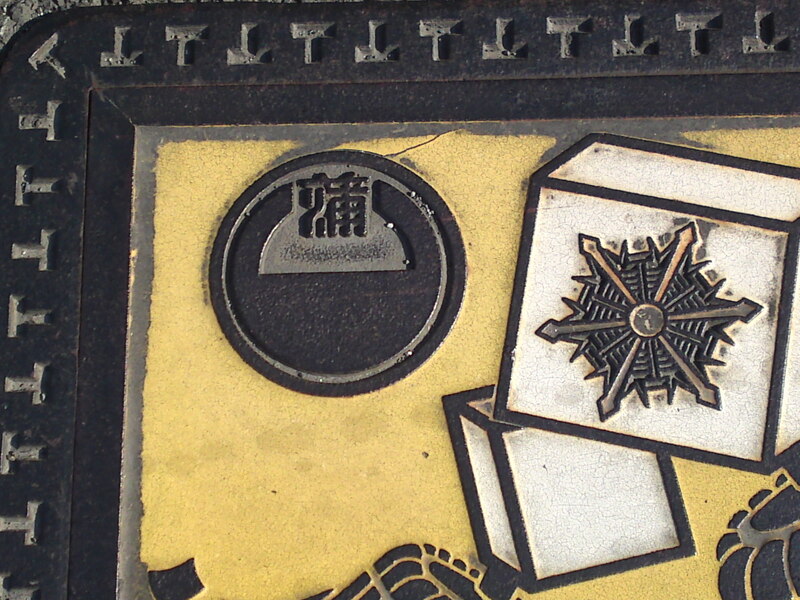 The new cover with the date “2015” commemorating the 400th Annivesary of the death of Lord Tokugawa Ieyasu in Sumpu Castle! 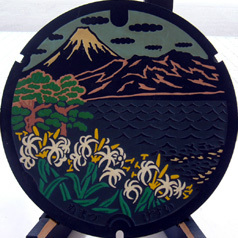 The motif represents Mount Fuji, Miho Matsubara Beach, Suruga Bay and the Kunozan Toshogu Shrine! 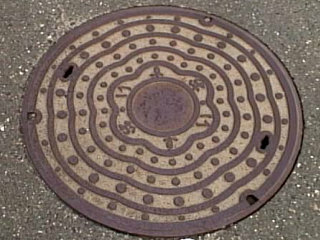 Some of the old ones will be kept for emergency replacement while others will be either destroyed or recycled fr the metal. The “local media” at work. 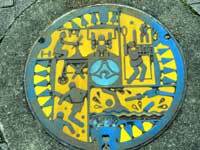 Unfortunately they had little or no clue about the manhole covers, their history and what they represented. 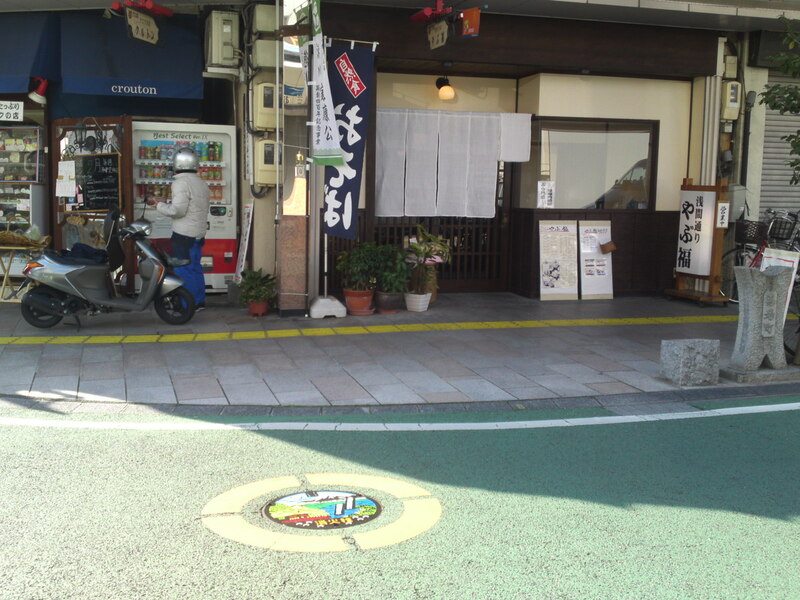 On my way back I noticed the one in front of one m\of my favorite bars along the Miyuki Cho Street and foreigners talking pictures of it! 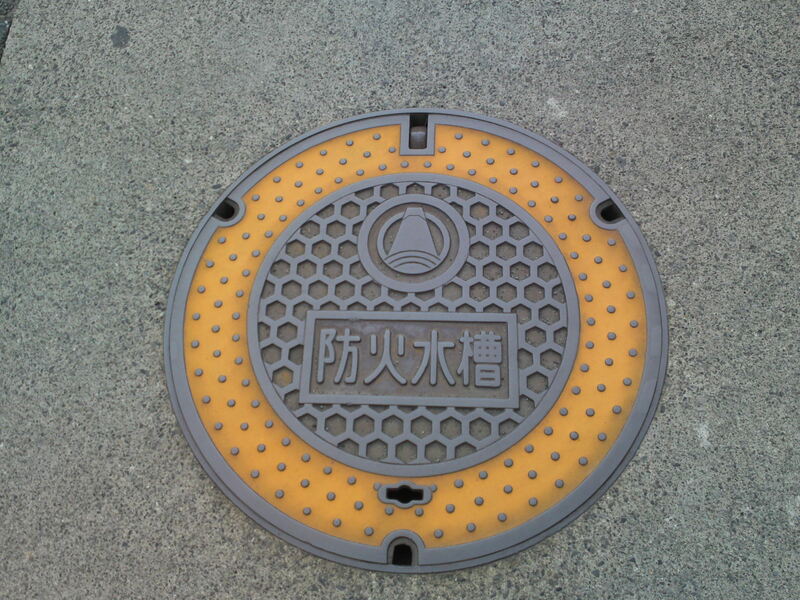 Manhole Covers In Shizuoka Prefecture 35: New Commemorative Fire Hydrant Manhole Cover in Shizuoka City! 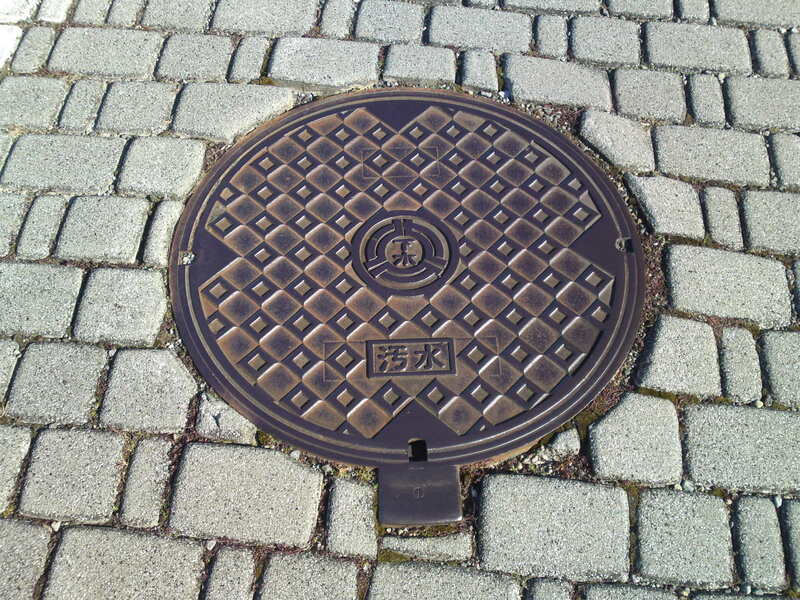 Last Friday the Shizuoka Municipal Government finally announced the creation of a new Fire hydrant manhole cover to commemorate the 400th Anniversary of the death of Lord Tokugawa Ieyasu in Sumpu Castle. 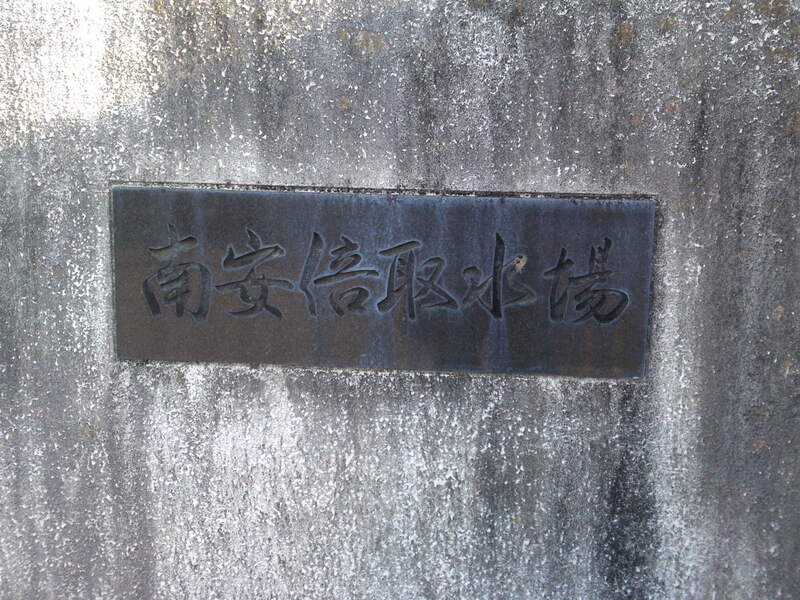 I decided some more investigation was in order and I visited the Shizuoka City Hall to find out where it was exhibited. 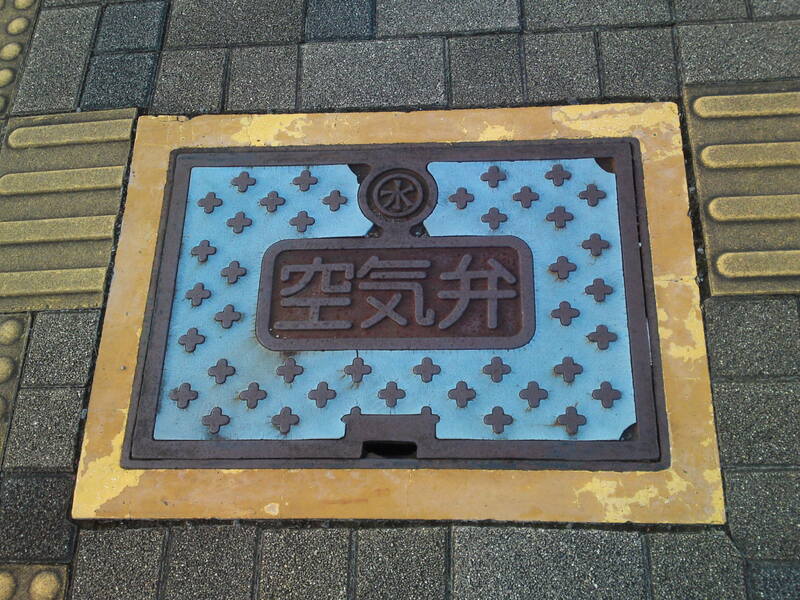 And nobody could tell me where to find it until a nice lady civil servant did some research and told me I would have to go to a Shizuoka City Works Office Water Distribution Department in Nishinakahara on the other side of the station! I actually cycled the wrong way, had to ask the way in a police station who didn’t know much more than me in spite of my 38-year residency. 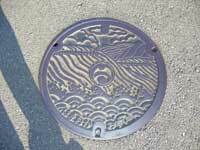 南安倍取水場/Minami Abe (of Abe River) Water Pumping Site! 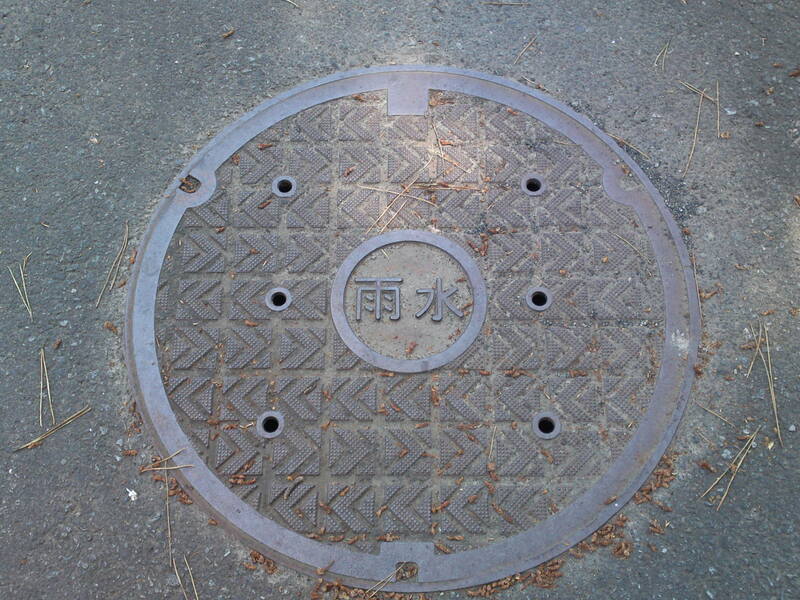 Lucky I can read Japanese! Looking at the nondescript building/office there is no way to know where you are. 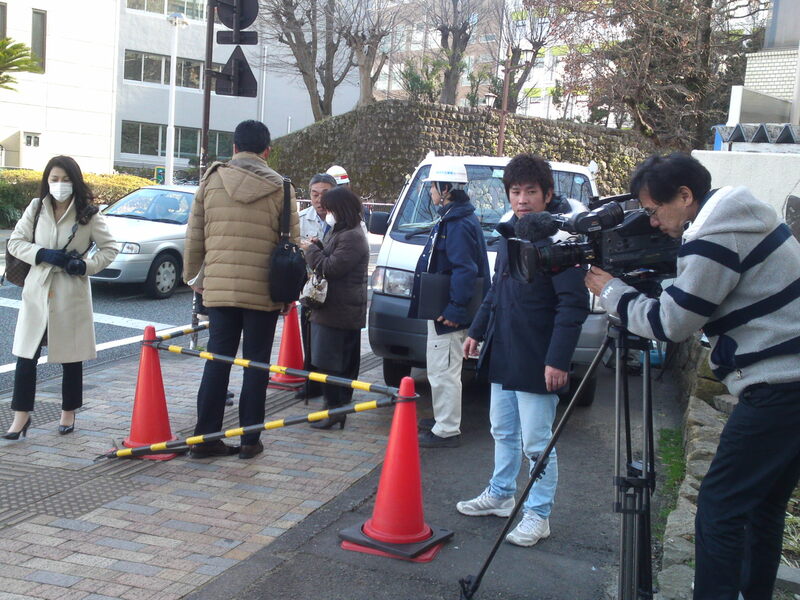 Lucky that nice lady back in the Shizuoka City Hall did some good investigative wrok for me! Not only this but she had forewarned a young civil servant of my coming! 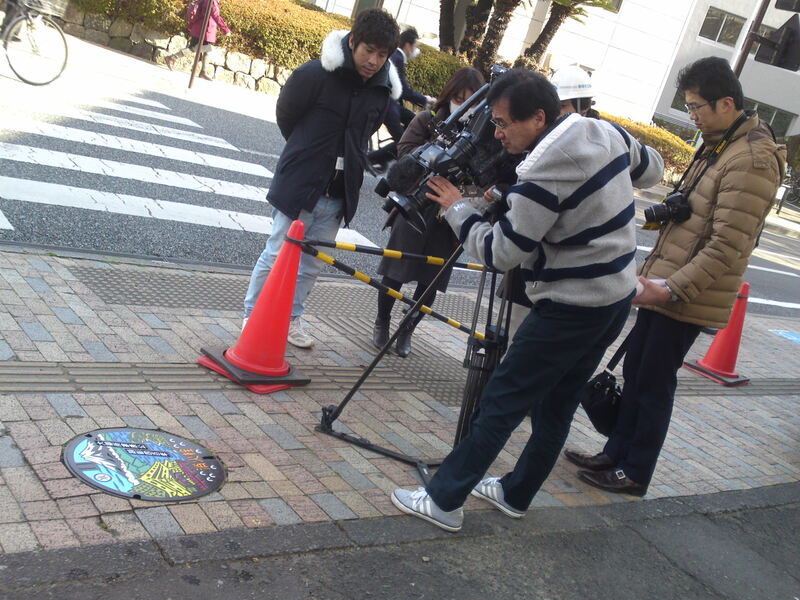 And the least I can say is that he was ready with information and manhole covers! But let’s have a look around first! 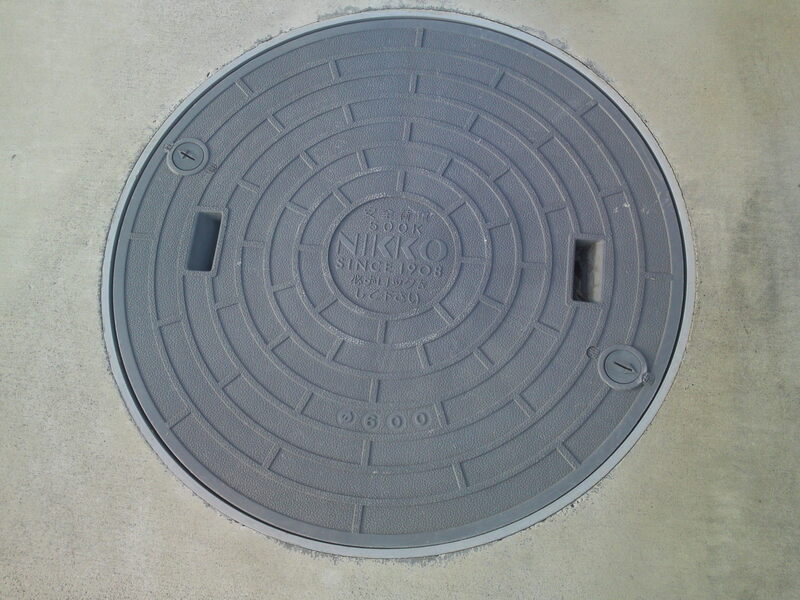 Cover for access a small to medium water valve! 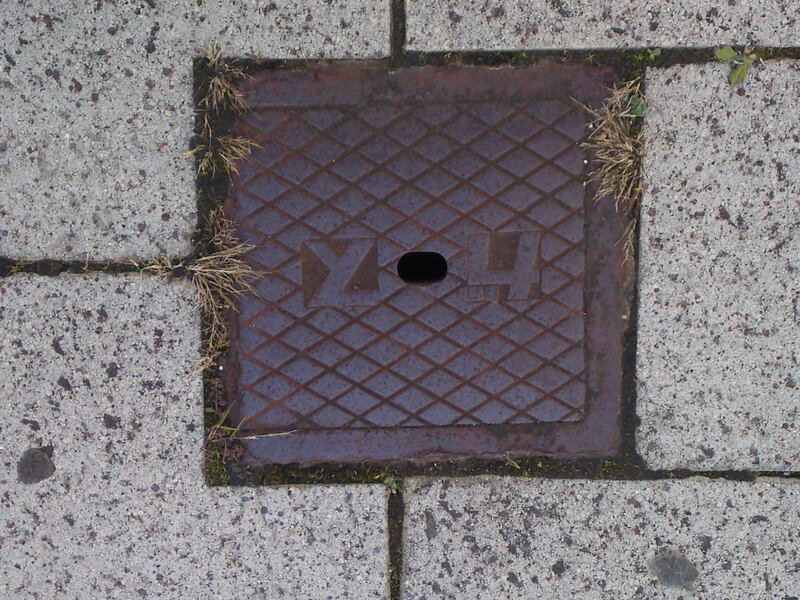 The smallest type of cover for access to a water valve! 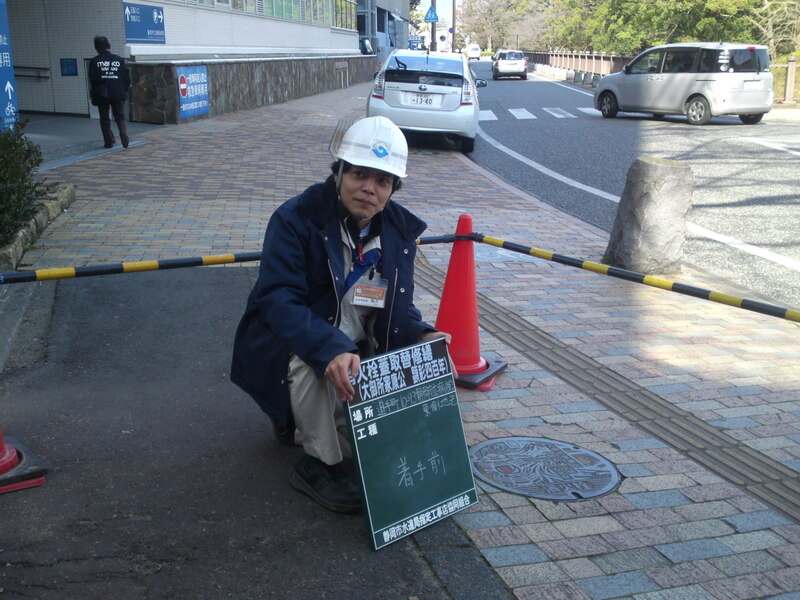 Mr. Yuuta Fujii/藤井勇太さん to whom I’m indebted for the whole investigation! 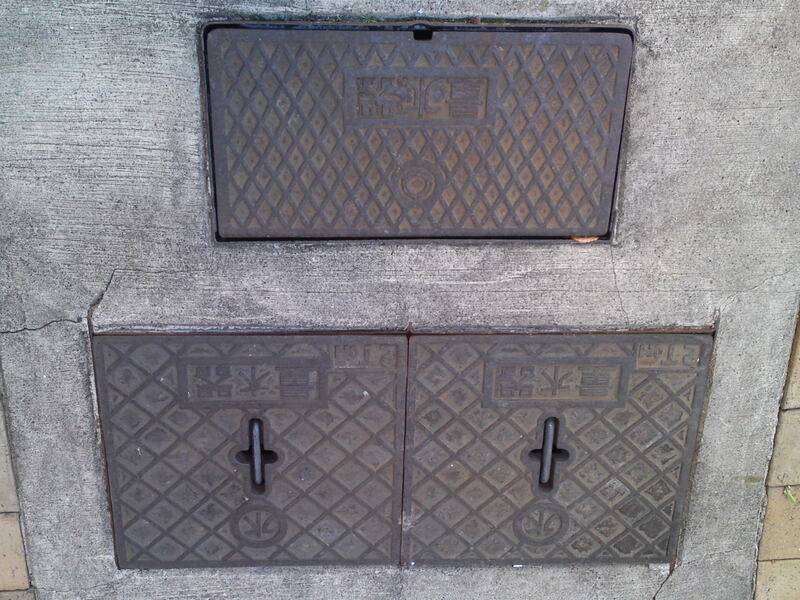 The three types of manhole covers (plus the smaller ones) this particular office is in charge of installing and maintaining! 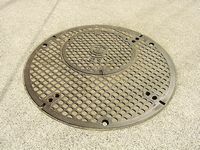 There are other types for electricity, gas, drainage waters, sewers, but they all are the reposiblity of as many offices! No wonder it is so difficult to find out information! 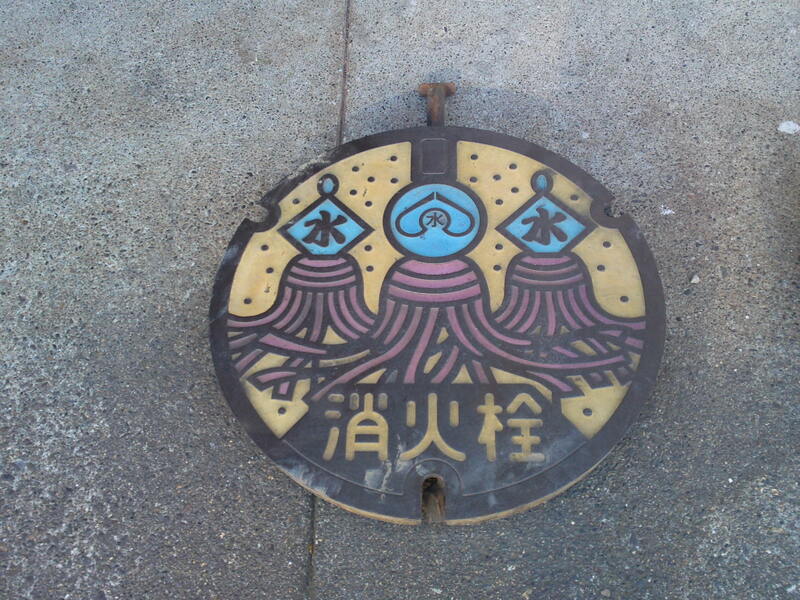 The traditional fire fighting festival pole, “matoi/纏”! 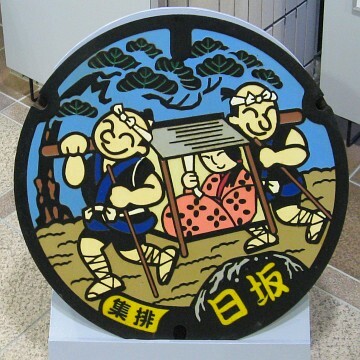 The traditional three fire fighting festival pole, a model probably older and definitely rarer! 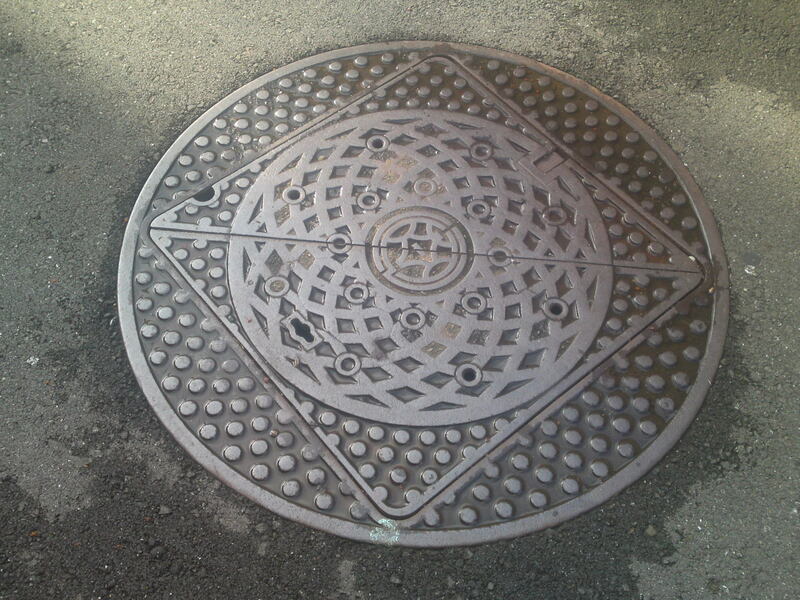 Most of the above three covers will be replaced with the new one in the two months to come. Hurry to take photos of them before they disappear! 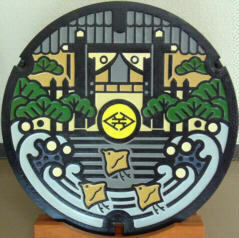 The design of the new cover to commemorate the 400th Anniversary of the death of Lord Tokugawa Ieyasu in Sumpu Castle! 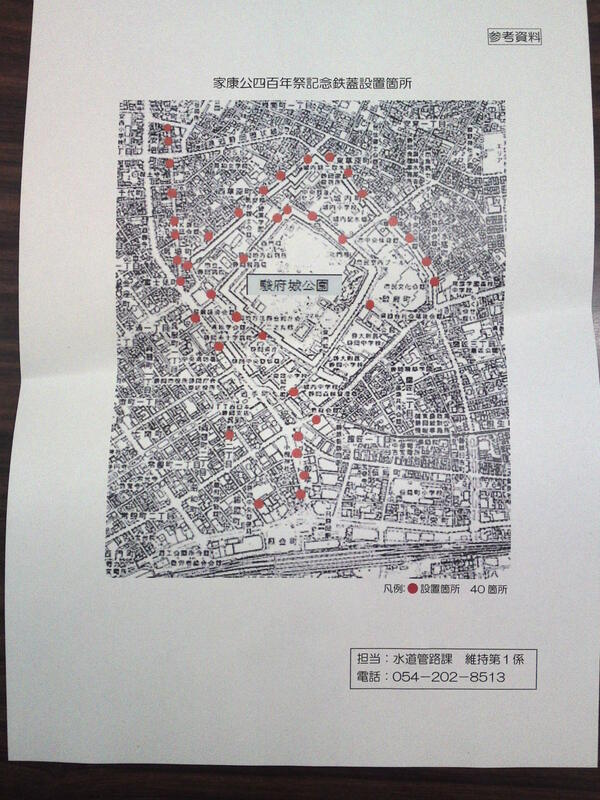 Mr. Fujii had prepared color copies of the information for me! 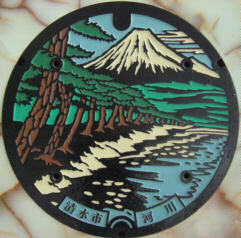 The design represents Mount Fuji, Miho no Matsubara Beach, Kunozan Toshogun Shrine and Suruga Bay! Relief accounts fro 54.56% of the surface! 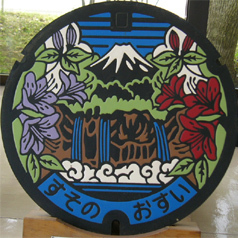 The plaque is fabricated by a Shizuoka Company called Hinode Suidou Kiki Co.! 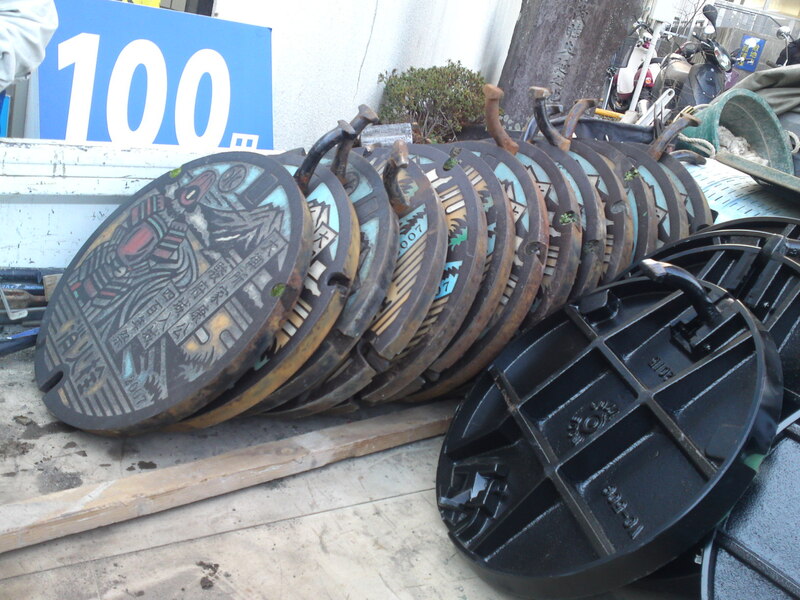 40 covers will be fabricated for a total cost of 2,500,000 yen. 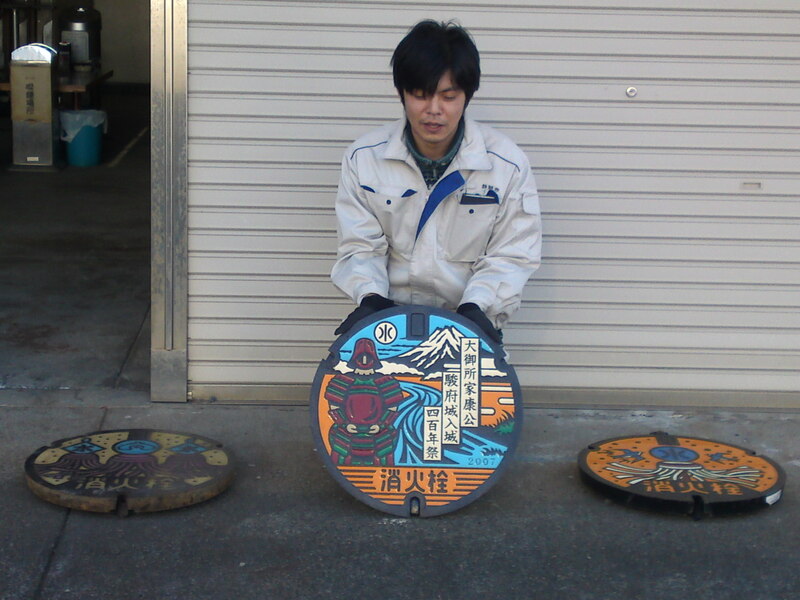 Each cover diameter is 530 mm, and each will weigh 24 kg! 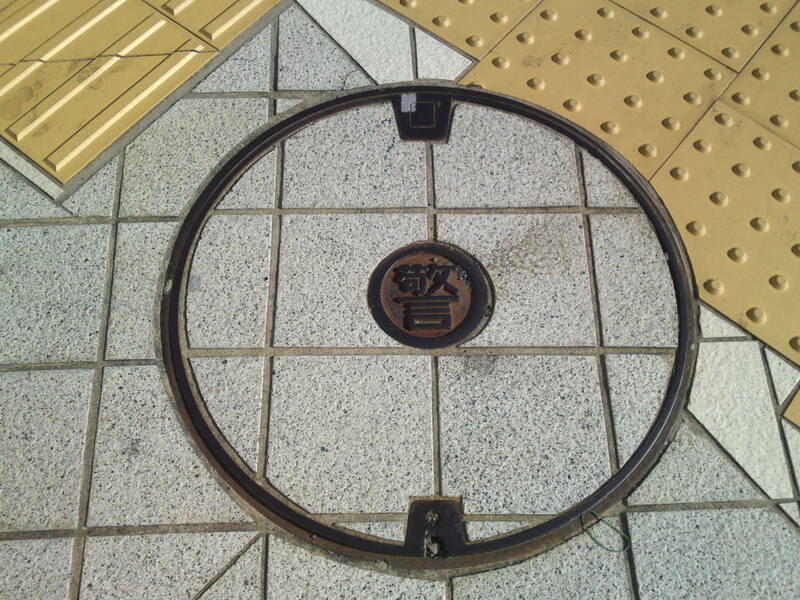 They will be installed to replace ld types around Sumpu Park and along the route from Shizuoka JR Station to the Sengen Shrine! 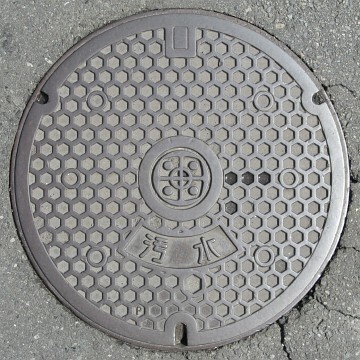 Mr. Fujii has promised to call me when the first cover will be installed for the benefit of the media! New report in the offing, then! 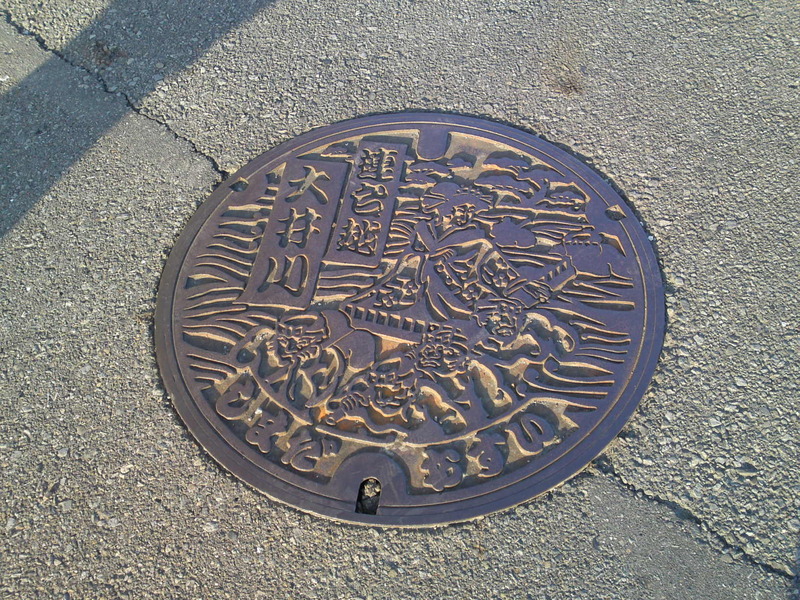 Manhole Covers in Shizuoka Prefecture 33: Kambara, Shimizu Ku, Shizuoka City! 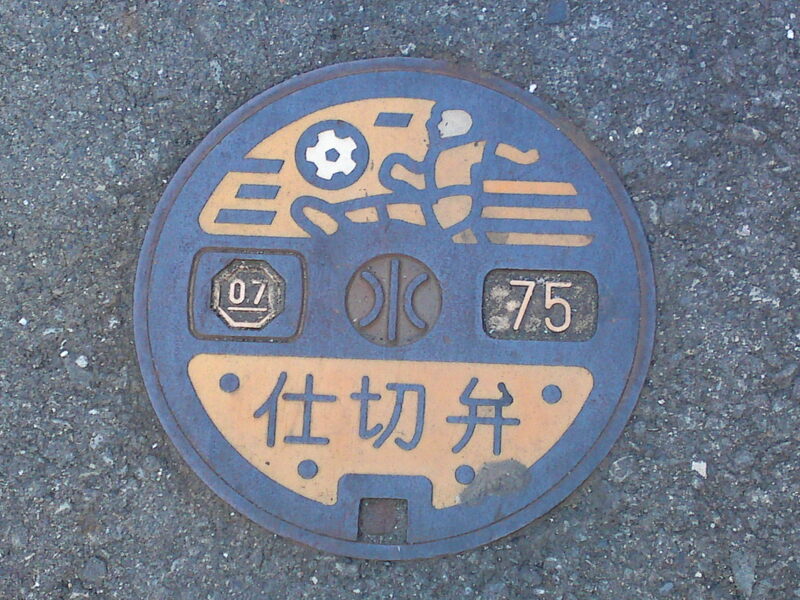 Kanbara, located between Yui and Shin kambara in Shimizu Ku, Shizuoka City, was merged into Shizuoka City on March 1st, 2006, but Shimizu City became part of Shizuoka City as Shimizu Ku on April 1st, 2004. 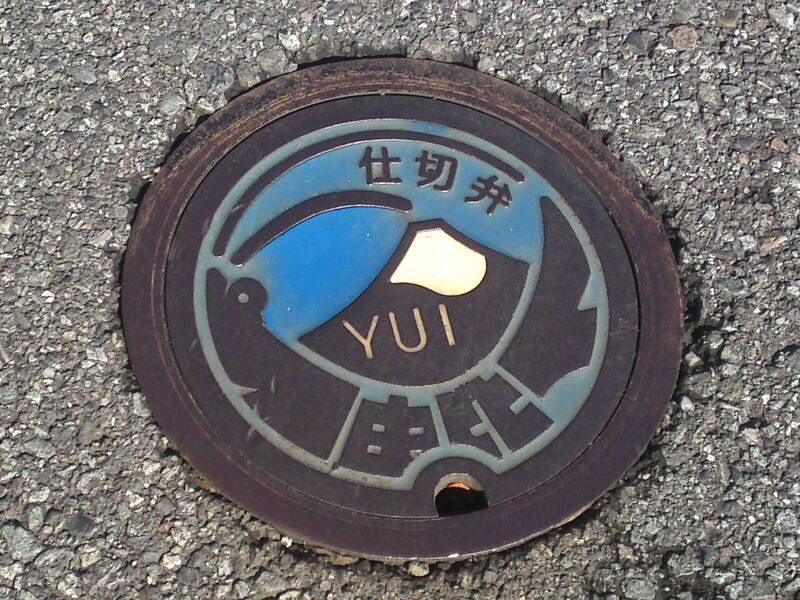 On the other hand Yui merged with Shimizu Ku into Shizuoka City only on November 1st, 2008 with some confusing results when it comes to manhole covers! 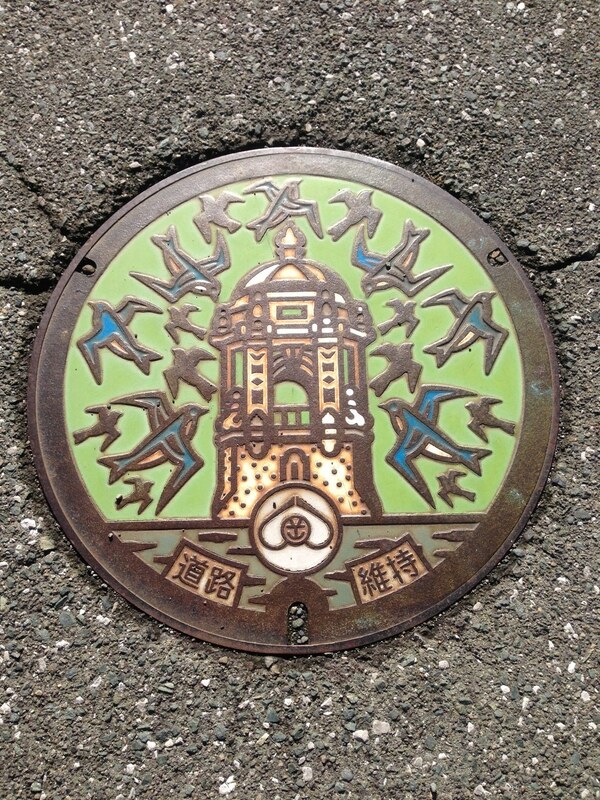 Soon or later, especially after I have covered Shin Kanbara, I will have to to publish a compilation of only the truly decorated manhole covers in the whole of Shizuoka City, and that is mor than 2 dozens of them! 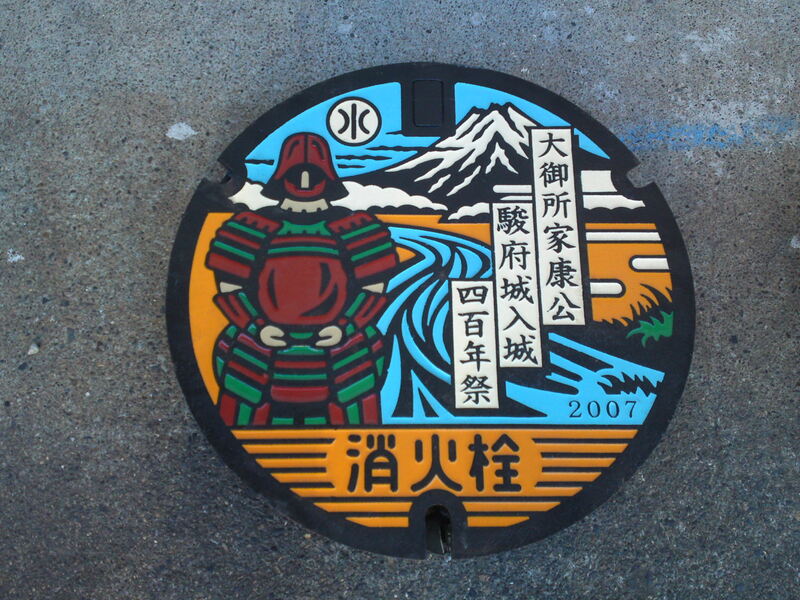 This is the most representative fire hydrant manhole cover of Kanabara. 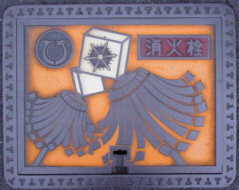 Even though, the crest is that of Yui, but the mark/first kanji/蒲 of Kanbara is included! 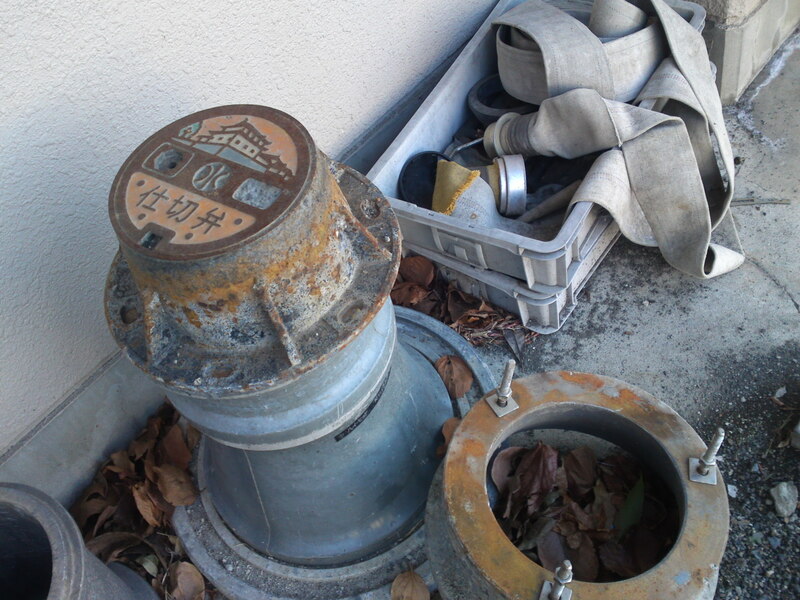 It is often found together with a water valve pit! 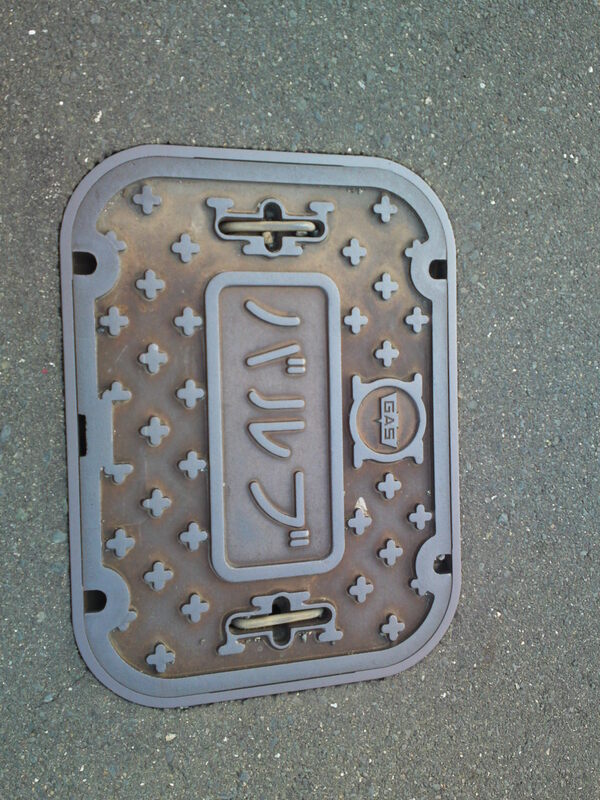 Found in front of Kanbara JR Station! 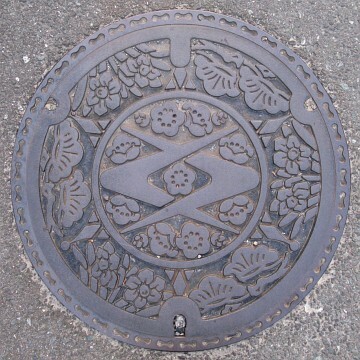 This pattern exists elsewhere but it is inscribed with “Kanbara Town”! 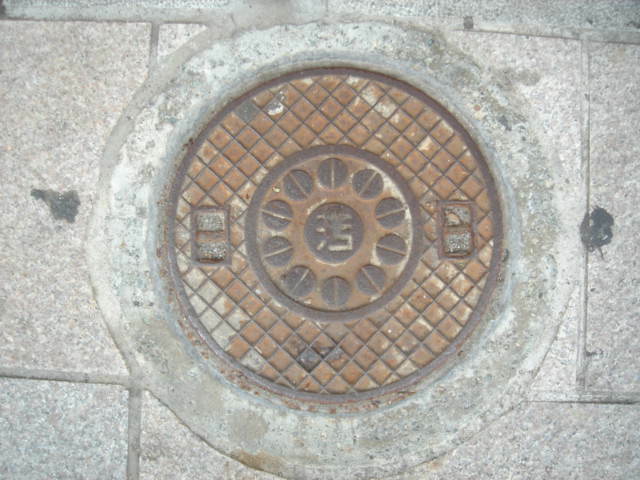 A quite ancient manhole cover over a fire cistern! 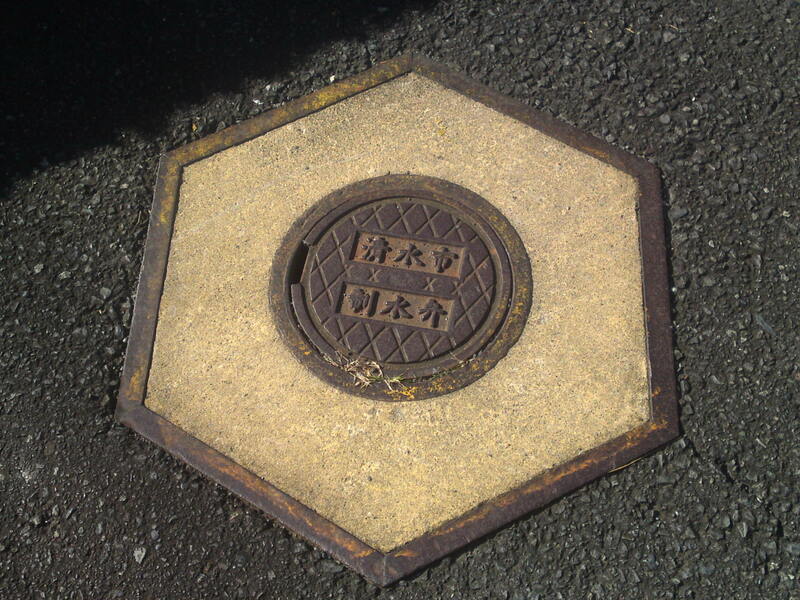 A valve pit with the Kanbara mark! 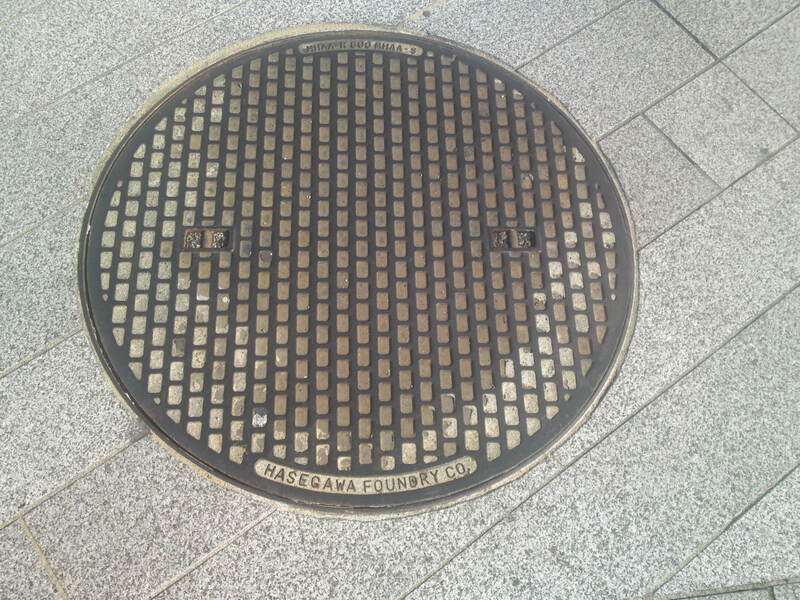 A larger valve pit with the Kanbara mark! 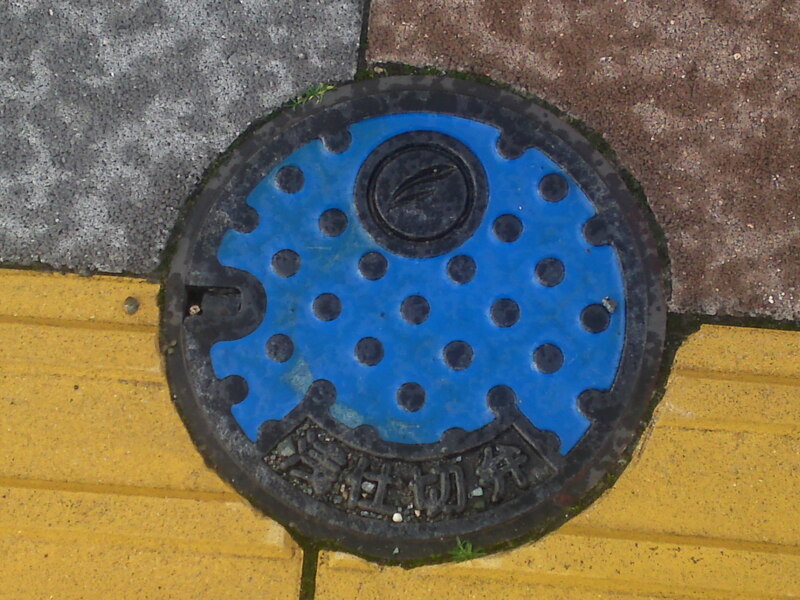 A valve pit in blue instead of orange with measures inverted and the Kanbara Mark! The same but with the measurements “properly” set! 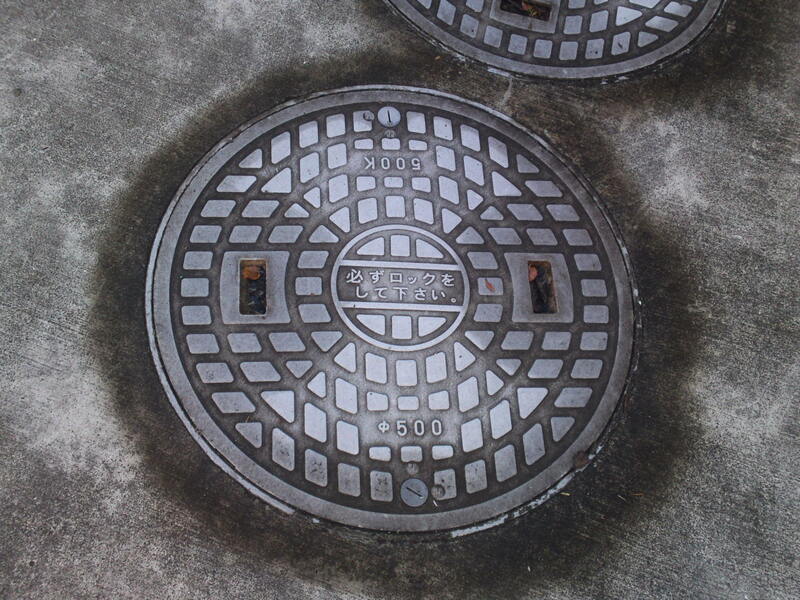 This pressurized air valve pit, being quite a common type could be well a national type! 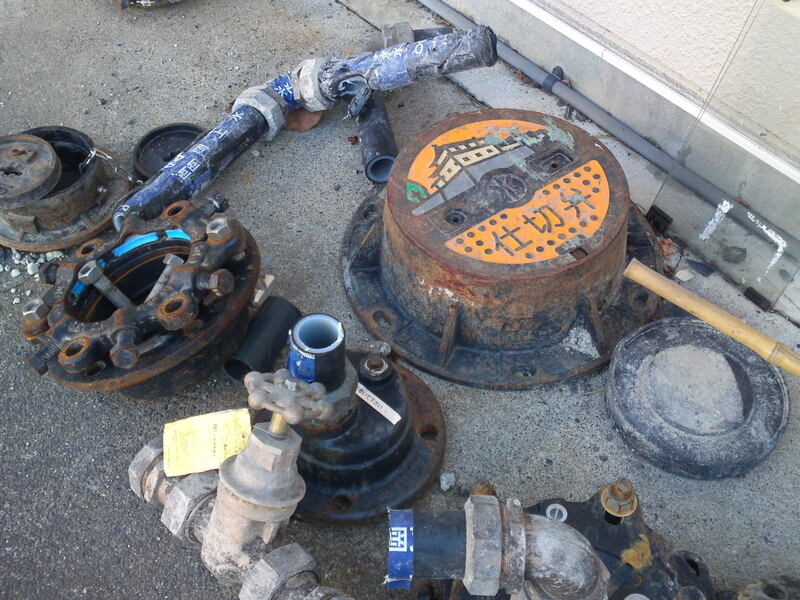 It is also often found together with a previous water valve pit! 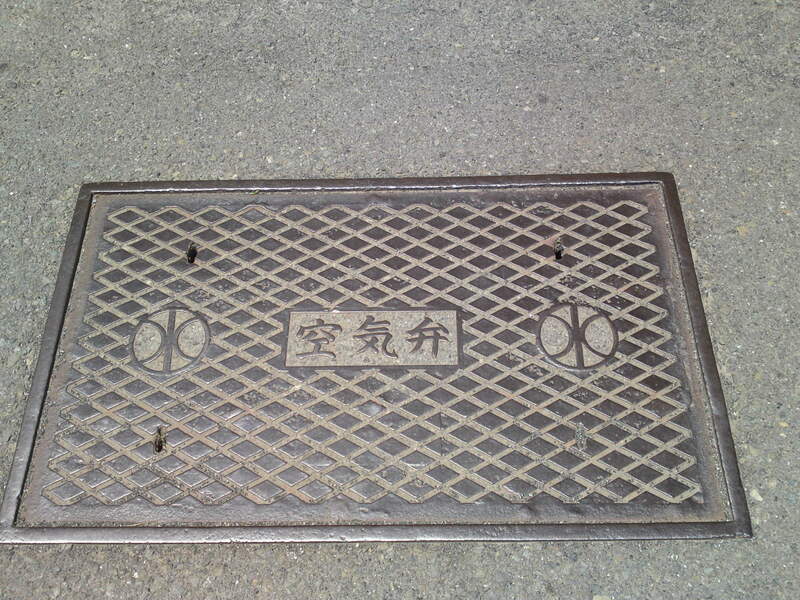 Very ancient Kanbara Water duct cover! 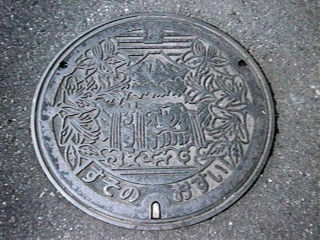 This beautiful fire hydrant cover is actually a Shizuoka City item, therefore quite recent! This cover reflects the confusion. 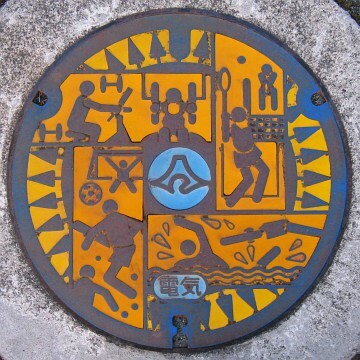 It is a soccer fire hydrant manhole cover from Shimizu City before it was merged into Shizuoka City, which could have been set either before or after the merger! 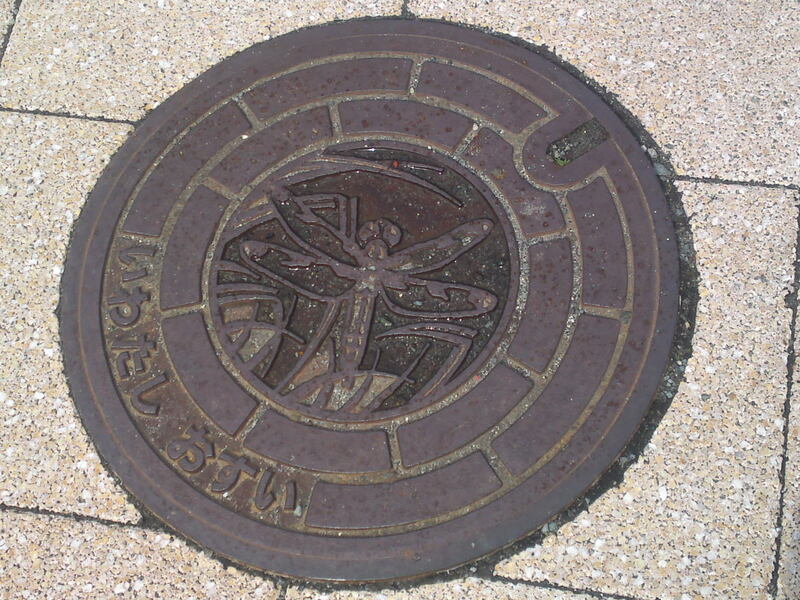 This water valve pit being very recent it tends to prove that the Shimizu City covers were later used in Shimizu Ku which includes Kanbara Town as it was called before the merger! The same with different measures! The same again with still different measures! 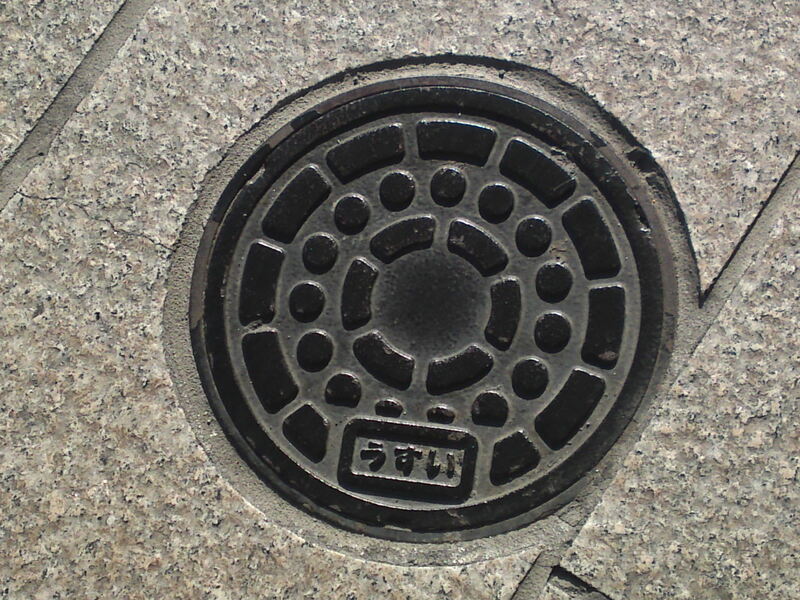 This type of water valve pit can be found elsewhere! 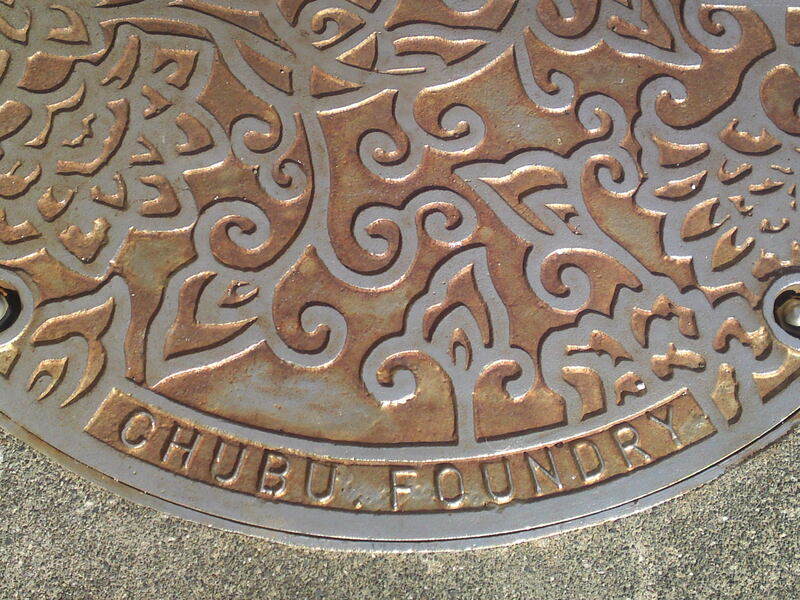 A newly discovered foundry company! 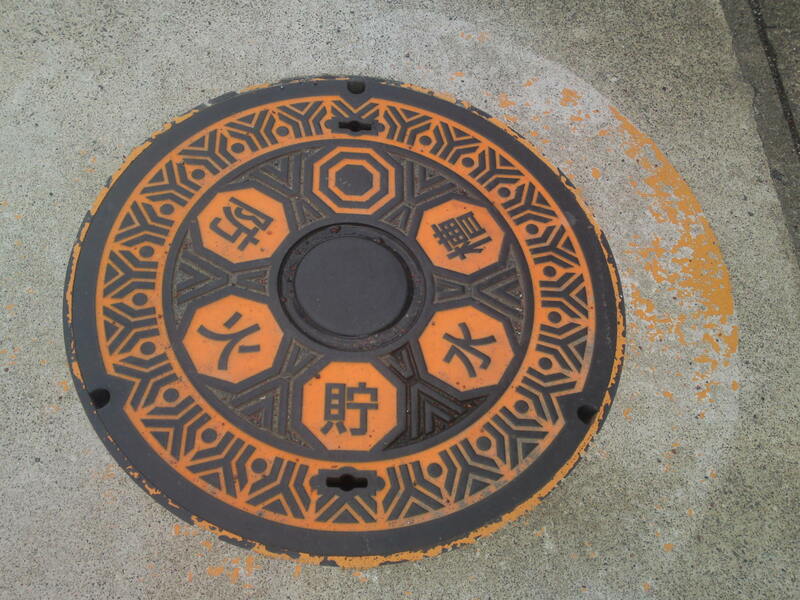 Manhole Covers in Shizuoka Prefecture 32: Kanaya, Shimada City! 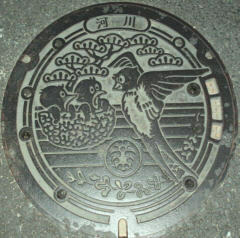 Decorated manhole covers all seem to be those of fire hydrants in Kanaya Cho in Shimada City, although there is a big oddity! Big red fire truck. 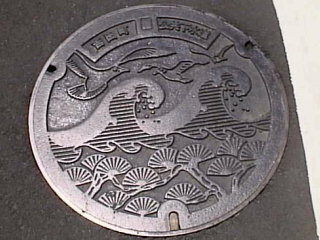 This design can be found in many cites in side and outside Shizuoka Prefecture although the “city crest” will be different! 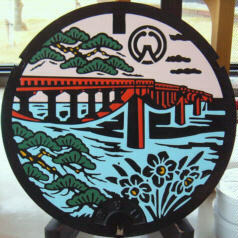 This must a fairly recent cover as the crest is that of Shimada City to which Kanaya was recently merged! Same with a slight difference! Space was cut to accommodate measurement information! 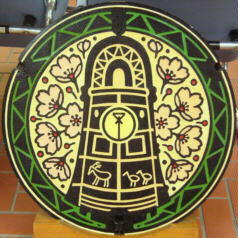 Interestingly enough this one was donated by the City of Ise in Mie Prefecture! 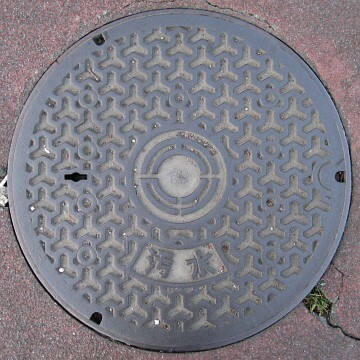 A specail pattern found in other cities, although rare. 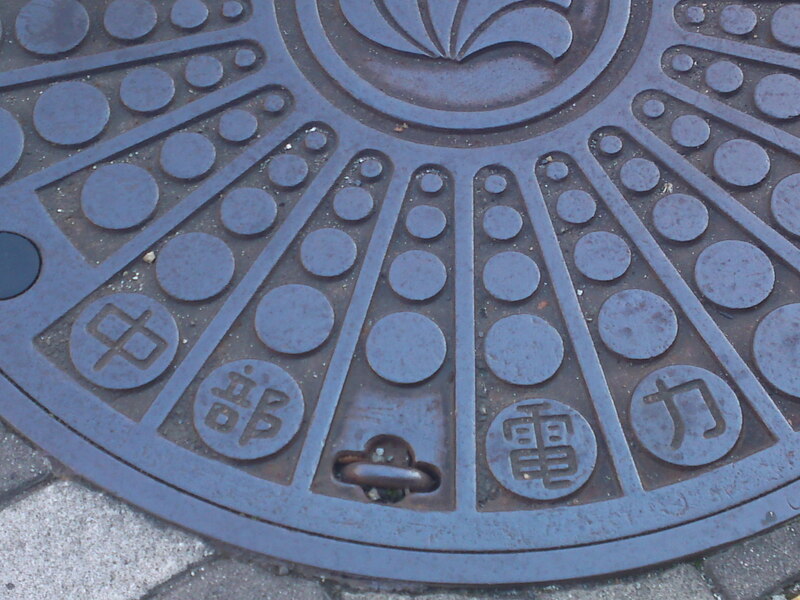 With a local central motif, althogh apparently not of Kanaya nor of Shimada City! 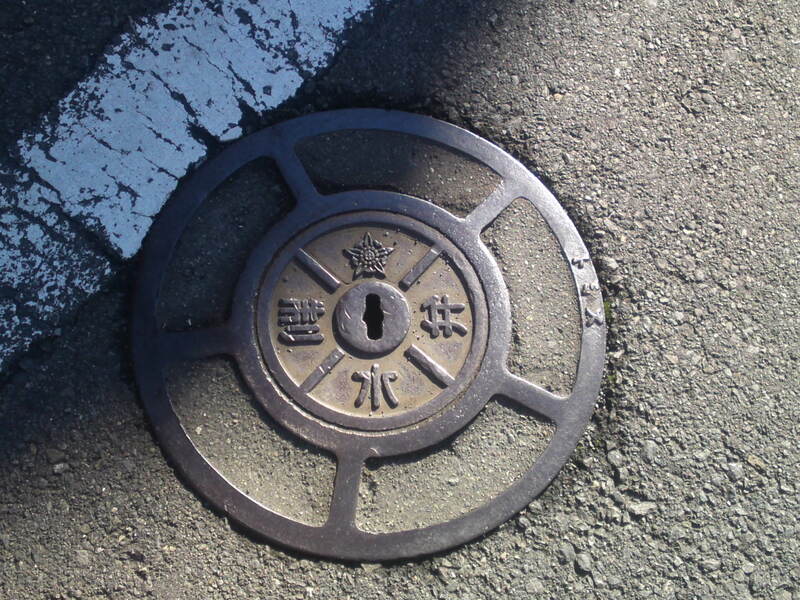 A common fire hydrant type with the Kanaya Crest! 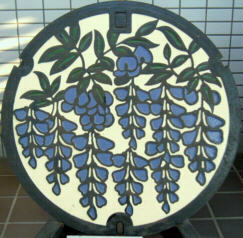 A more ancient variety with a single “handle”! 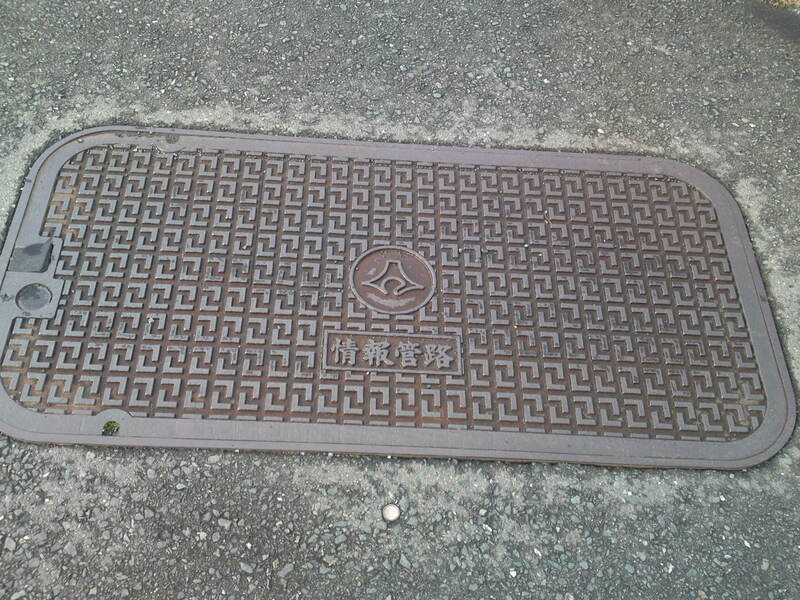 Another ancient type found elsewhere but with the Kanaya Crest! 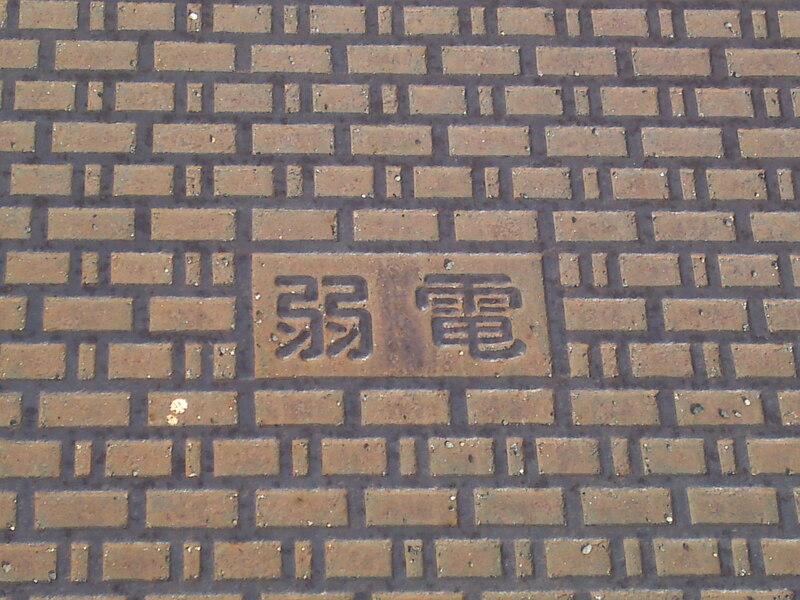 The same, double, but with “water” mark! 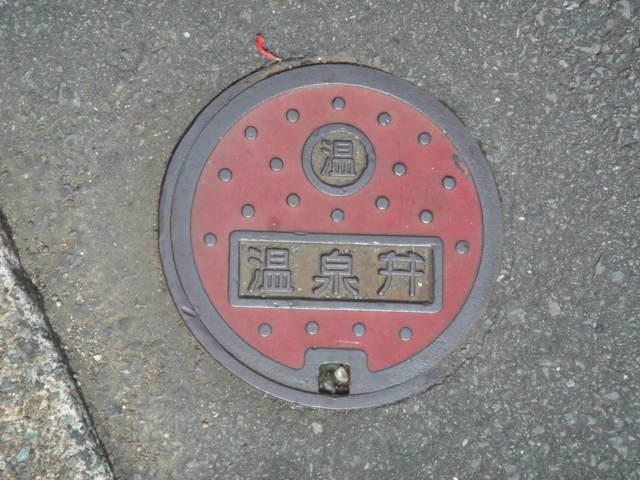 A very old one, unspecified but very probably a fir hydrant, with “Kanaya Vilage” inscribed long before the merging with Shimada City! 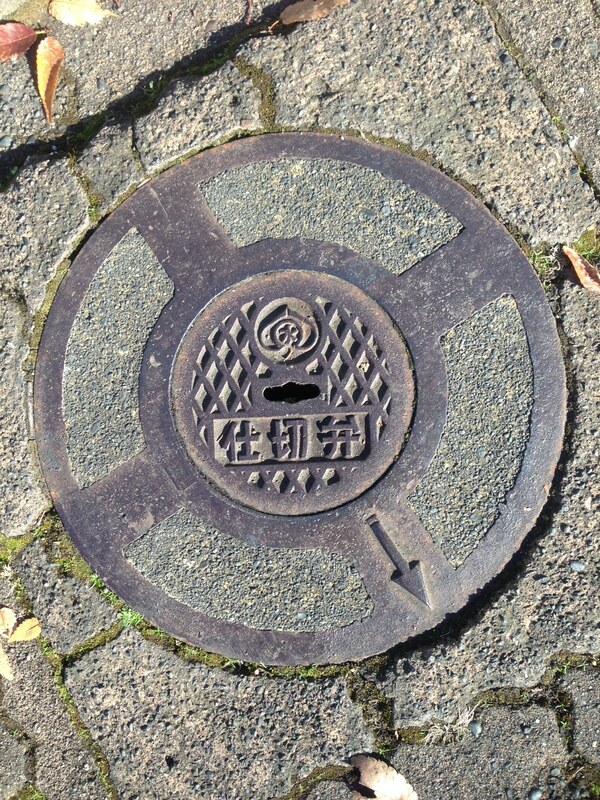 Water valve pit with the Kanaya Crest! 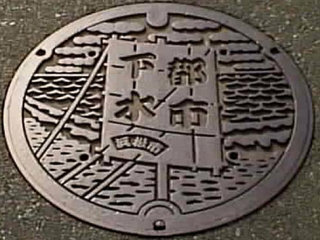 Arai machi, since included into Hamamtsu City is bit of a strange place completely separated not only by the station (you have to pay 180 yen anytime you want to go to the other side) but also by a sea arm. 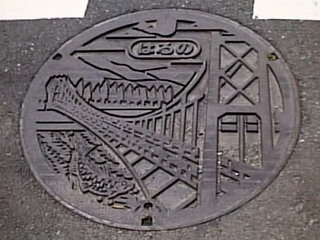 The interesting manhole covers lie south of the Arai Machi JR Station while the north housing the professional outboard boat races is pretty drab. 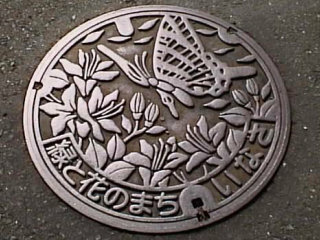 The original manhole cover for Arai Machi! I wonder what the colored one looked like! 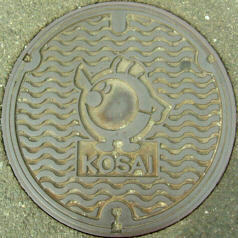 Arai Ｍachi is really confusing as this manhole cover seems to belong to belong to neighboring Kosai City! Same for this one, too! 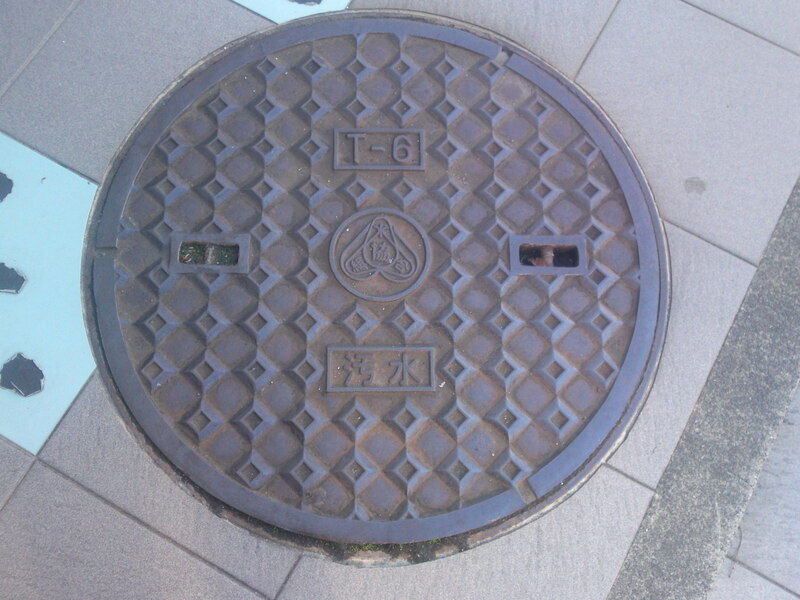 This pressurized air manhole cover on the other hand solely belongs to Arai Machi! 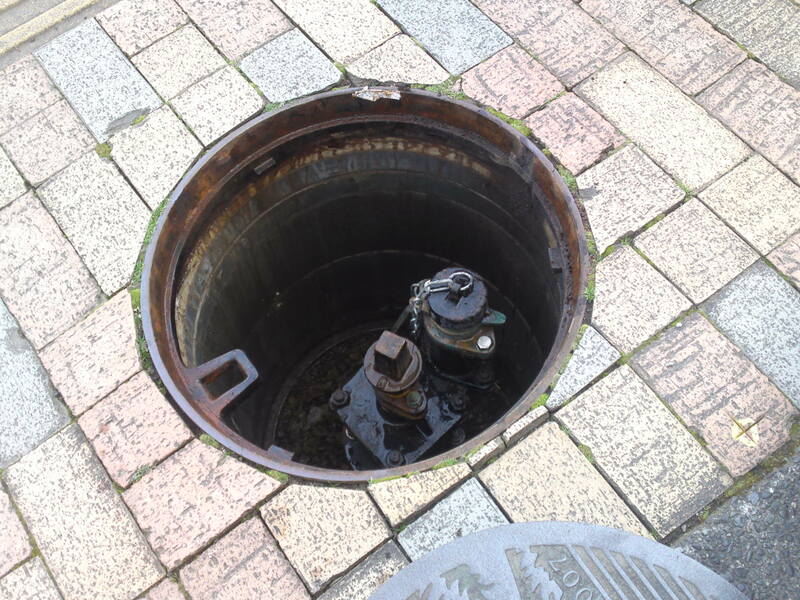 Same for this water valve pit! 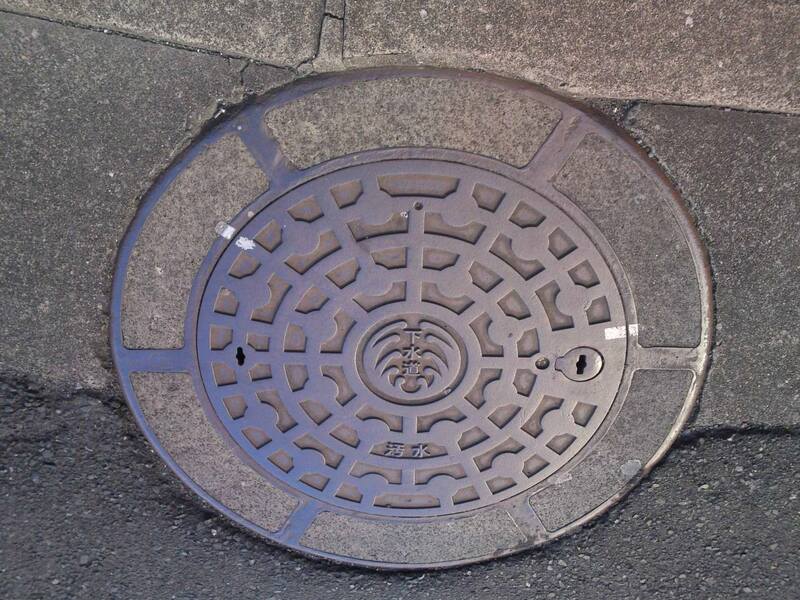 A smaller and different valve pit! 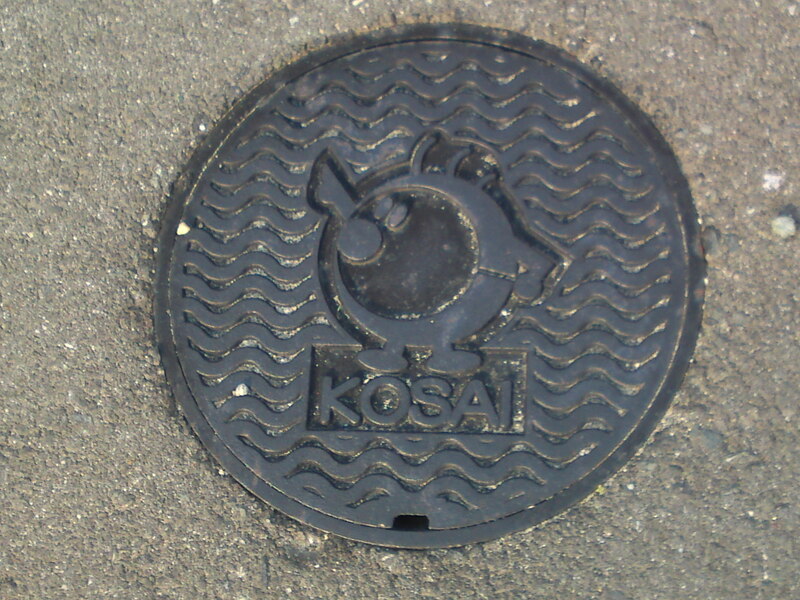 Now, this valve pit definitely belongs to Kosai City! 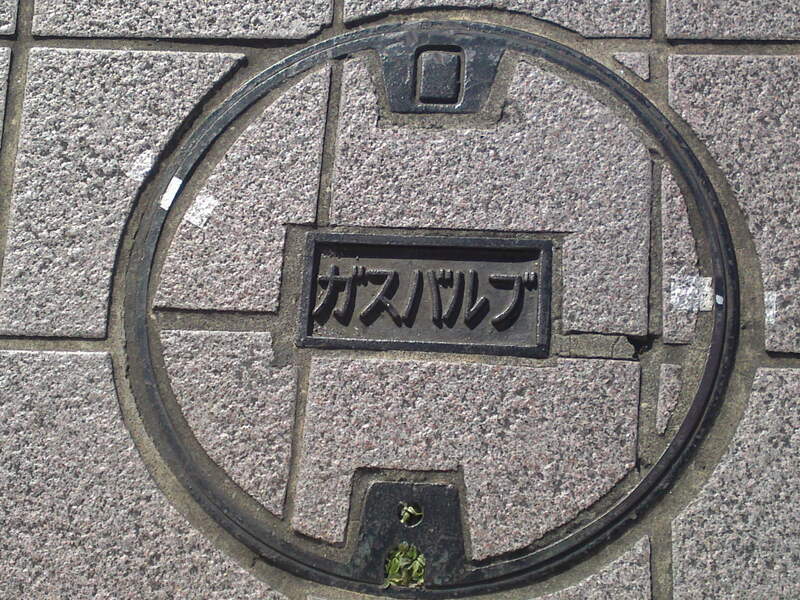 A smaller Arai Machi water valve pit! 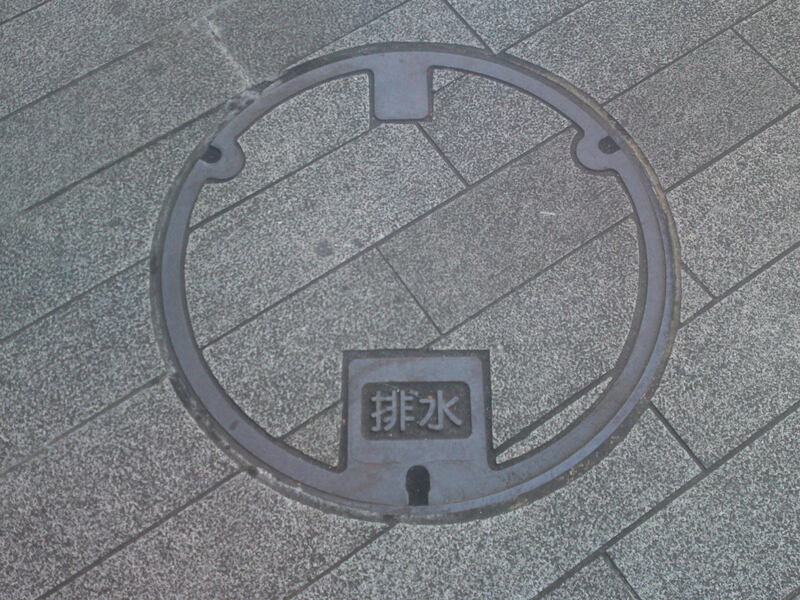 A medium-sized gas valve pit in the middle of the road! 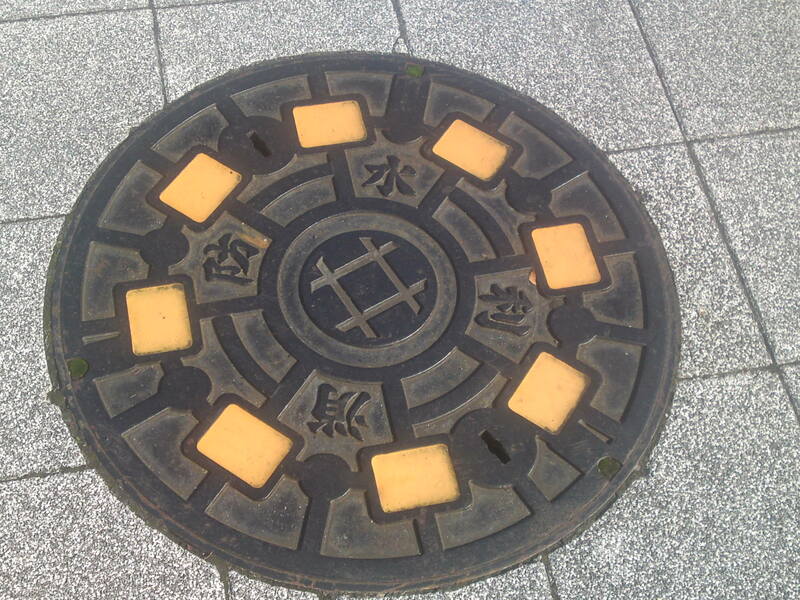 It is the first time I such a shape for any manhole cover! 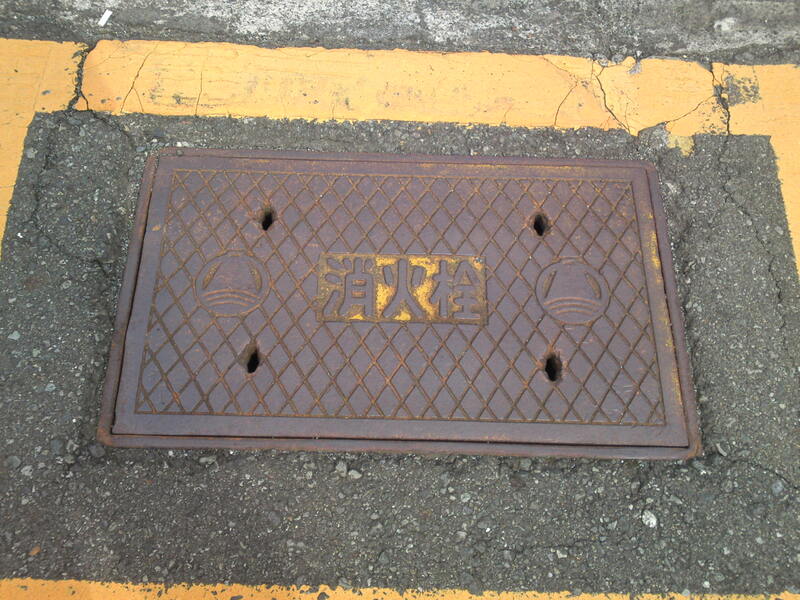 A strange air access for firemen! A very long one for “high electricity”! 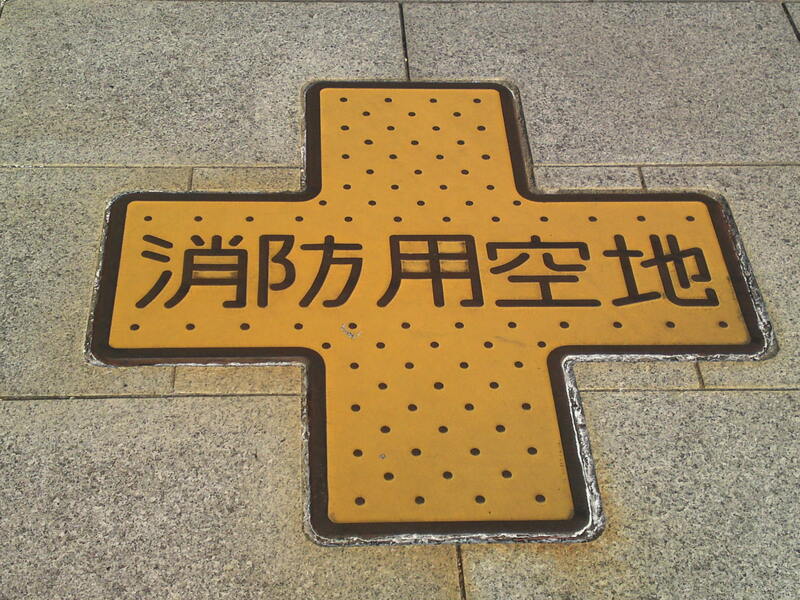 Probably stands for high voltage electricity! 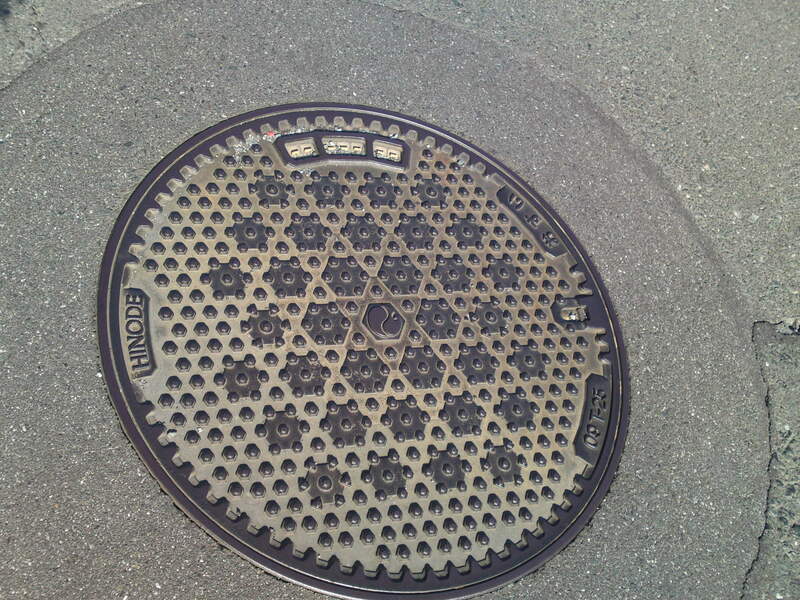 Same shape for “low electricity”! I wonder if they mean “low electricity output” instead of low voltage electricity! 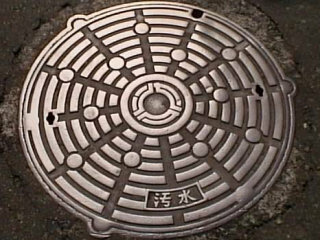 A sewer manhole cover by Ohtake foundry! Same but with low voltage electricity indication! 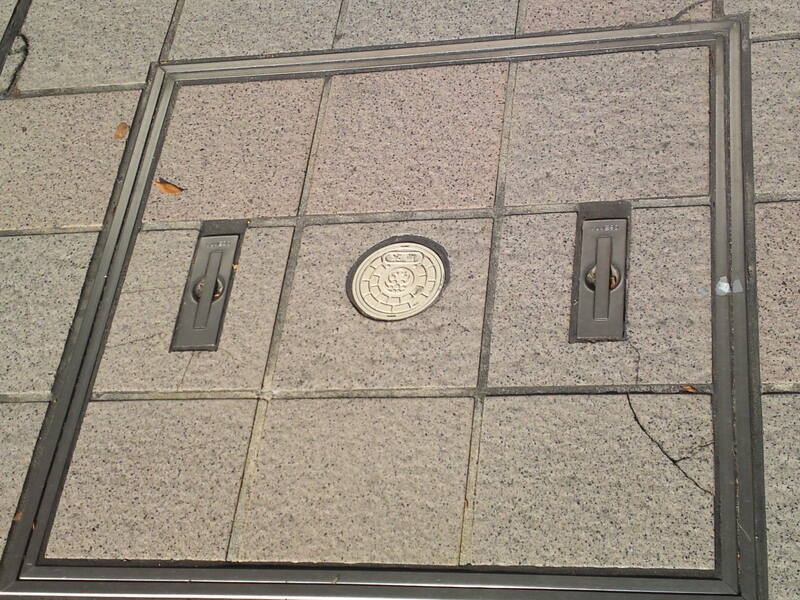 A vertical marking instead of a round indication for low voltage electricity! Same but for high voltage electricity! 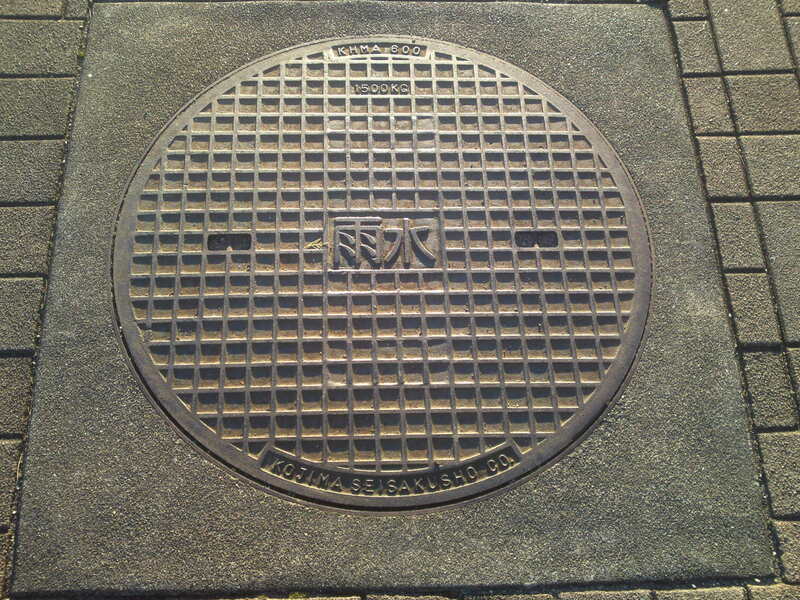 Shizuoka Prefecture electricity manhole cover! 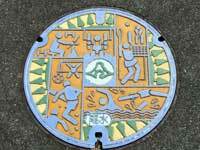 Manhole Covers in Shizuoka Prefecture 30: Ecopa in Fukuroi by Guest Blogger Atsuko Kurata! 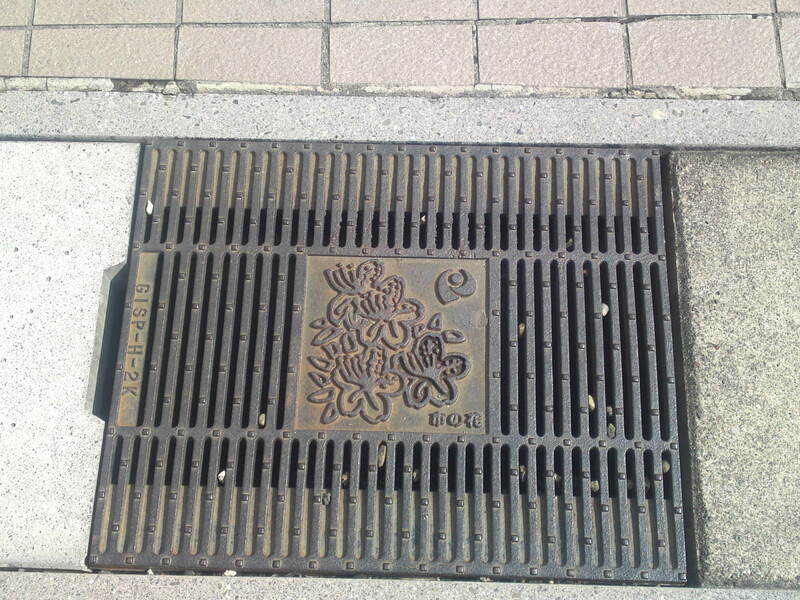 My good friend Ms. Atsuko Akira, who share the drainspotting bug with recently visited the Ecopa Sports Complex in Aino, Fukuroi City! This is the report on her trip! Let her show you the way to ECOPA! 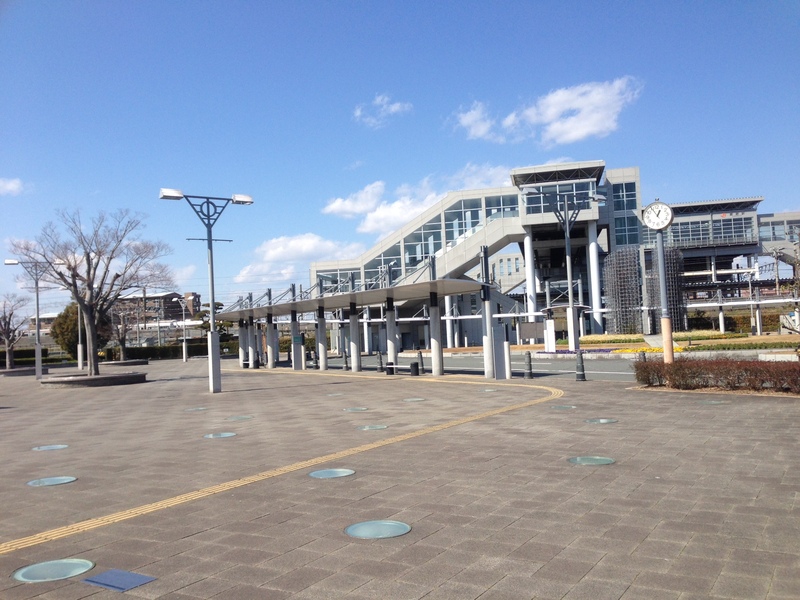 First of all, take the Tokaido Line and get off at Aino JR Station! 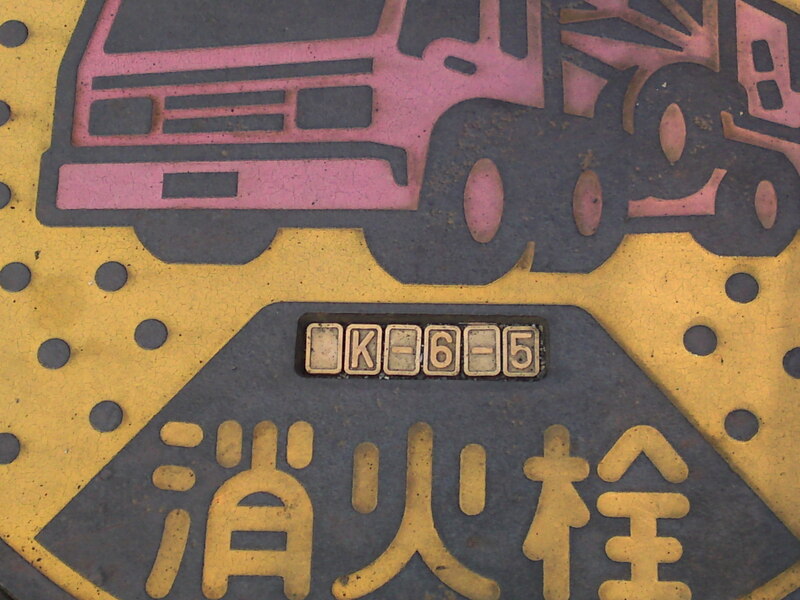 Once gone though the ticket gate, turn left! 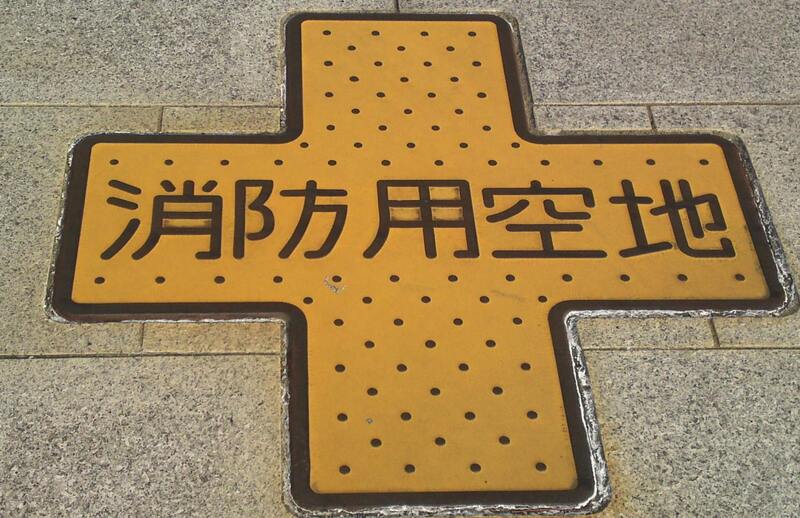 Some signs will guide you all the way! 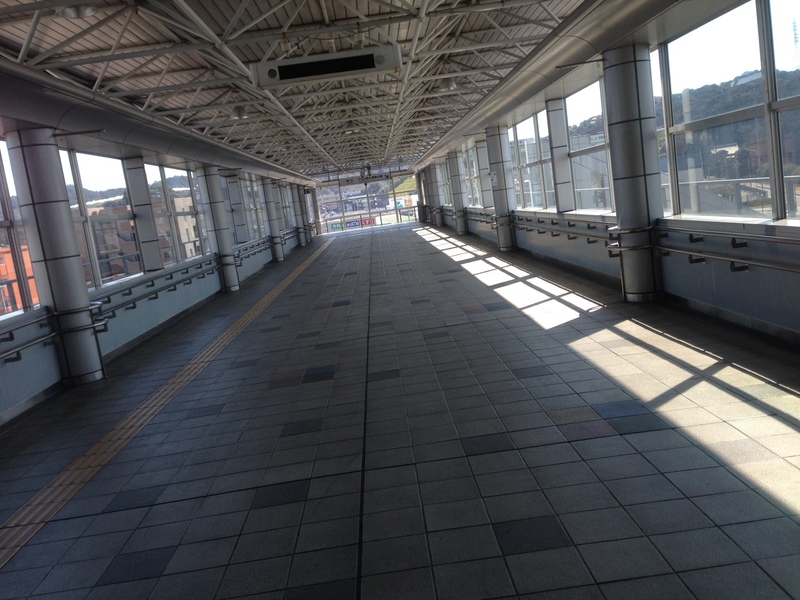 Then walk through the long passage and go down stairs! 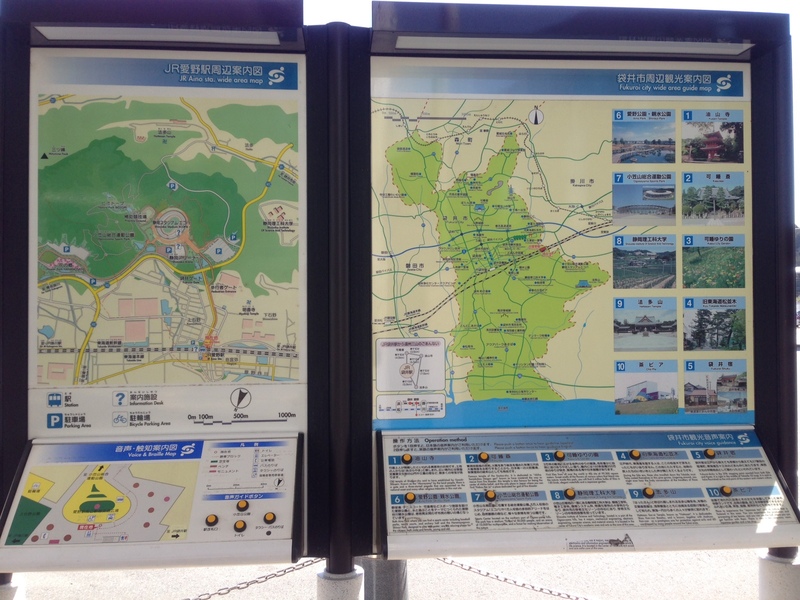 There were useful signs to know where you are, the way to ECOPA and tourism information around Aino! 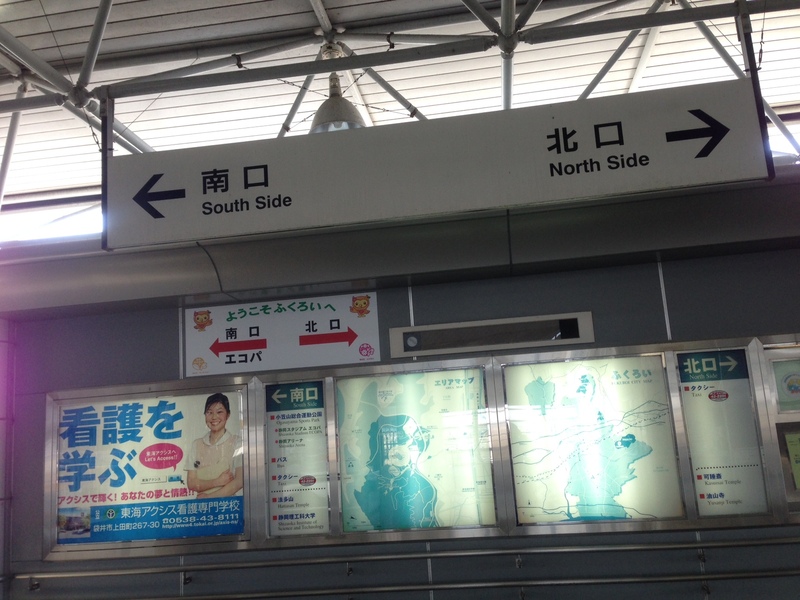 There are more signs outside the station to make sure you find the right way! 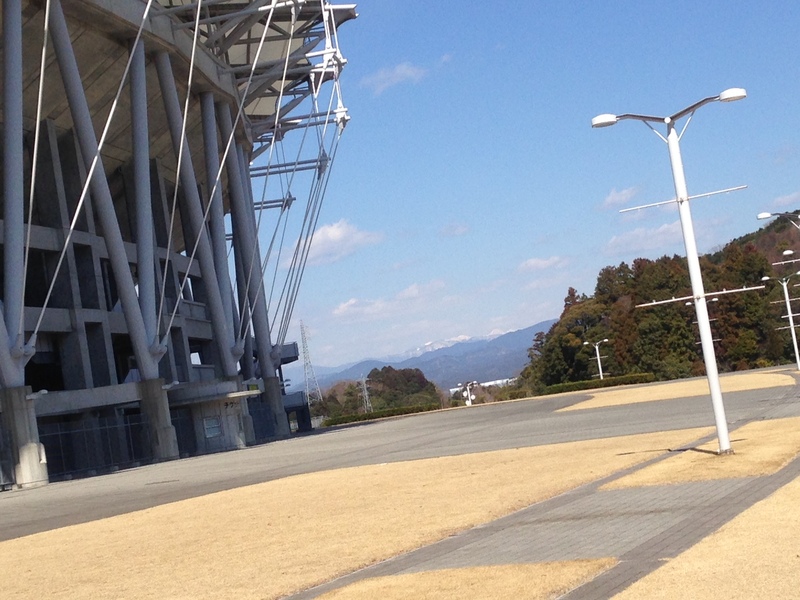 It was officially announced that it is only 10 minutes walk to the stadium… Well, it took her more and up a gentle slope! 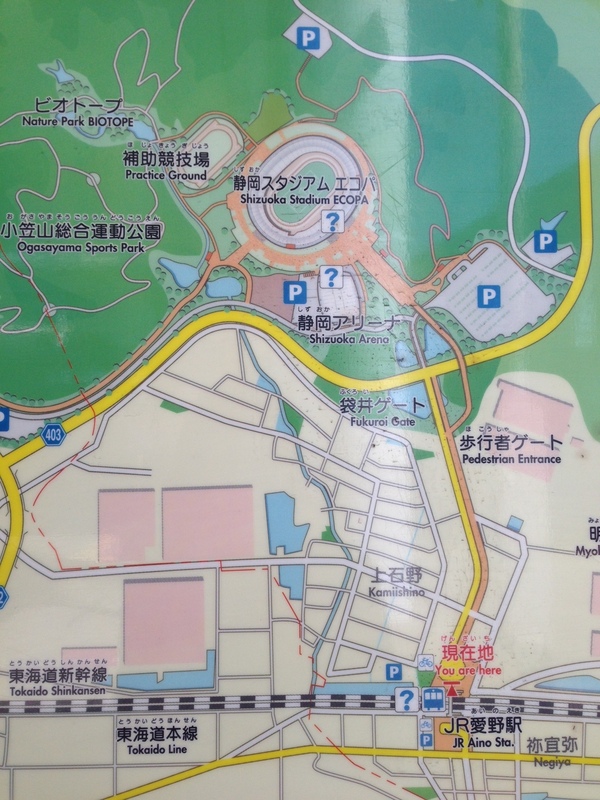 The park stands atop a hill. 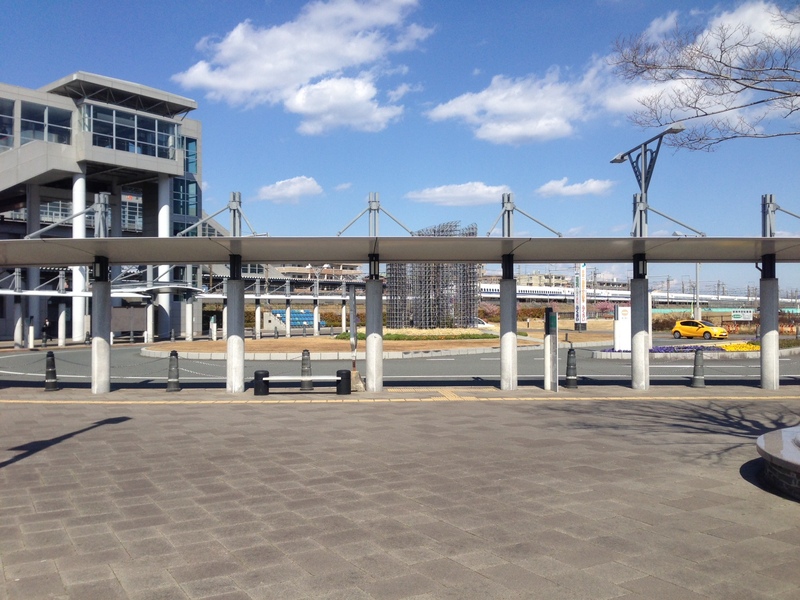 This is the facade of Aino Station! 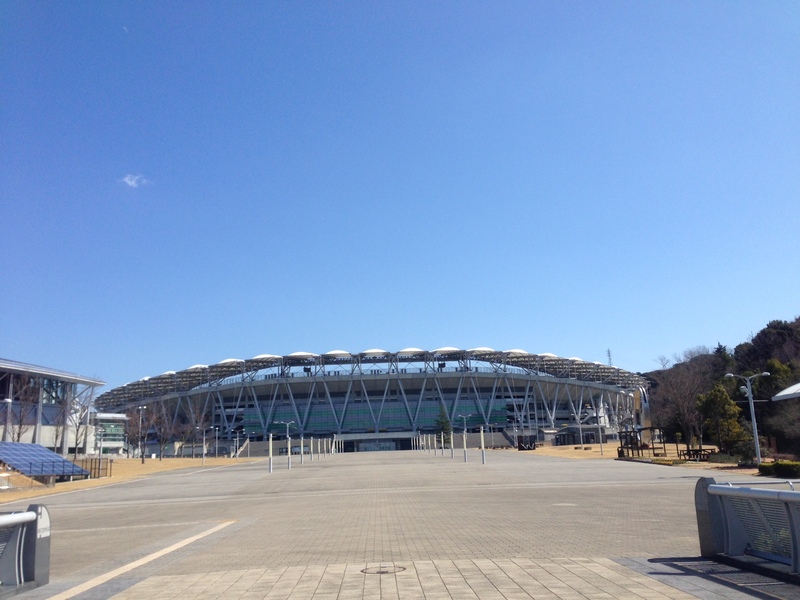 It was opened on April 22, 2001 just before the FIFA World Cup 2002! 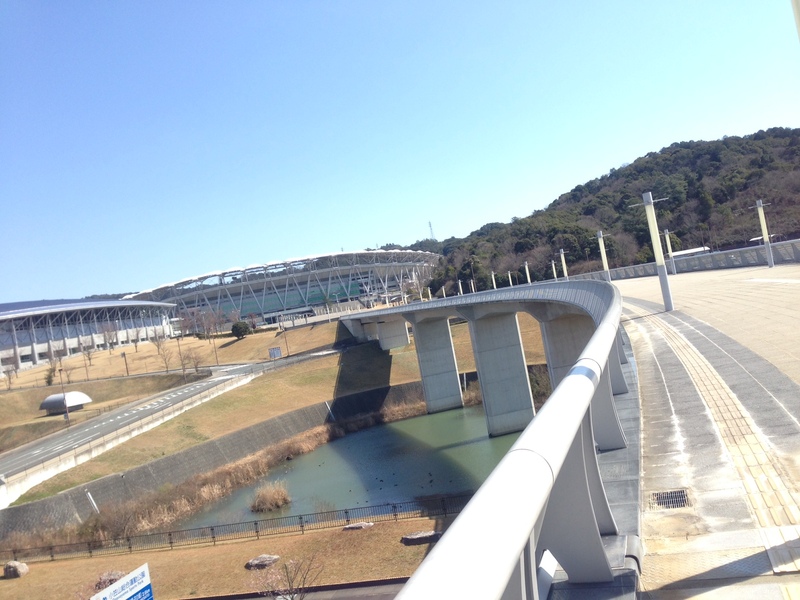 This is a nice place for train/JR buffs as the Tokaido Line and the Tokaido Shinkansen run parallel here! 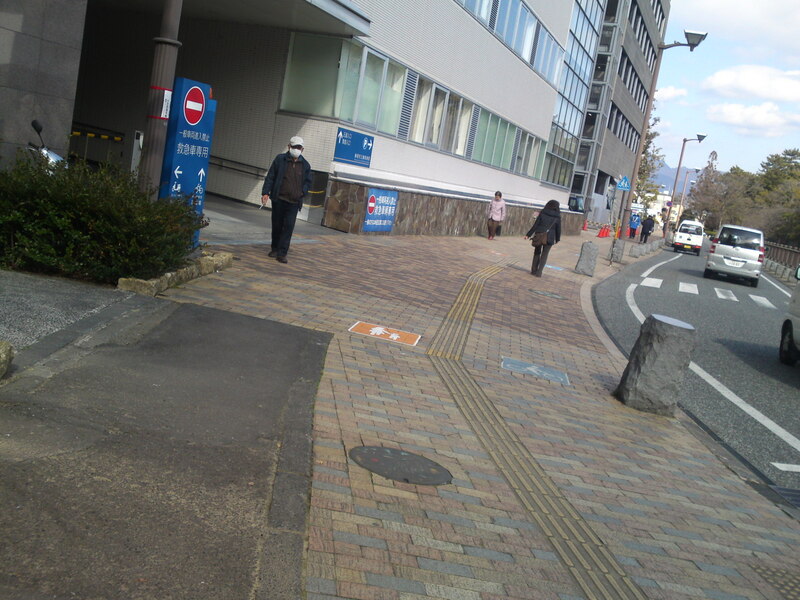 Actually, she saw the Dr. Yellow/Shinkansen was running east to west! It is an inspection train for electrics and track. The check-out is conducted twice a month, so she was lucky to spot it!! 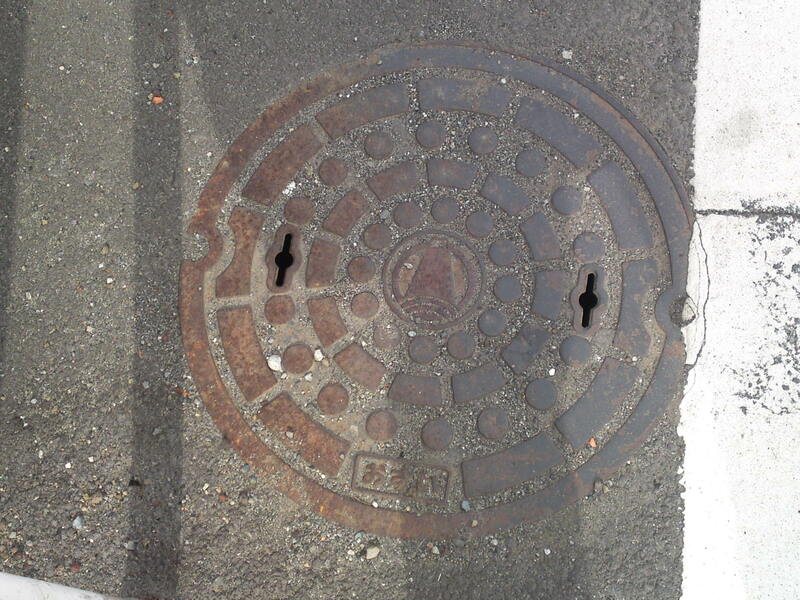 Unfortunately, she had no time to take pictures… It just wheezed away! 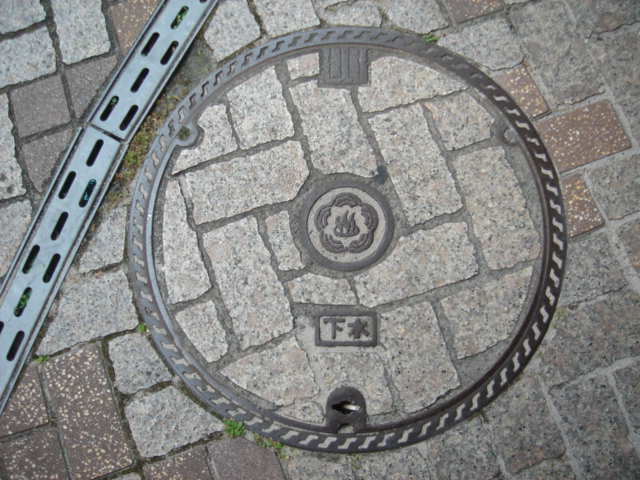 An unusually big double manhole cover from Fukuroi City! 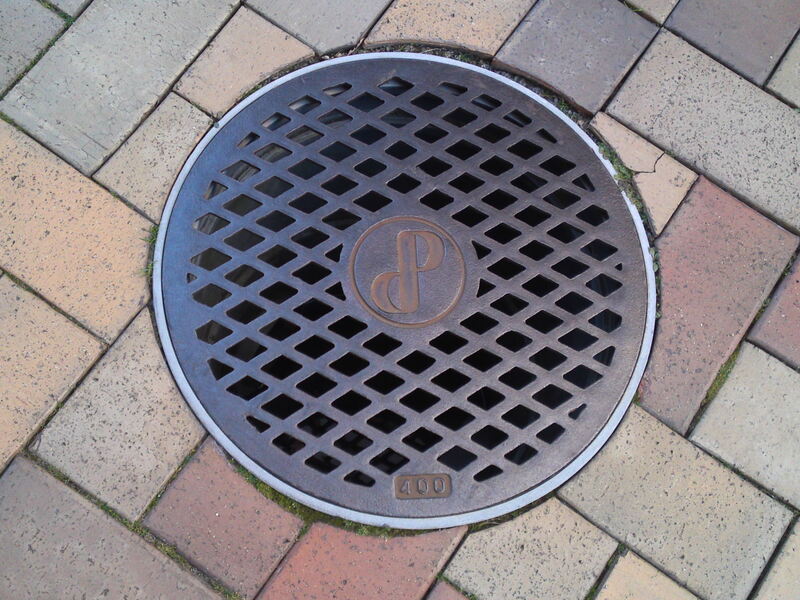 There were some covers on my way to the stadium. They were all new to her! 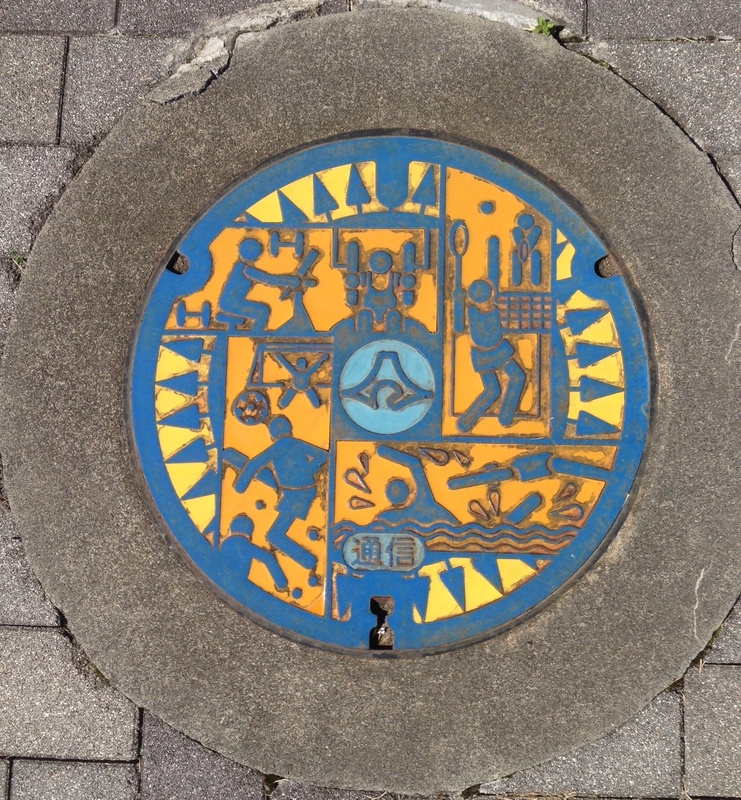 Ancient valve pit and central motif dating back to before the expansion of Fukuroi City! Same again for this pressurized air access! 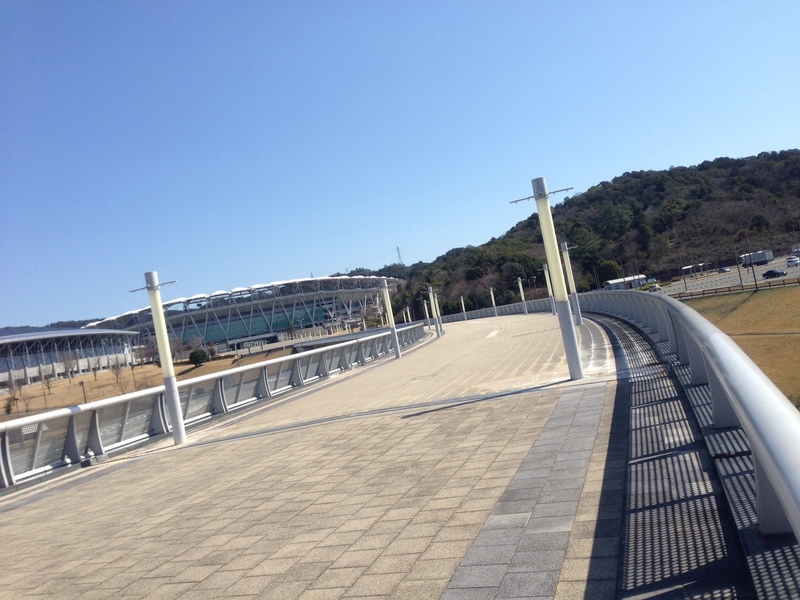 This is the pedestrian deck to the stadium! 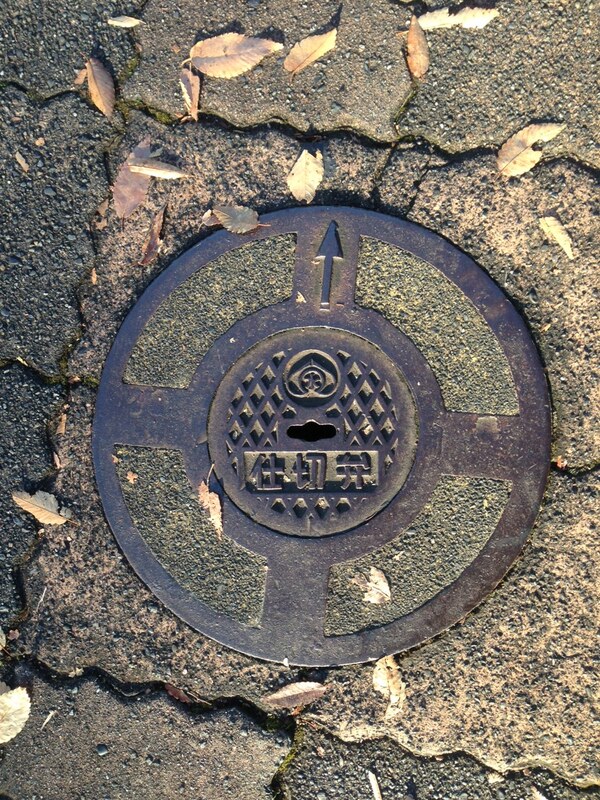 You walk along it with ECOPA is in front of your eyes! 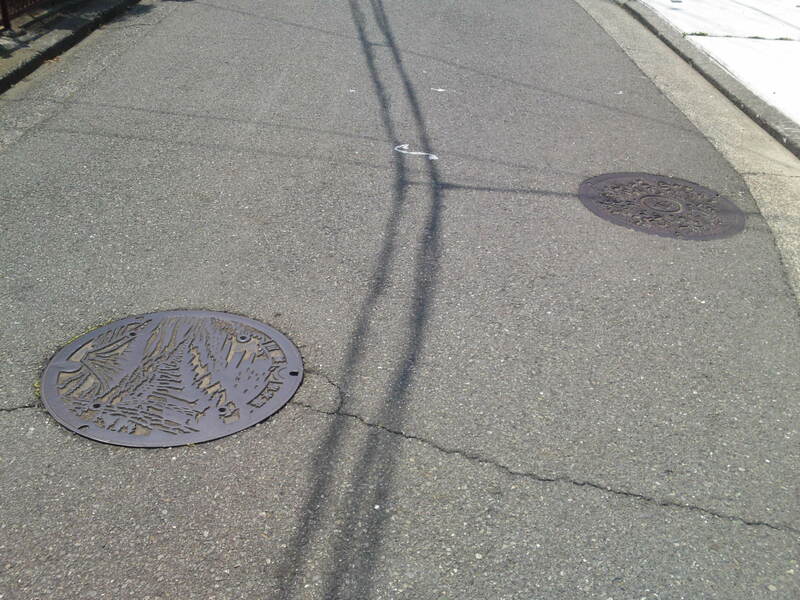 She could see the Japanese Southern Alps covered with snow in the north! 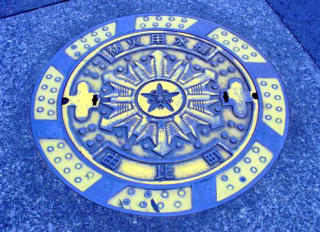 There are actually 1 blue type and 3 yellow types of beautiful manhole covers commemorating Ecopa! 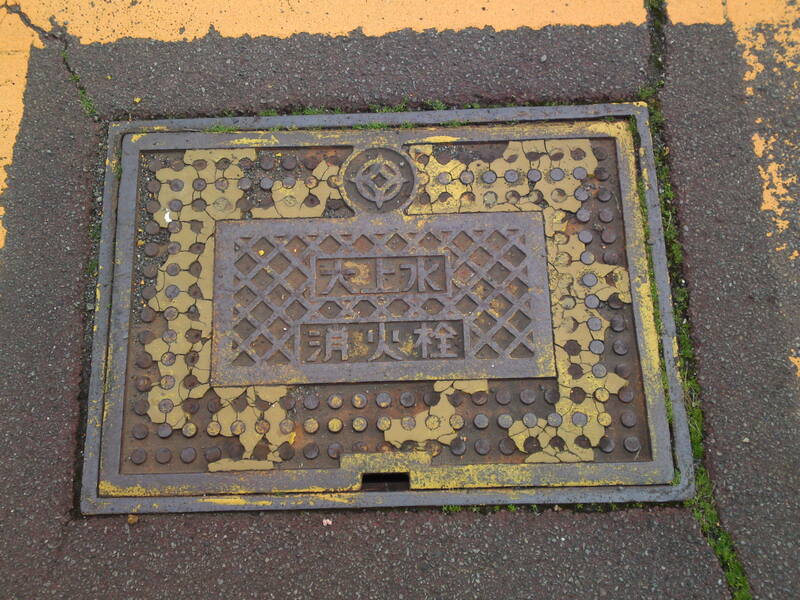 Yellow type for rain waters! 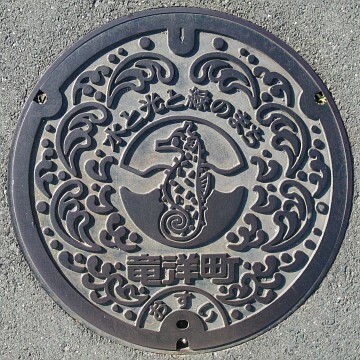 She also this fire hydrant manhole cover which can be seen all over the Prefecture with different city motifs, but interestingly enough, this particular bears the Shizuoka Prefecture motif! 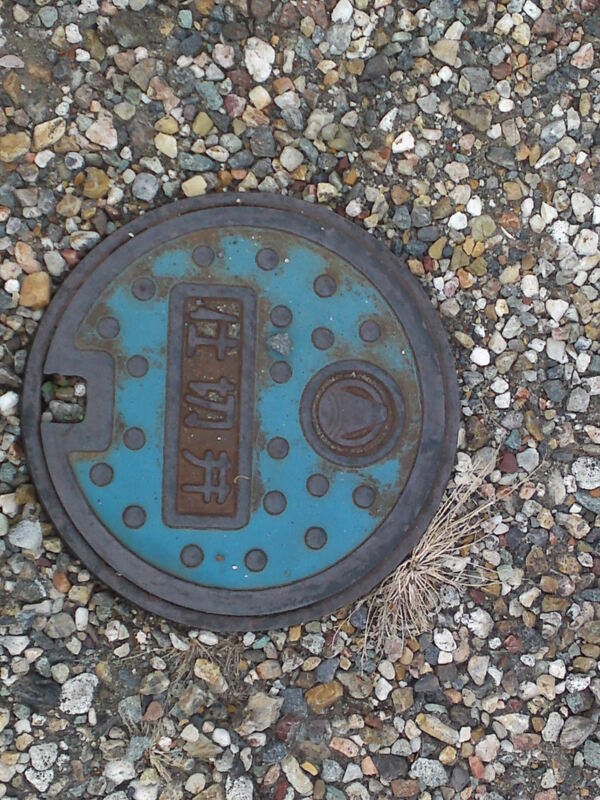 She also found this tiny blue valve pit cover with the Shizuoka Prefecture motif! 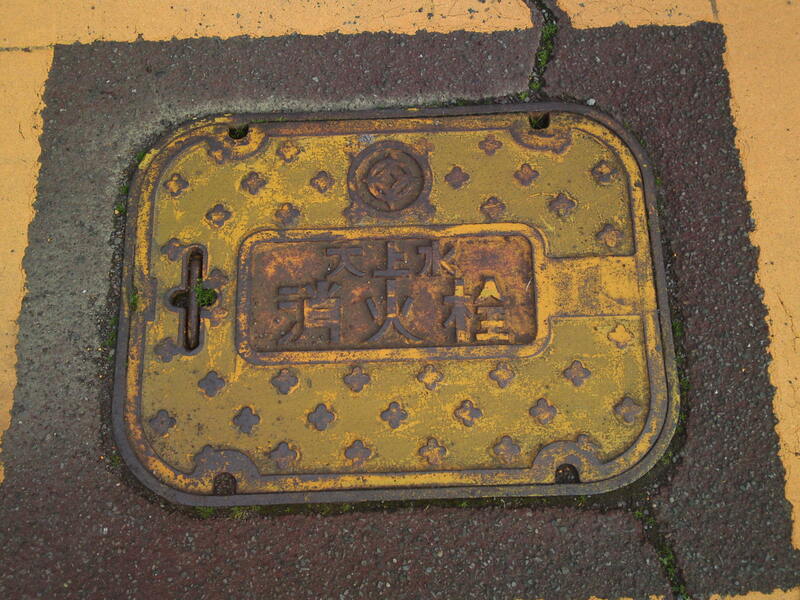 An imposing double yellow type for rain waters! 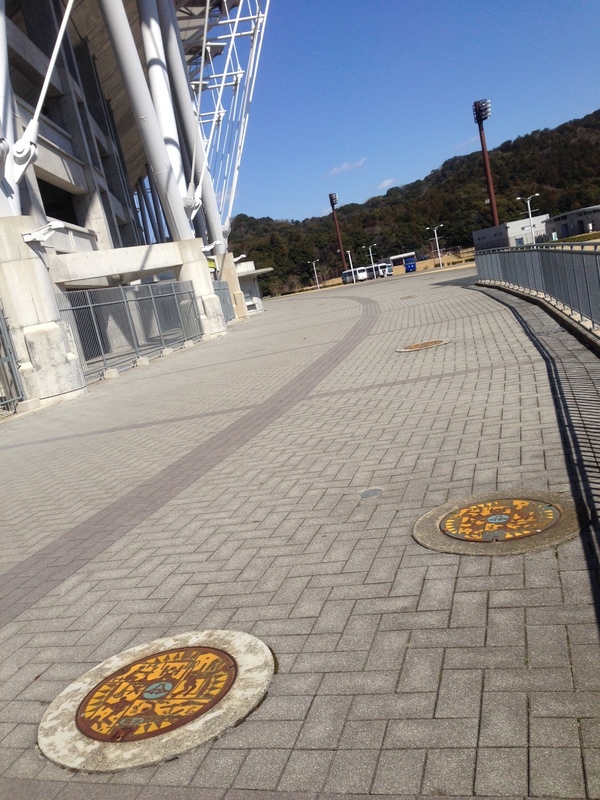 Next time you go and watch a soccer game there, you’ll know where to find them! 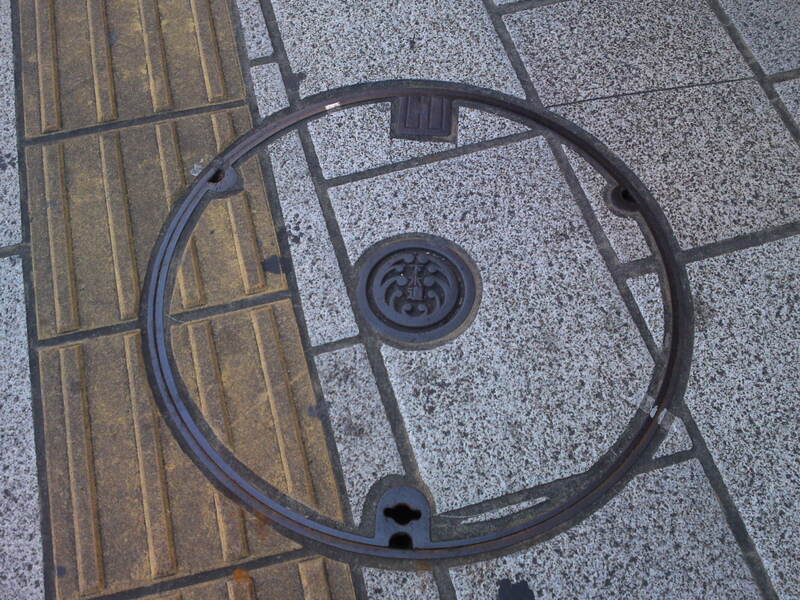 This is basically the second part of manhole covers found in Hamamatsu City! 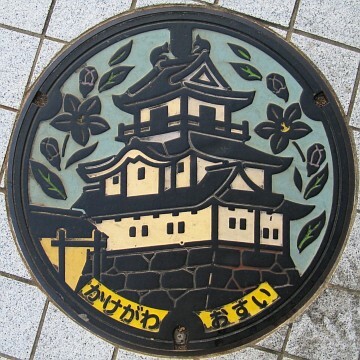 This a big city, actually the largest in area in Japan, so one can expect a mind-bogling variety of them, and I haven’t visited all the villages and towns merged into Hamamatsu City yet! 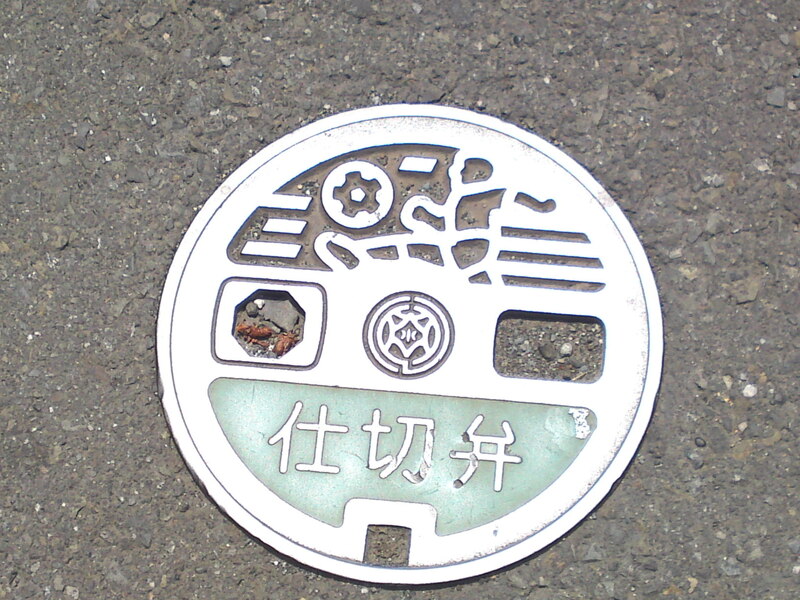 Fire hydrant found south of the JR Station. 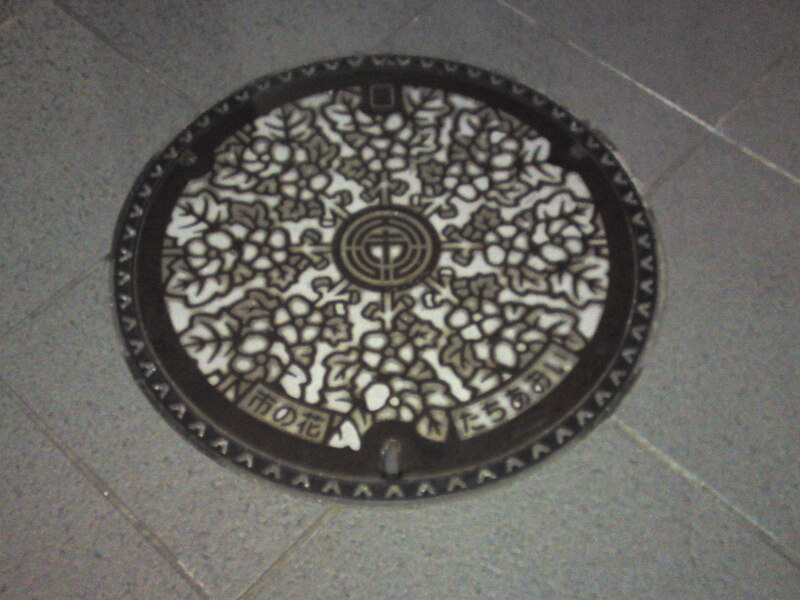 Probably one of the very first decorated manhole covers in the City! 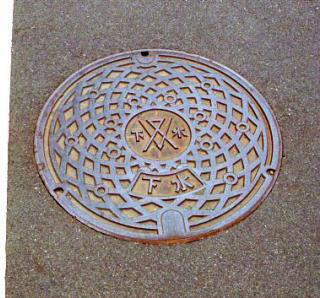 Another old fire hydrant cover found just in front of the Fire Station! 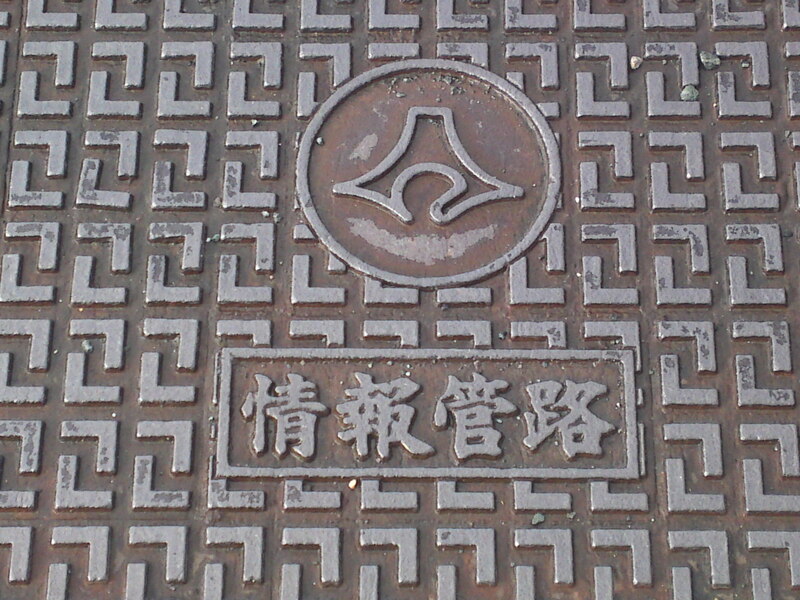 Water access but related to the gas company? 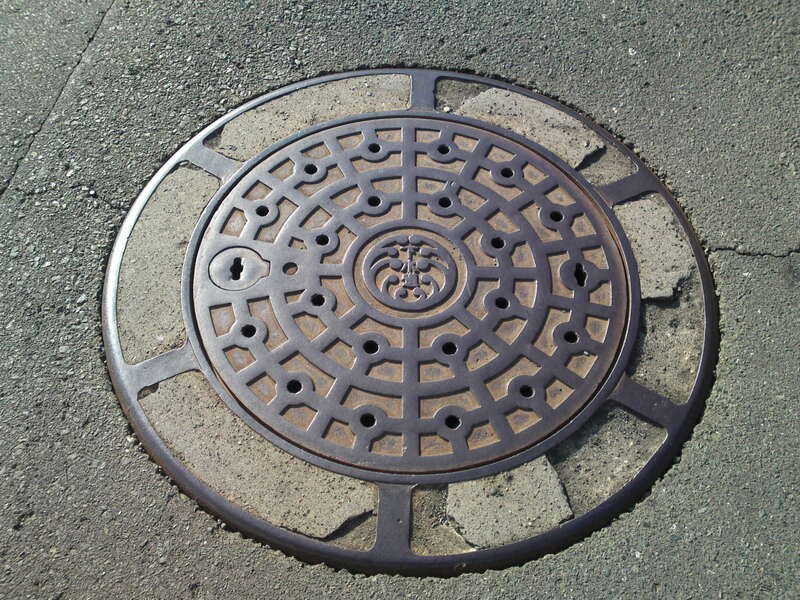 Spent water flow regulating manhole cover. 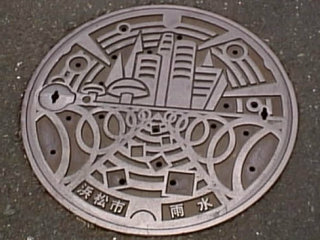 Note the Hamamatsu City symbol in the center! 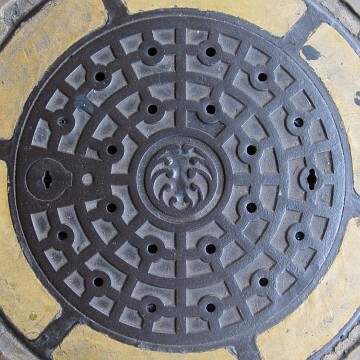 Similar as above but with holes if the “circles” and no extra mention of the sewerage! 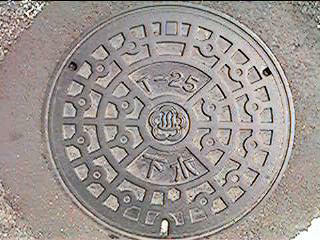 A far older rain water manhole cover fabricated by Kaneso Foundry! 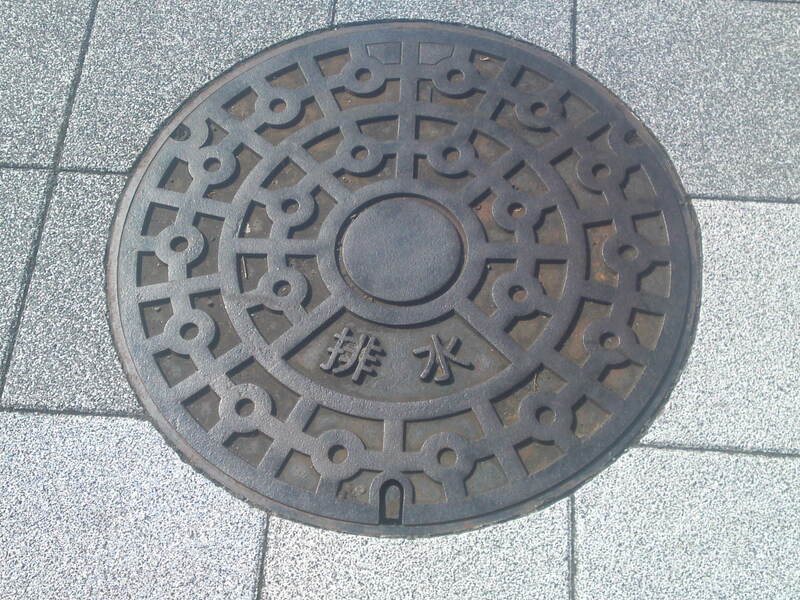 A water access manhole cover by Hinode Foundry! 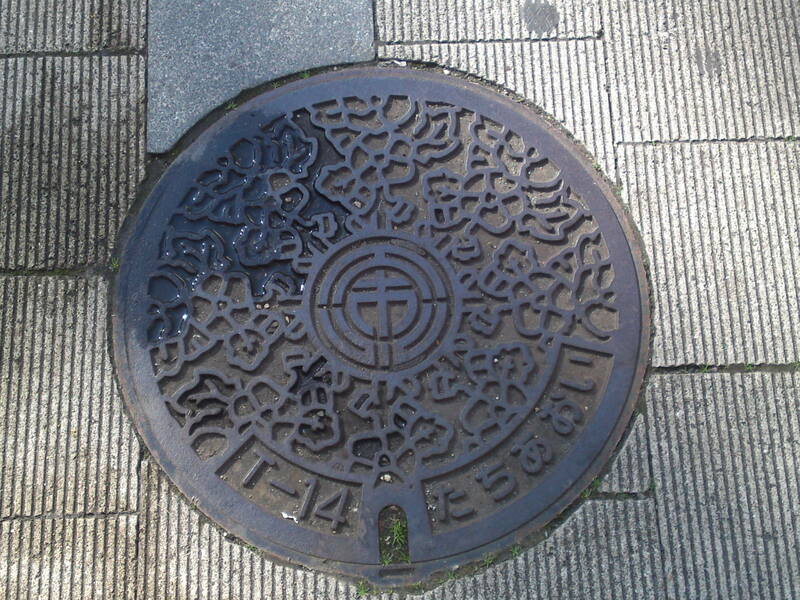 Another ancient sewer manhole cover type! 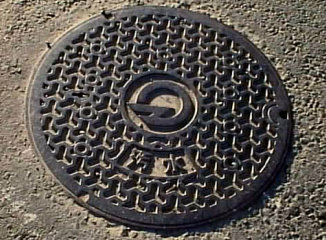 A private sewer manhole cover! A modern type trying hard to blend in the its environment! 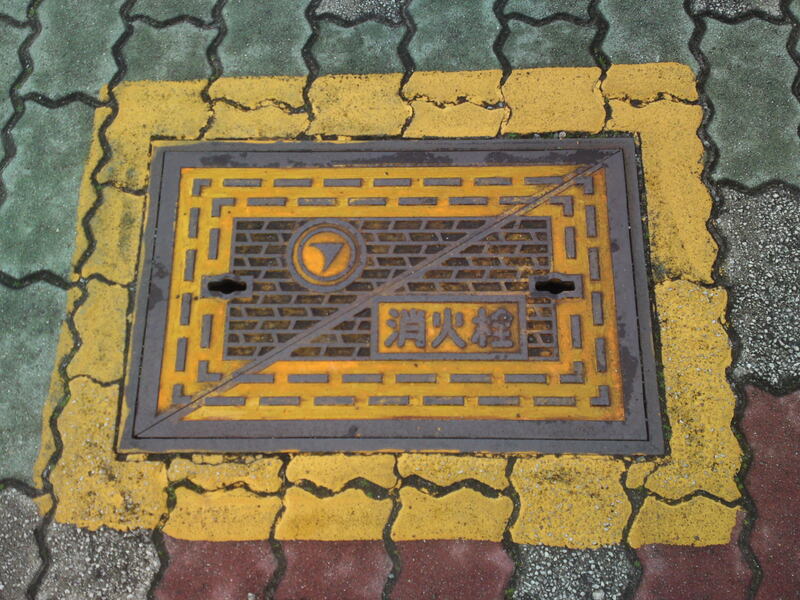 A traffic lights machinery access manhole cover! 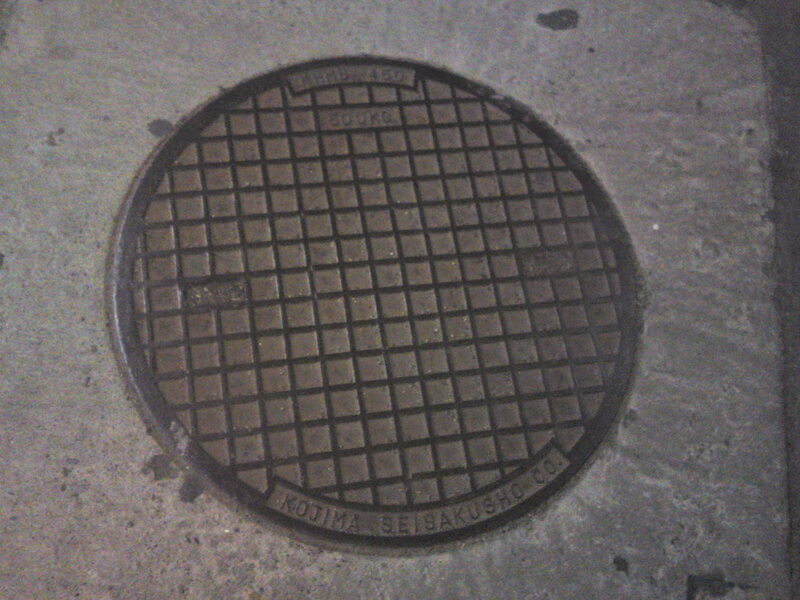 A very large unmarked, probably sewer. 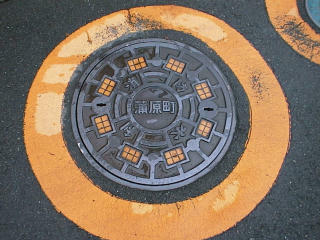 manhole cover! 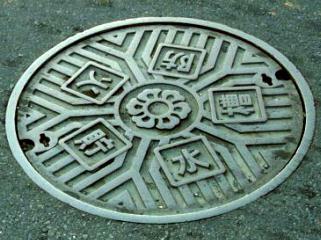 Another different modern sewer manhole cover type! 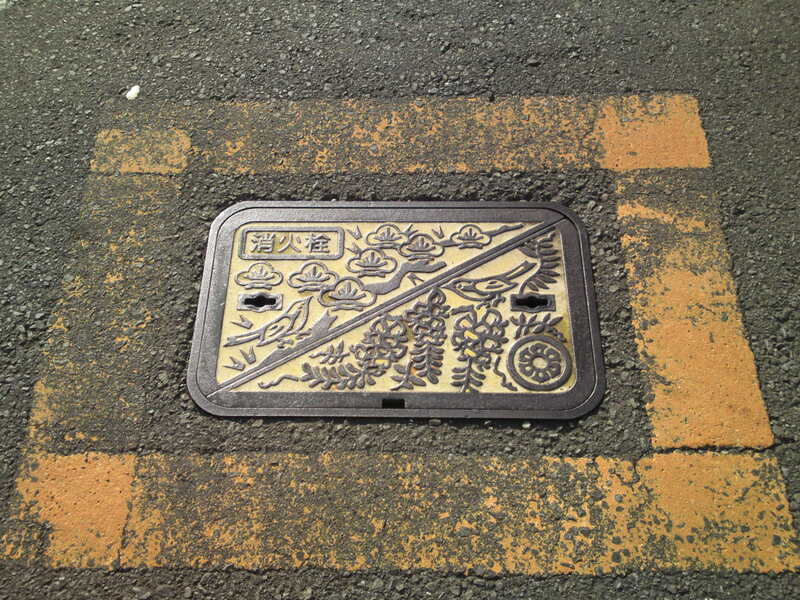 Similar to above but for rain waters! The same as above but the blending with its environment is off! 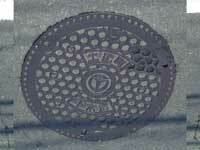 A large double valve pit! 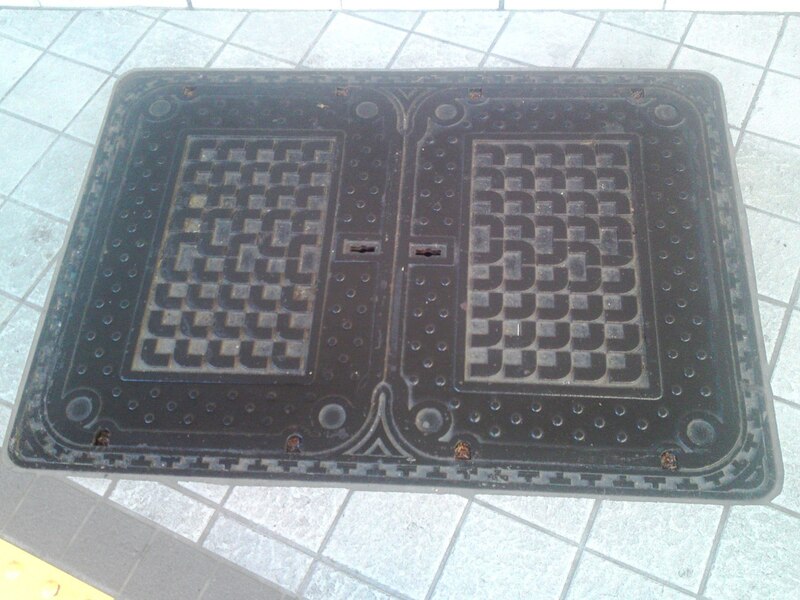 A small electricity control access manhole cover! 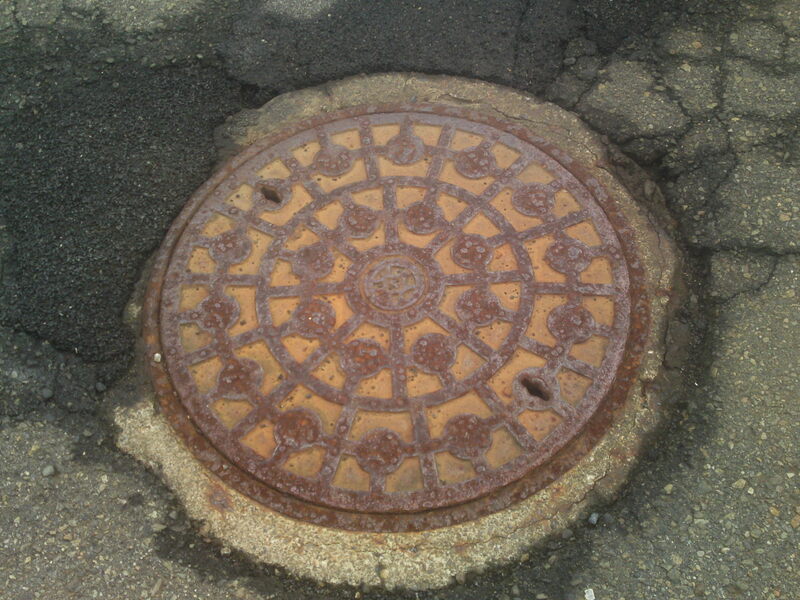 A very old sewer manhole cover! 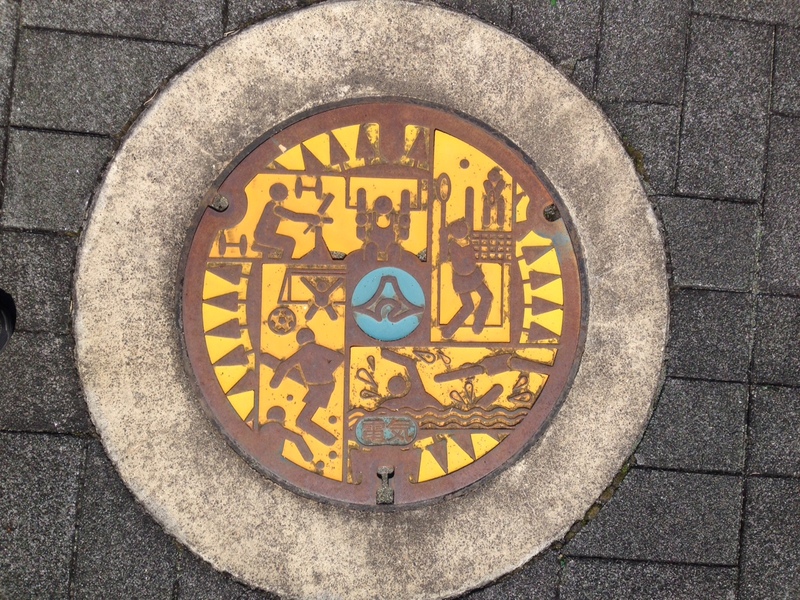 An old gas company pressurized water access valve pit! 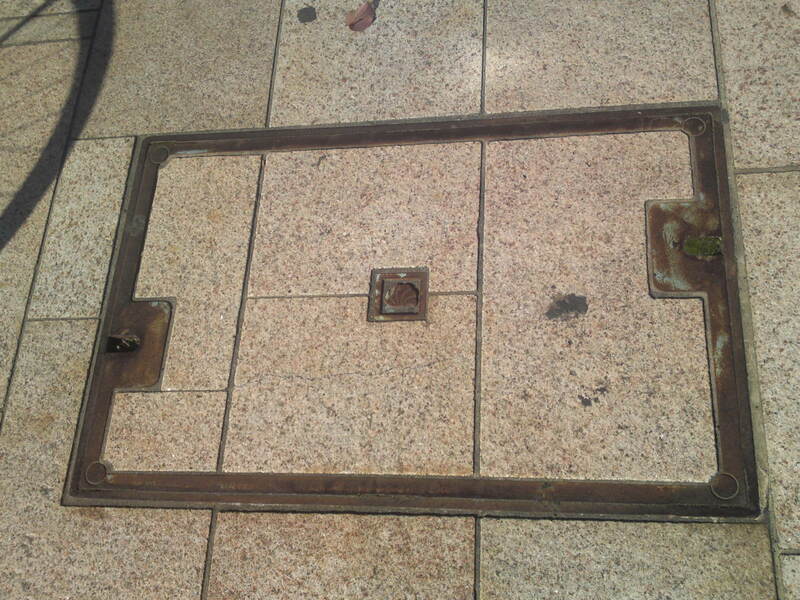 An old medium size valve pit! 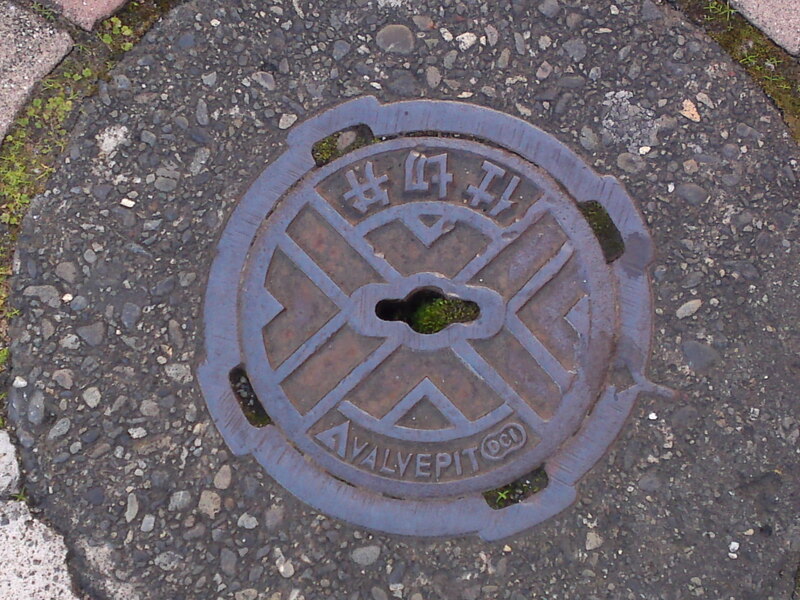 Another old valve pit type! 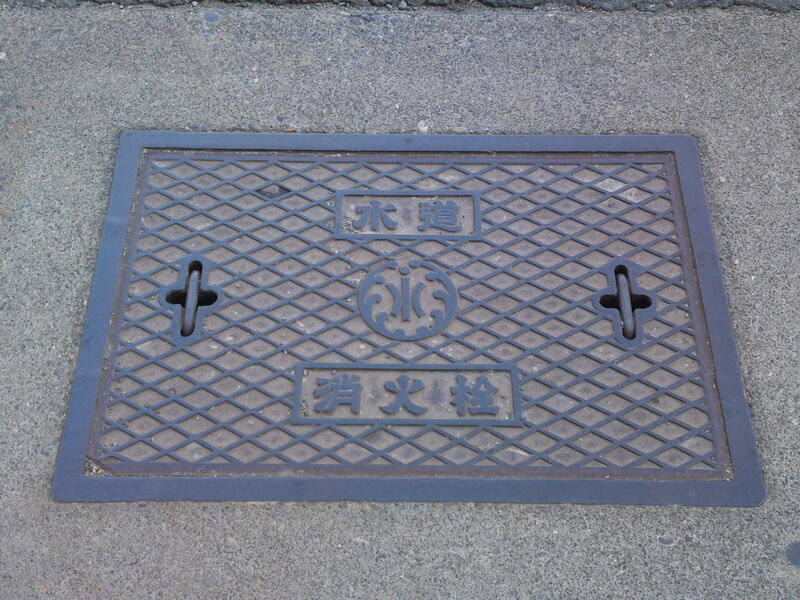 Large Chubu Electric Company manhole cover! 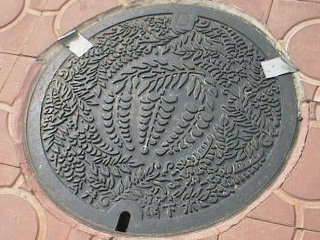 A large municipal manhole cover! 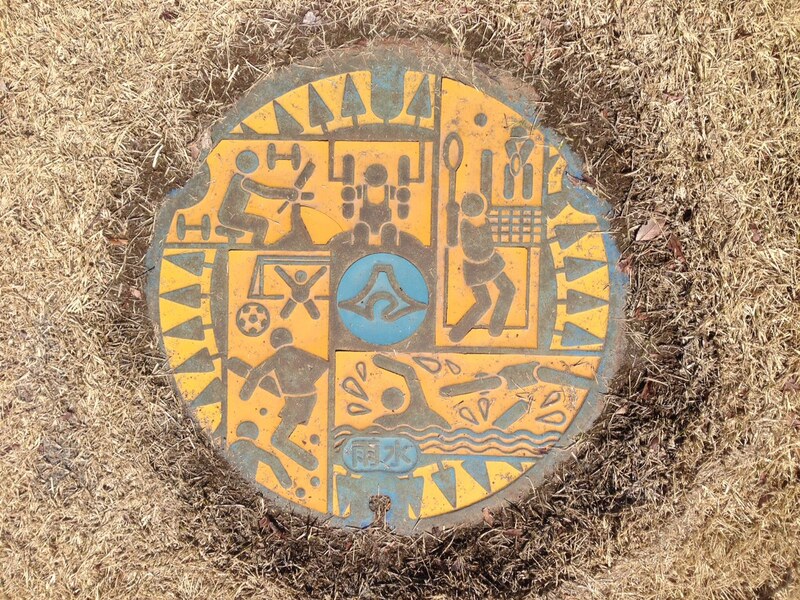 An ancient fire Hydrant manhole cover! 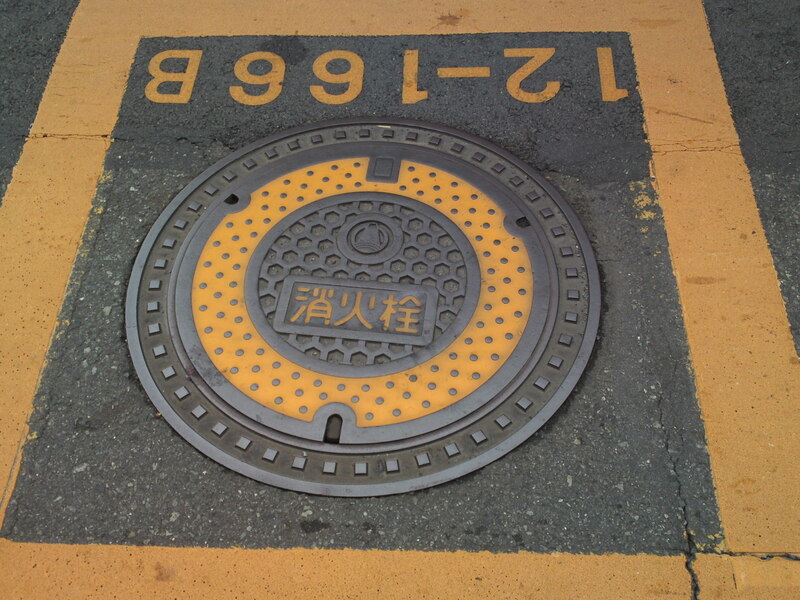 Another large fire hydrant manhole cover type! 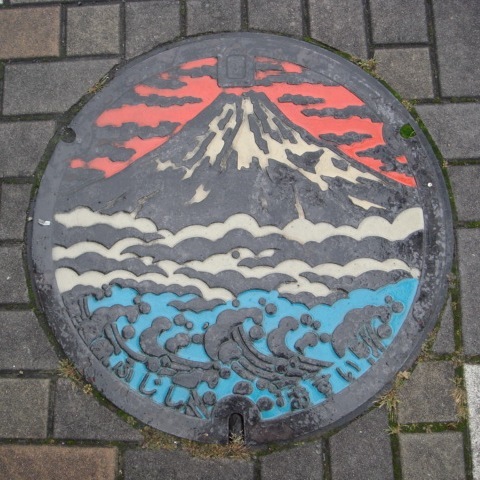 Yesterday as I had to go there for many reasons I took plenty of pictures in Iwata City and Fukuroi City which are neighbors in Wsetern Shizuoka Prefecture! 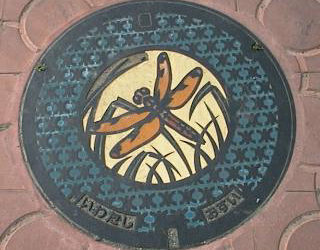 These colored dragonfly manhole covers are found only south of Iwata JR station. Unfortunately this was the only one still unscathed so hurry up! 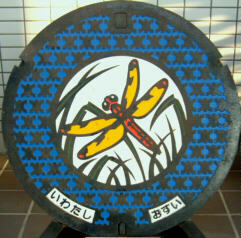 The uncolored dragonfly, the symbol of Iwata City, come in different types and sizes. 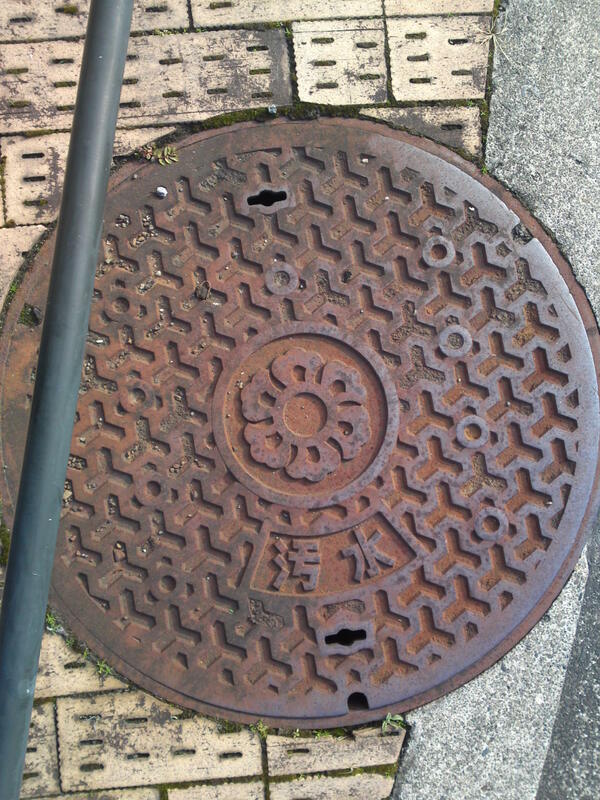 The above is the largest type! 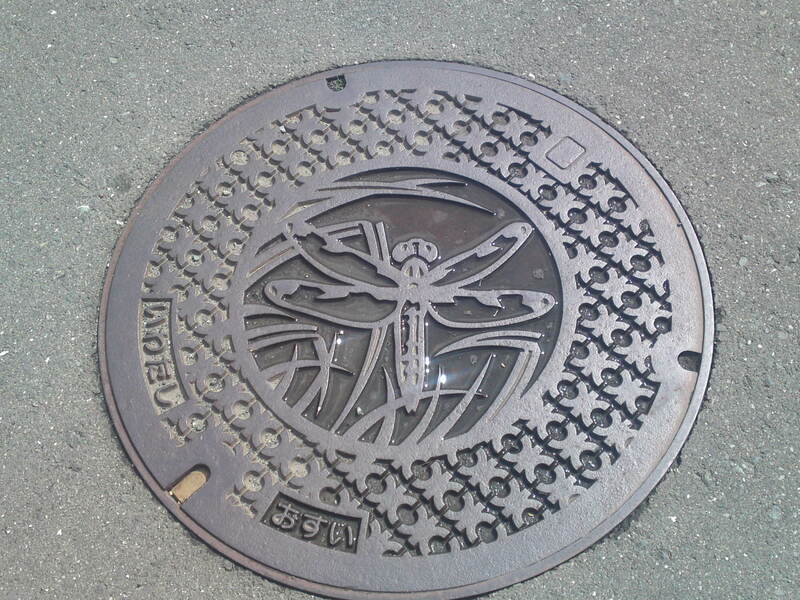 Different type of a small-sized dragonfly cover! 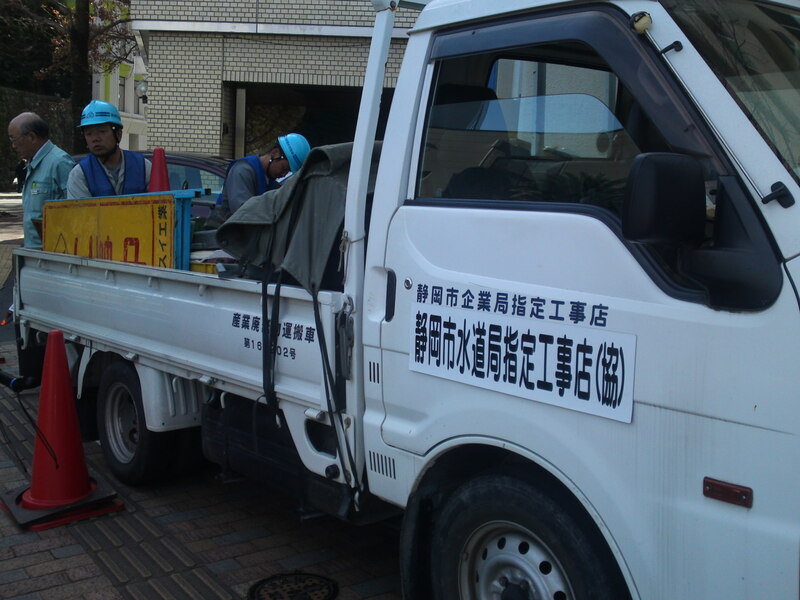 Iwata Firefighters are fans of the Iwata Jubilo Soccer Team! 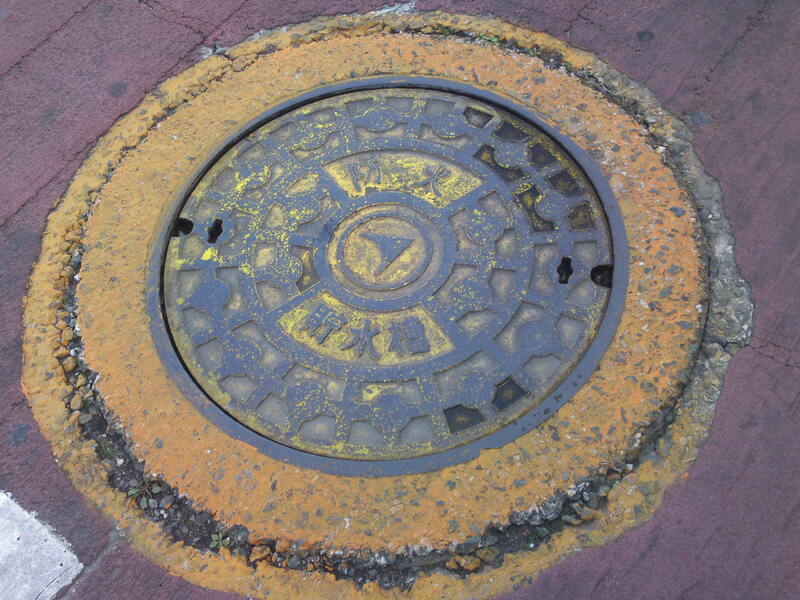 The same with a yellow circle painted around for easier access to the fire hydrant at night! 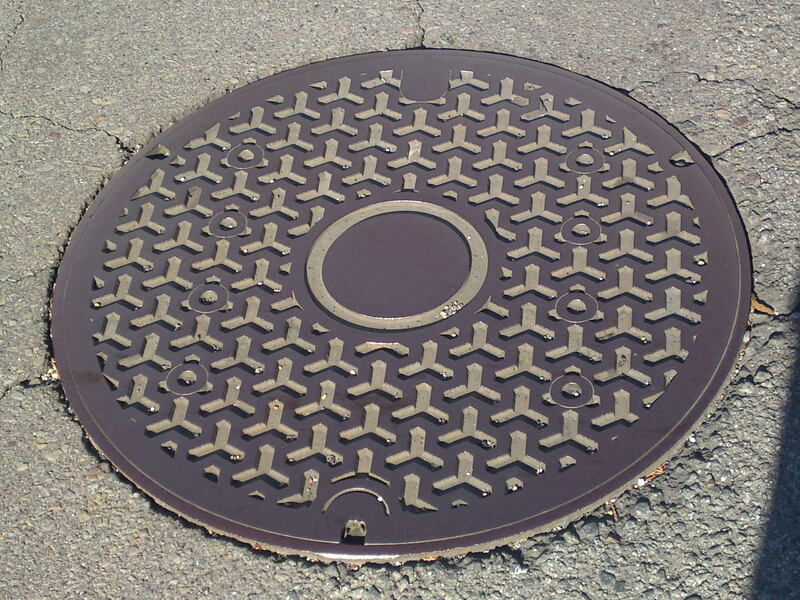 A great geometrical design for a fire hydrant manhole cover! 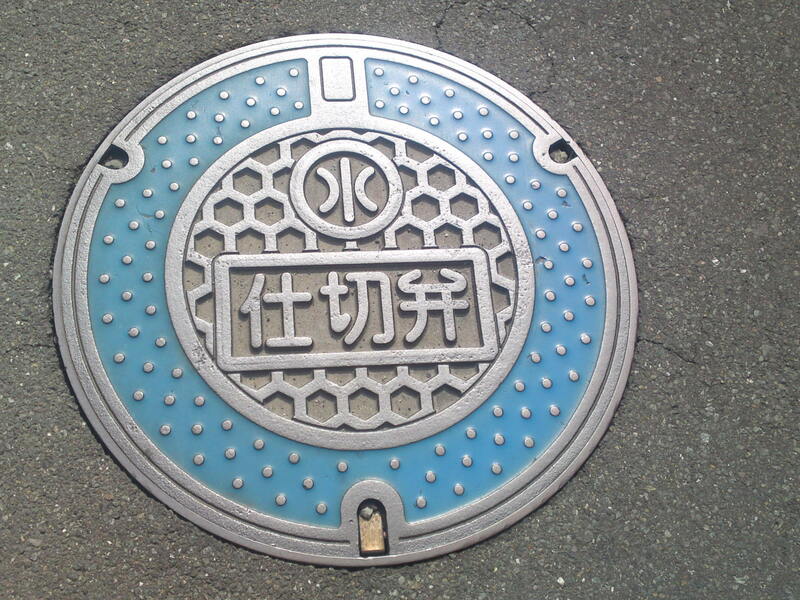 A municipal Iwata City sewer manhole cover! 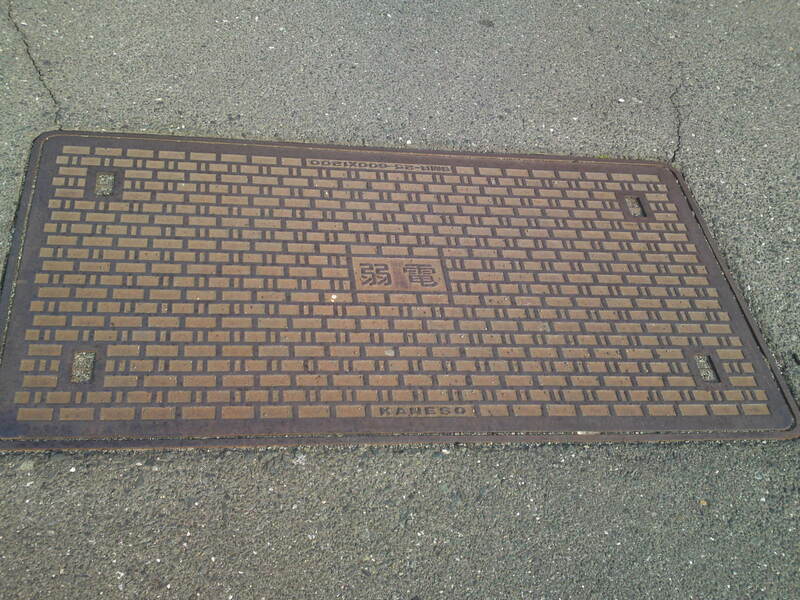 A rectangular fire hydrant cover! 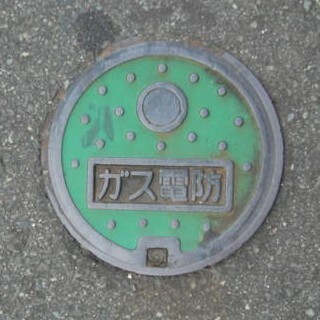 A common fire hydrant type found everywhere in Japan but with the Iwata City motif! 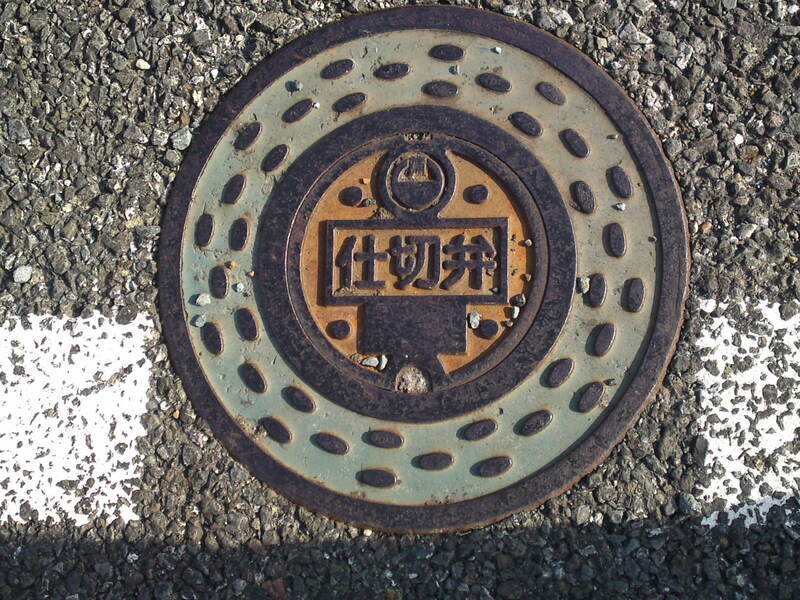 A very ancient fire hydrant manhole cover in Iwata City! 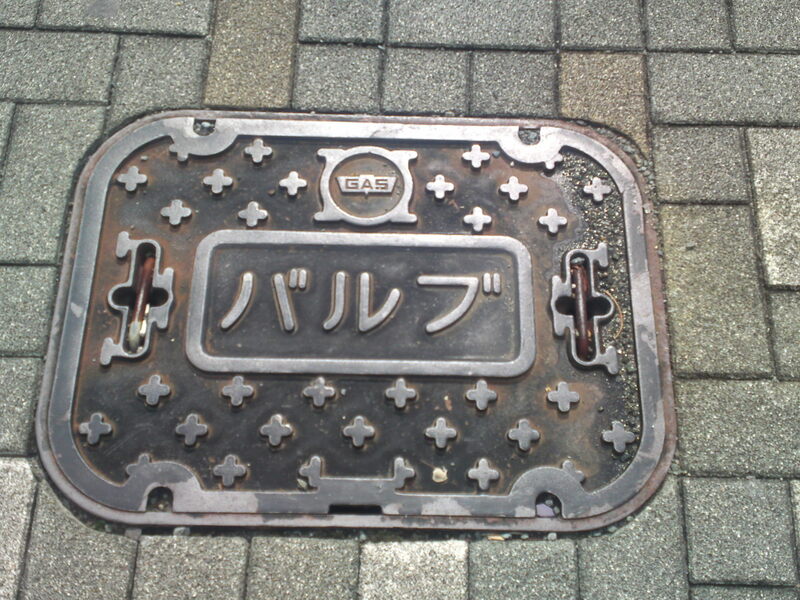 An unusually uncolored gas valve pit cover in Iwata Cuty! 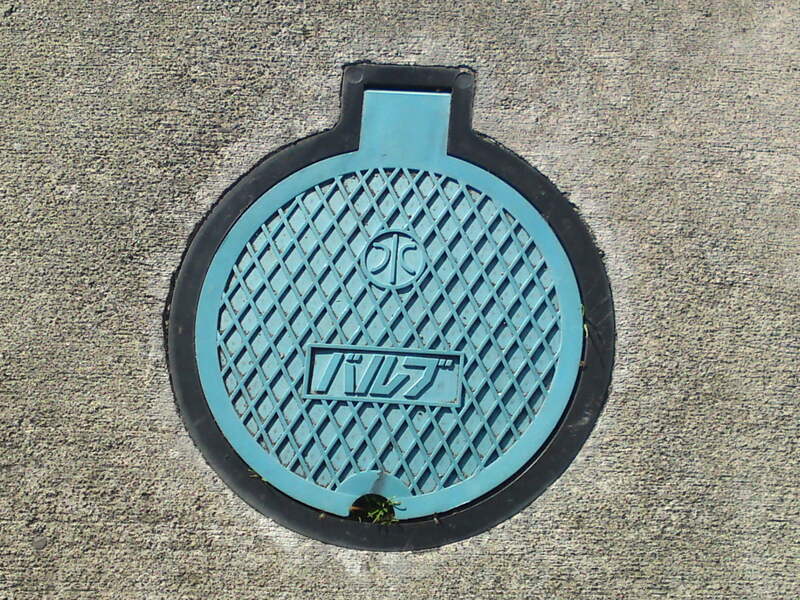 An unusually large water valve pit in Iwata City! 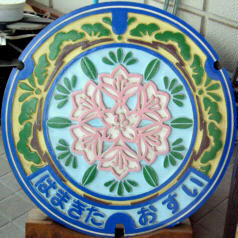 The same as above but of a more usual and smaller type! 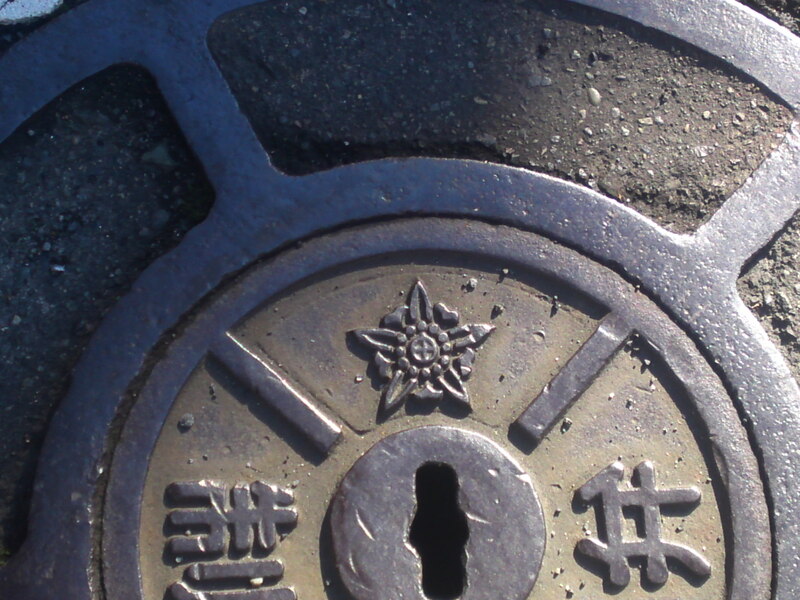 The same but with a Japanese inscription signifying “locked left”! 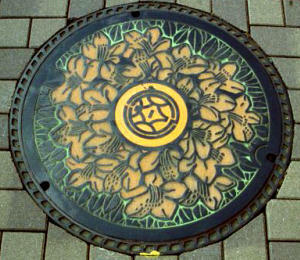 Strictly not a manhole cover but a beautifully decorated sewer cover! 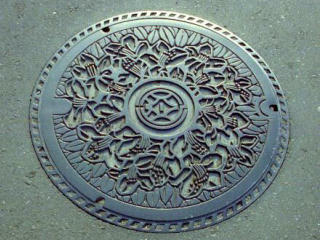 The same with symbol flower of Iwata CIty! I couldn’t find the colored one! The same in a smaller type! 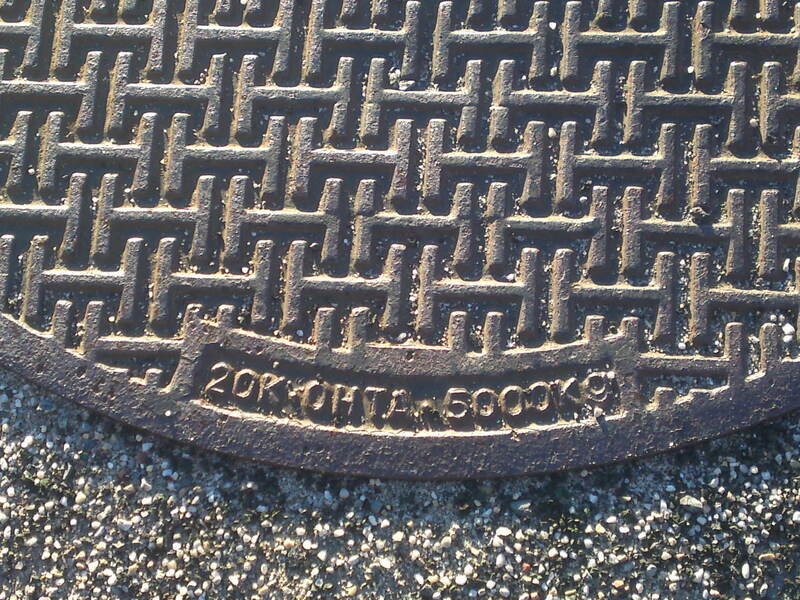 I found by chance this manhole cover before the road was laid down! 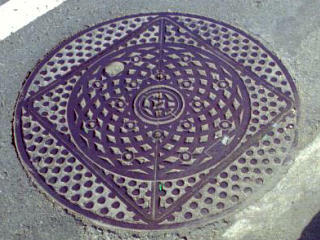 Another fine geometrically designed fire hydrant manhole cover! Again but without the colors! 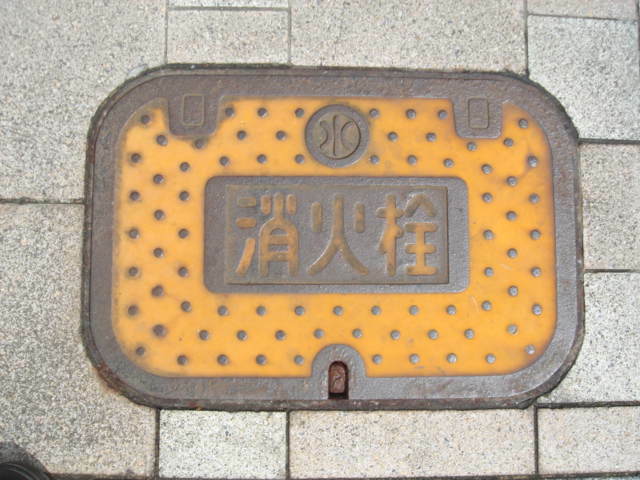 A similar but more ancient type! 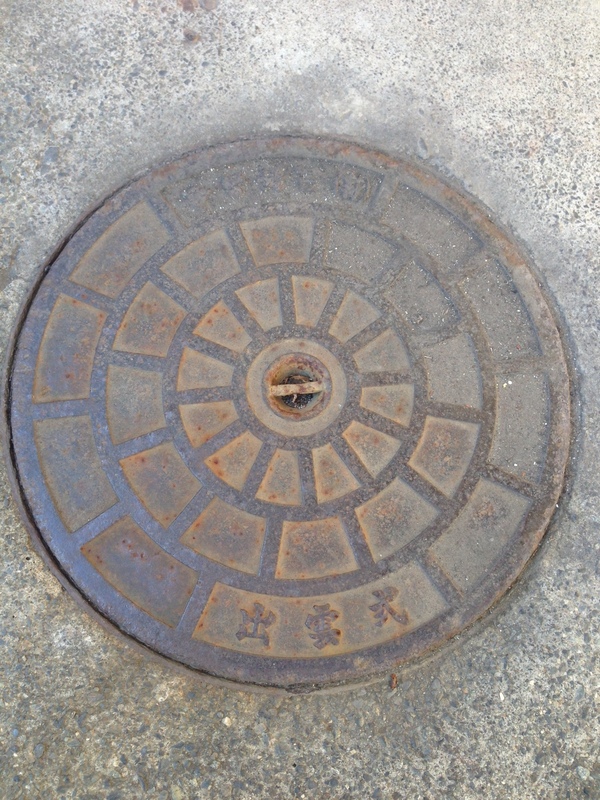 An old type, probably a sewer manhole cover! 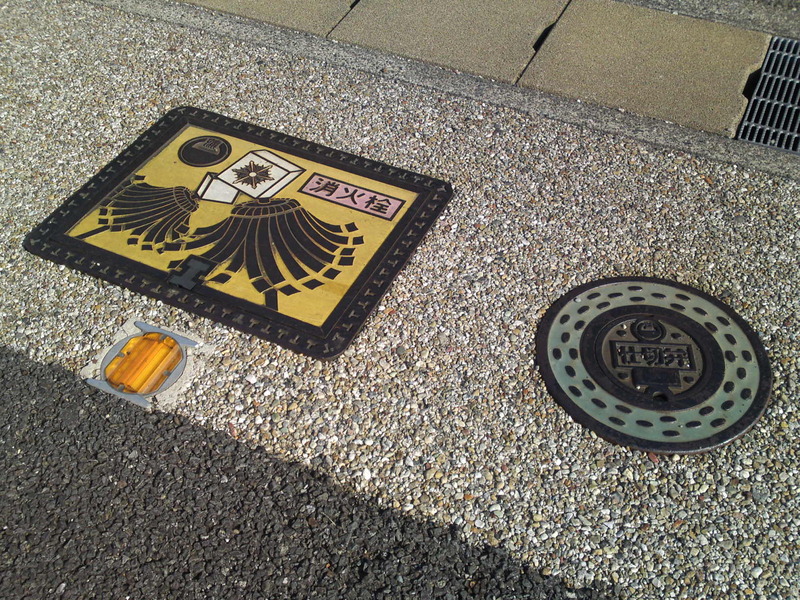 Rectangular fire hydrant access with the Fukuroi City motif! 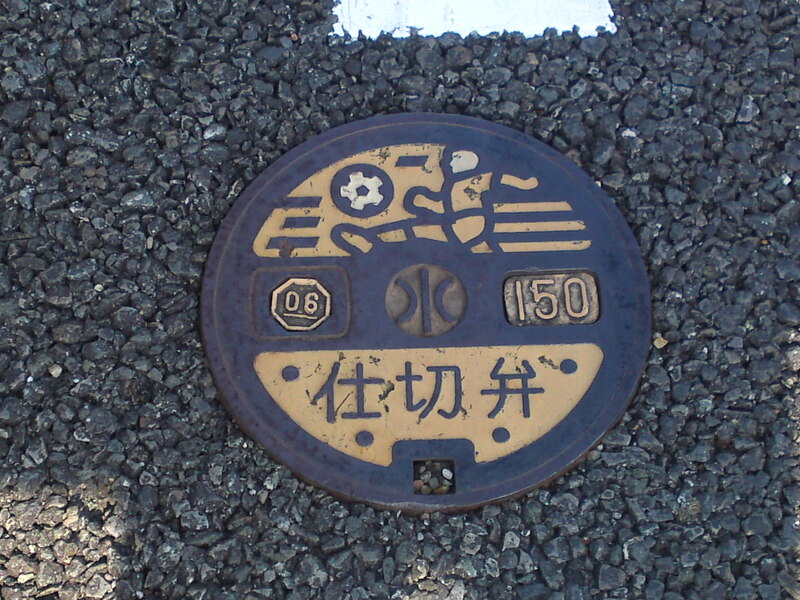 An older fire hydrant access type with the Fukuroi City motif! 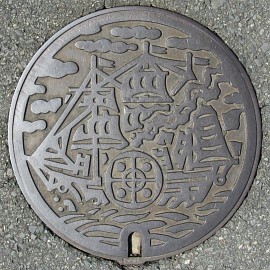 Still another type found elsewhre but with the Fukuroi City motif! 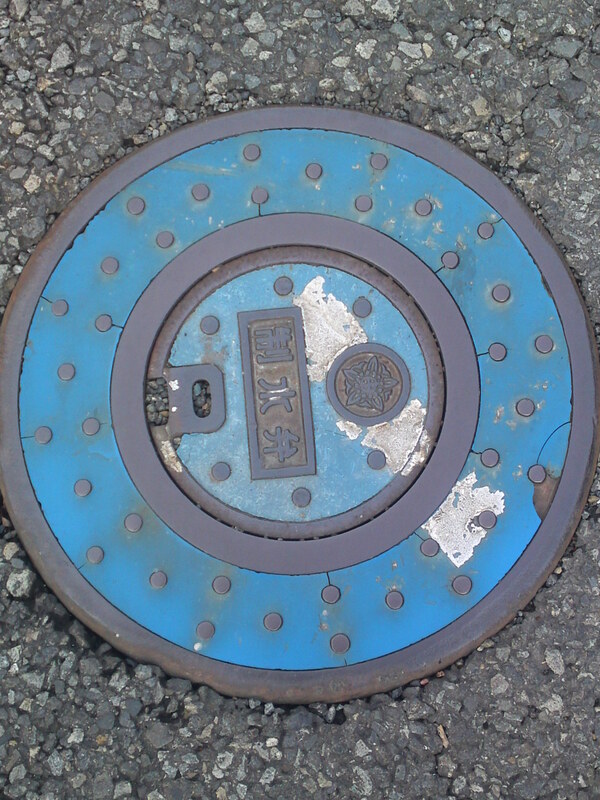 Same in blue but for pressurized air access! 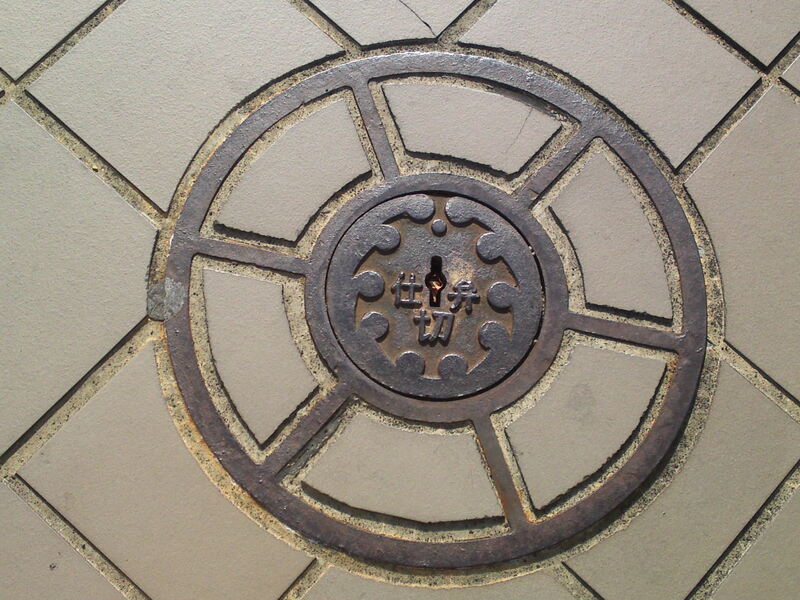 Strictly not a manhole cover but a fine sewer cover! 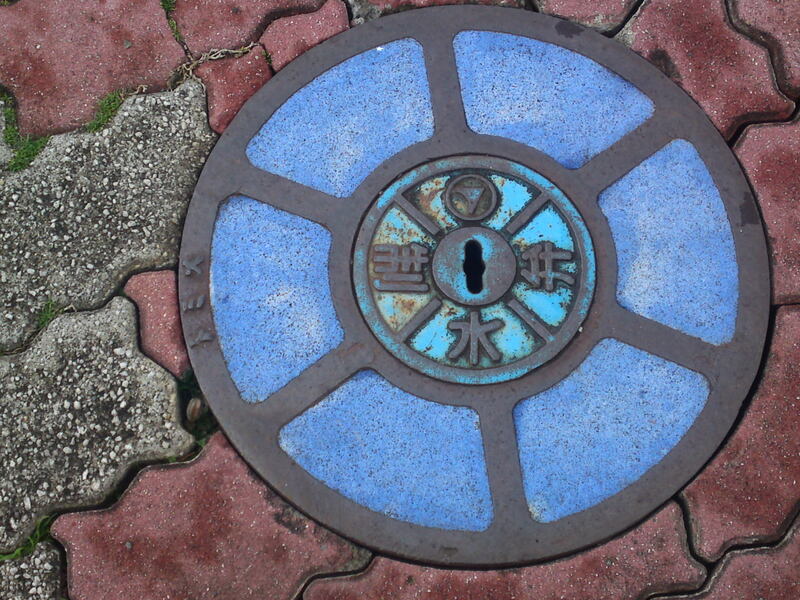 Blue valve pit with the Fukuroi City motif! 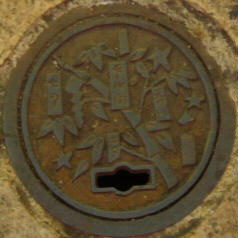 Another water valve pit with the Fukuroi City motif! 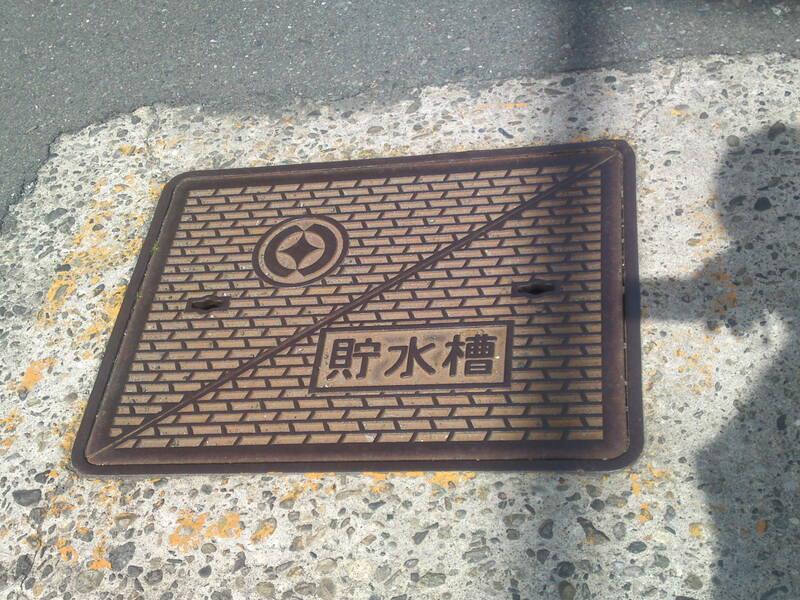 A very large rectangular manhole cover used by Shizuoka prefecture! 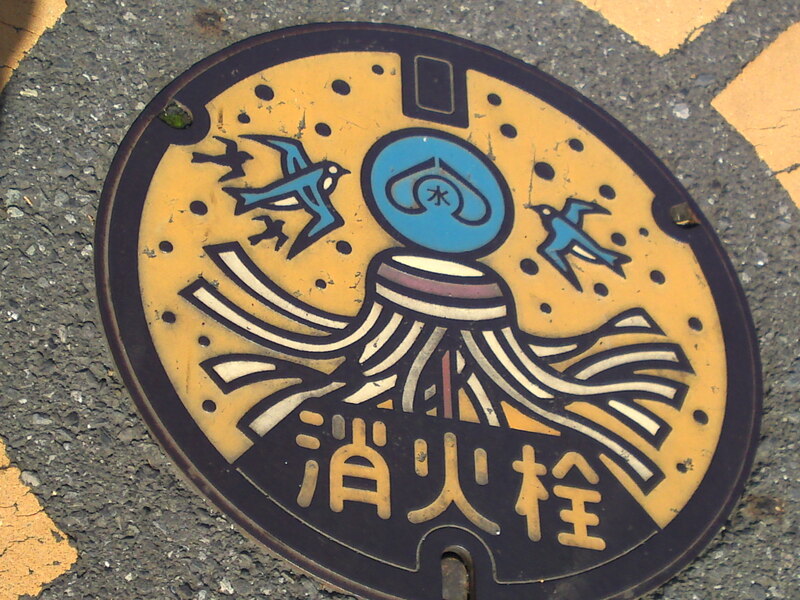 More arrows with blue and yellow backgrounds in Yui, Shimizu Ku, Shizuoka City! 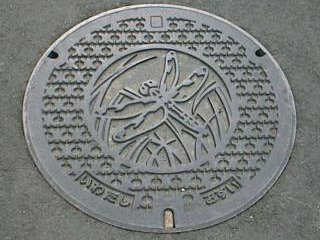 Can you distinguish the sakura ebi/cherry shrimp in the middle of this manhole cover in Yui, Shimizu Ku, Shizuoka City? 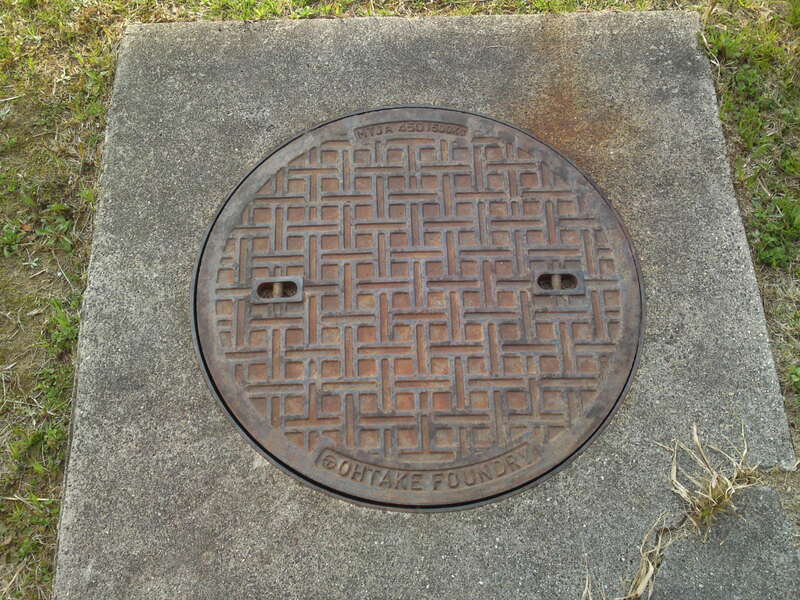 Found in Kambara, Shimizu Ku, Shizuoka City! 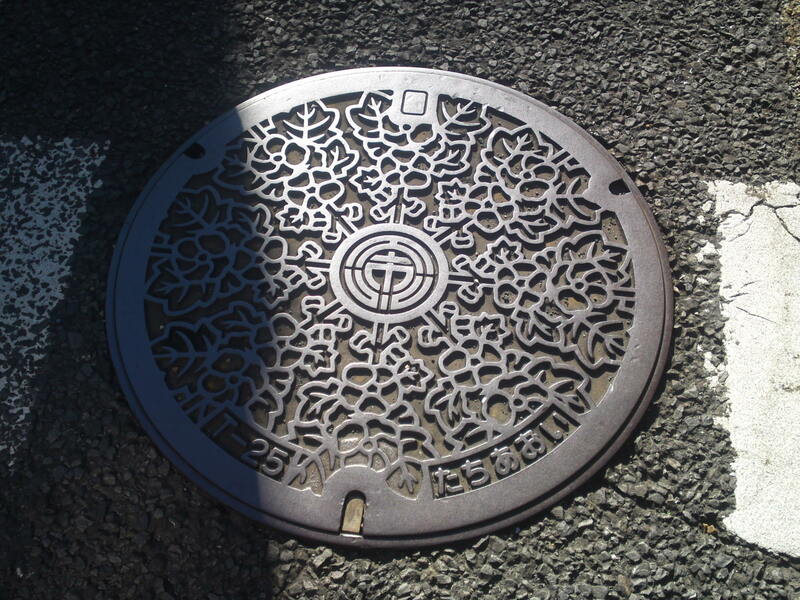 Similar in design but less intricate in Shizuoka City! 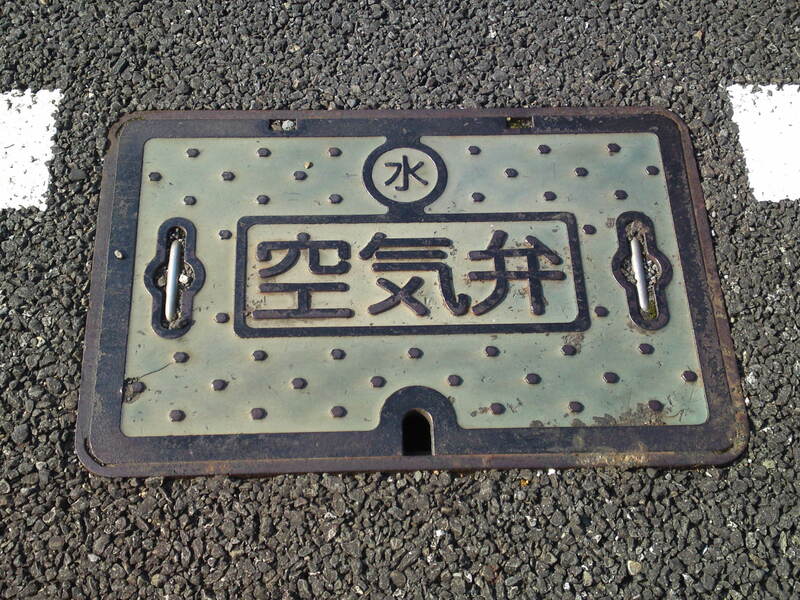 An old type in Ryuuyoo now merged into Iwata City! 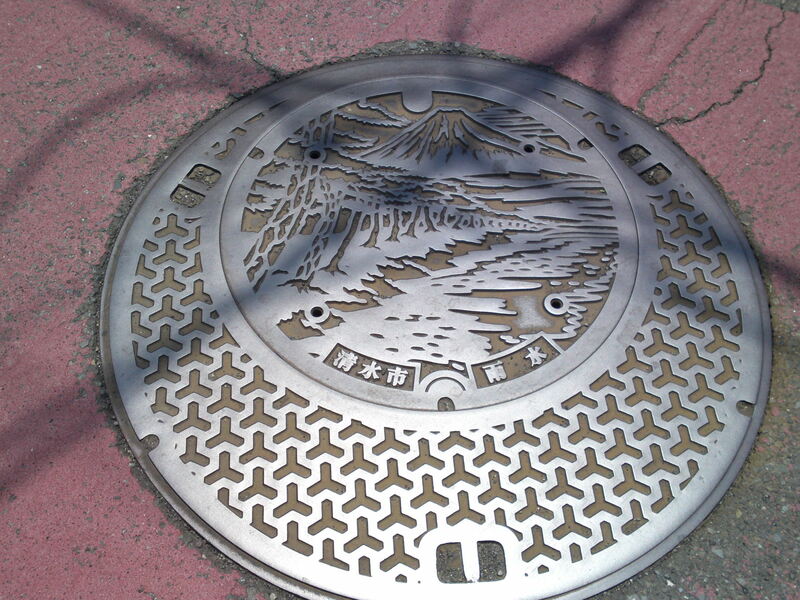 Yoshiwara in Fuji City has at least 3 varieties on that design! 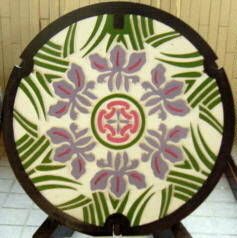 Check the central motifs! 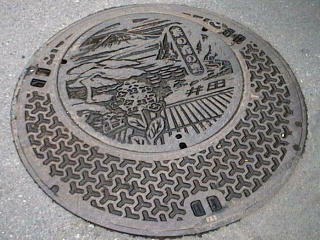 2nd variety in Yoshiwar, Fuji City! 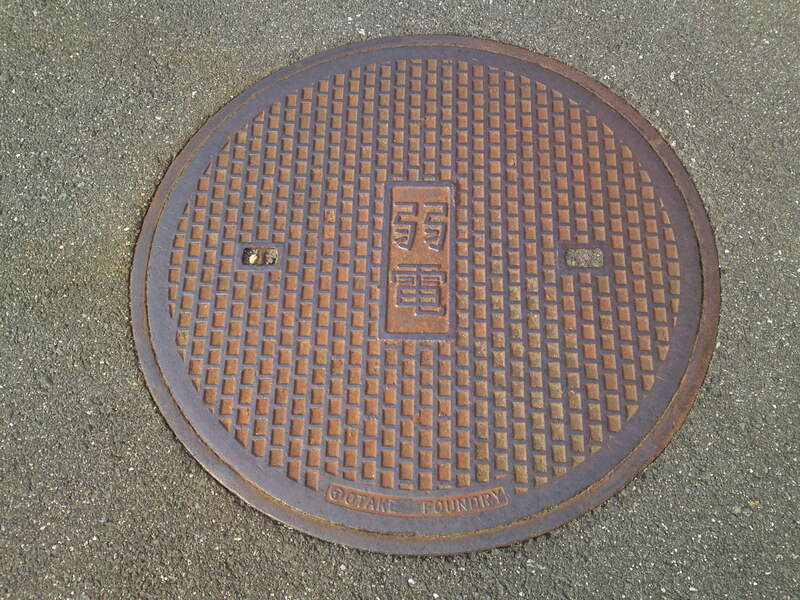 3rd variety in Yoshiwara, Fuji City! 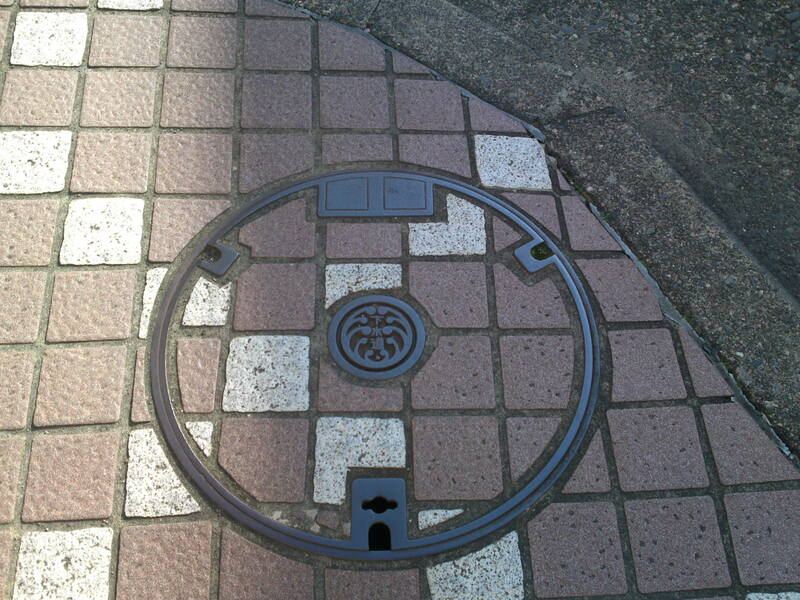 Double manhole cover! 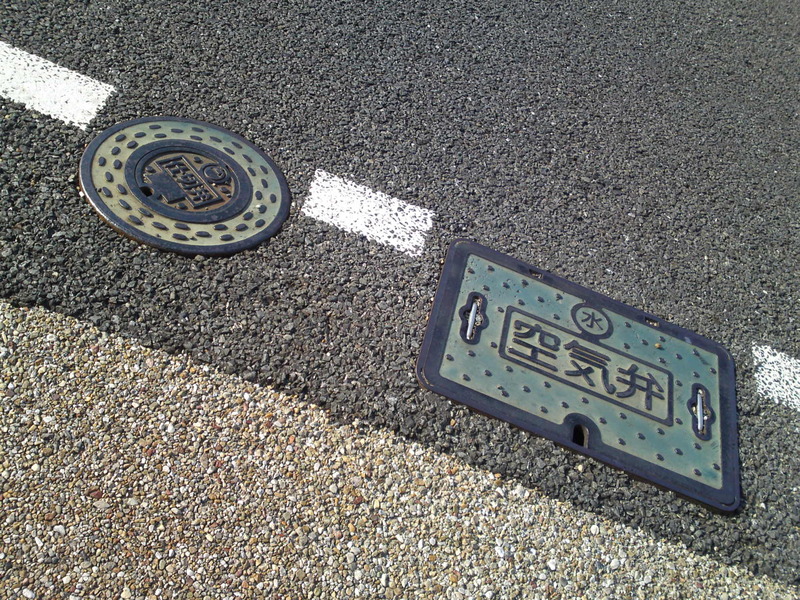 Similar typpe, but in Fujinomiya City! 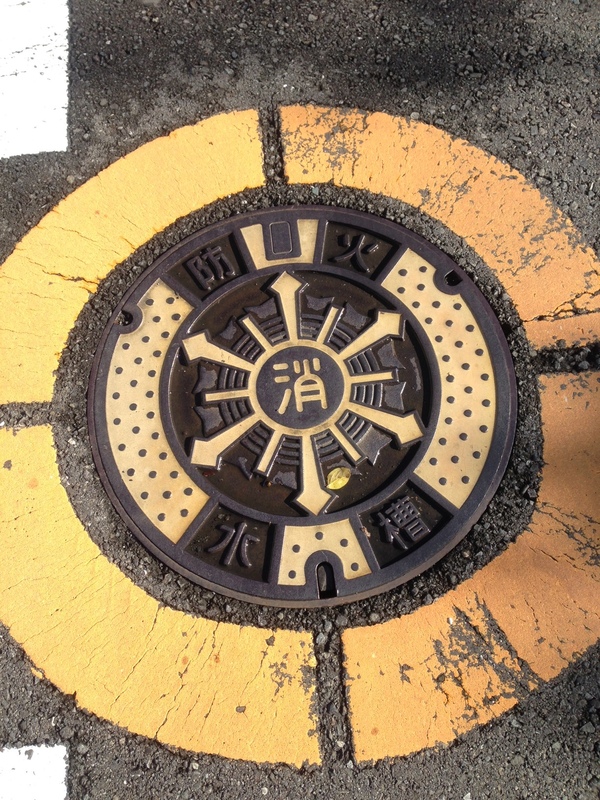 A smaller one in Yui, Shimizu Ku, Shizuoka City, but use clearly indicated by yellow paint circle! 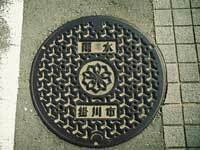 Rectangular fire hydrant manhole covers are also quite common but a second look will tell you soon enough that there are many differences in general motifs and city crests! 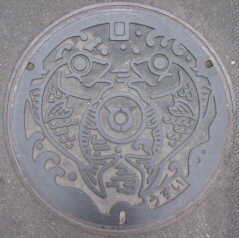 An ancient one in Shimada City! 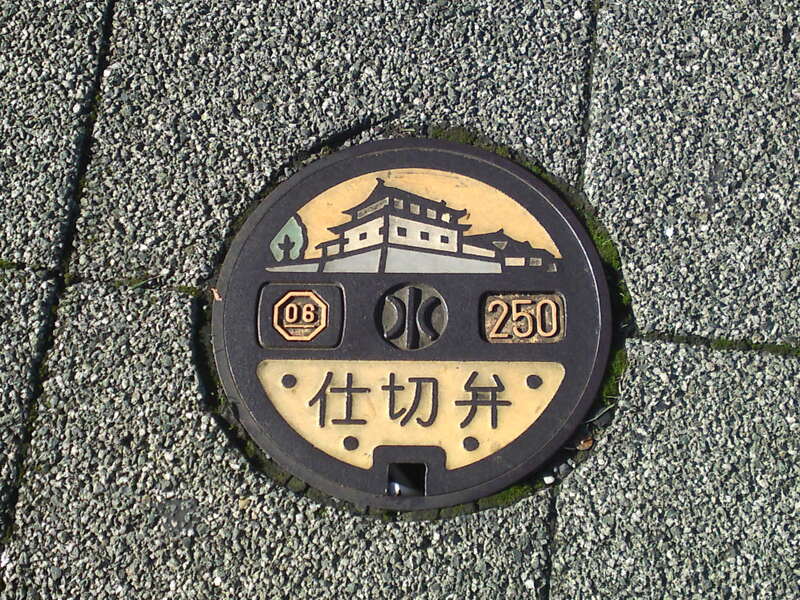 A smaller ancient one in Kikugawa City! 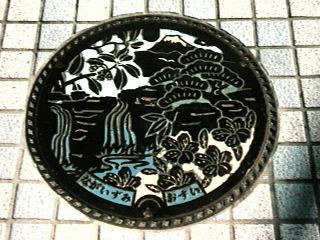 A manhole cover easy to find at night in Yui, Shimizu Ku, Shizuoka City! 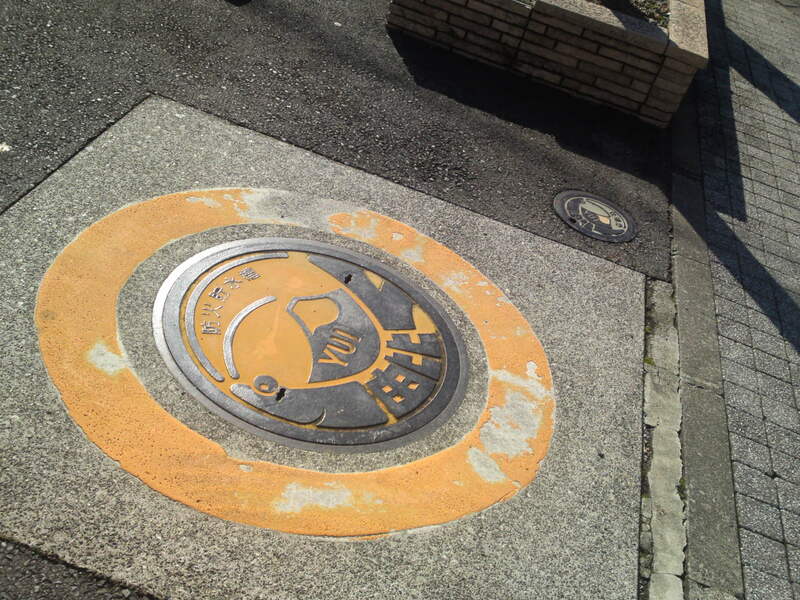 Found in Okabe, now merged into Fujieda City! 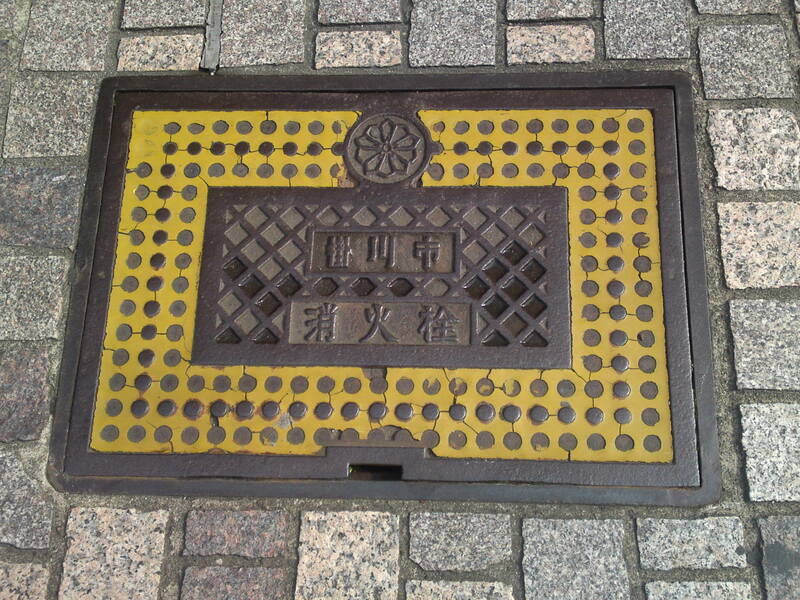 Found in Kikugawa City, but still bearing “Kikugawa Cho” as it was called before being upgraded to city level! 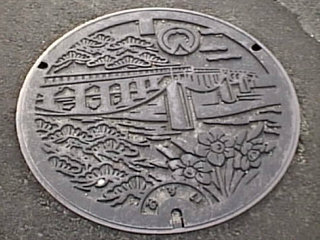 There are also quite a few types in Kakegawa City which saw so many vilages merged into the city! 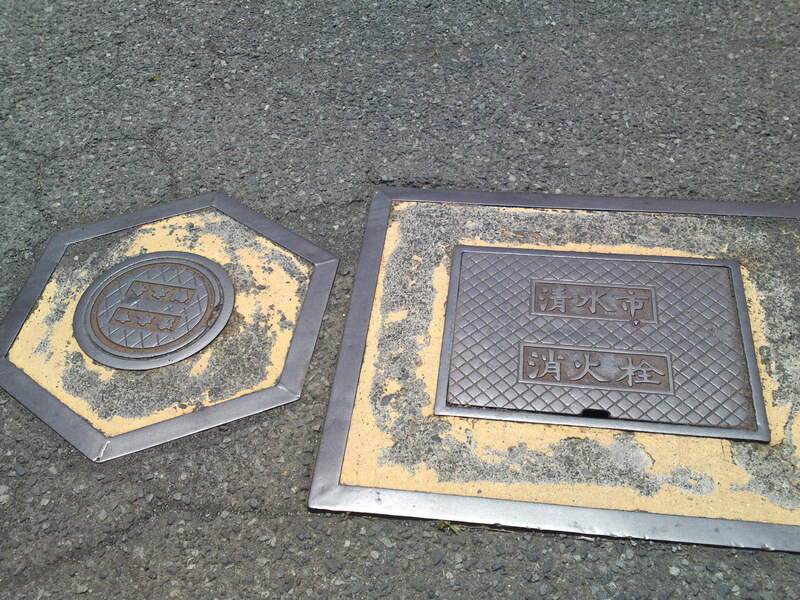 Similar as above but smaller in Kakegawa City! 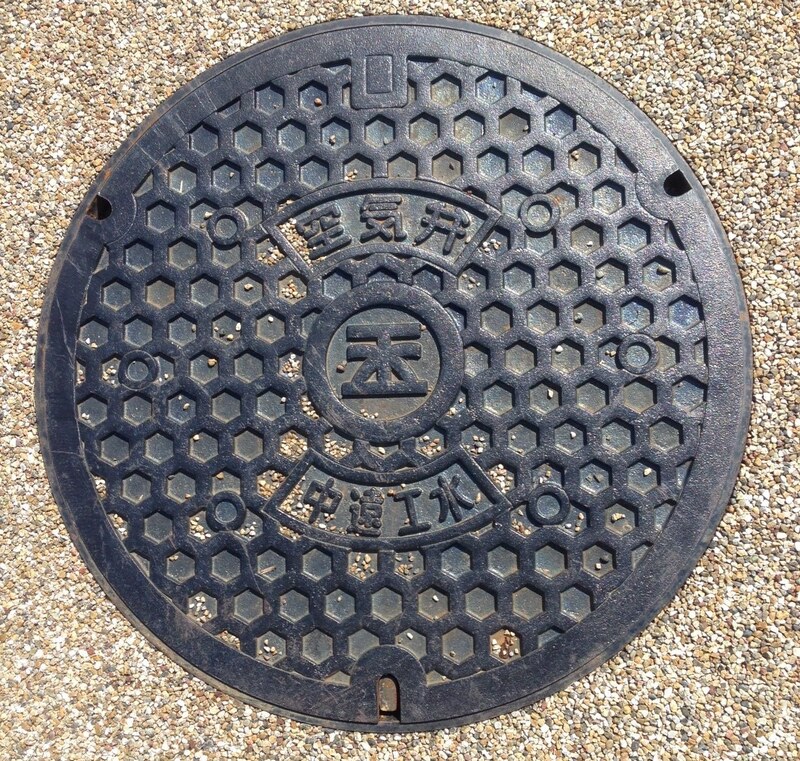 A different type in Kakegawa City! 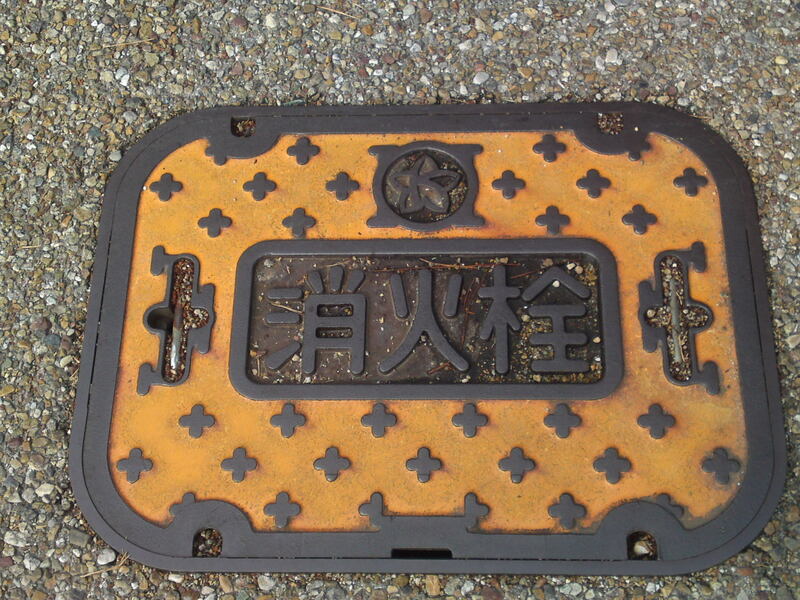 Still a different type in Kakegawa City, but far more ancient! 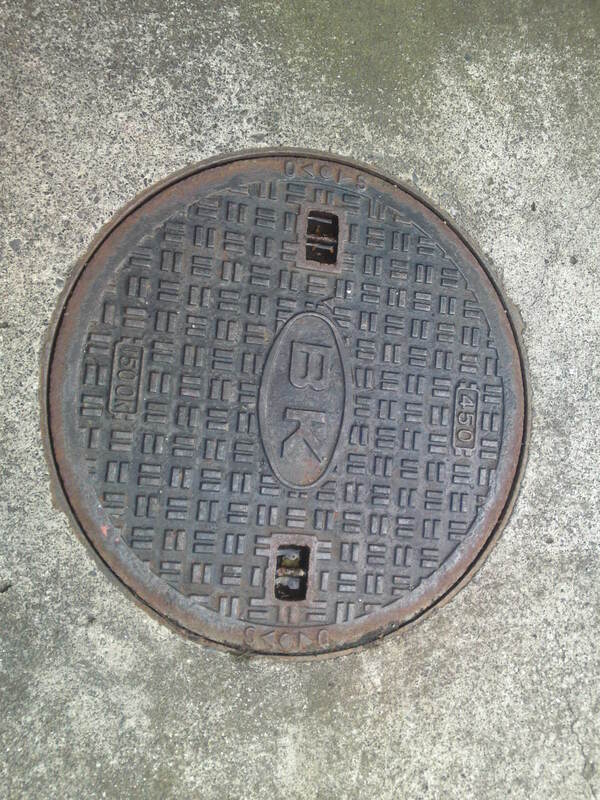 Found in Atami City, although it is a type found elsewhere! 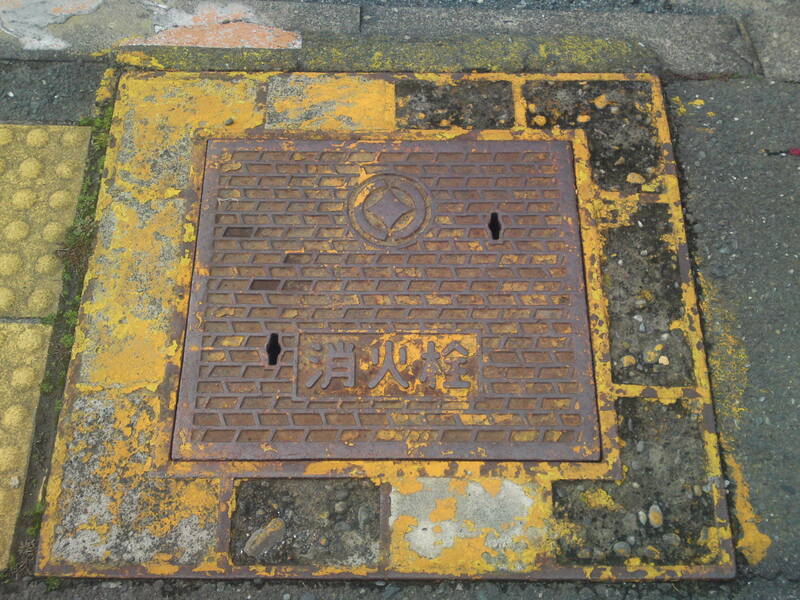 Such rectangular manhole covers cut with a diagonal line are not very common and might denotate a different foundry! 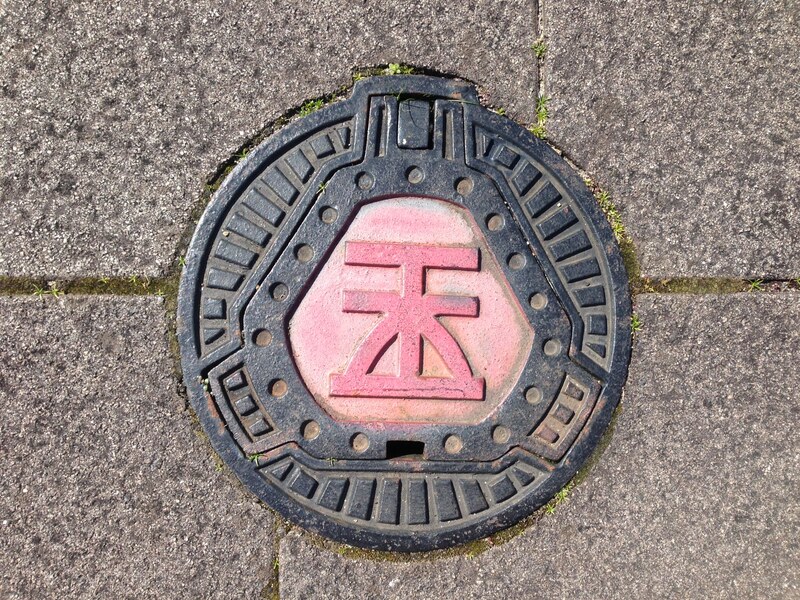 Found in Shimizu Ku, Shizuoka City! 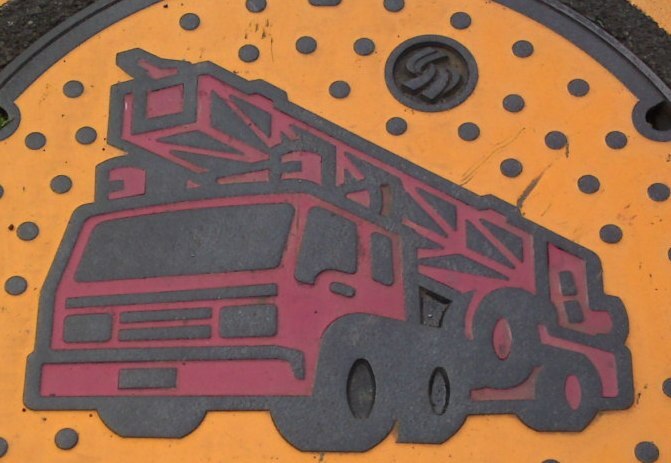 Fire Truck in Hamamatsu City! 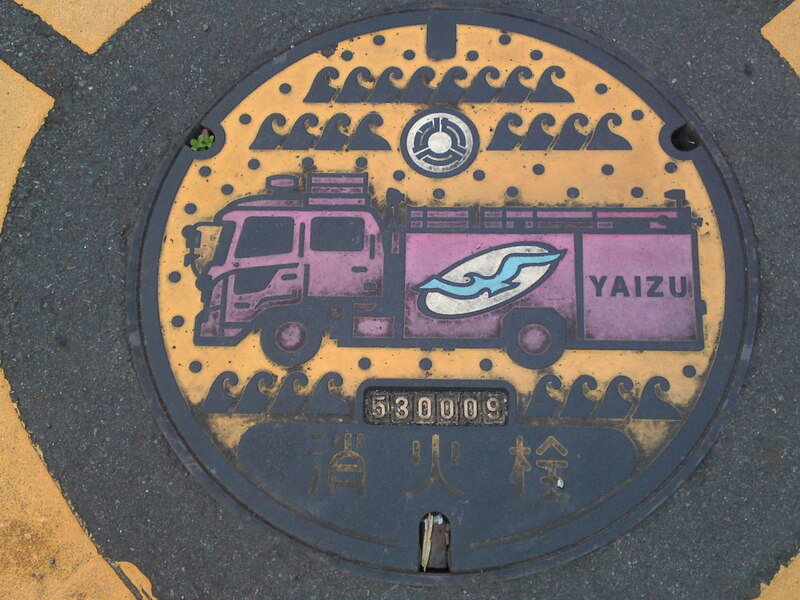 Fire truck in Yaizu City! 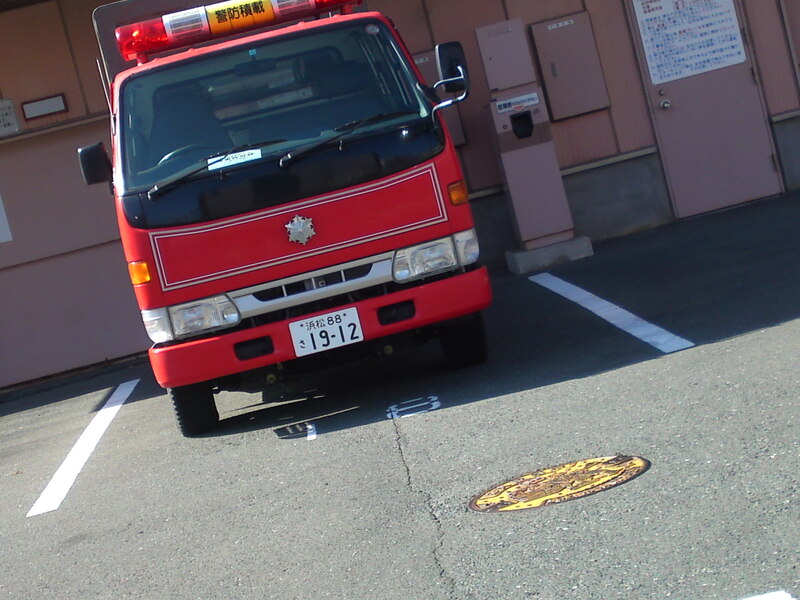 Fire truck and fire fighter in Mikkabi, Hamamatsu City! 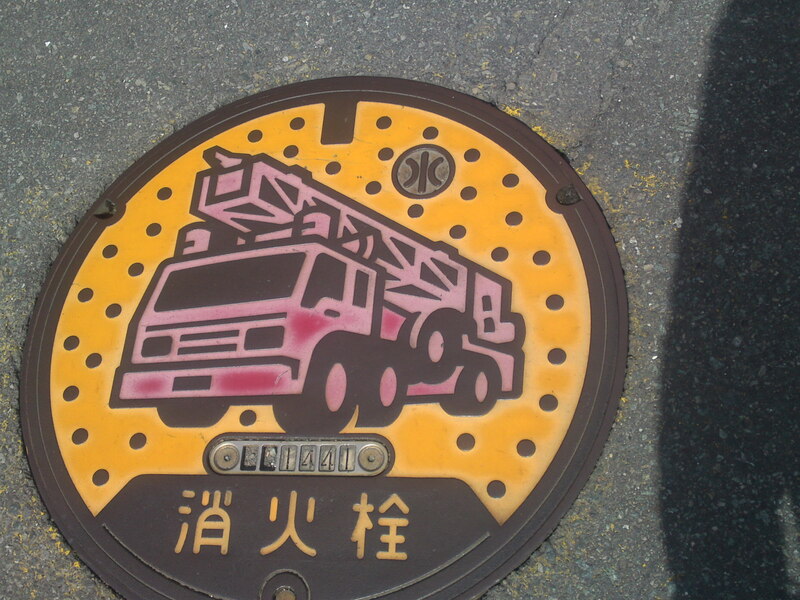 Fire truck in Iwata City! 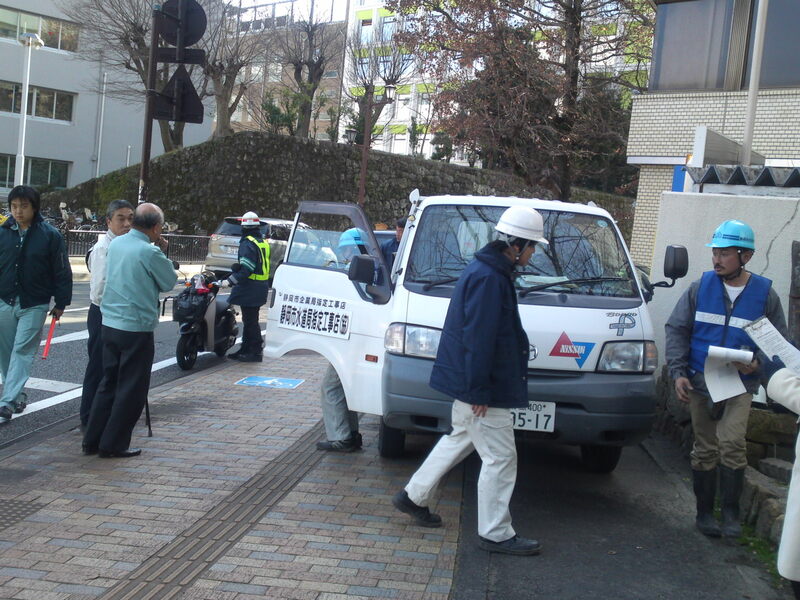 Fire truck and fire fighter in Hamamatsu City! 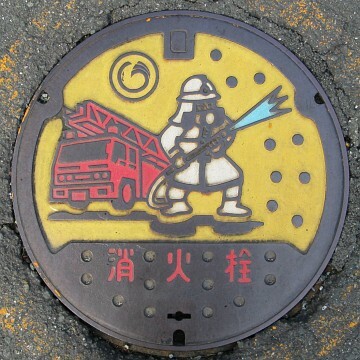 Fire fighter in Tenryuu, Hamamatsu City! 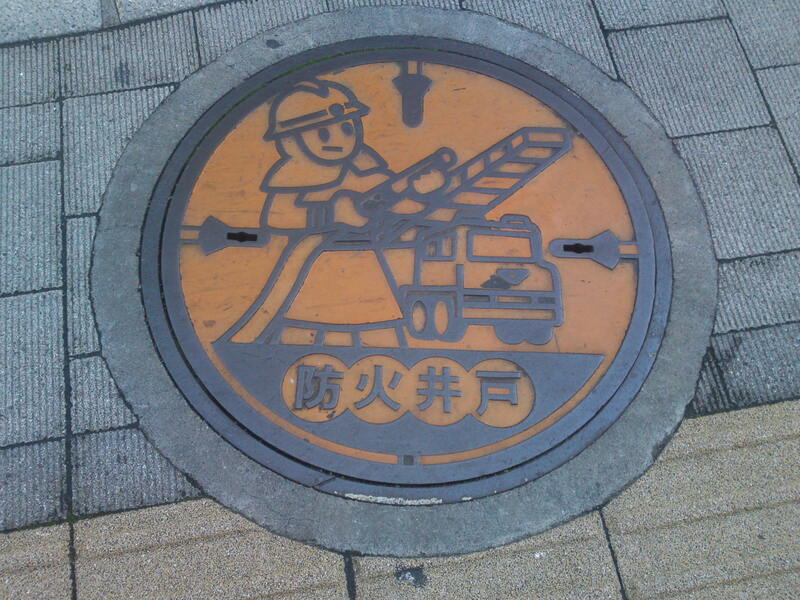 Fire truck and fire fighter in Okitsu, Shimizu Ku, Shizuoka City! 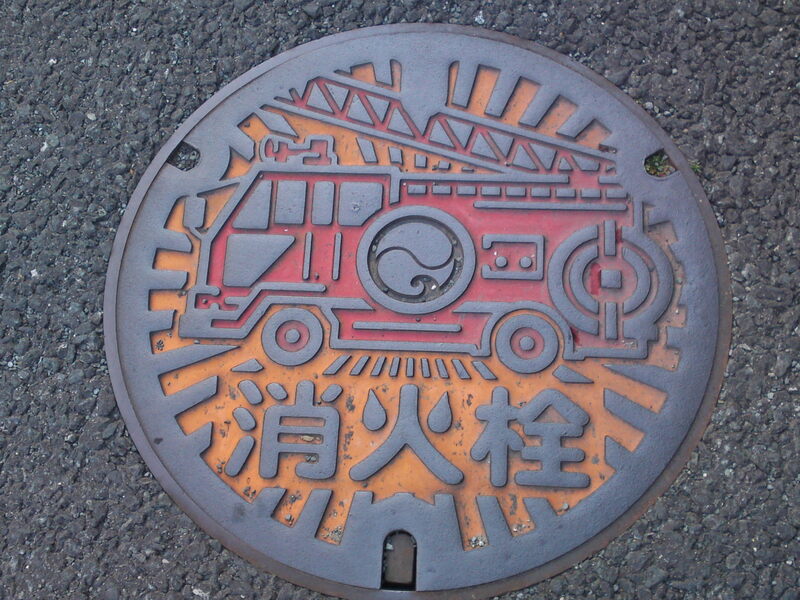 Fire truck and fire fighter in Shizuoka City! 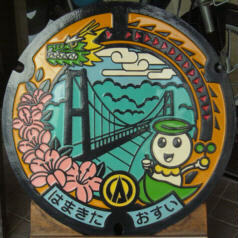 Fire Brigade Festival Hapi/jacket in Yaizu City! 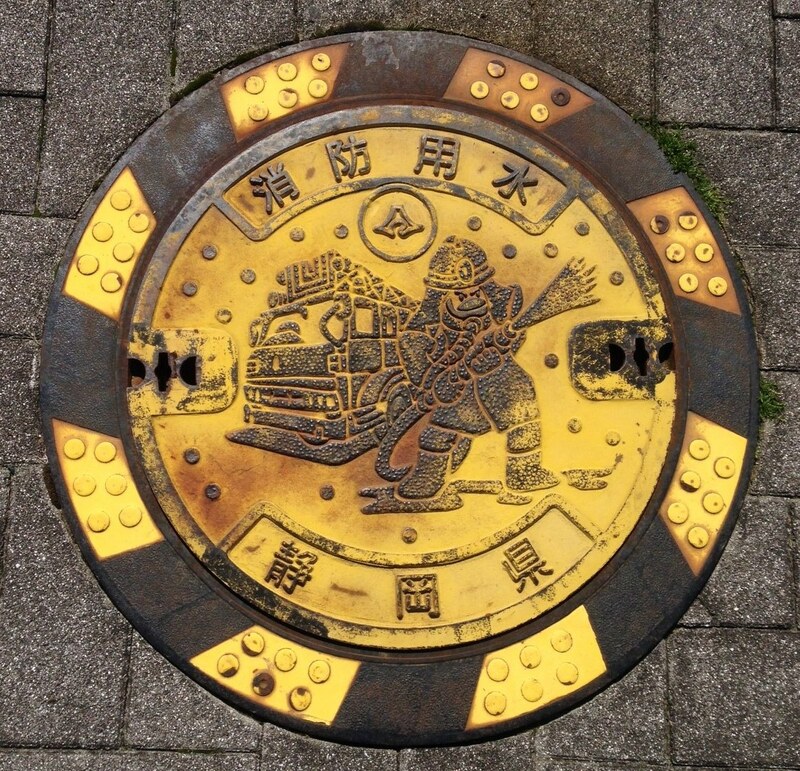 fire brigade festival pole in Shizuoka City! 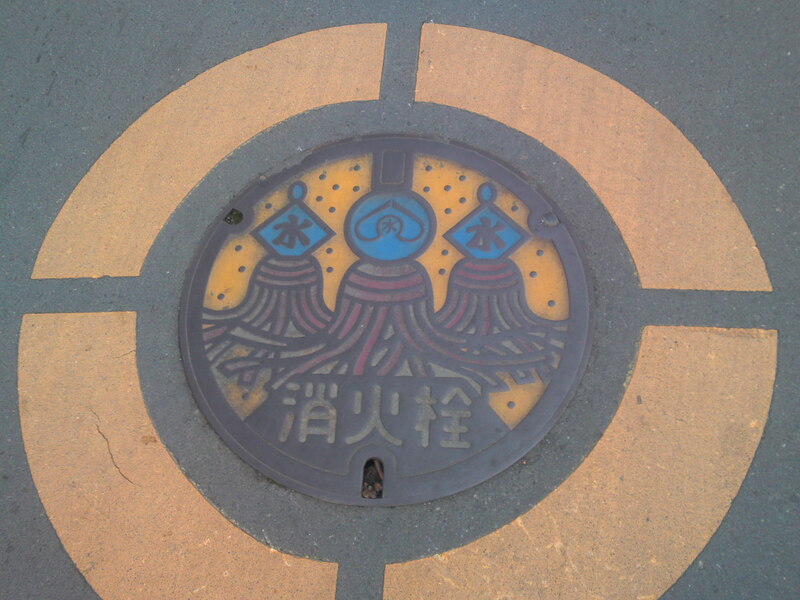 Fire brigade triple festival pole in Mariko, Suruga Ku, Shizuoka City! 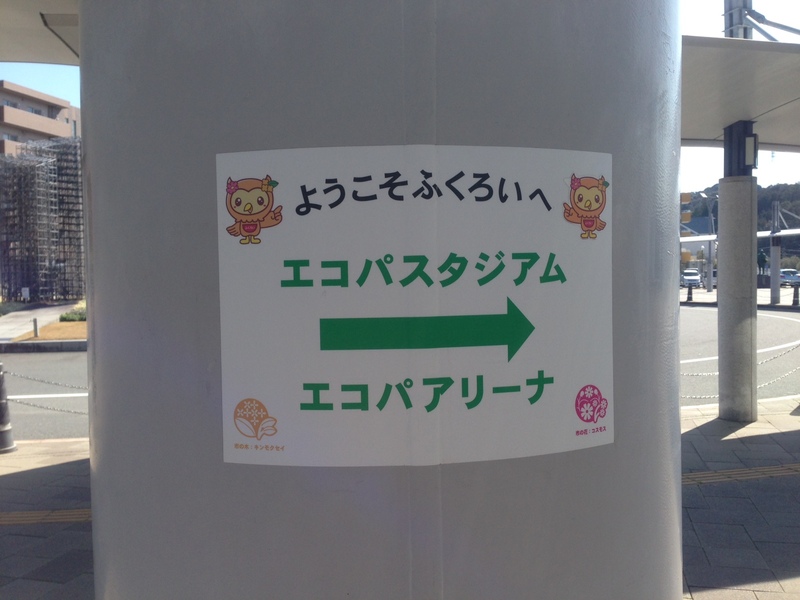 Fire brigade festival pole in Itoh City! 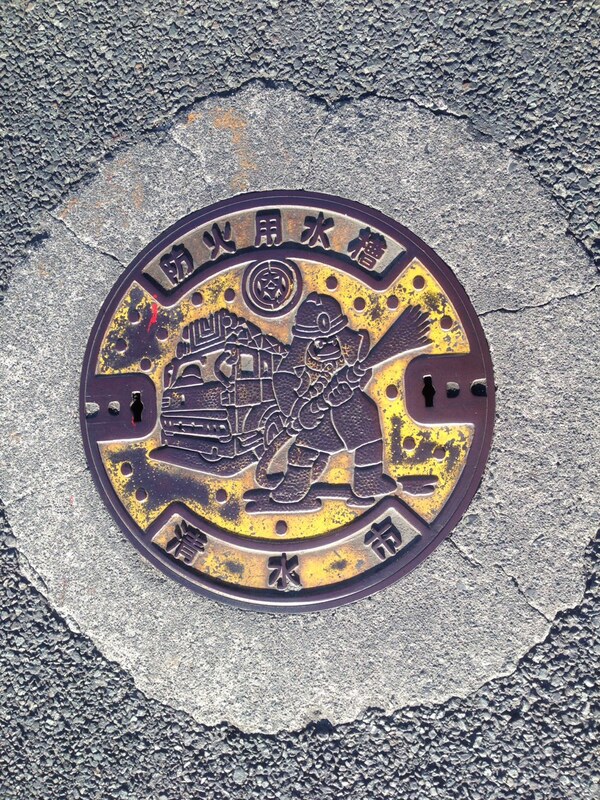 Fire brigade festival pole in Higashi Izu Cho! 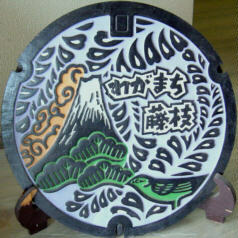 Kaguyahime (The bamboo Cutter’s Daughter Legend) and Mount Fuji in Yoshiwara, Fuji City! 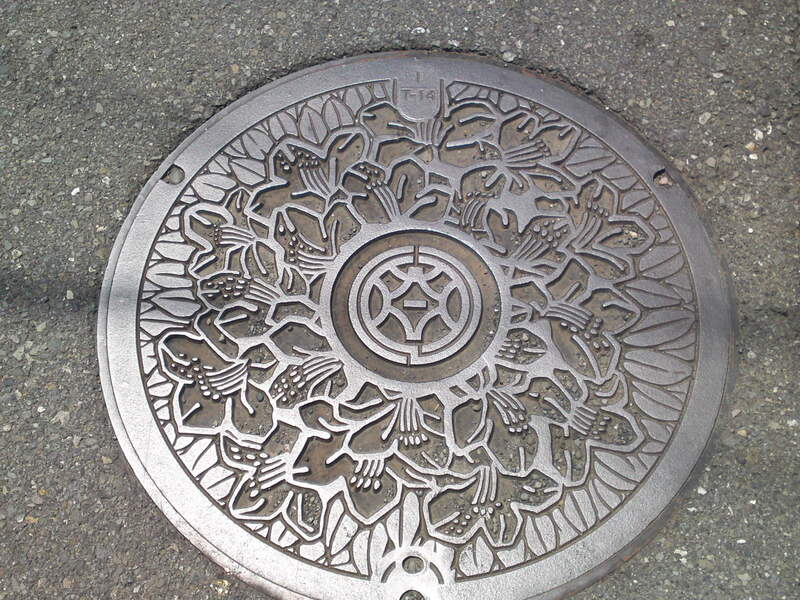 Arguably the most beautiful manhole cover in Japan! 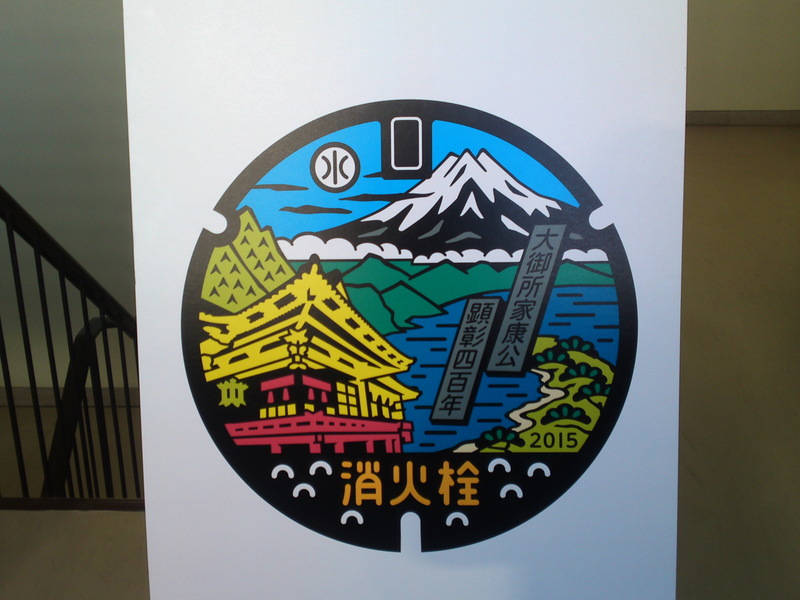 400th Anniversary of Sumpu Castle in Shizuoka City, with Abe River and Mount Fuji! 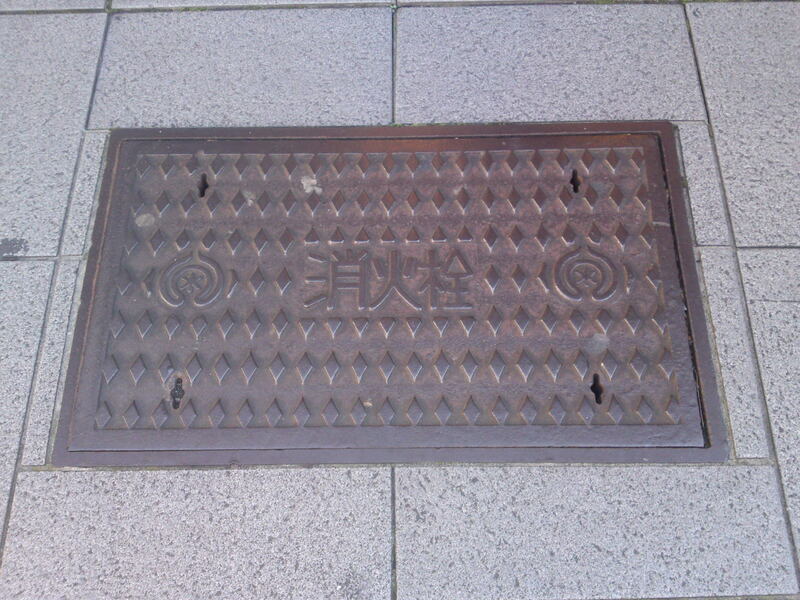 A rare dated (2007) manhole cover in Japan! 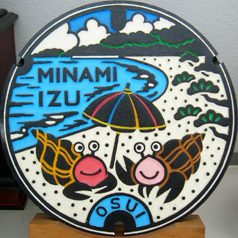 Sakura Ebi/Cherry Shrimp and Mount Fuji in Yui, Shimizu Ku, Shizuoka City! 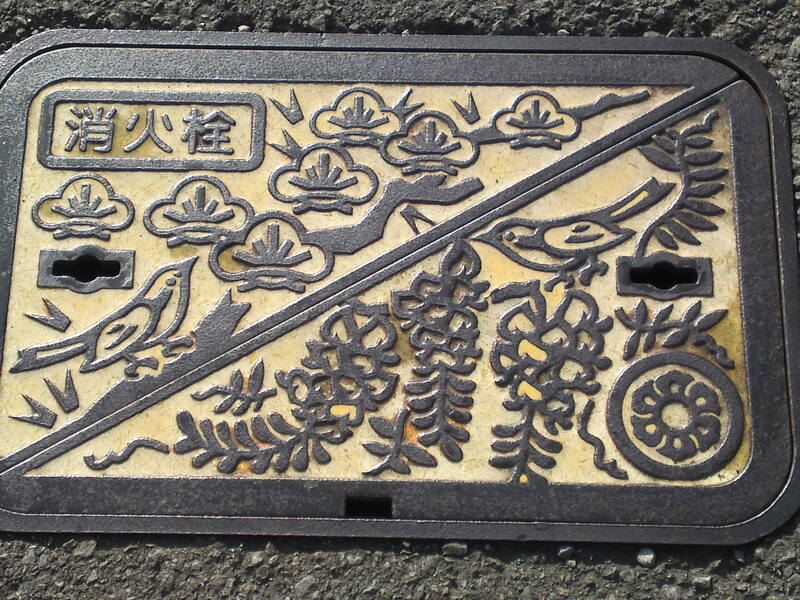 Cherry blossoms, wisteria blossoms and mejiro warbler in Fujieda City! 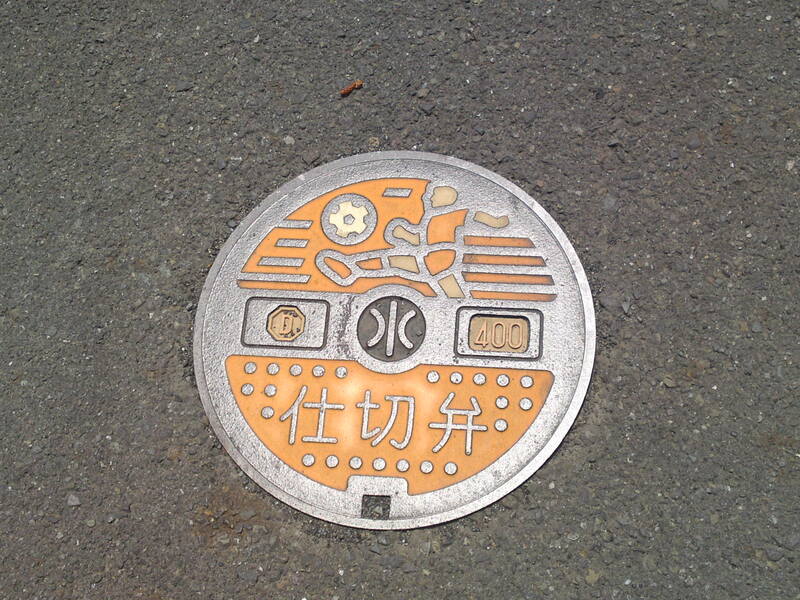 Soccer in Shimizu ku, Shizuoka City! 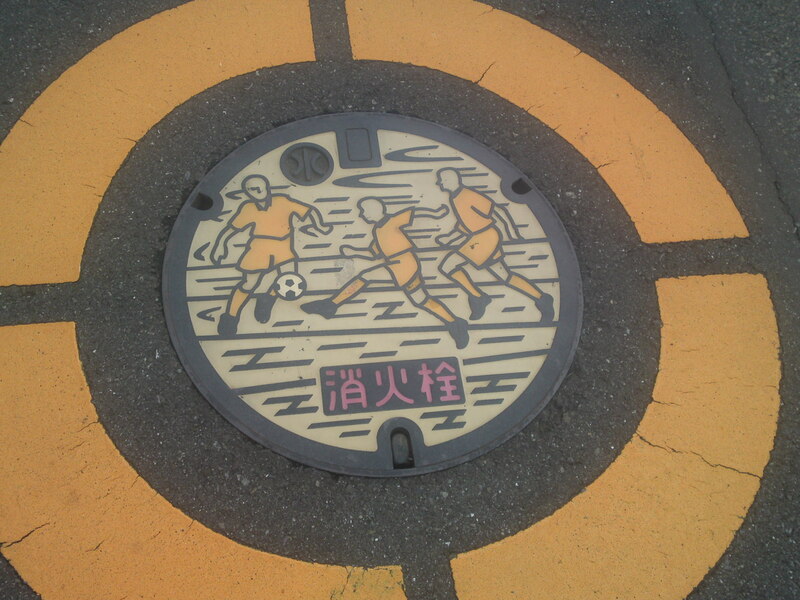 Soccer again in Shimizu ku, Shizuoka City! 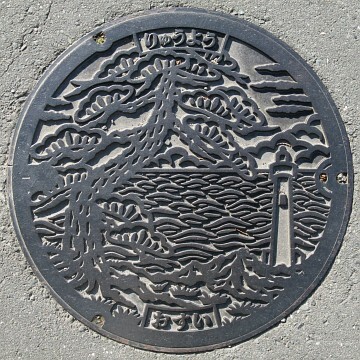 The mint Manhole Cover in Shimizu City before it was merged in Shizuoka City depicting the World Cultural Heritage of Mount Fuji and Miho Matsubara Beach! 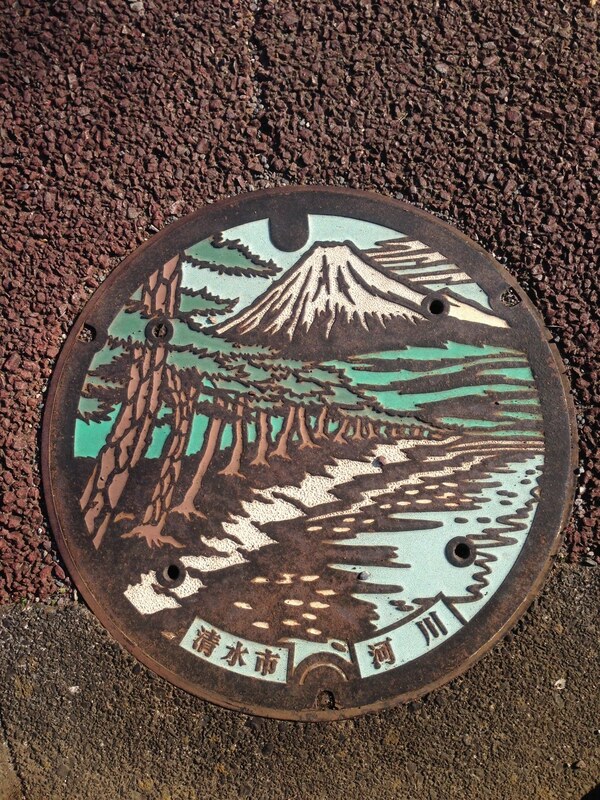 Mount Fuji is partly in Shizuoka Prefecture as many in Yamanashi Prefecture will rightly if somewhat insistently point out, but we also have the Miho Matsubara beach which is included in the World Cultural Heritage! 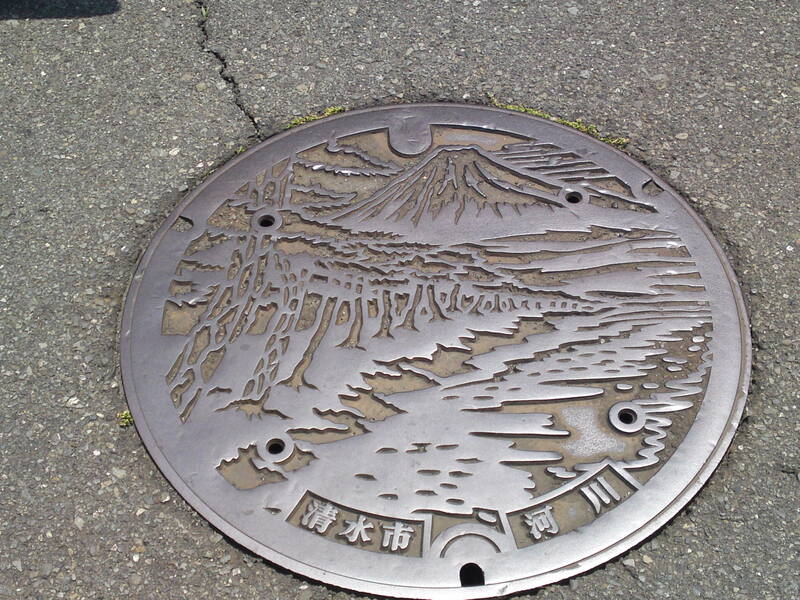 Mind you, I will be extremely happy to add Mount Fuji manhole covers from Yamanashi prefecture anytime if someone is kind enough to send them to me! 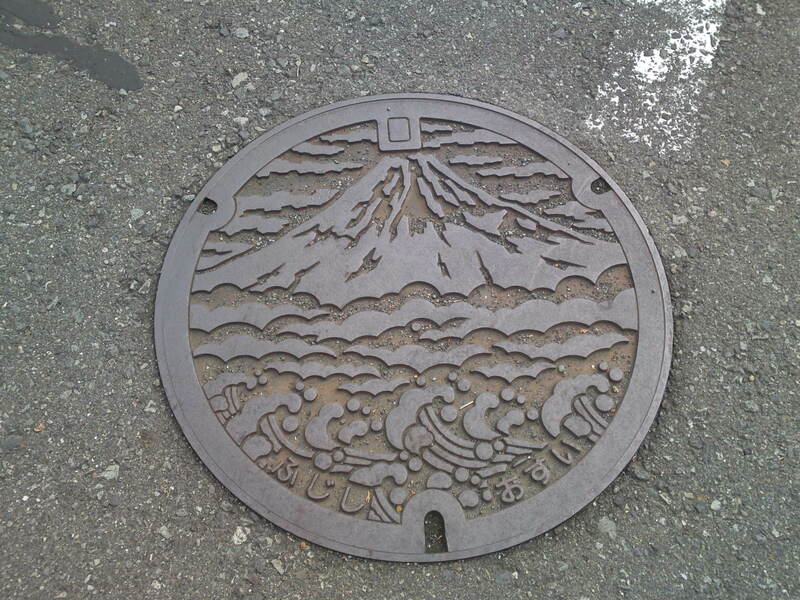 As for people who think that Mount Fuji lies in Kanagawa Prefecture or Tokyo, I’m sorry to disappoint them although they also have the cahnce to see it on bright days! 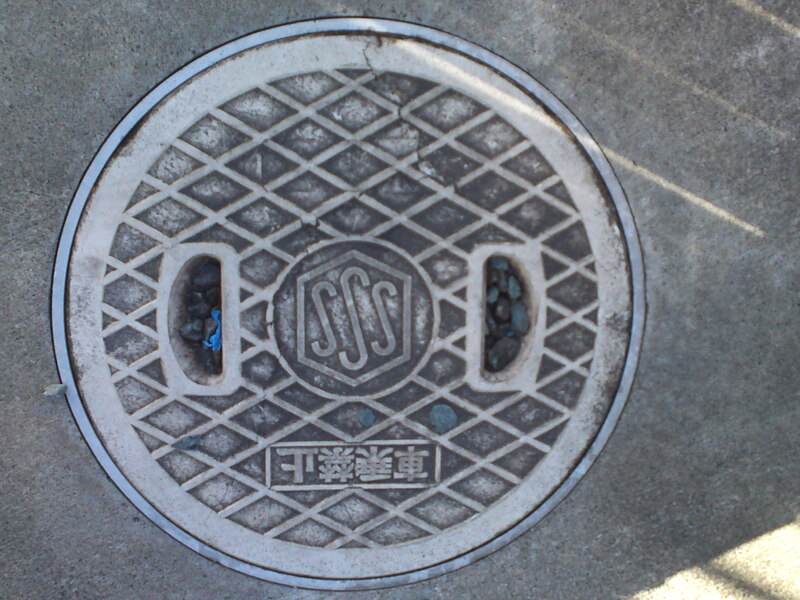 The same found in Sodeshi, Shimizu Ku, Shizuoka City! 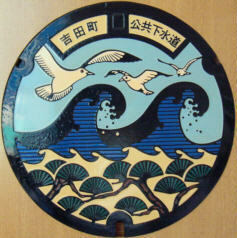 The same but for rain waters instead of river waters without the colors! 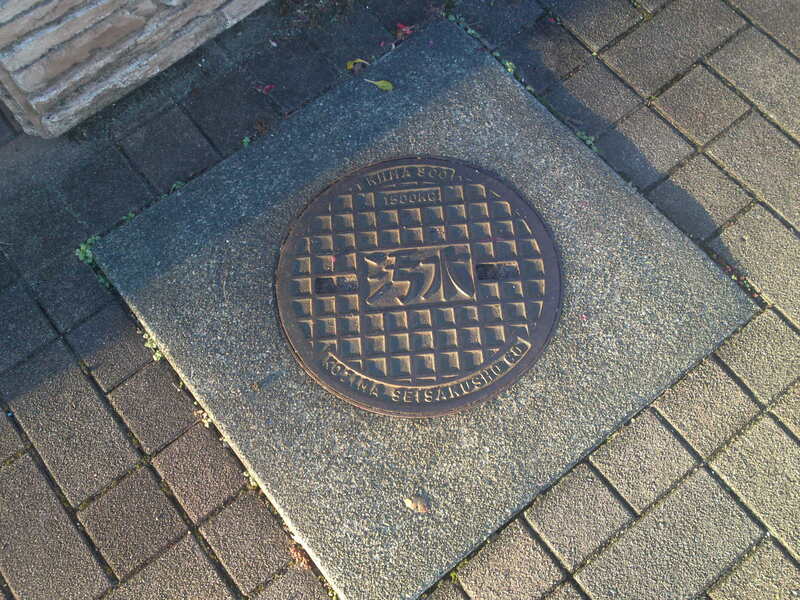 The same as above but with “Shizuoka City” instead of “Shimizu City”! 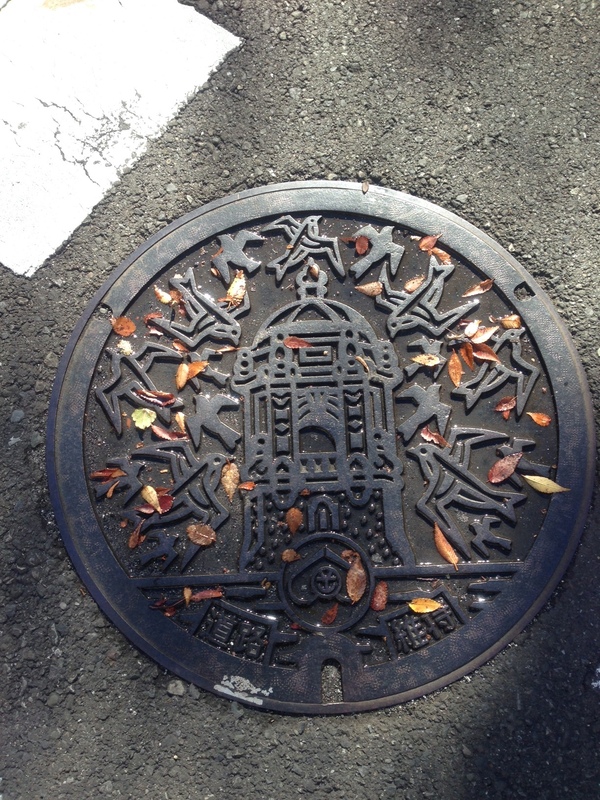 Found in many places in Shizuoka City! A rarity in a sense as it is dated in “2007”! 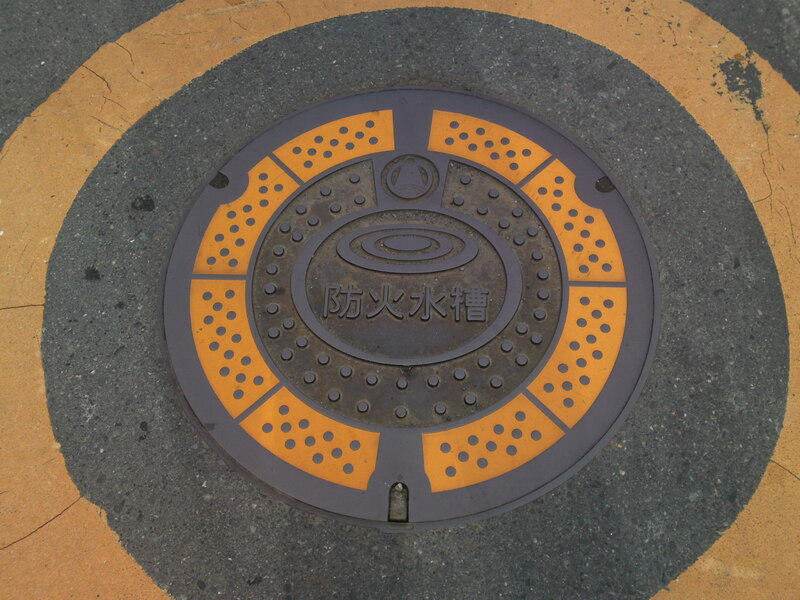 Also found a bit everywhere in Shizuoka City! 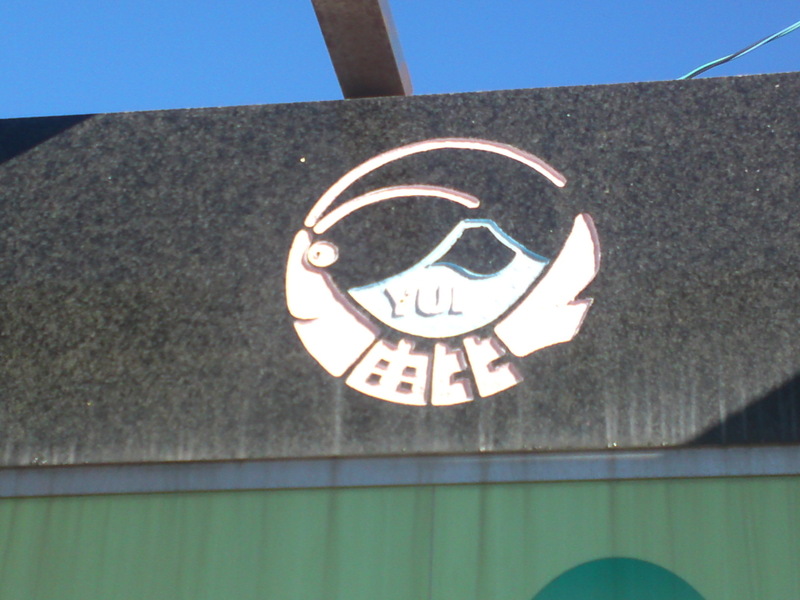 Found in Yui, Shimizu Ku, Shizuoka City! 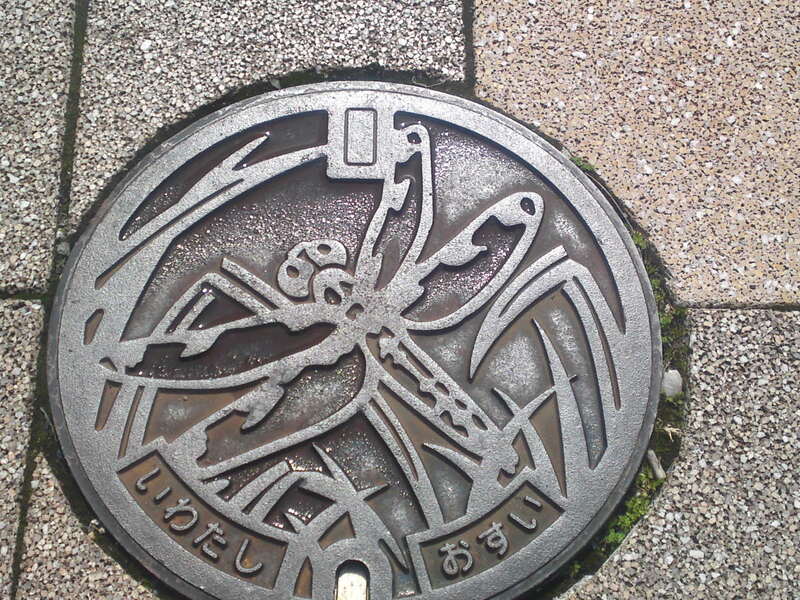 Note the sakura ebi design for which Yui is nationally known! 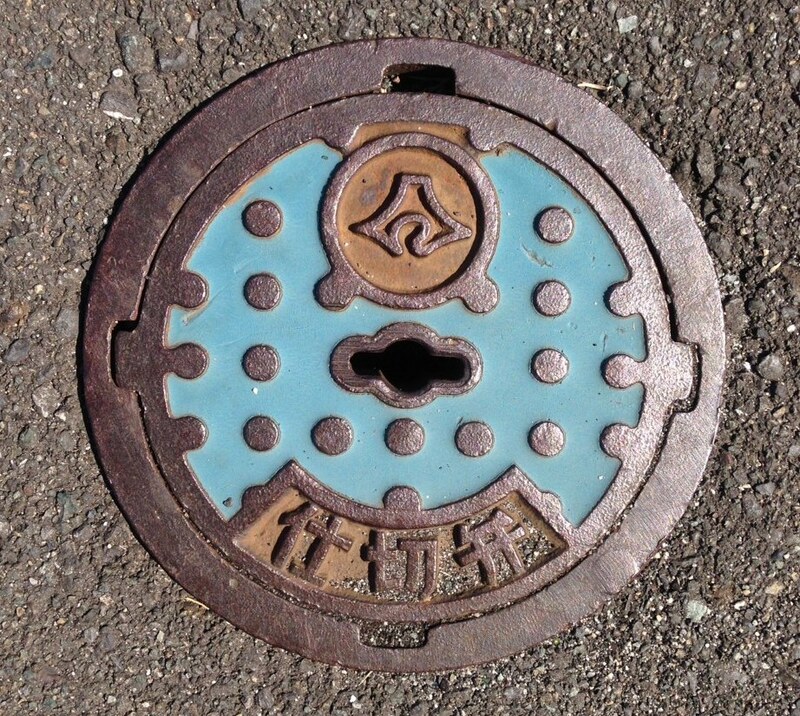 The same as above in blue! 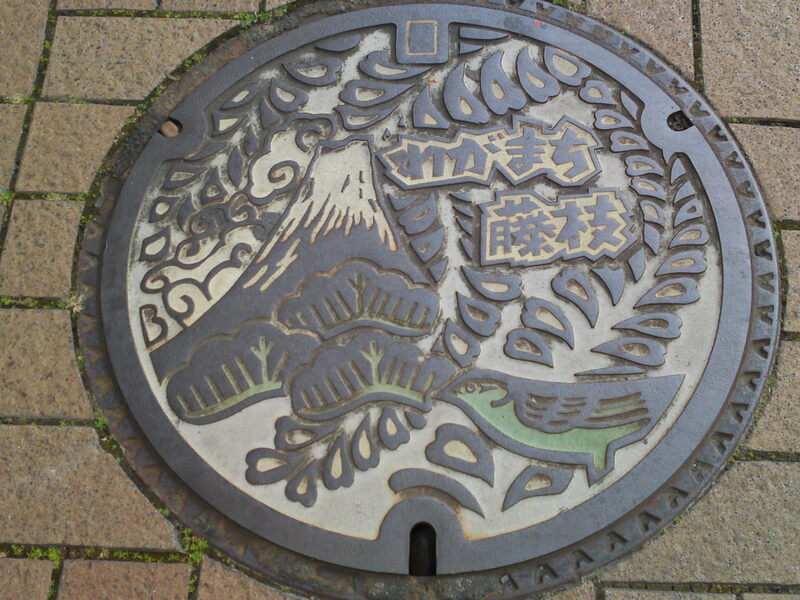 A beautiful mint manhole cover for Fuji City, a city named after Mount Fuji! 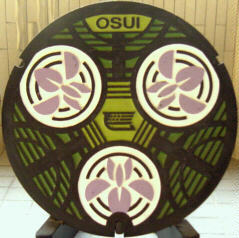 The same design but in different colors! The same without the colors! The same again, but half size! 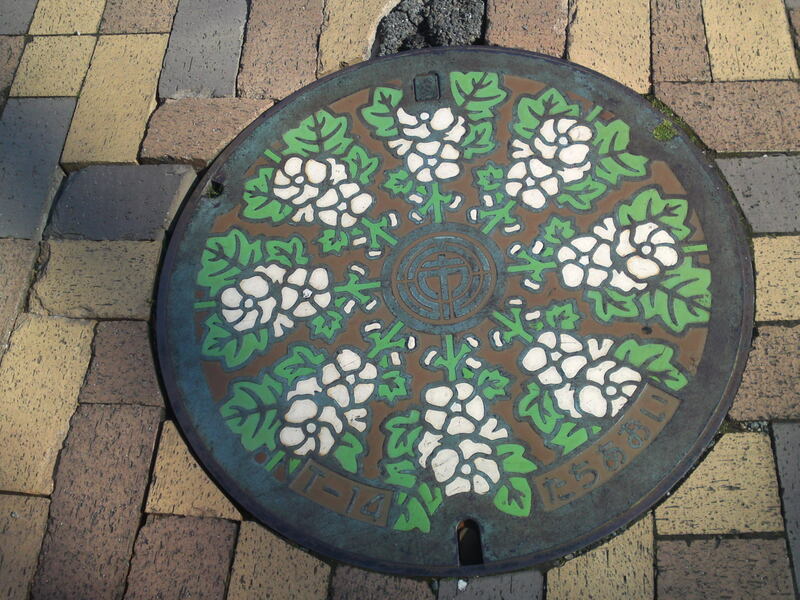 The same as a mint manhole cover but in different design and colors! 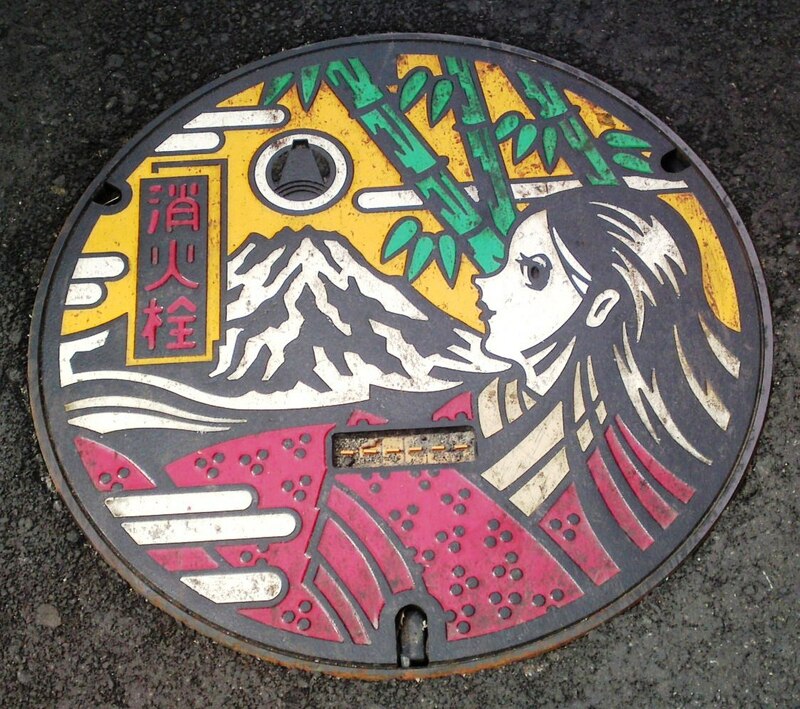 Arguably the most beautiful manhole cover in Japan found in Yaoshiwara, Fuji City, depicting Kaguyahime of the Legend, The Bamboo Cutter’s daughter! 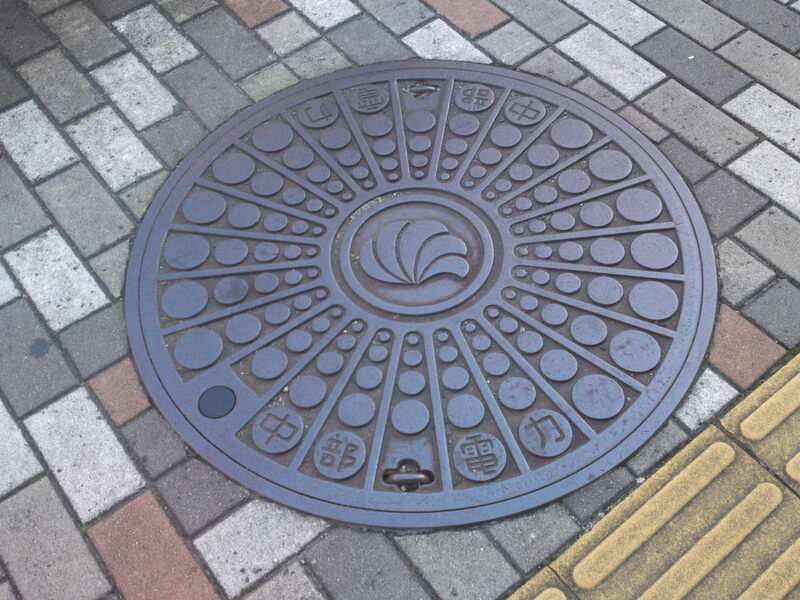 A beautiful mint manhole cover in Fujieda City! 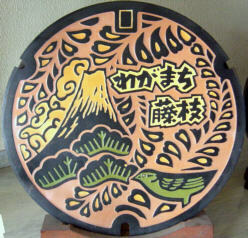 Although the City includes “Fuji/藤”, it means “Wisteria”, not “Mount Fuji/富士”! 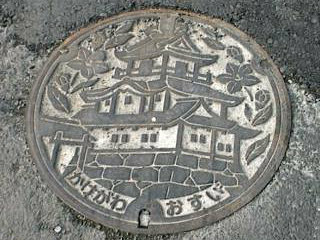 The same as found on a pavement in Fujieda city! Another mint of the same but in different colors! 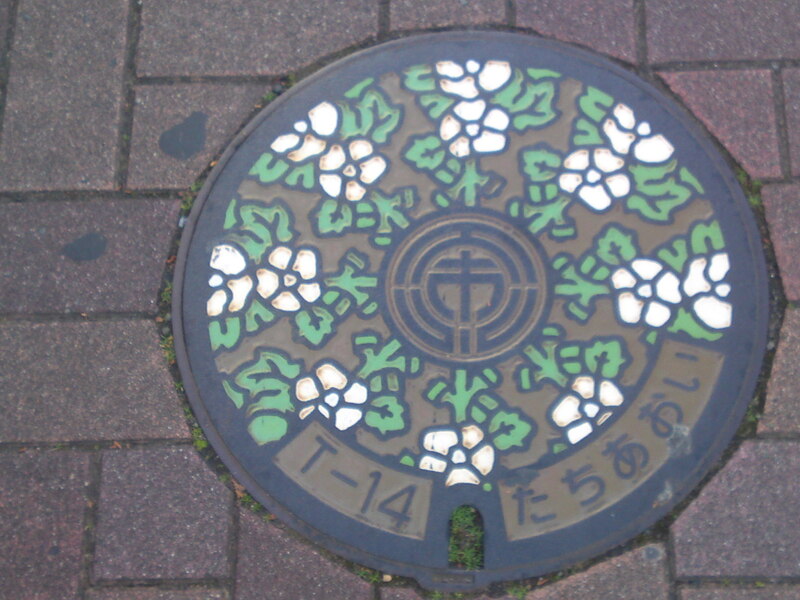 Beautiful mint in Shimizu Cho at the foot of Mount Fuji! 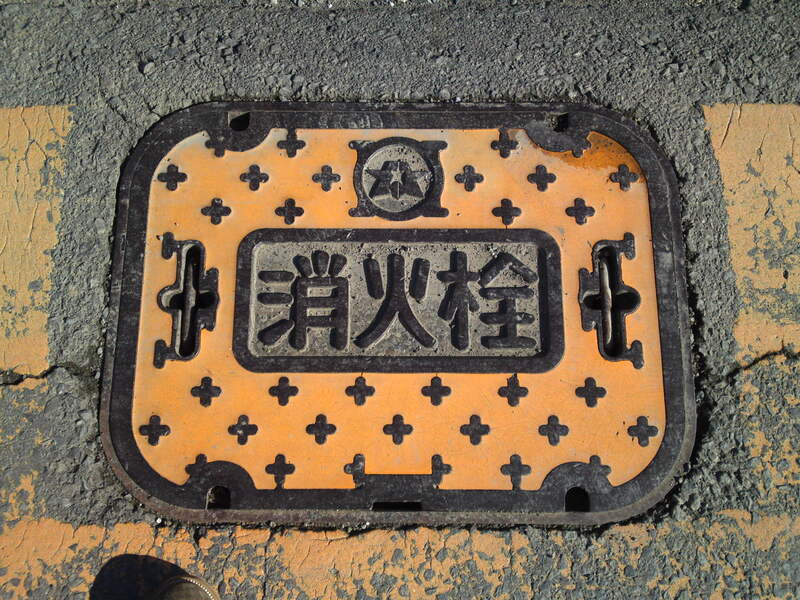 Not to be confused with Shimizu Ku in Shizuoka City! 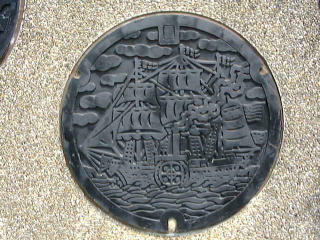 Found in Nirayama merged with Izu no Kuni City! Famous for the Hansharou Foundries and strawberries! 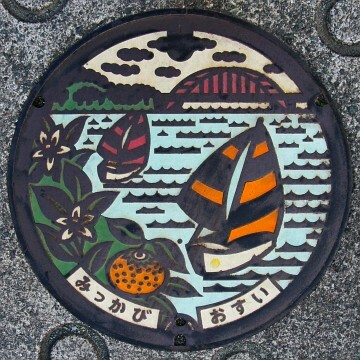 Beautiful mint manhole cover for Yaizu City, a fishing port city known all over Japan! 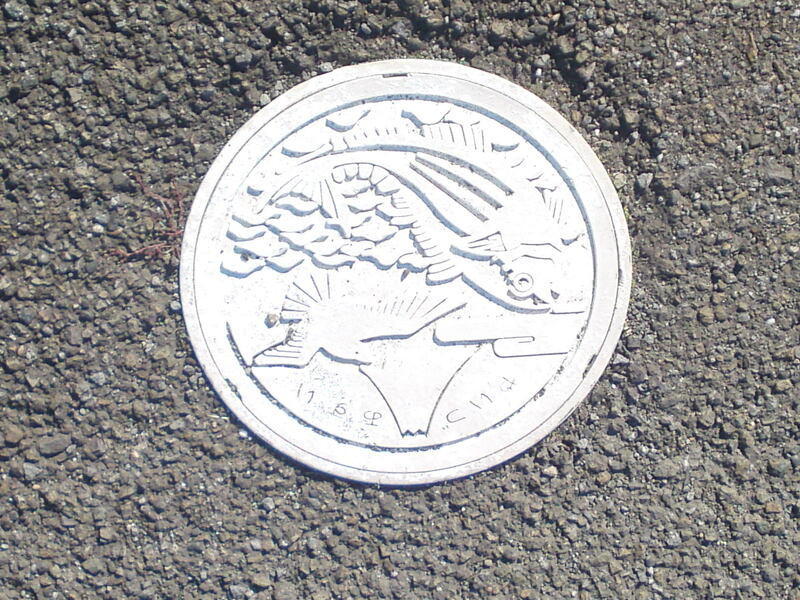 The same as found on a pavement in yaizu City! 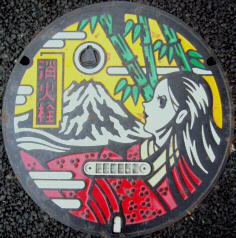 kaguyahime/The Bamboo Cutter Daughter, considered by many as the most beautiful manhole cover in Japan! 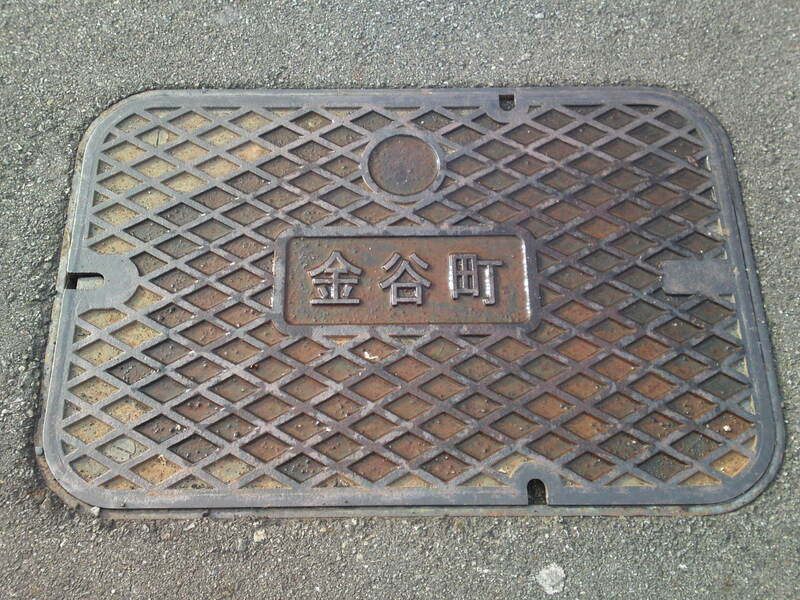 The same. 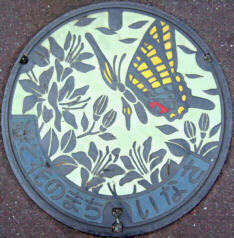 It is framed in yellow on the road to help firement find it at night as this is a fire hydrant manhole cover. 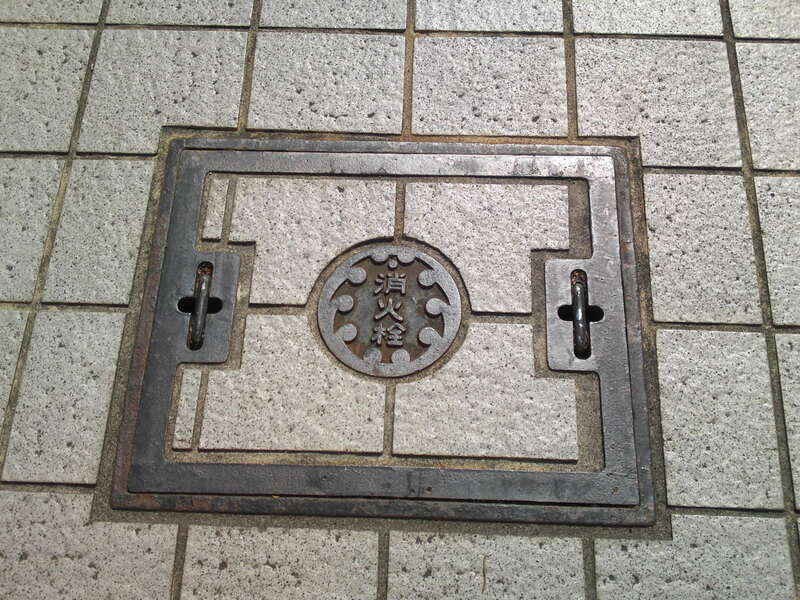 It is located in the middle of a narrow street at the bottom of Bishamonten Myoyouji Temple. Apparently there is only one sample! 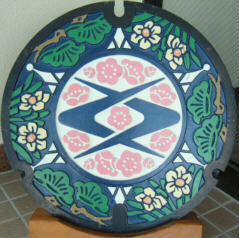 It was made when before Yoshiwara was merged with Fuji City as demonstrated by the crest! 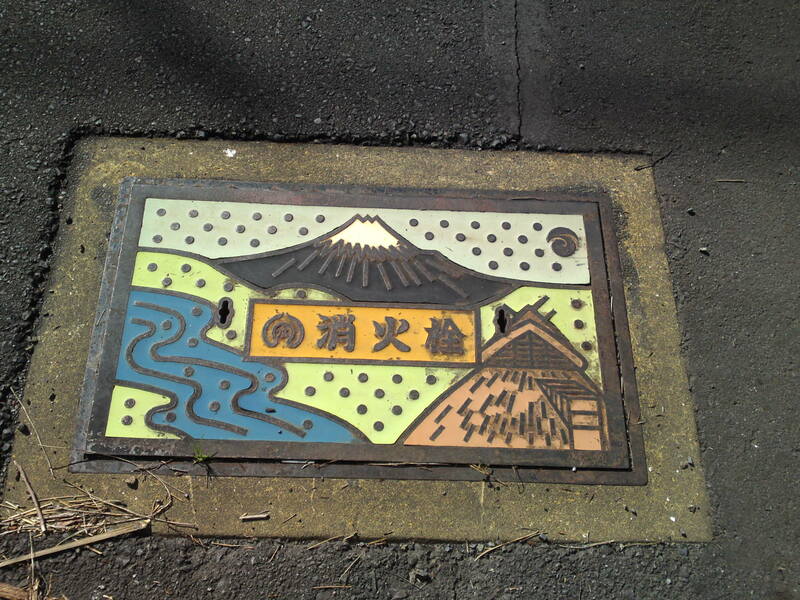 Mount Fuji water access manhole cover! 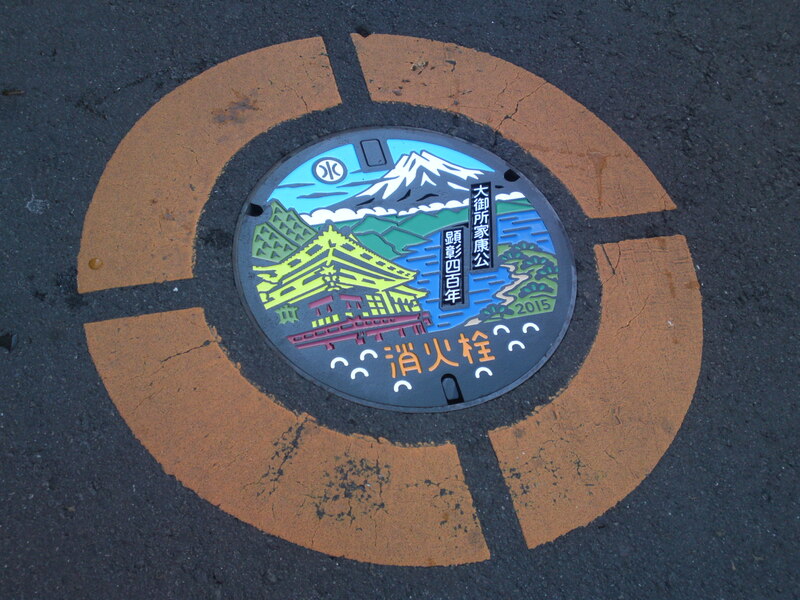 This was installed after Yoshiwara was merged with Fuji City! 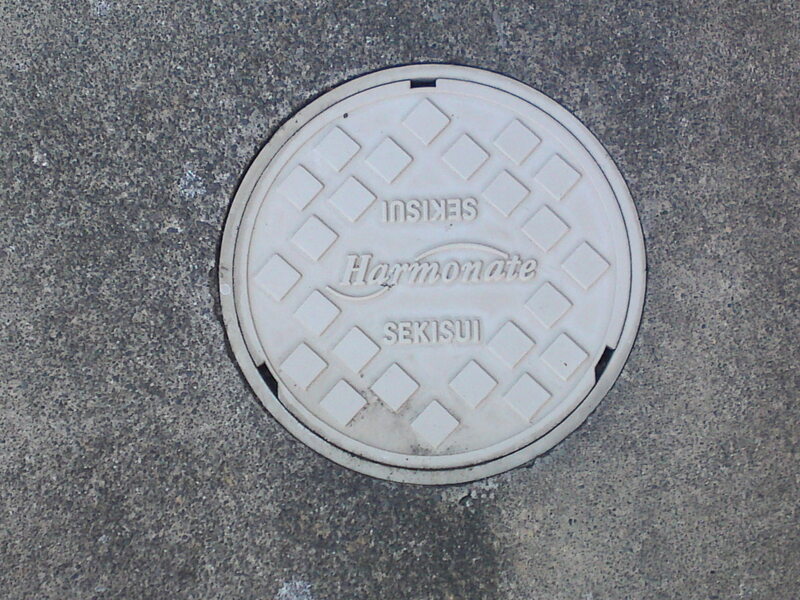 The same as above but half size! 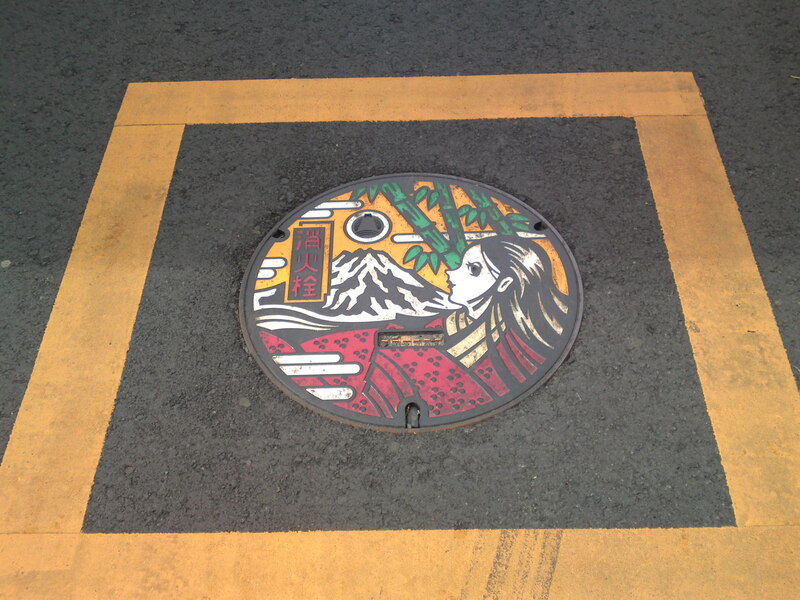 A large Yoshiwara fire hydrant manhole cover! 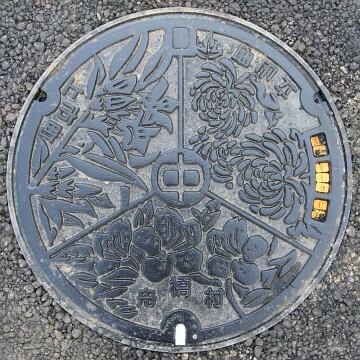 Another double Yoshiwara fire hydrant manhole cover of a dufferent design! 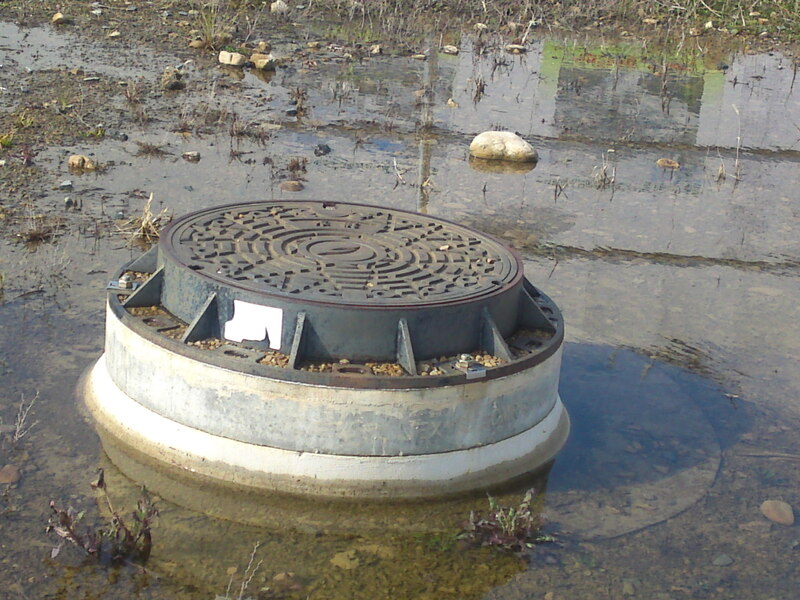 A similar fire hydrant, but single and over a water tank access! 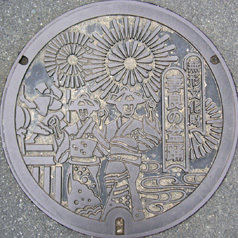 An older Yoshiwara rectangular fire hydrant manhole cover! 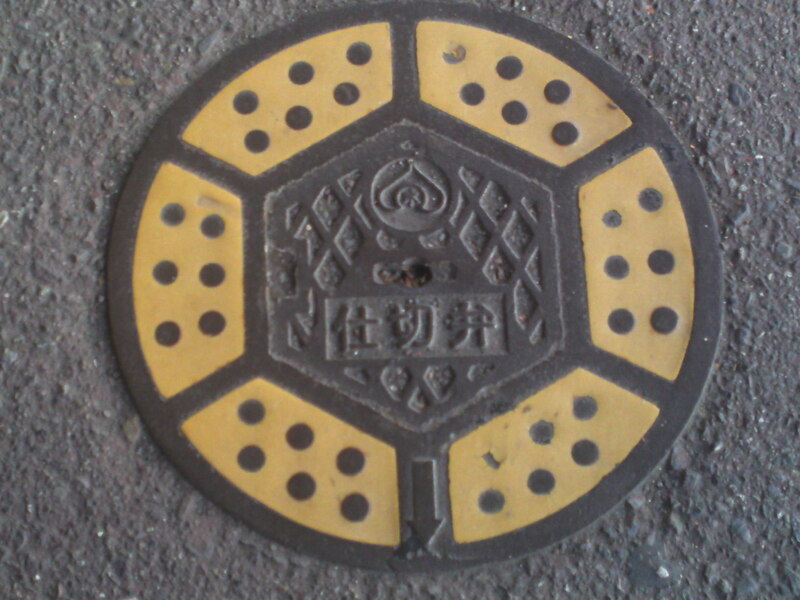 An old small Yoshiwara valve pit manhole cover! 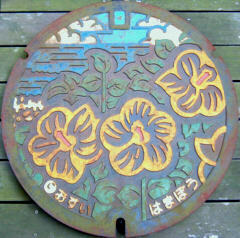 Another small Yoshiwara valve pit manhole cover with a totally different design! 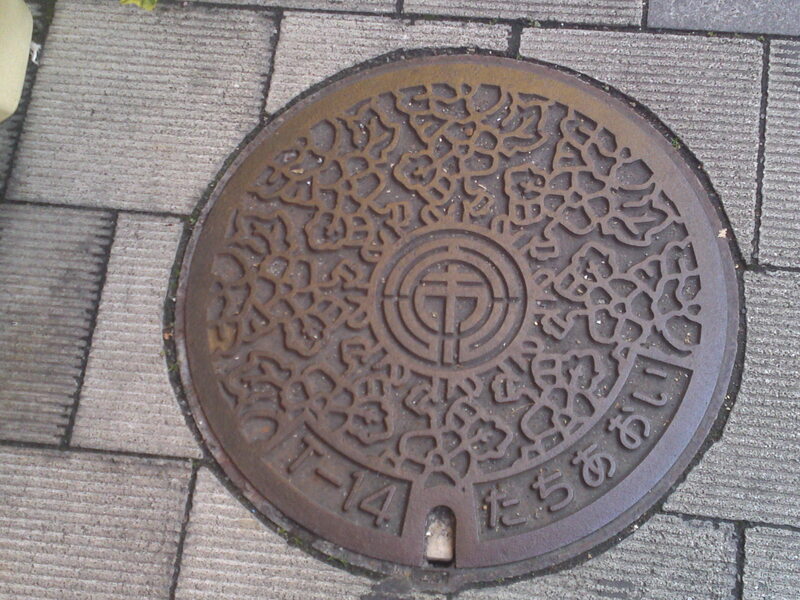 A very old ans small water access Yoshiwara manhole cover! 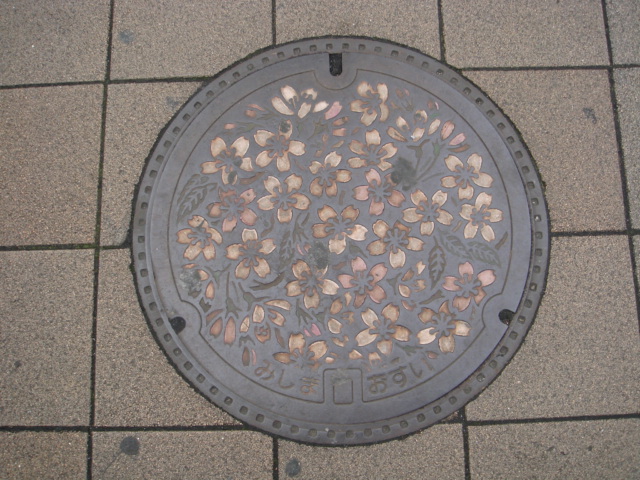 Beautiful mint Fujieda City manhole cover! 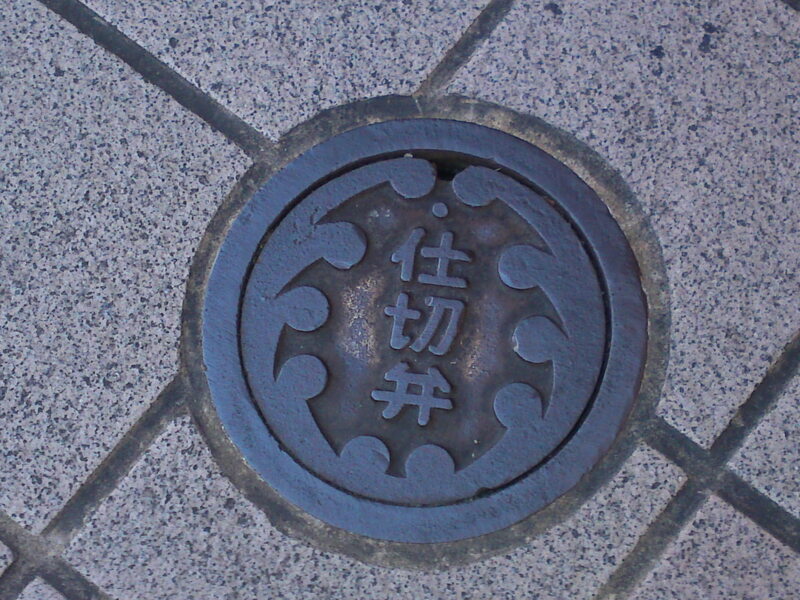 The same, a bit old, near Fujieda JR Station south exit! Another beautiful mint with a different background color! 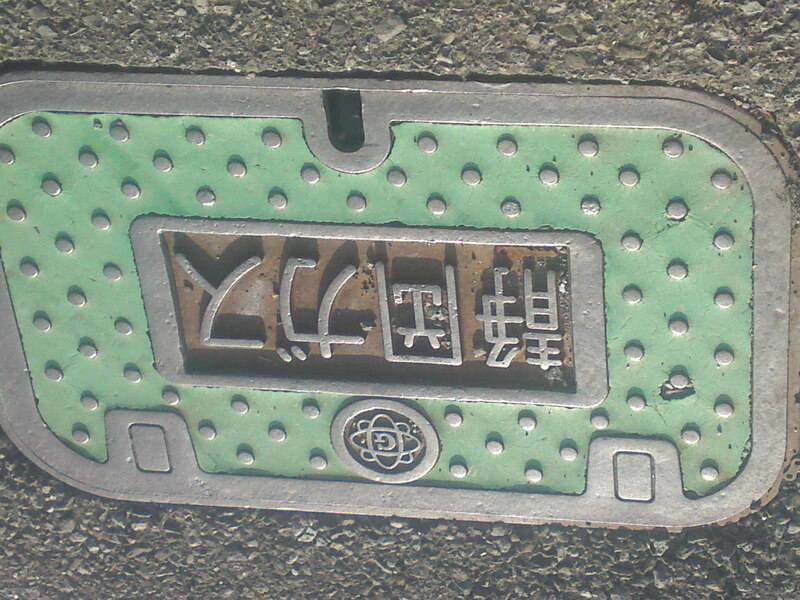 The same again, a bit old, near Fujieda JR Station south exit! The same, without the colors! 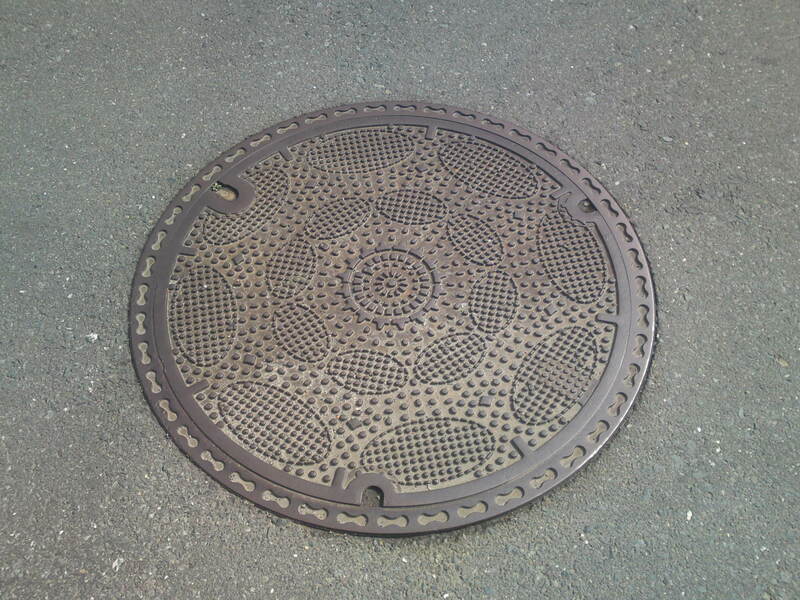 The one without the color is usually found in the middle of roads! 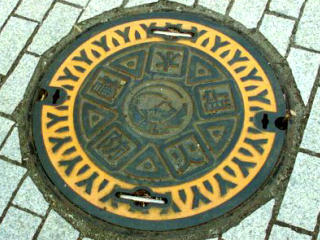 A sewer manhole cover with Fujieda City motif in the center! 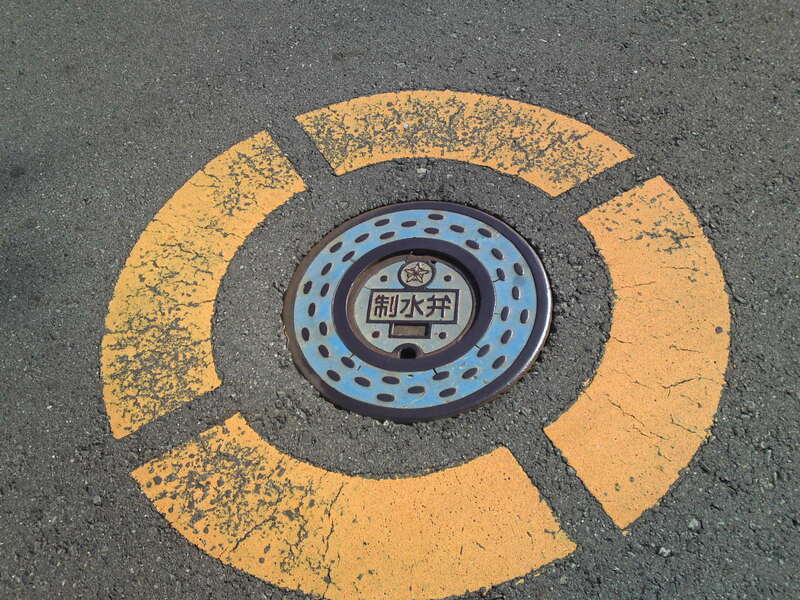 A round fire hydrant manhole cover! 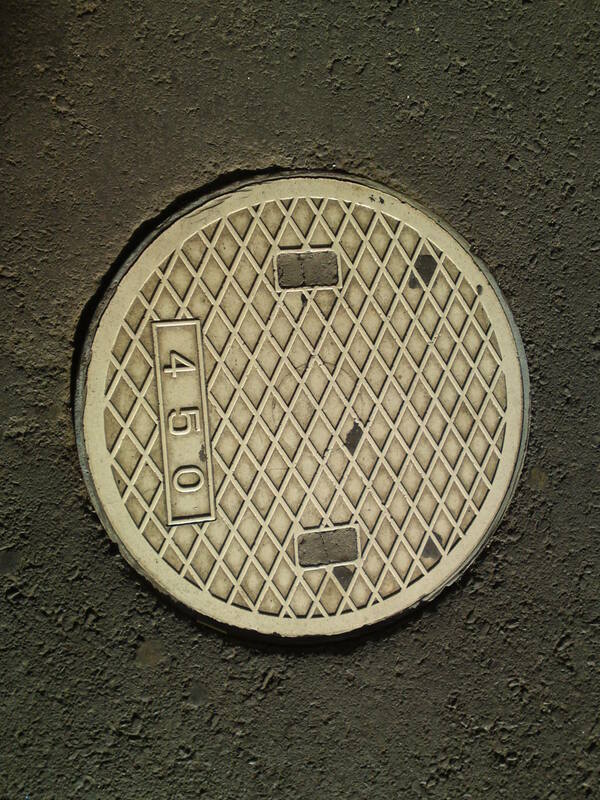 Another rectangular fire hydrant manhole cover! 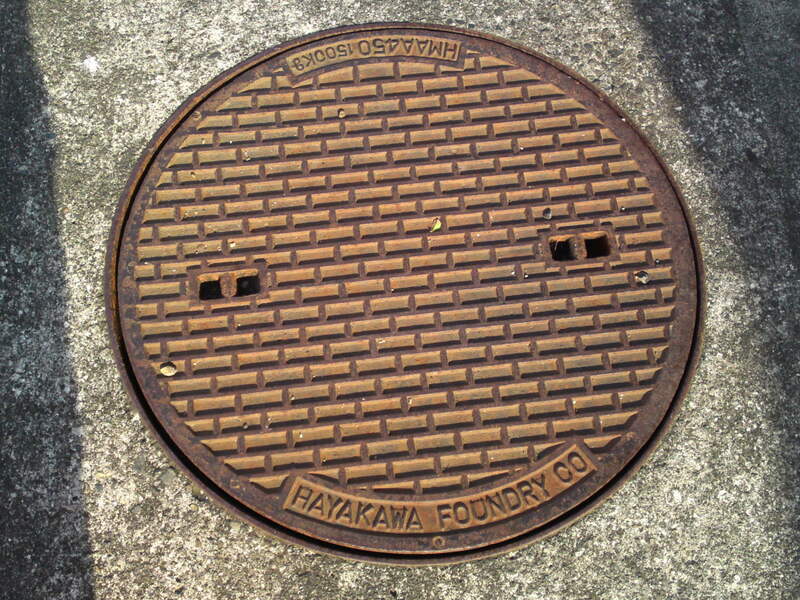 Another rectangular older type fire hydrant manhole cover! 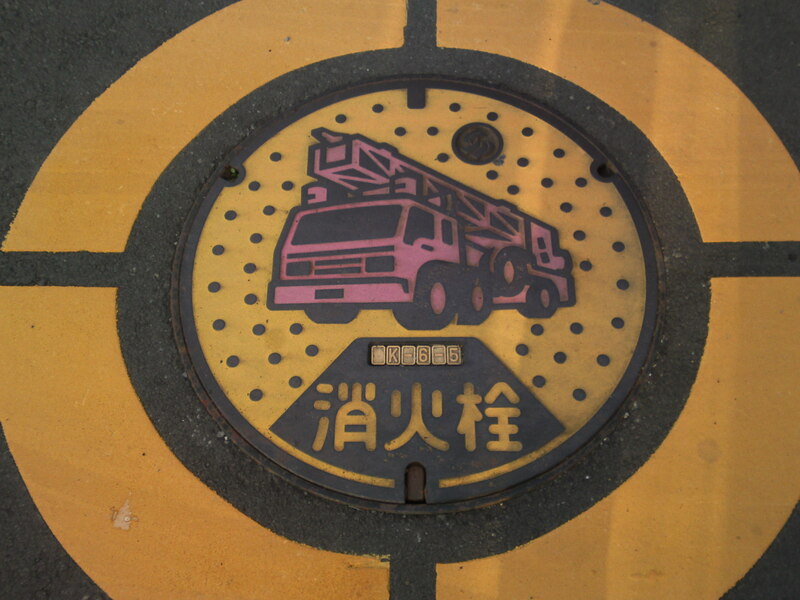 A gas manhole cover. 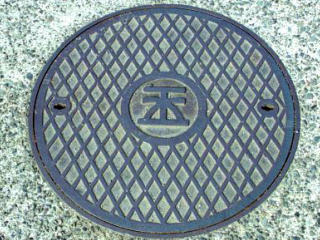 Probably for private use as the symbol is not that of Fujieda City! 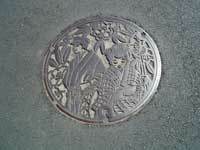 A beautiful mint manhole cover in Arai, which has since been merged to Kosai City in Western Shizuoka Prefecture! 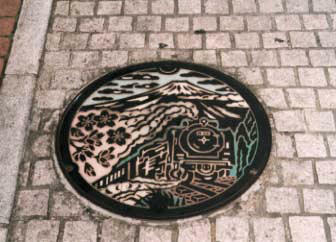 I still have quite a few pictures of manhole covers in Shizuoka (out of more than 400!) 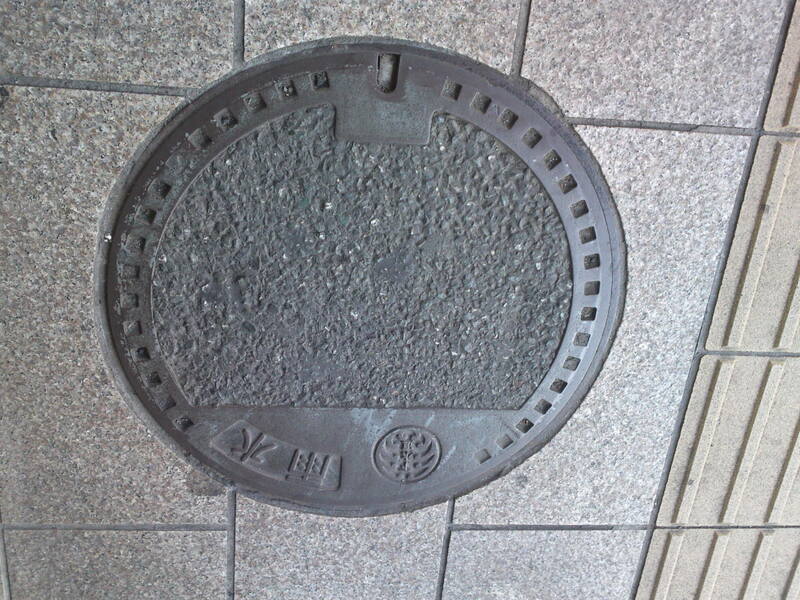 to show. 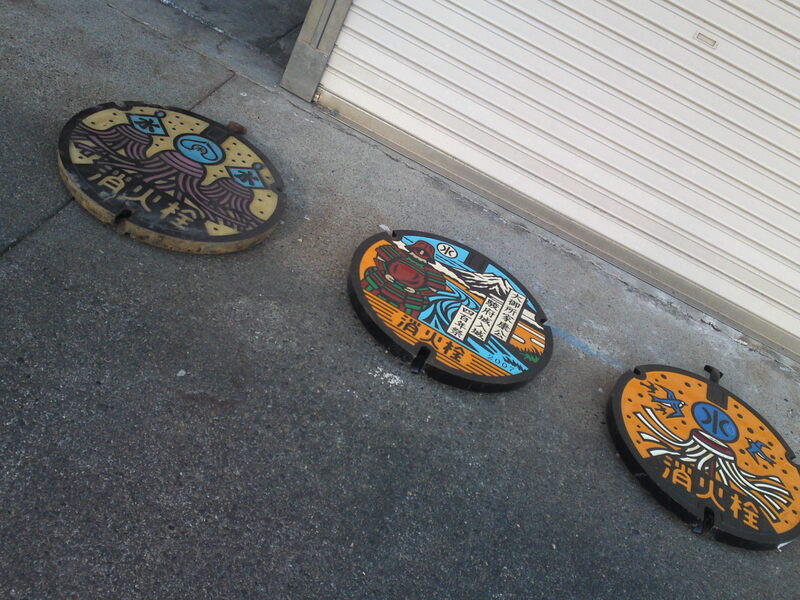 I’ll try to introduce them in some kind of related order. 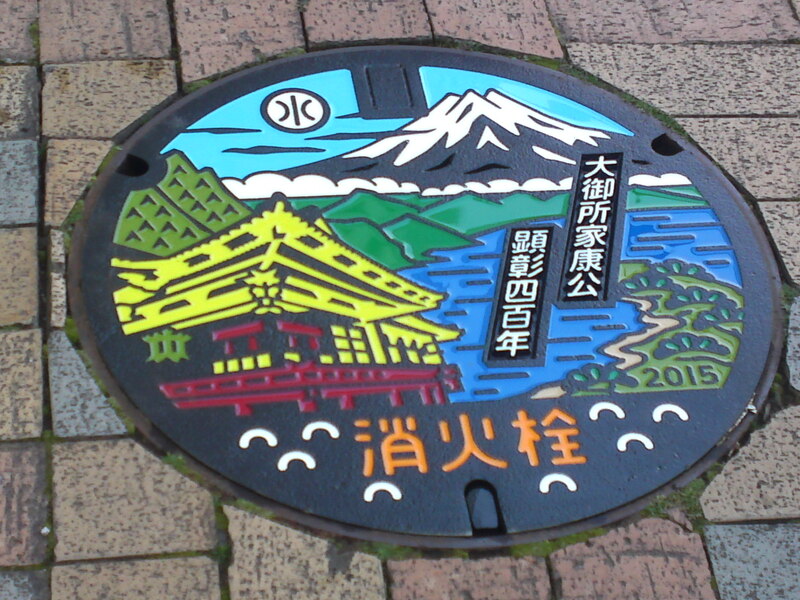 Let me take to the western part of Shizuoka Prefecture today! 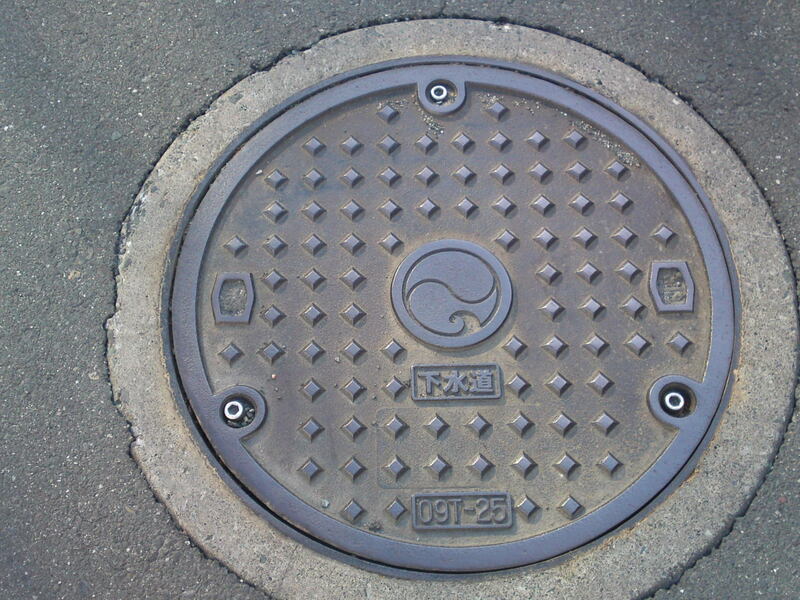 The same manhole cover in Arai but without the colors! 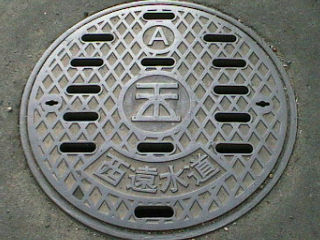 A private water access manhole cover in Arai! 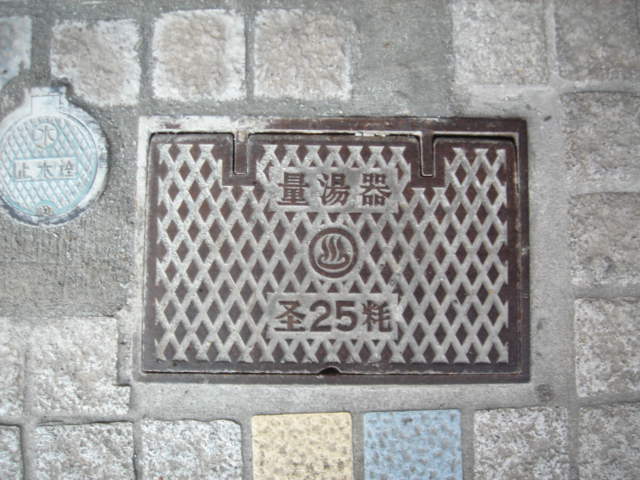 A fairly old manhole cover in Kosai City! 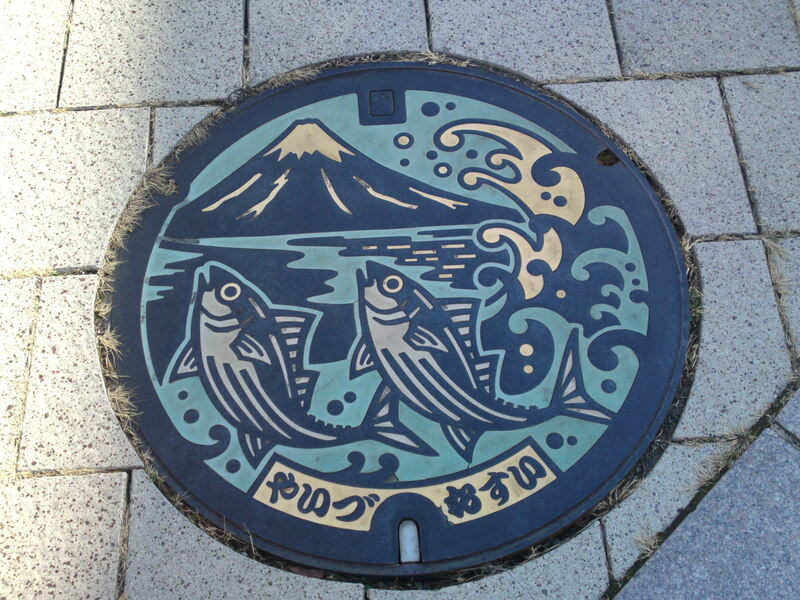 A cute water access manhole cover in Mori Machi/Mori Town! 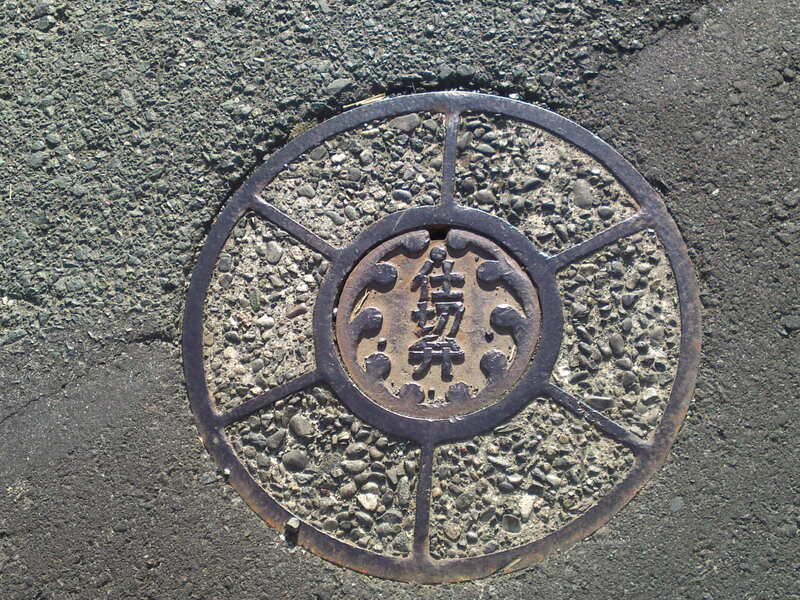 An ancient manhole cover in Hamaoka which has been merged with Omaezaki City since! 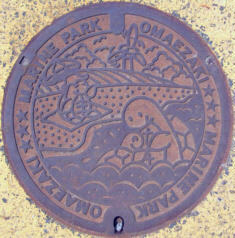 A cute manhole cover in Omaezaki marine Park, Hamaoka, Oamaezaki City! 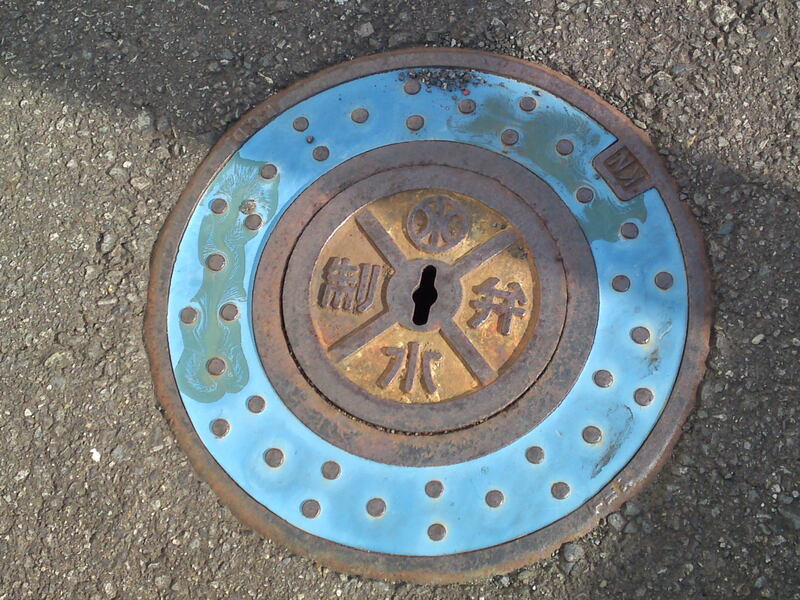 Another water access manhole cover in Hamaoka, Omaezaki City! 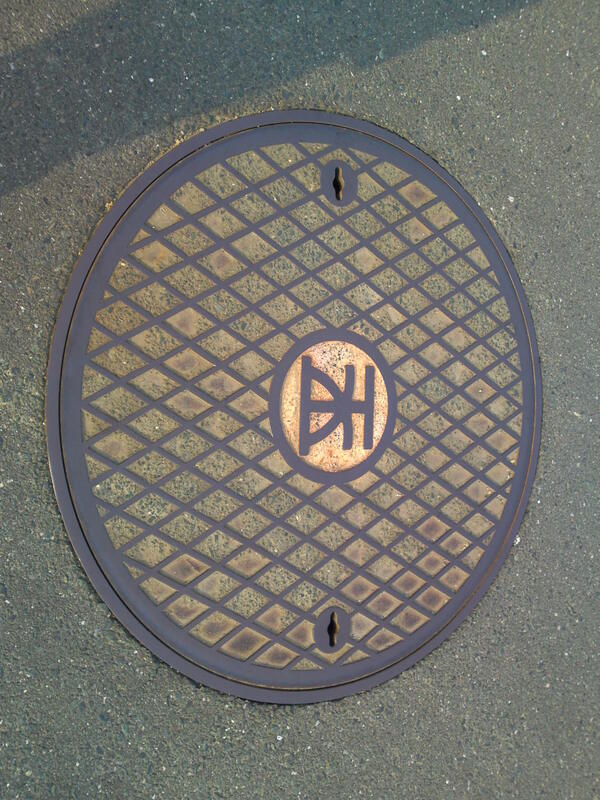 Another manhole cover in Hamaoka, Omaezaki City! 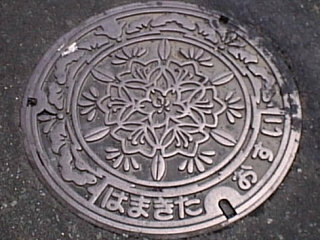 A beautiful mint water access manhole cover in Yoshida Cho! 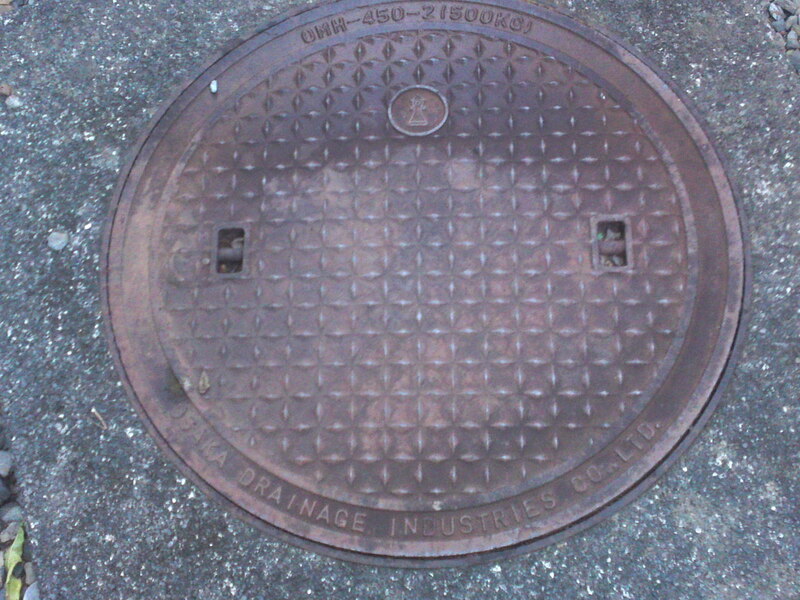 An old manhole cover for access to water provided by the Oi River! 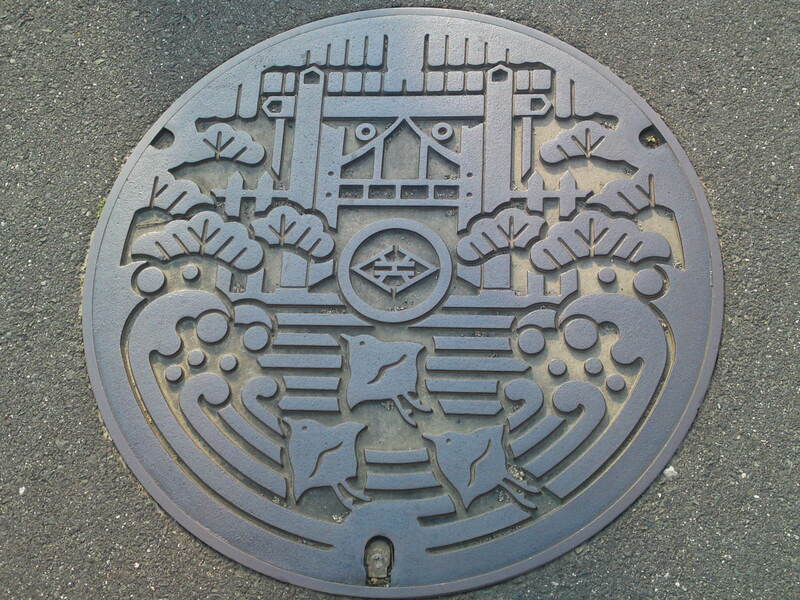 Manhole Covers in Shizuoka Prefecture 21: Shizuoka City Tachi Aoi/Hemlock type study! 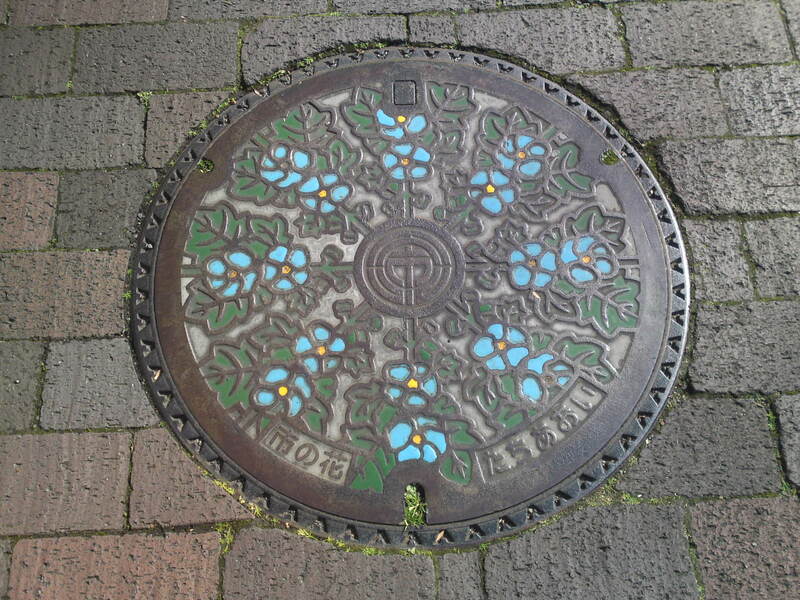 1) Tachi Aoi/Hemlock Type manhole cover: green, blue and yellow with the Shizuoka City central motif and inscriptions “Shi no Hana/市の花/City Flower” and “Tachi Aoi/たちあおい/Hemlock”! 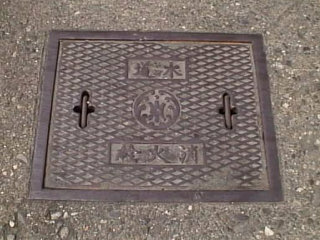 I had thought there were only 2 or 3 types of the Tachi Aoi or hemlock type manhole cover in Shizuoka City but the fact I alsways move on a bicycle along the streets and pavements of the city helped me understand it was a bit more complicated! 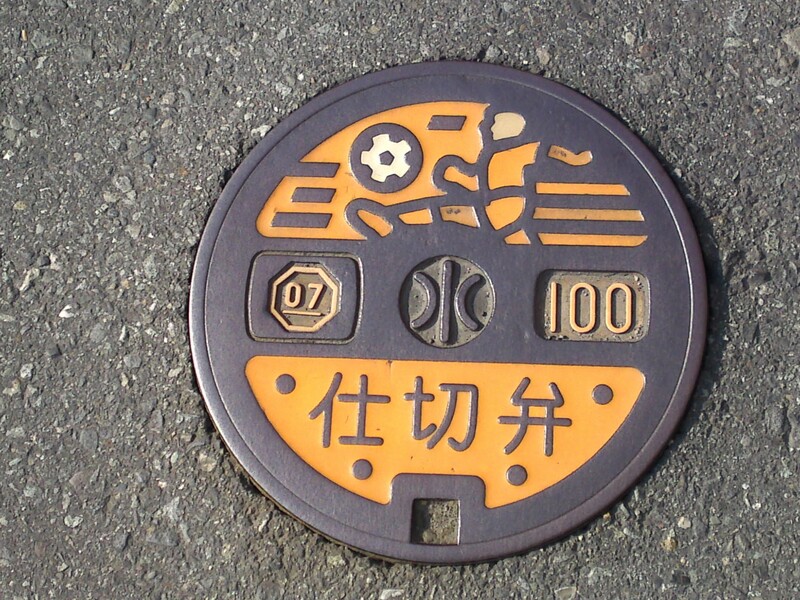 Apart of color types (more than 3 actually) there are sub-types depending on letter/number codes and central motifs! 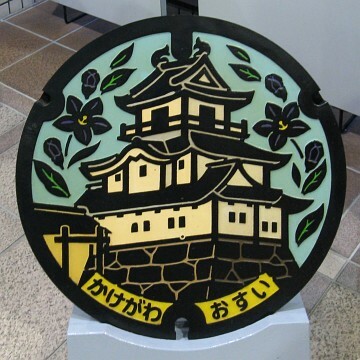 It seems to be peculiar to Shizuoka City whose emblem is the hemlock, the flower on the crest of Tokugawa Ieyasu, the Japan Shogun/Overlord, who retired to our city in the 17th Century! 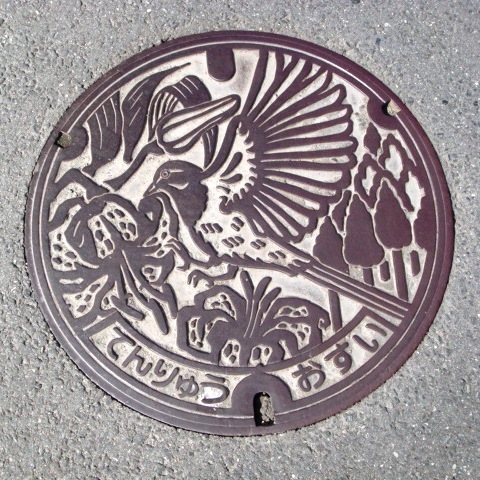 2) Tachi Aoi/Hemlock Type manhole cover: green and mauve with the Shizuoka City central motif and inscriptions “Shi no Hana/市の花/City Flower” and “Tachi Aoi/たちあおい/Hemlock”! 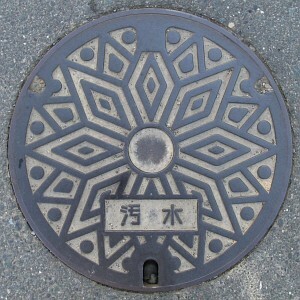 3) Tachi Aoi/Hemlock Type manhole cover: all white enamel with the Shizuoka City central motif and inscriptions “Shi no Hana/市の花/City Flower” and “Tachi Aoi/たちあおい/Hemlock”! 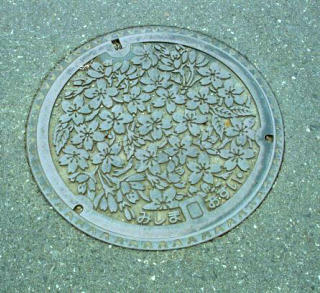 4) Tachi Aoi/Hemlock Type manhole cover: no colors with the Shizuoka City central motif and inscriptions “Shi no Hana/市の花/City Flower” and “Tachi Aoi/たちあおい/Hemlock”! 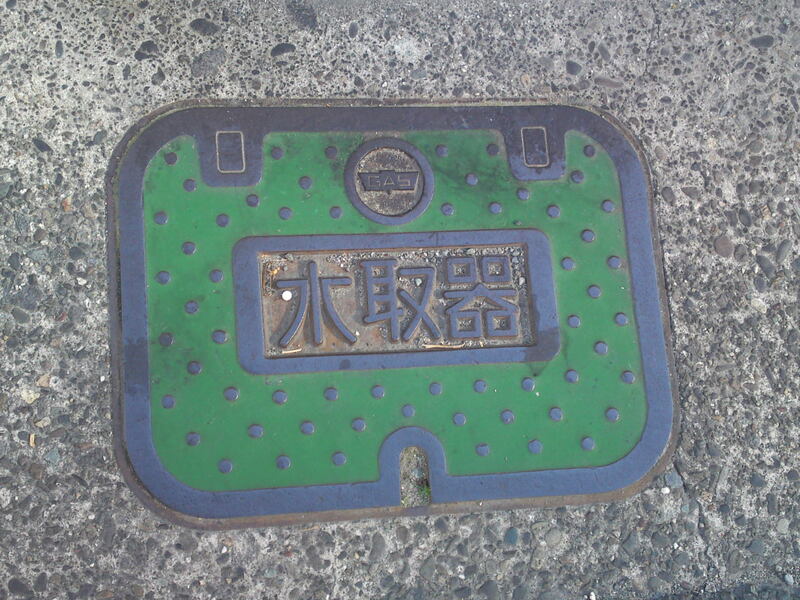 5) Tachi Aoi/Hemlock Type manhole cover: green and pink with the Shizuoka City central motif and inscriptions “T-14” and “Tachi Aoi/たちあおい/Hemlock”! 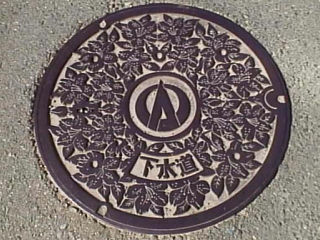 6) Tachi Aoi/Hemlock Type manhole cover: medium-sized without the colors with the Shizuoka City central motif and inscriptions “T-14” and “Tachi Aoi/たちあおい/Hemlock”! 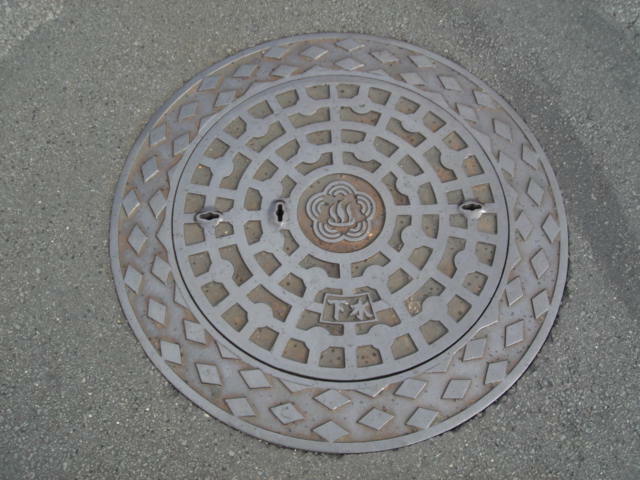 7) Tachi Aoi/Hemlock Type manhole cover: green, white and brown with the Shizuoka Gas Company central motif and inscriptions “T-14” and “Tachi Aoi/たちあおい/Hemlock”! But in medium size! 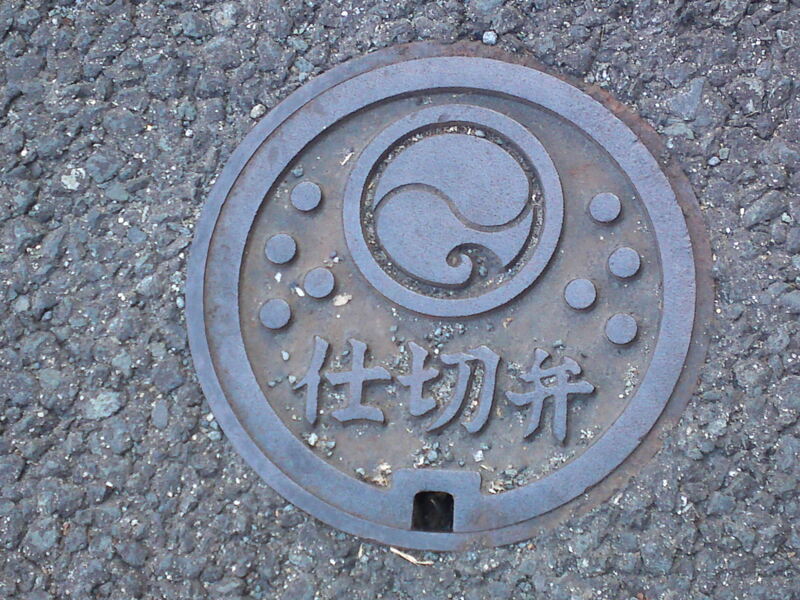 I have found only one so far along the Kitakaido! 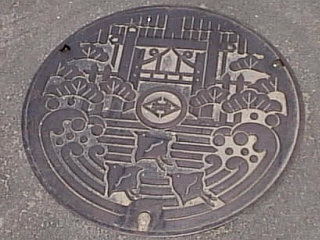 8) Tachi Aoi/Hemlock Type manhole cover: green, white and brown with the Shizuoka City central motif and inscriptions “T-25” and “Tachi Aoi/たちあおい/Hemlock”! 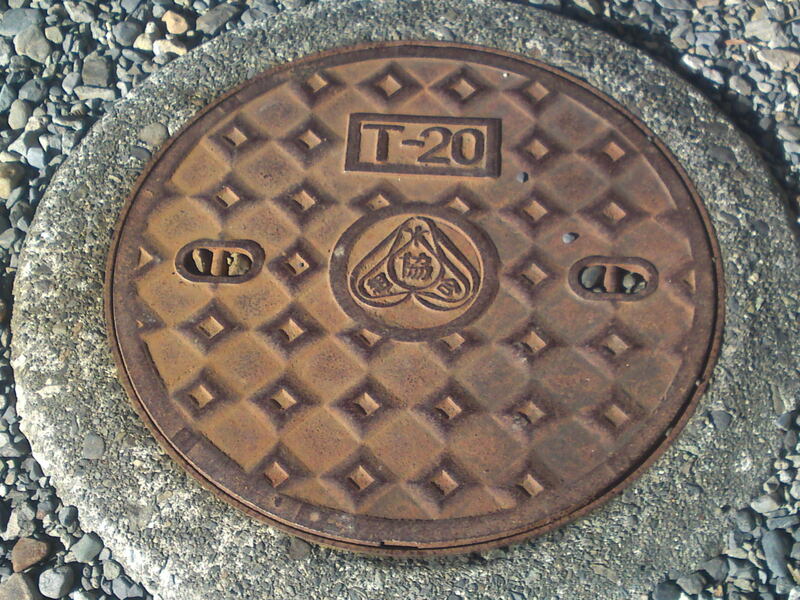 9) Tachi Aoi/Hemlock Type manhole cover: no colors with the Shizuoka City central motif and inscriptions “T-25” and “Tachi Aoi/たちあおい/Hemlock”! 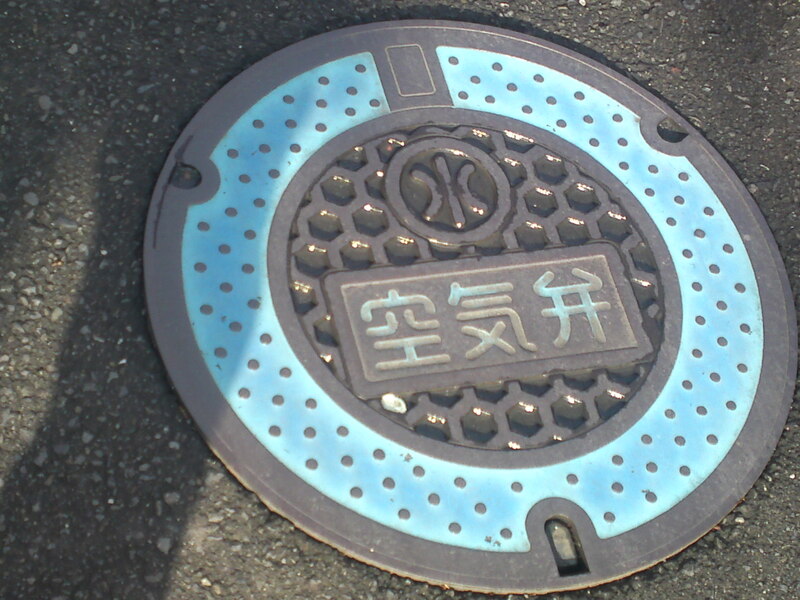 10) Tachi Aoi/Hemlock Type manhole cover: green, white and light blue with the Shizuoka Gas Company central motif and inscriptions “T-14” and “Tachi Aoi/たちあおい/Hemlock”! 11) the same type as 8) but in half size and a simpler general dessin with no colors! 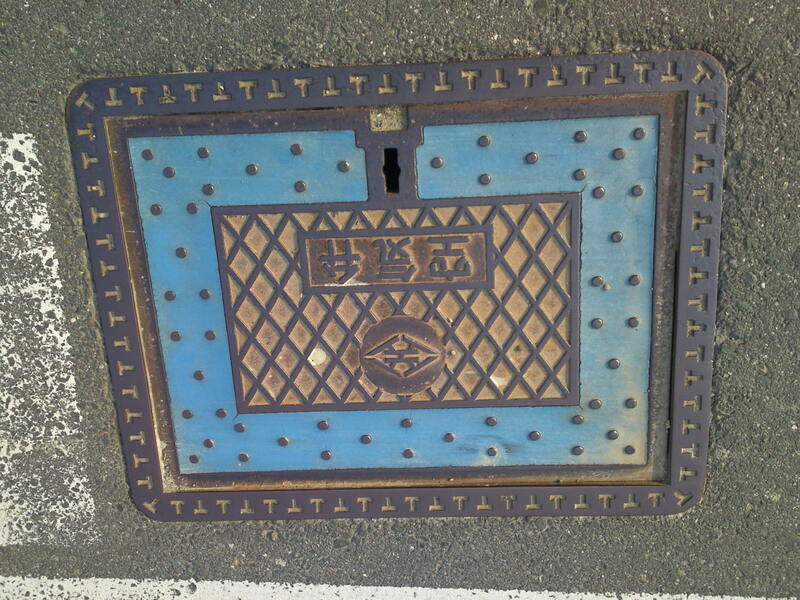 12) Tachi Aoi/Hemlock Type manhole cover: no colors with the Shizuoka Gas Company central motif and inscriptions “T-14″ but no”Tachi Aoi/たちあおい/Hemlock”, and more numbers in golden color! 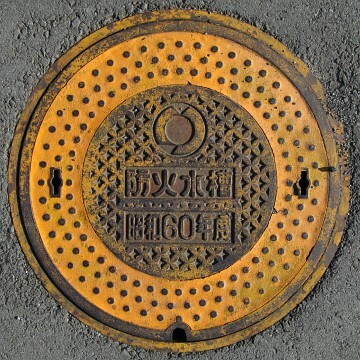 13) Tachi Aoi/Hemlock Type manhole cover: no colors with the Shizuoka Gas Company central motif and inscriptions “T-25″ but no”Tachi Aoi/たちあおい/Hemlock”, and more numbers in golden color and inside a larger manhole cover discovered along the Kitakaido! I wonder if another type exists? 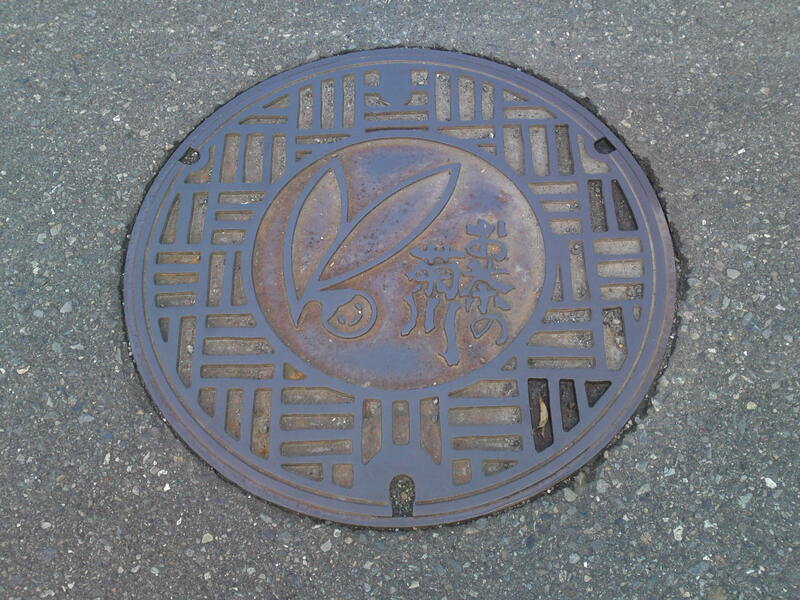 A beautiful mint water access manhole cover in Susono City! 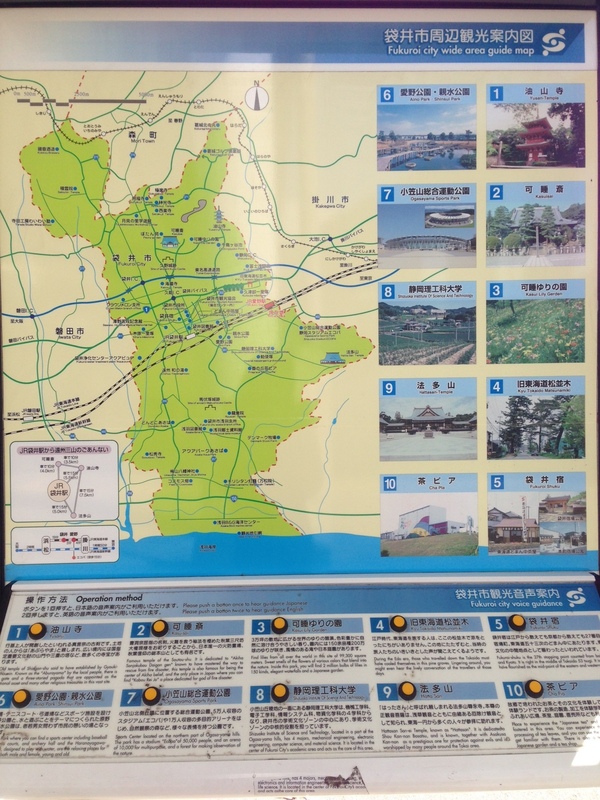 This time I will take you the eastern part of Shizuoka Prefecture, but since I have quite a few I had to write it in two parts! The same as above but without the colors! 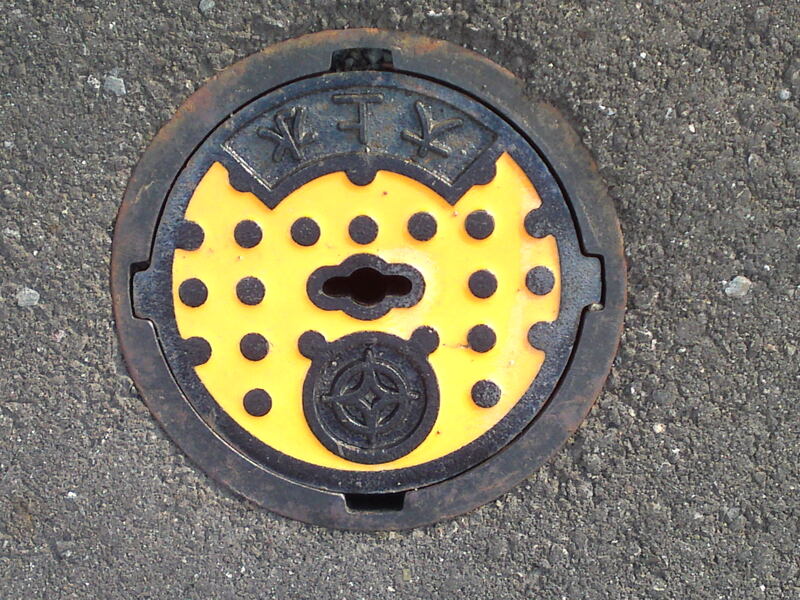 A small and colorful valve pit cover in Susono City! 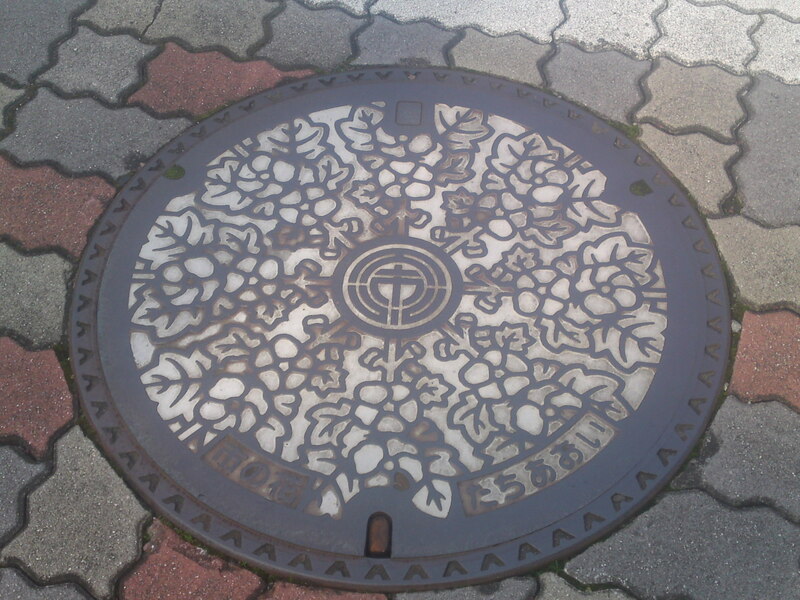 A flowery manhole cover in Mishima City with the motif in relief! 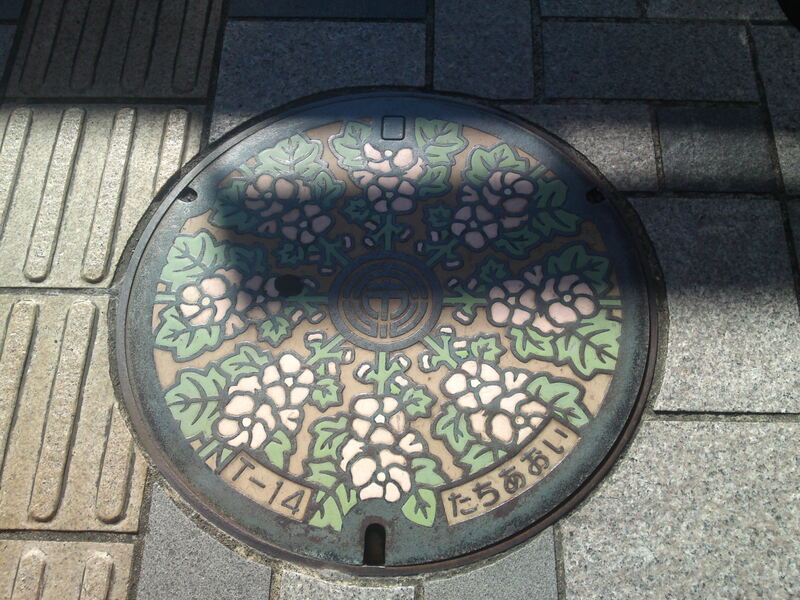 The same type of manhole cover in Mishima City with some colors left but with the flower motif carved in! 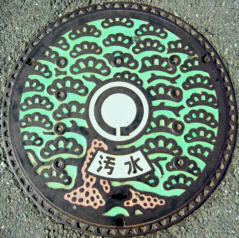 An ancient sewer manhole cover in Mishima City! 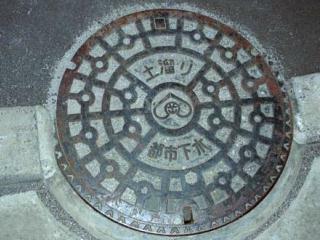 Another old sewer manhole type in Mishima City with the same central motif! 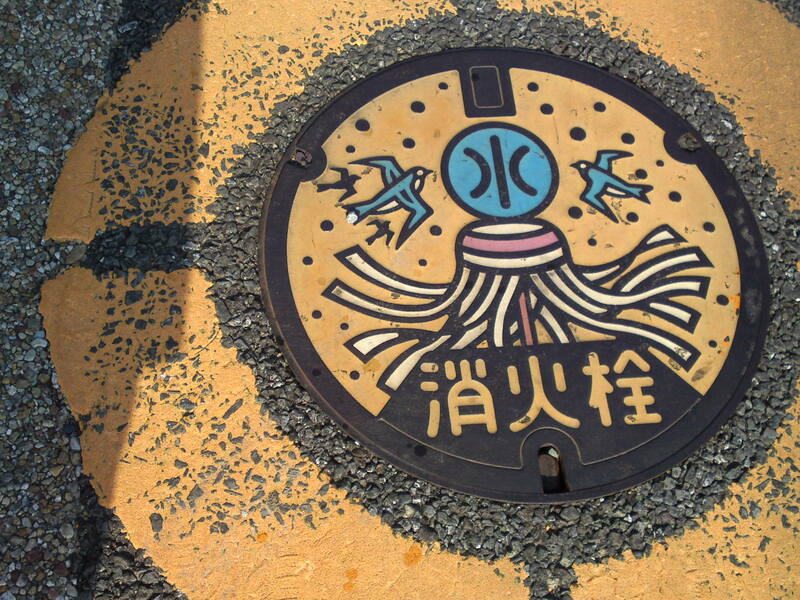 Another sewer type manhole cover in Mishima City with a different central motif! 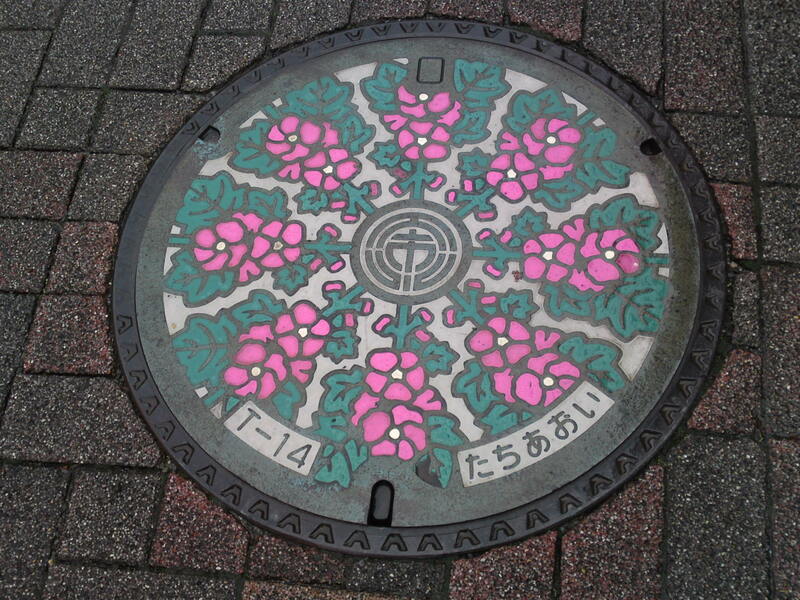 Another colorful flowery water access manhole cover in Hirokoji District in Mishima City! 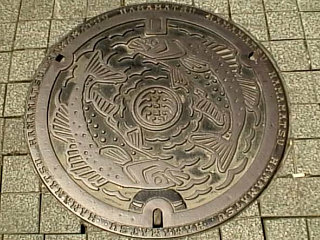 A splendid mint water access manhole cover in Nirayama, now part of Mishima City with Mount Fuji, Strawberries and Hansharo Foundry Towers! 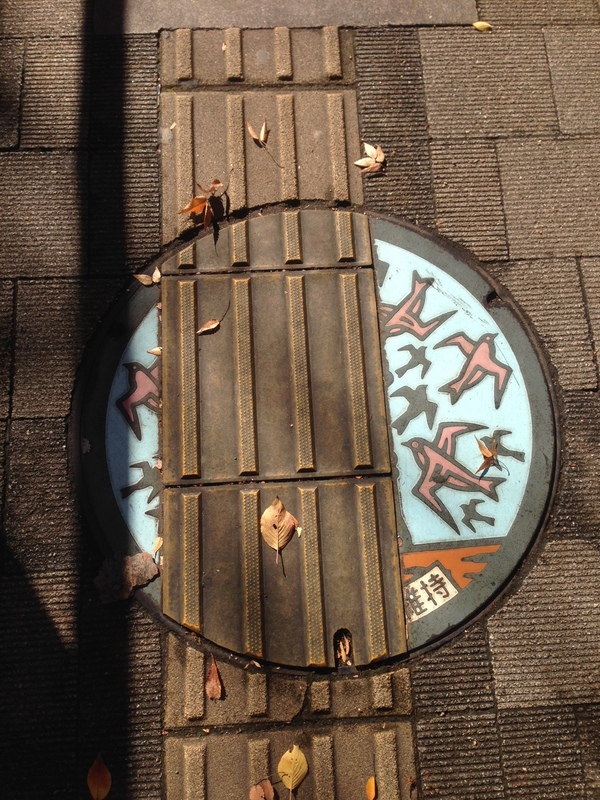 here is another water access manhole cover in Nirayama! 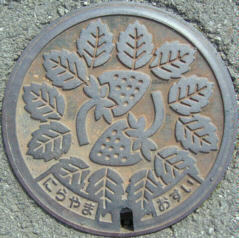 Nirayama is famous all over the country for its strawberry farms! 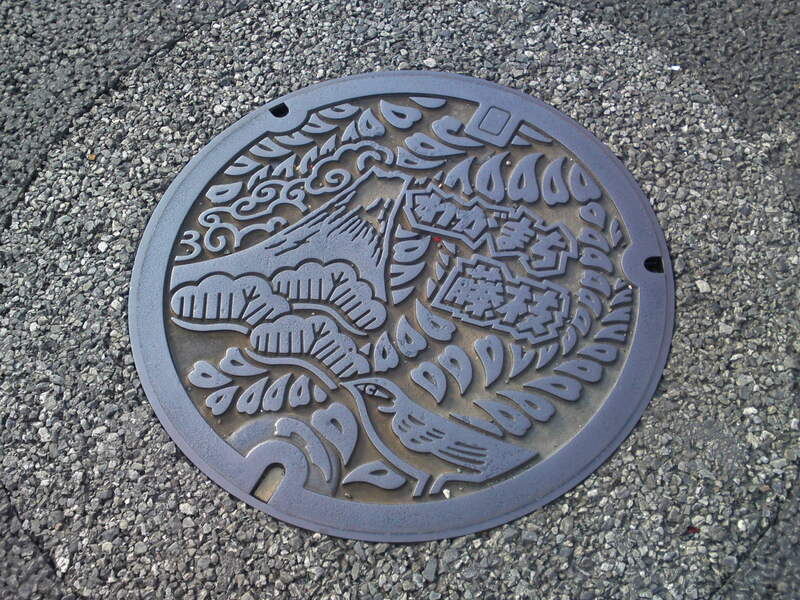 A beautiful mint water access manhole cover for Numazu City! 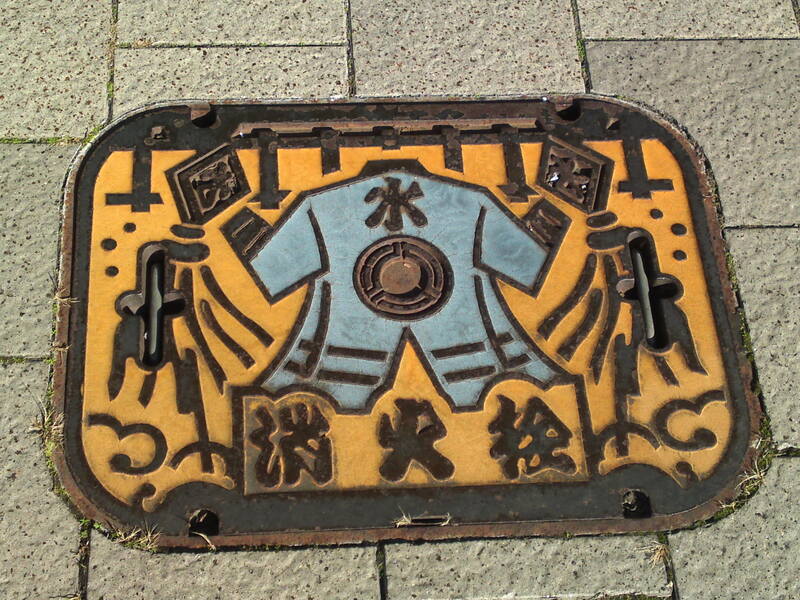 An old sewer manhole cover in Numazu City! 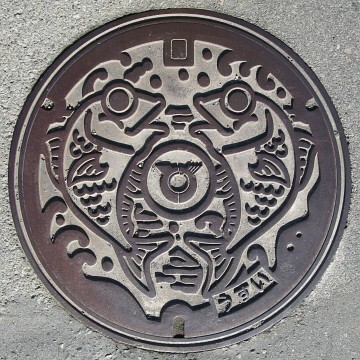 An intriguing manhole cover in Heda, now merged into Numaz City! 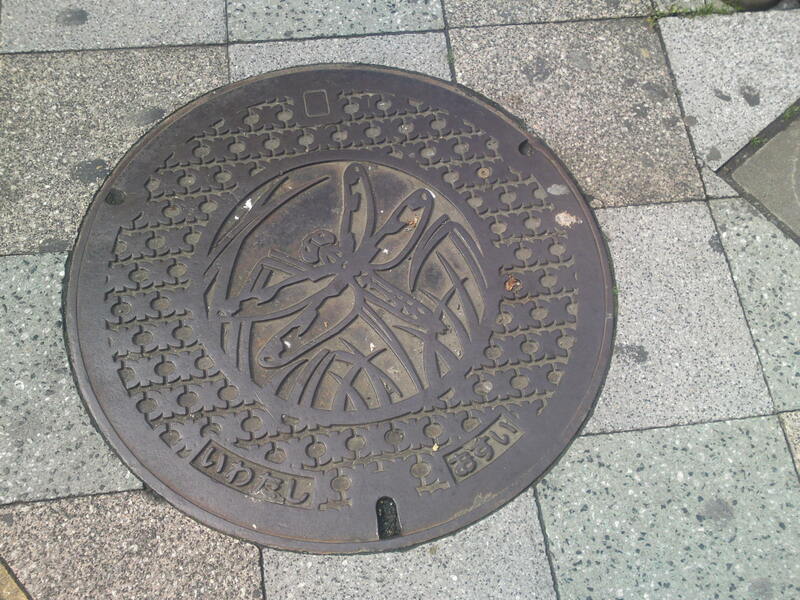 The same as above in Heda but inside a larger manhole cover! See you in part 2 next! 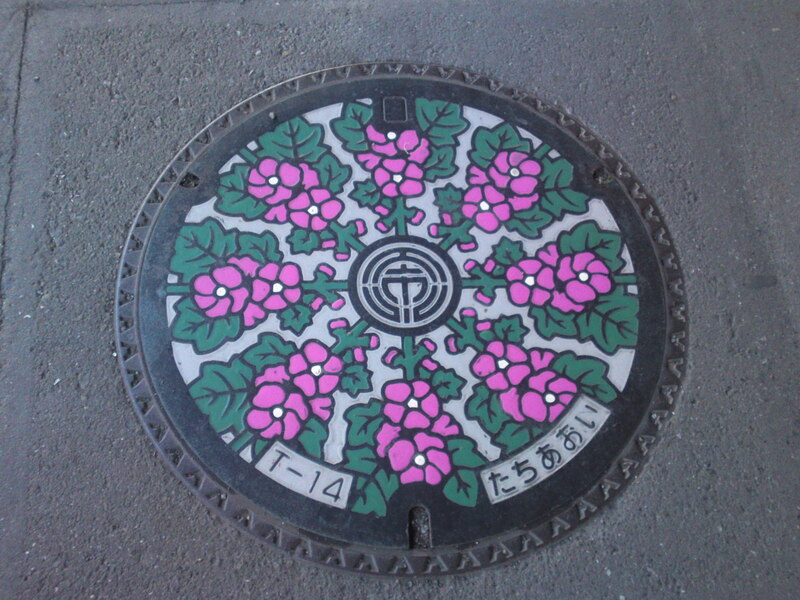 A cute manhole cover in Oyama Cho! 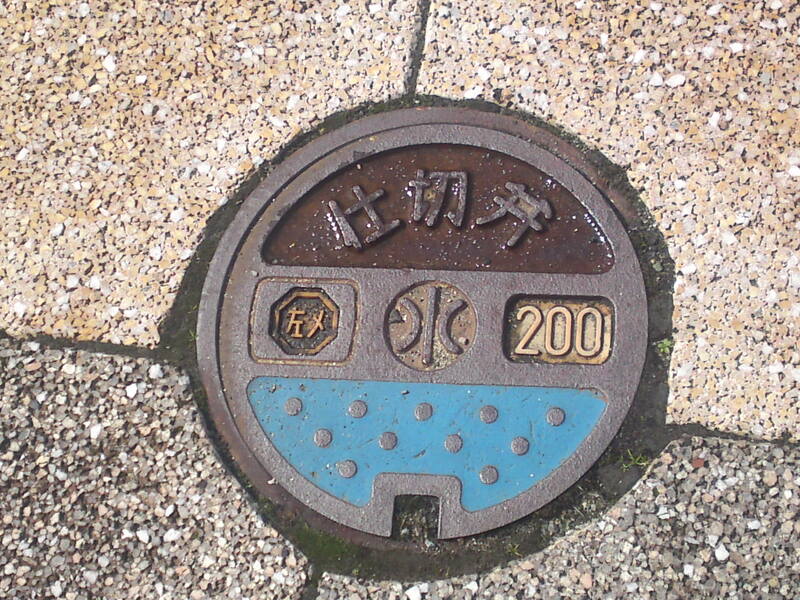 Not strictly east of Shizuoka Prefecture but in Izu peninsula. 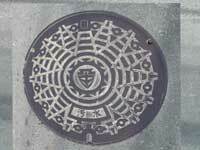 Beautiful black and white evrsion of a manhole cover in Amagi Yugashima, since then merged in Izu City! 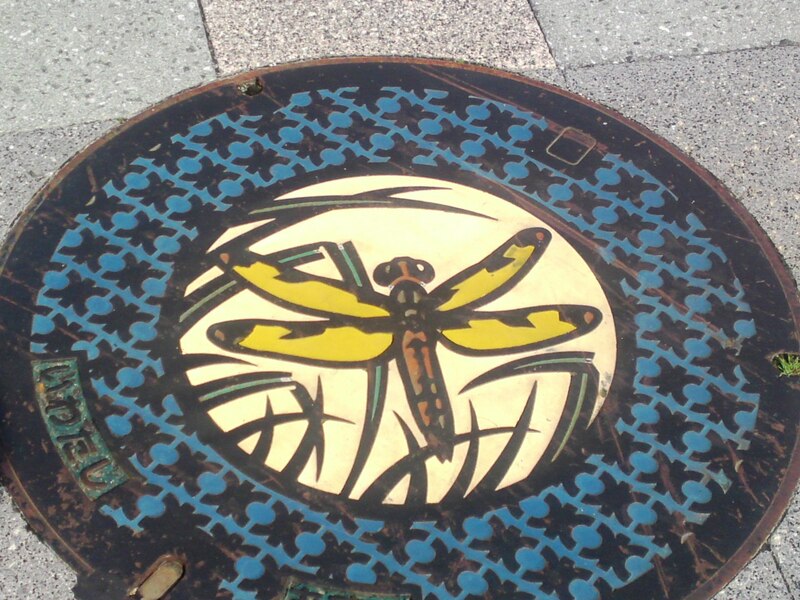 A beautiful mint water manhole cover with a dragonfly in Iwata City! 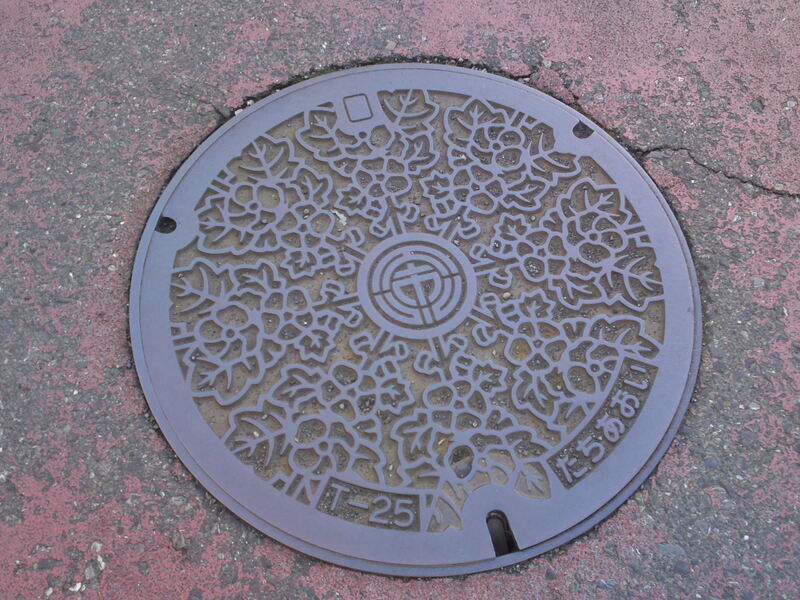 Iwata City, already an important city both for its industries and agriculture in Western Shizuoka Prefecture has considerably increased in side with the recent merger to quite a fewtowns and villages, making its manhole covers a slightly complicated study! 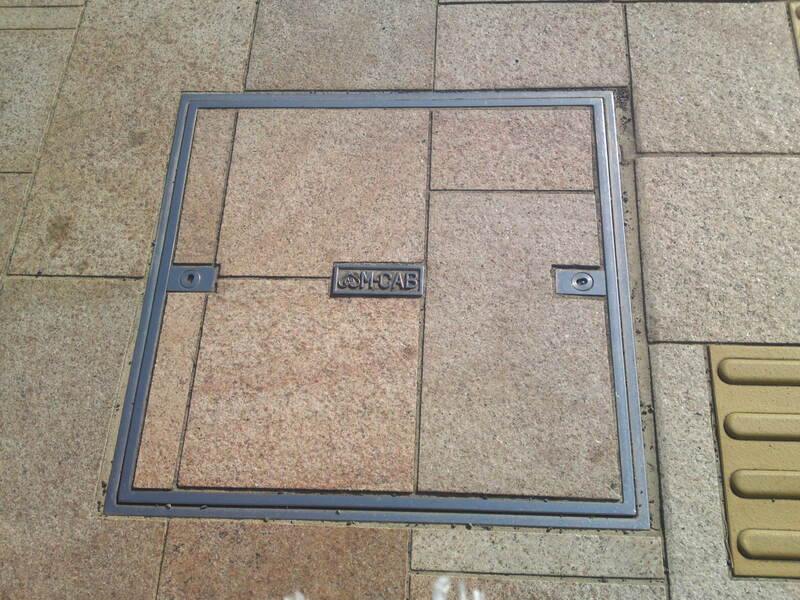 The same a s above on a pavement! The same again without the colors! 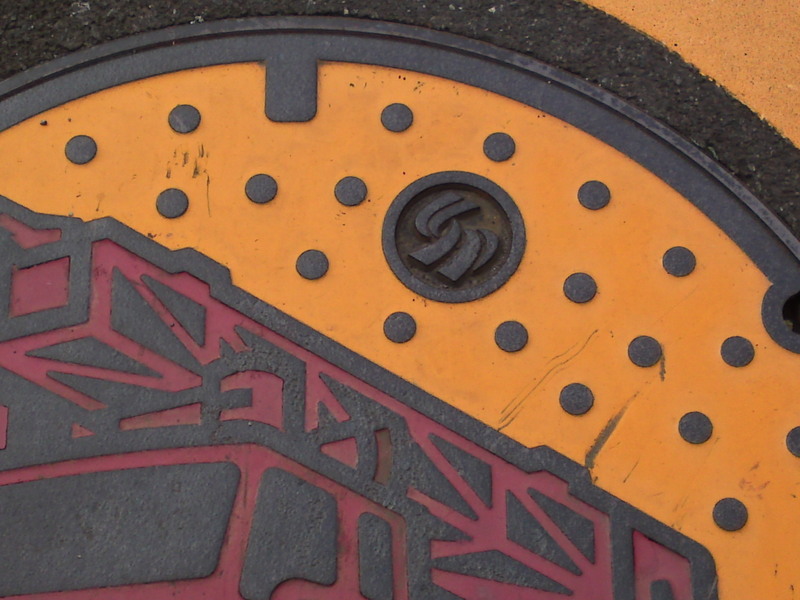 An unusual pattern in Shizuoka Prefecture, probably a sewer manhole cover! 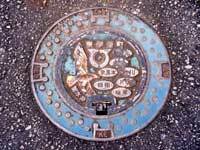 Another unusual and ancient water access manhole cover! 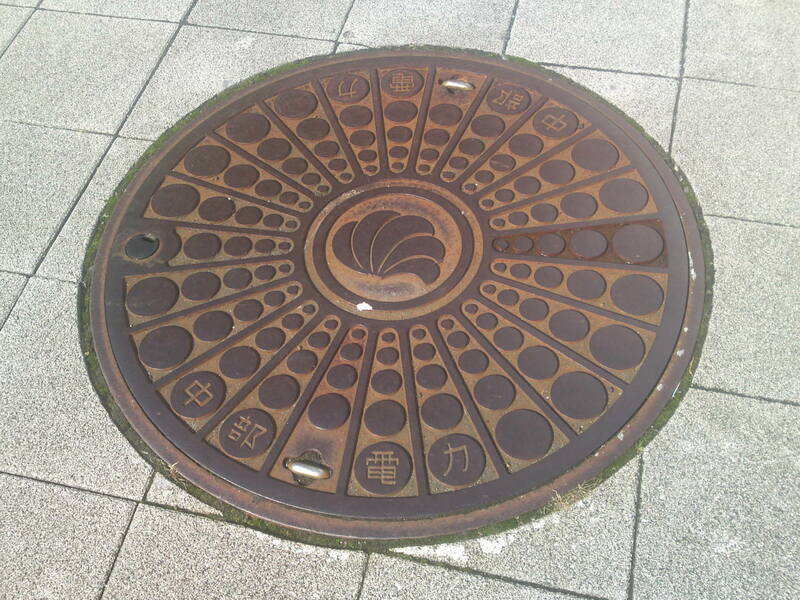 A magnificent mint water access manhole cover in Ryuhou which has since been merged into Iwata City! 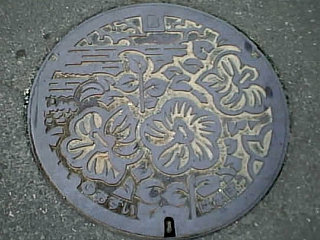 Another interesting and flowery mint manhole cover for Toyooka Village merged into Iwata City since! 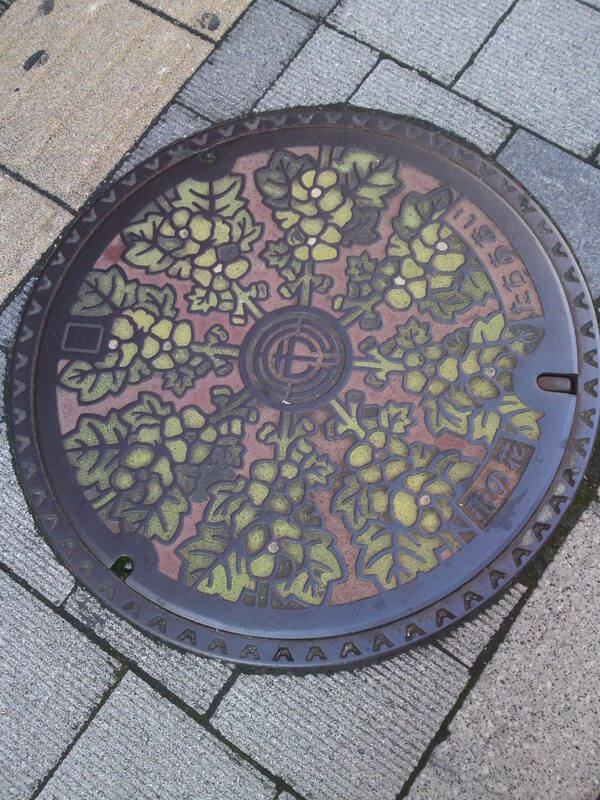 Beautiful wisteria mint manhole cover for Toyoda Town merged into Iwata City since! 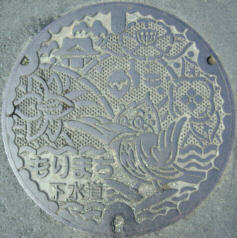 Another wisteria Manhole cover, but more intricate, in Toyoda Town! 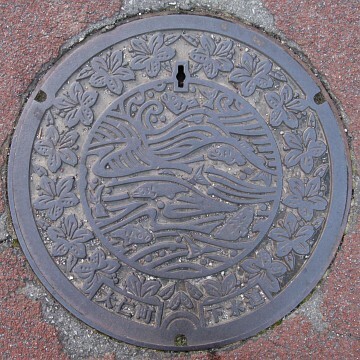 A mint water access manhole cover for Fukuda Town merged into Iwata City since! 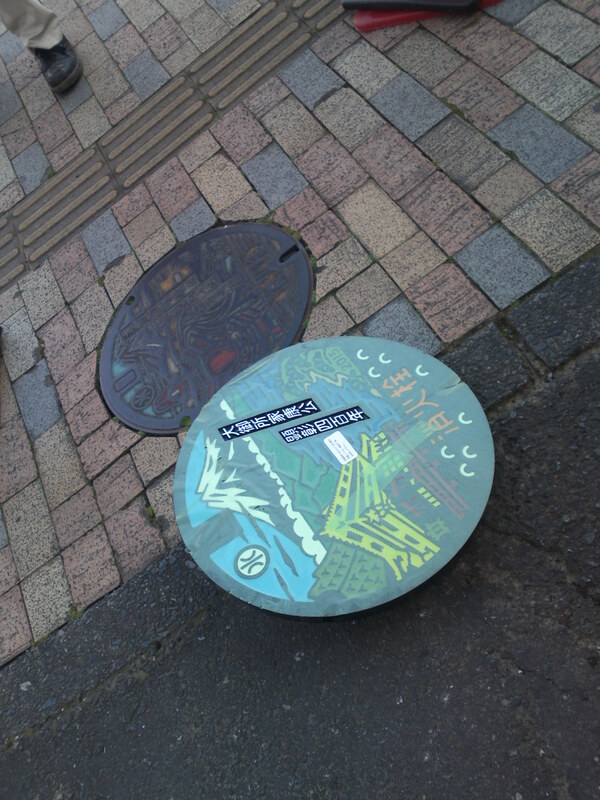 Another mint manhole cover for Fukuda Town, but with a different pattern! 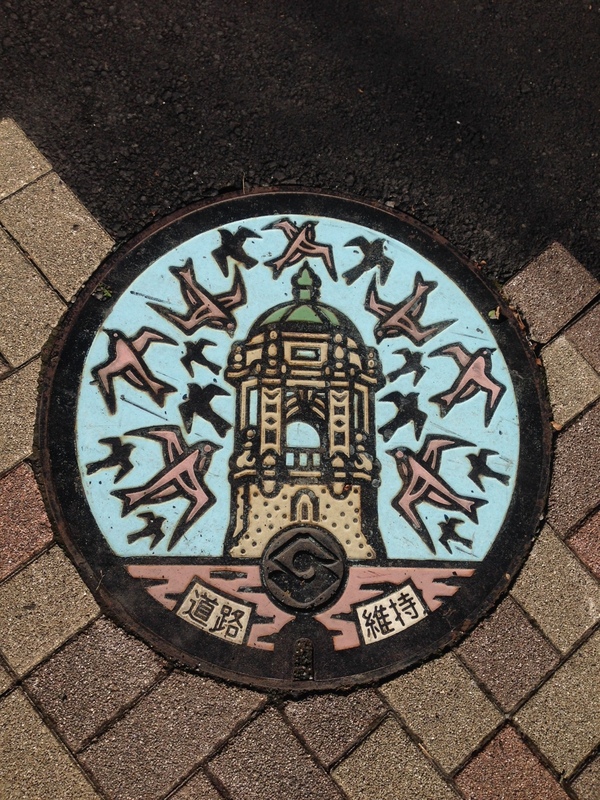 A magnificent mint manhole cover in Itoh City with the characters of “The Izu Dancer” story by Yasunori kawabata! 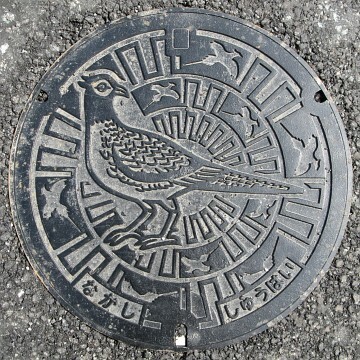 Another beautiful mint manhole cover in Itoh City! The same in black and white! 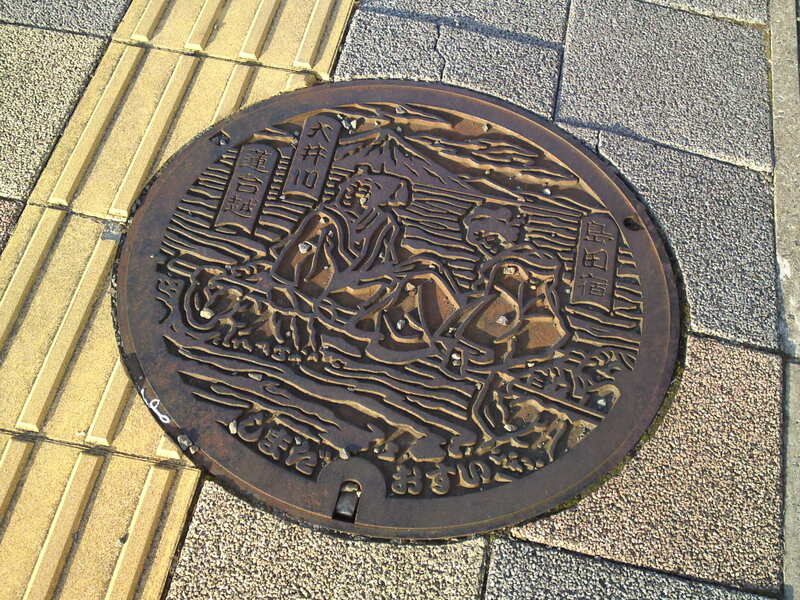 Sea bathers on a mint manhole cover in Itoh City! 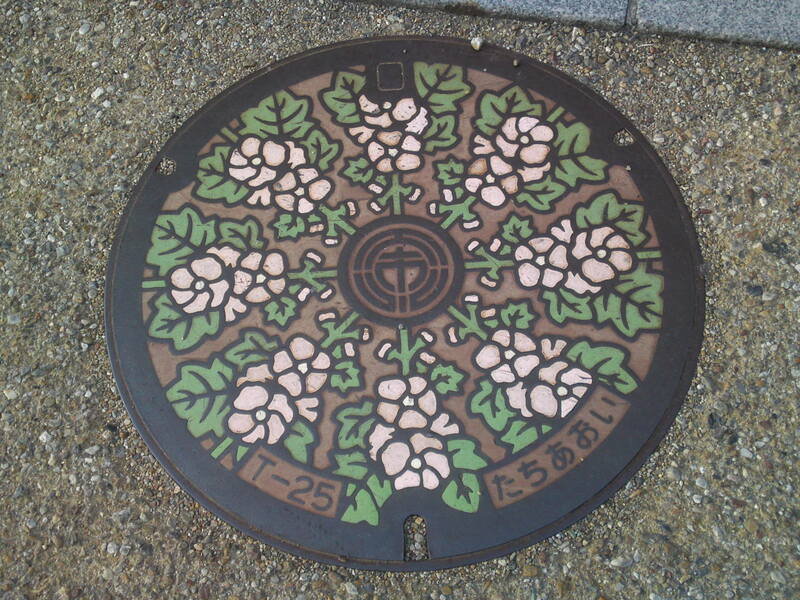 Camelias Manhole covers in Itoh City! 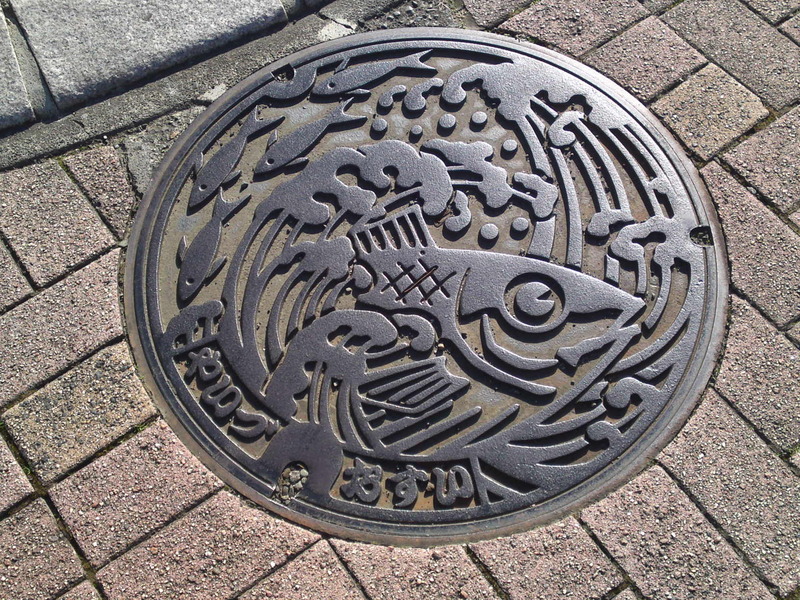 Fish design manhole cover in Itoh City to remind you that Izu Peninsula is surrounded by one of the richest seas in Japan! 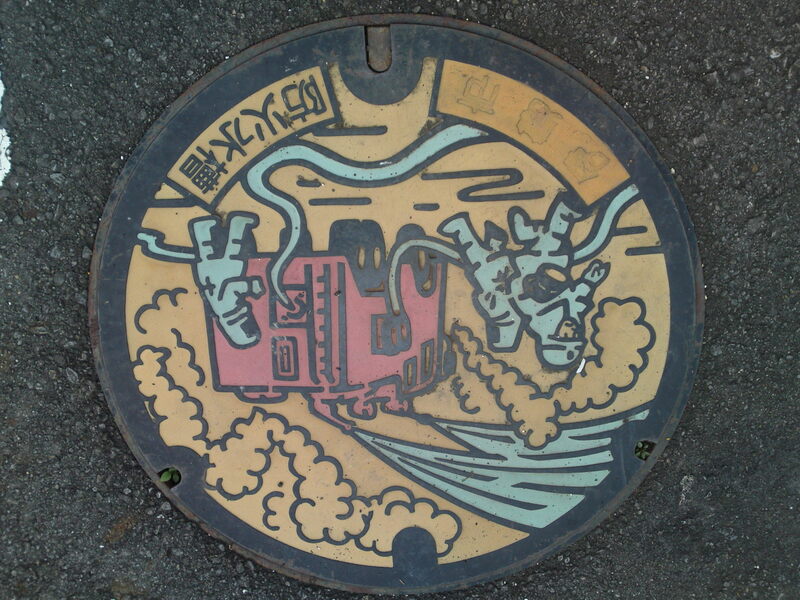 A fire hydrant manhole cover in Itoh City! 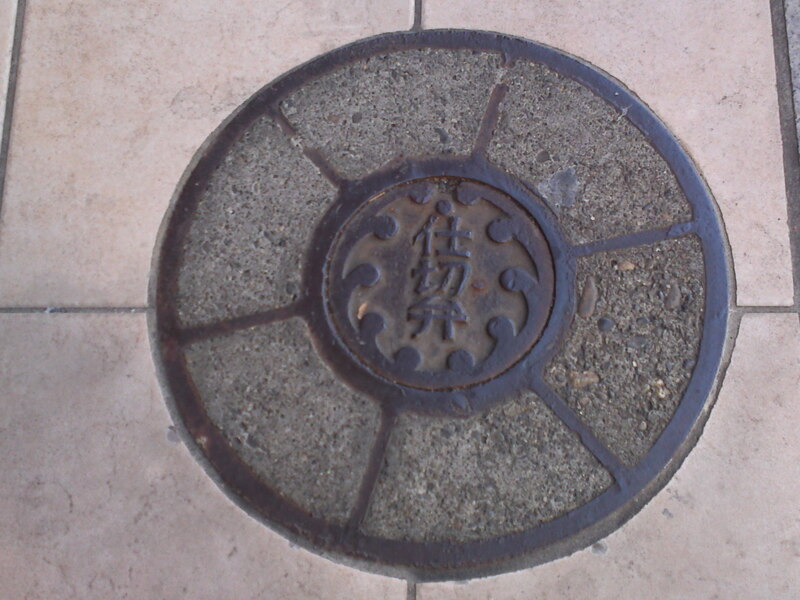 A very ancient medium-sized sewer manhole cover in Itoh City! 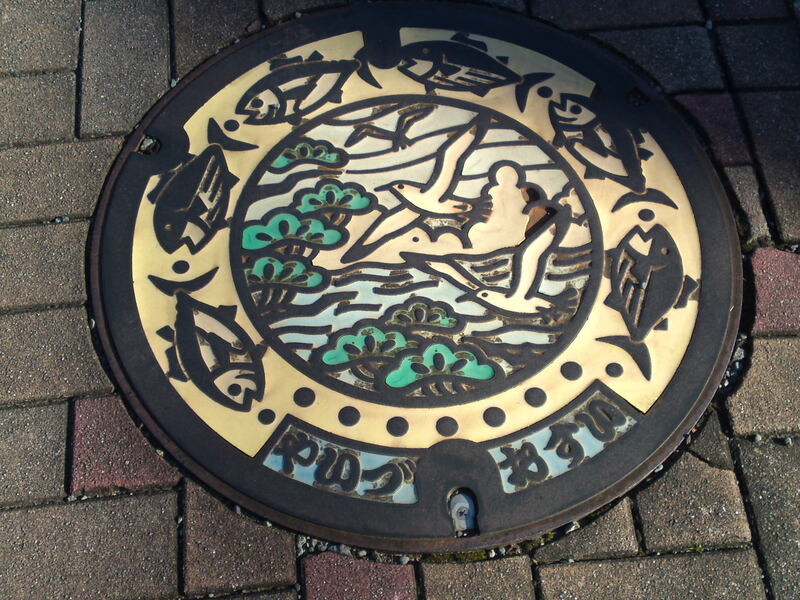 A beautiful mint water manhole cover in Izu Nagaoka which has been since merged into Izu no Kuni City! 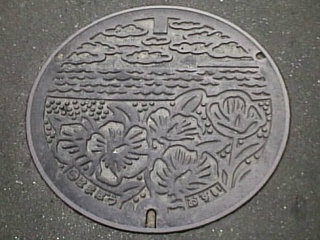 A beautiful mint manhole cover in Shuzenji which has since been merged into Izu City! 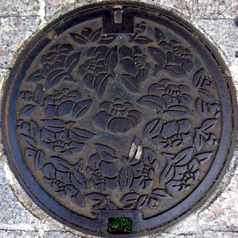 Irises manhole cover in Shuzenji! 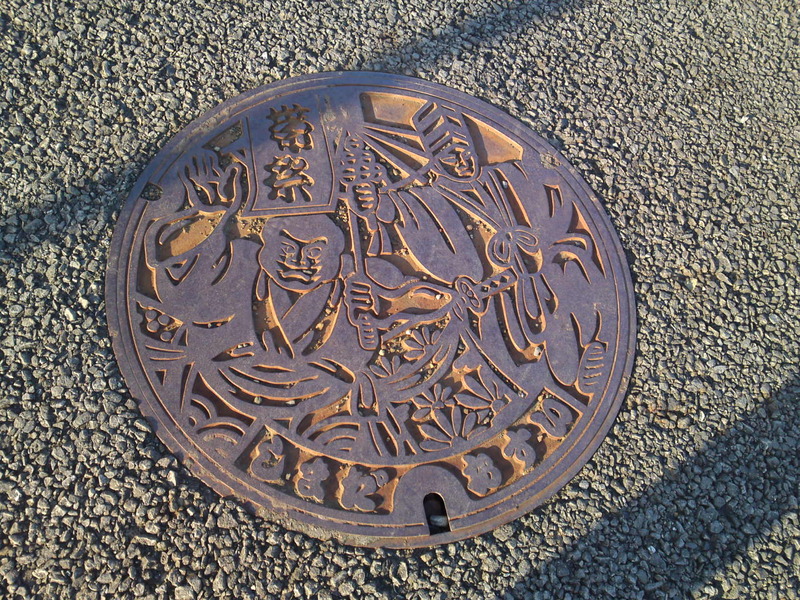 A beautiful mint Manhole cover in Nagaizumi! 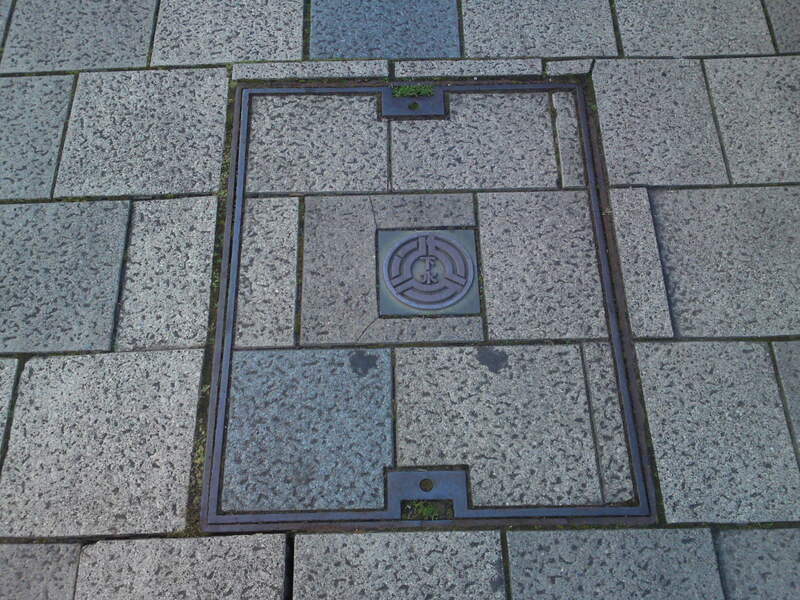 The same on a pavement! 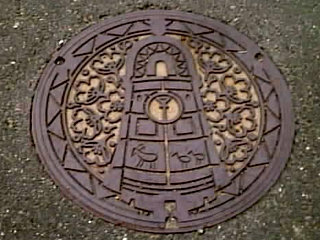 A beautiful fire hydrant manhole cover in Nagaizumi! 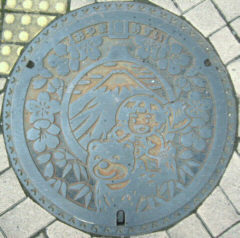 A cute mint manhole cover in Minami Izu Cho, a touristic spot! 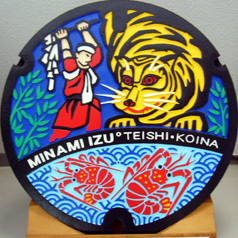 Another beautiful mint manhole cover in Minami Izu Cho representing the Teishi Koina Festival and lobsters! 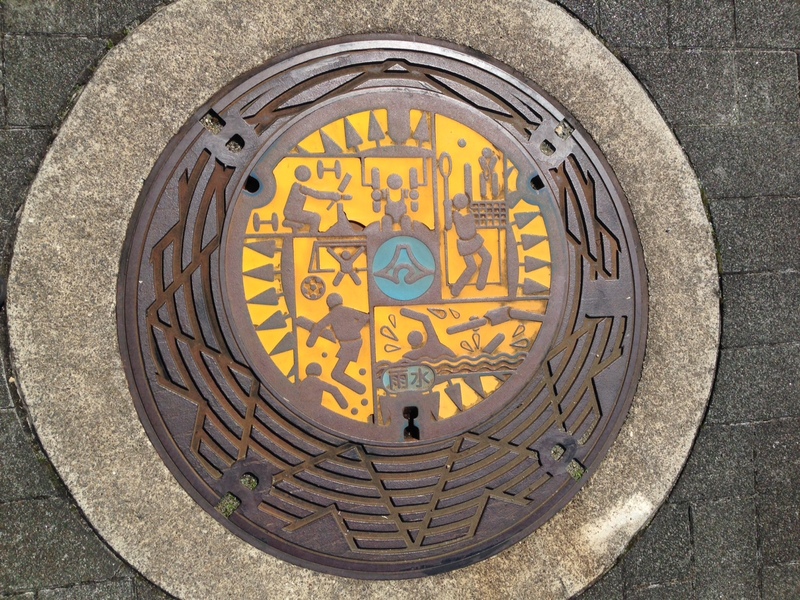 A sewer manhole cover in Minami Izu Cho! Fireworksand Bon Odori dance in Minami Izu Cho! 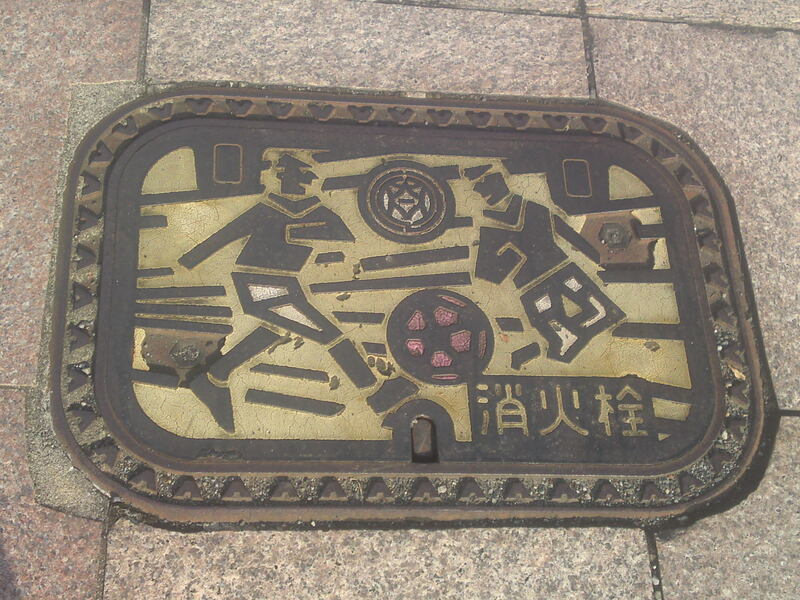 A double manhole cover in Matsuzaki! 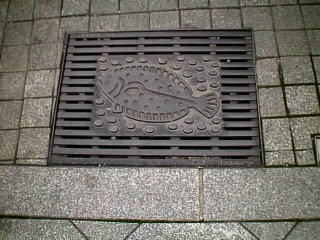 Fish manhole cover in Higashi Izu Cho! 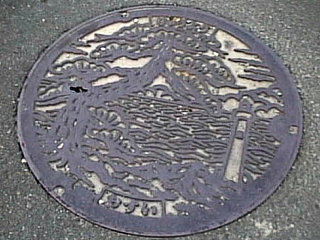 A small manhole cover in Higashi Izu Cho! 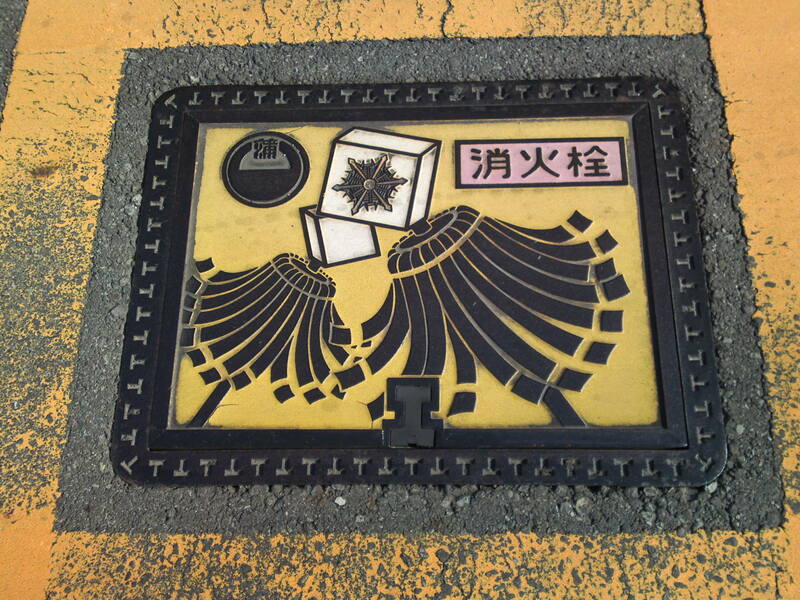 A rectangular manhole cover with a map of Higashi Izu Cho! 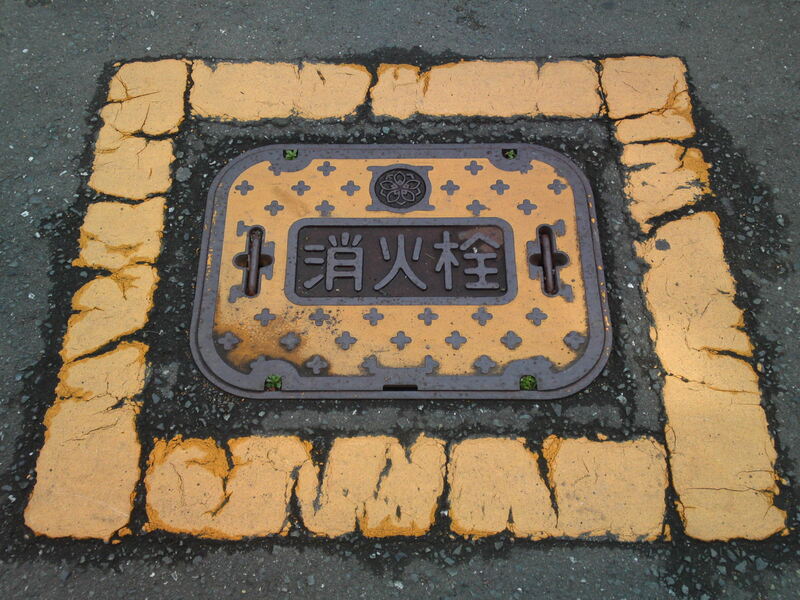 A rectangular fire hydrant manhole cover in Higashi Izu Cho! 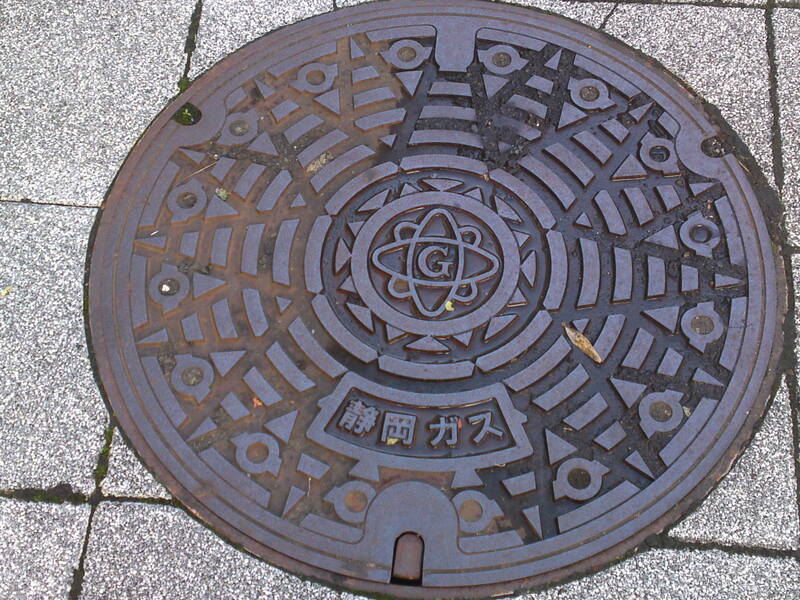 A manhole cover type found elsewhere but with the central motif of Naka Izu Cho! 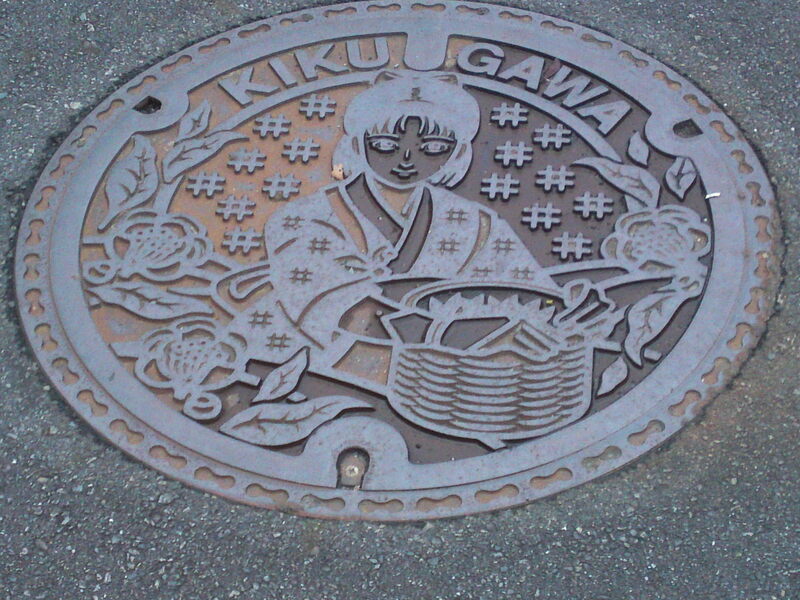 A beautiful mint sewer manhole cover from Ohito Town which merged into the new city of Izu No Kuni City! 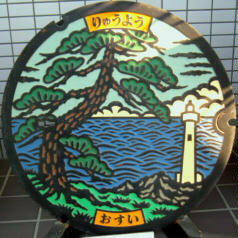 This time let’s have a look at Izu Peninsula! 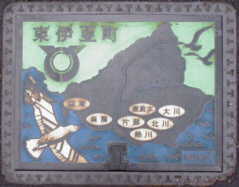 It is pretty complicated as the whole map of Izu Peninsula was revolutionized with the mergers of many towns and villages into cities, some of them brand new! 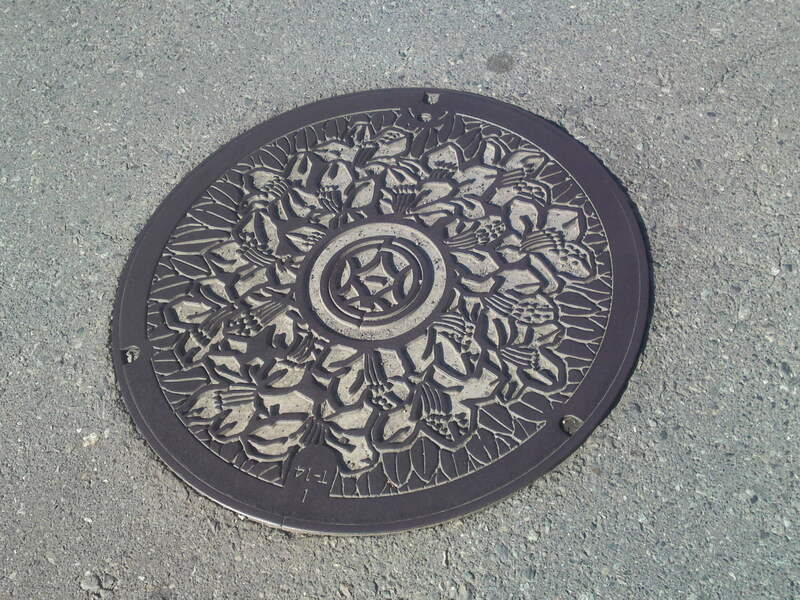 A flowery manhole cover without the colors in Ohito! 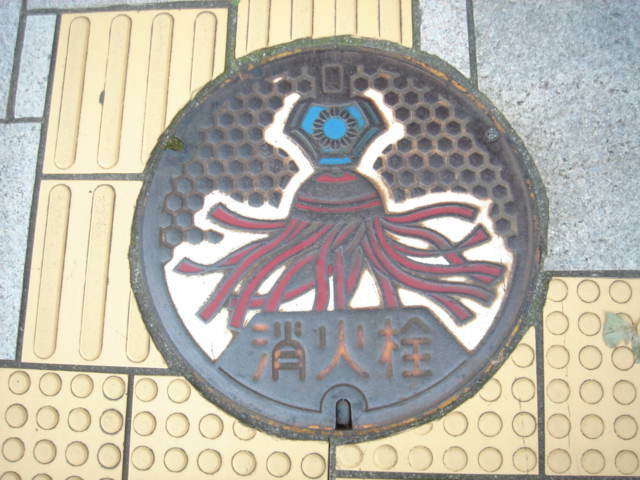 Also in Ohito a sewer type seen in many places in the Prefecture with slight differences in their central motif! 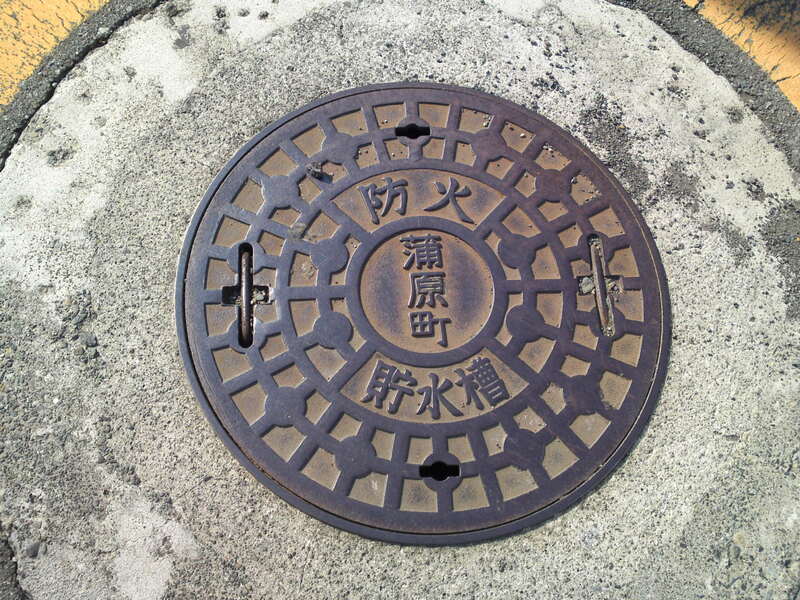 Another type in Atami City I hadn’t discovered in the former article on Atami City! 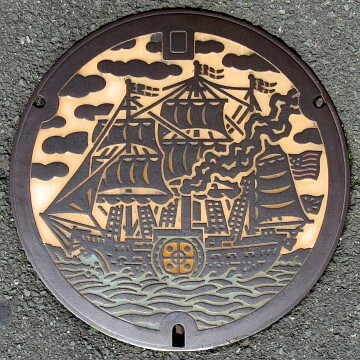 Shimoda City at the southern tip of Peninsula City boasts a lot of manhole covers due to its place in history with the arrival of the Black Ship in the 19th Century! The above mint does not have colors inside the sails! The sails in this mint are colored! Same mint as above but with a different background color! Same as above but without the colors! 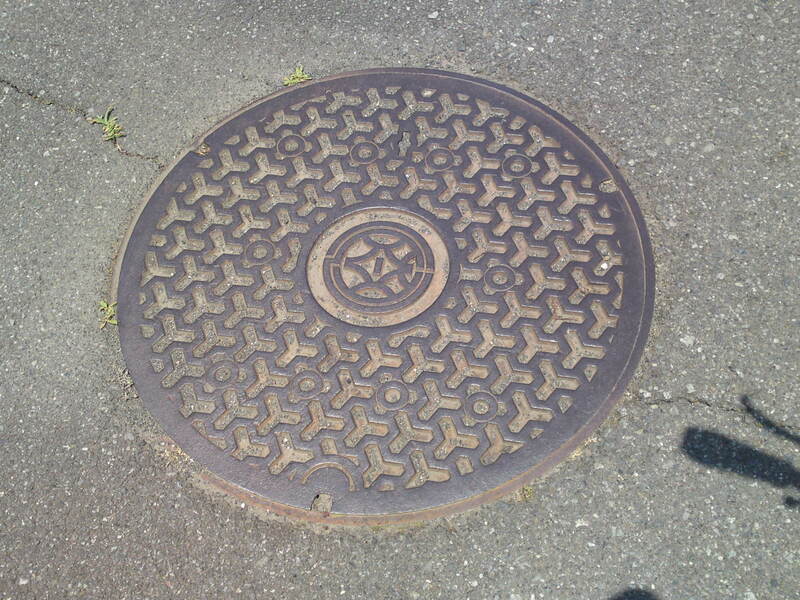 A different type without the colors! 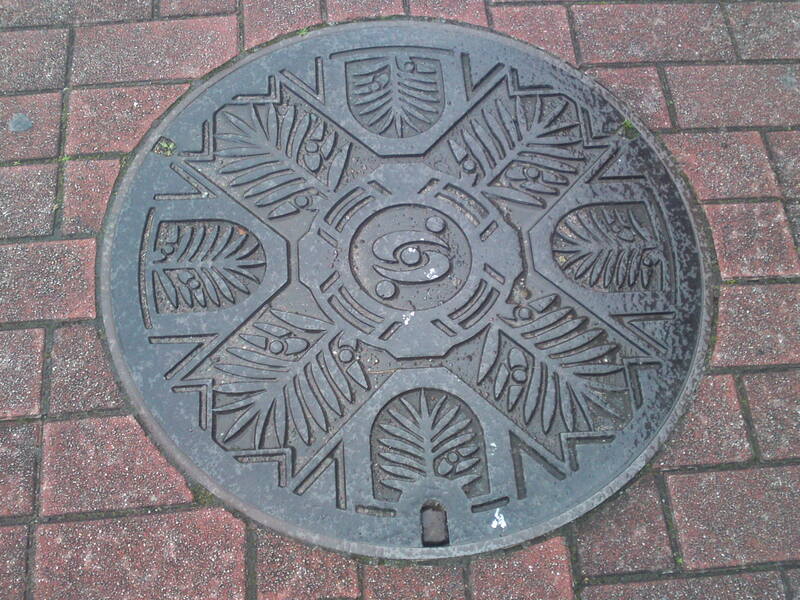 A sewer manhole cover type found elsewhere but with the Shimoda central motif! 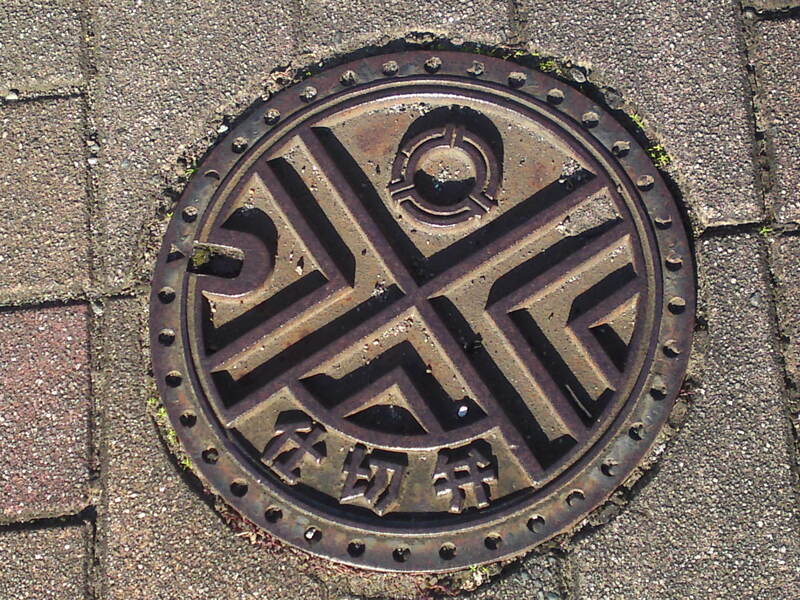 A rain water manhole cover type found elsewhere but with the Shimoda central motif! 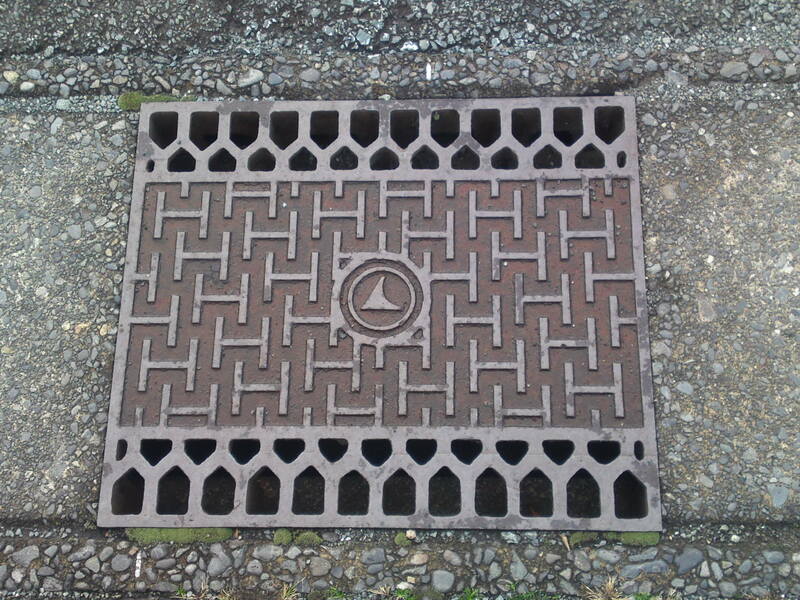 The same as above but for sewers! 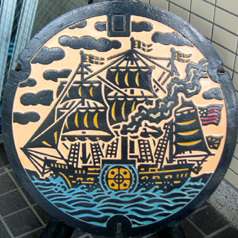 This one is not from Shimoda but doanted to Shimoda City by Funabashi Village as they share history with the Black Ship! 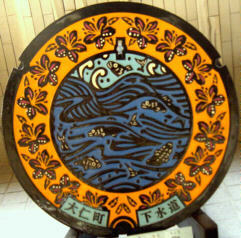 The above was also donated to Shimoda City by Naga City for the same reason! 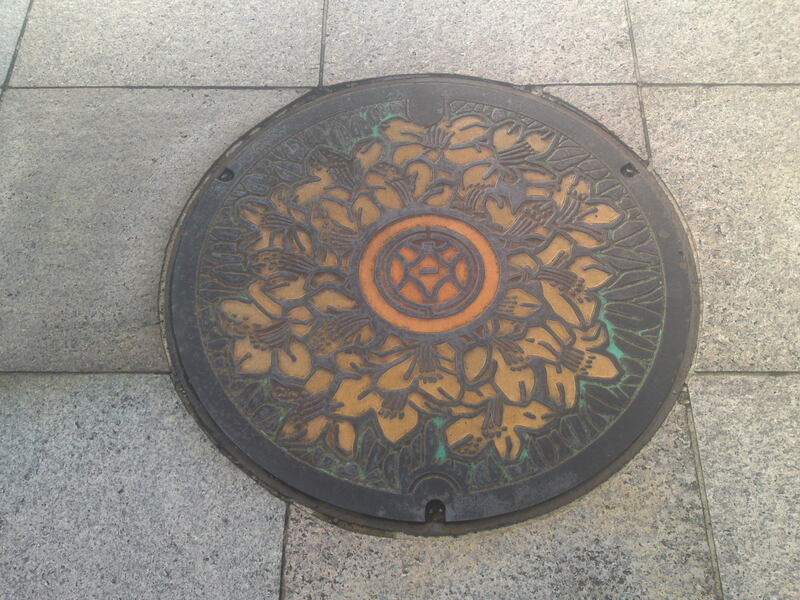 One of the most beautiful manhole covers in Yaizu City I discovered near the City Hall! 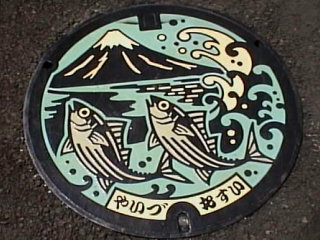 I couldn’t determine if the fish are tuna or bonito as both are brought there in large numbers! 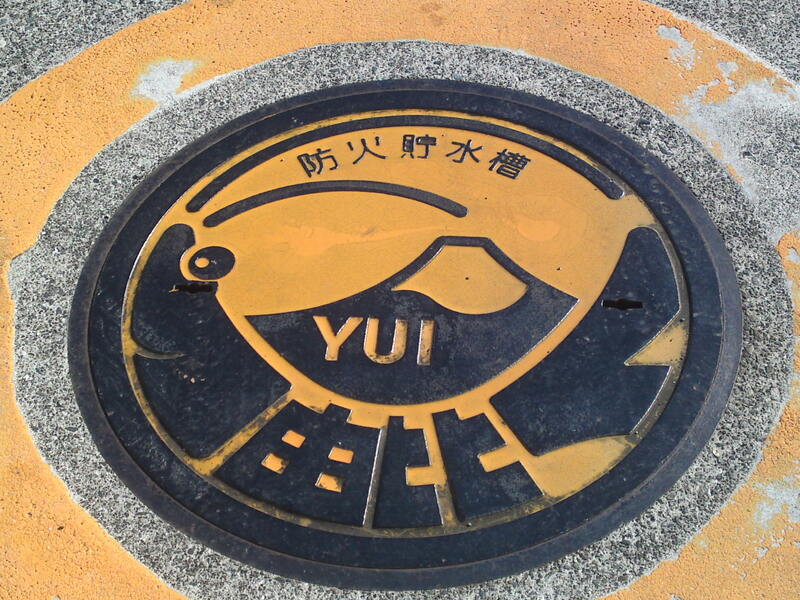 Yaizu City is one of the major fishing harbor cities in Japan with Numazu City and Shimoda City Tokyo couldn’t survive without. 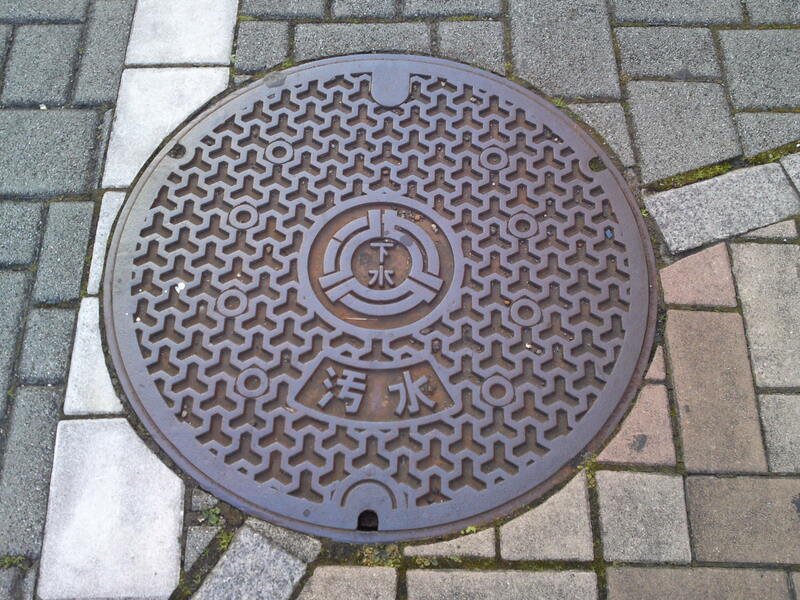 The other day I intensively research the city for manhole covers and I came with more than I bargained for as I included the whole technical range! 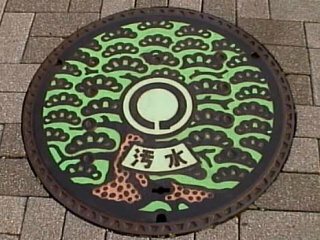 An older big manhole with tuna/bonito! I couldn’t find it colored version! 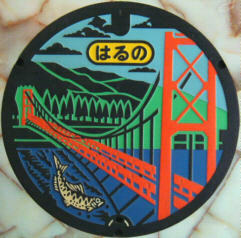 This one is probably the most famous of all with Mount Fuji and tuna/bonito! The same in different colors! 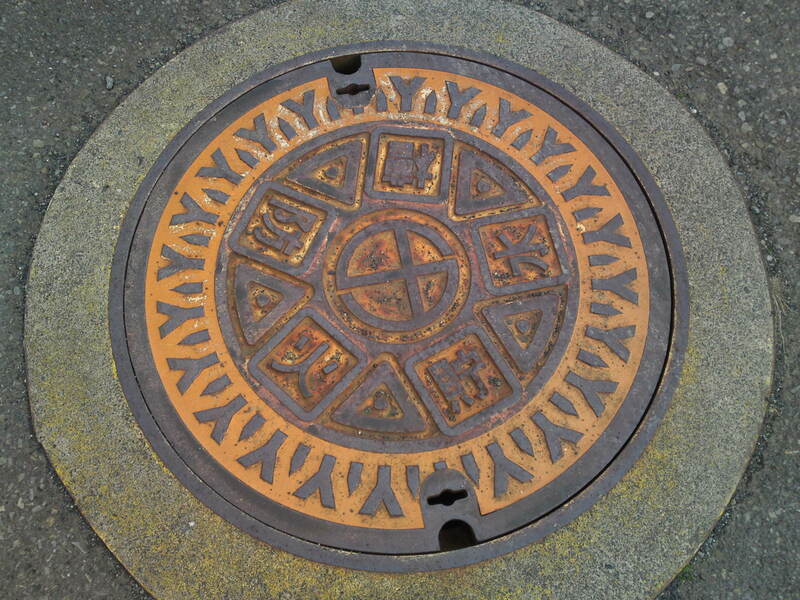 An old-style sewer manhole cover! 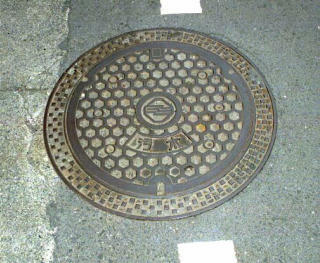 The same but newer and different in minute details! 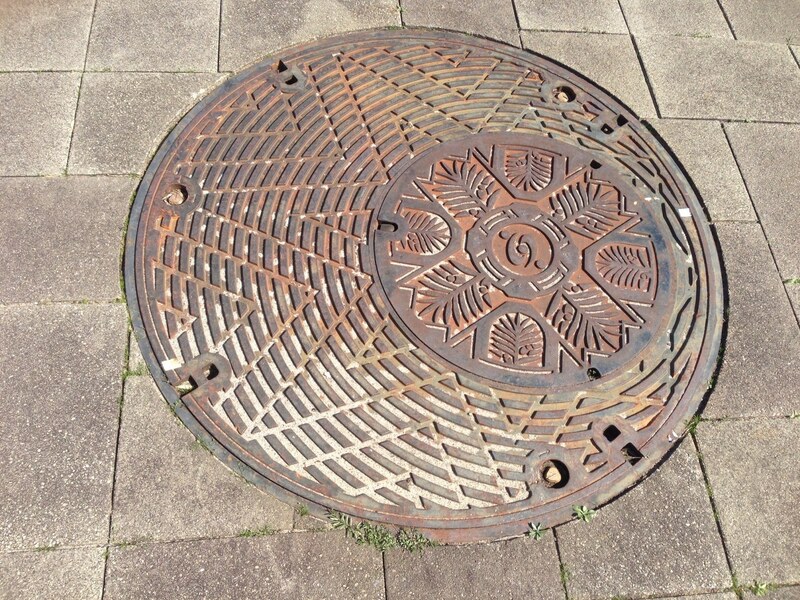 This manhole cover was truly enormous! 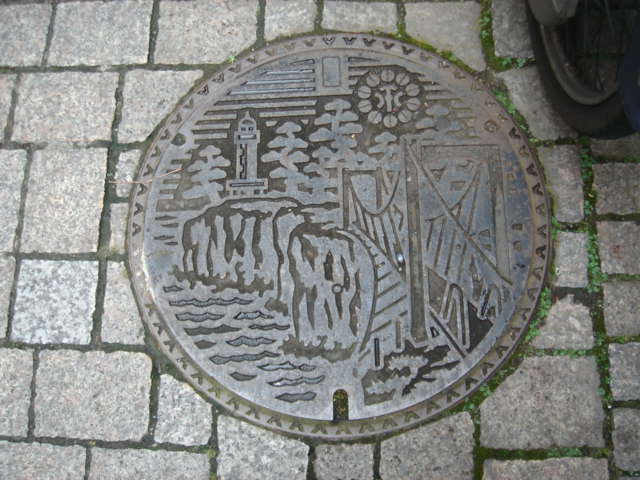 Another sewer type manhole cover! 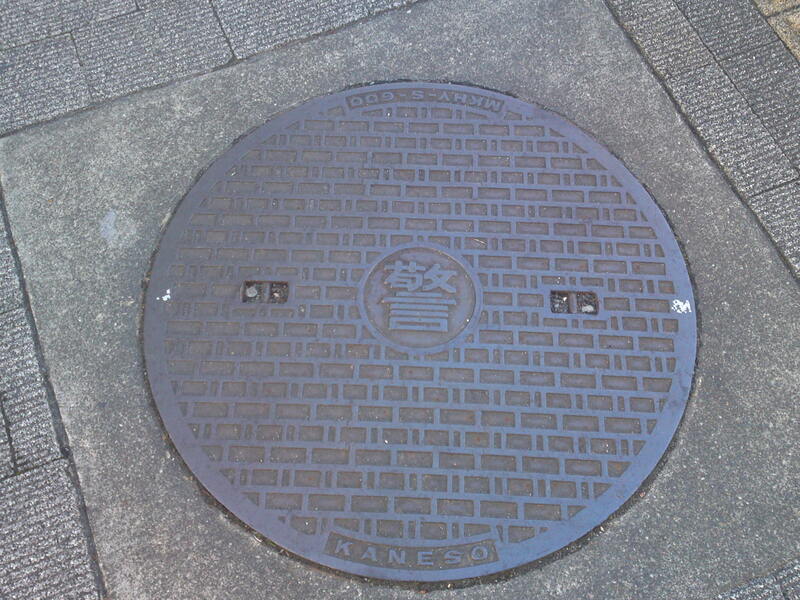 A very large sewer-type manhole cover! 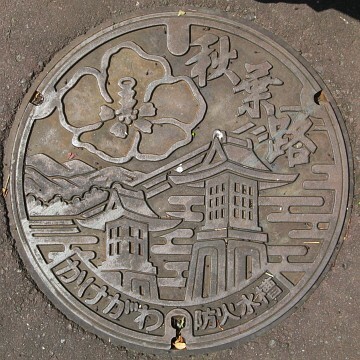 Note the central motif generally found in Yaizu City! Practically the same but medium-sized! 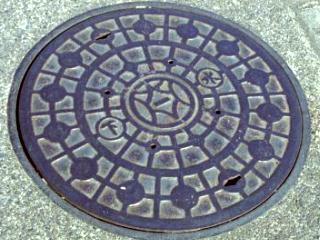 A similar but older type and without the central motif! 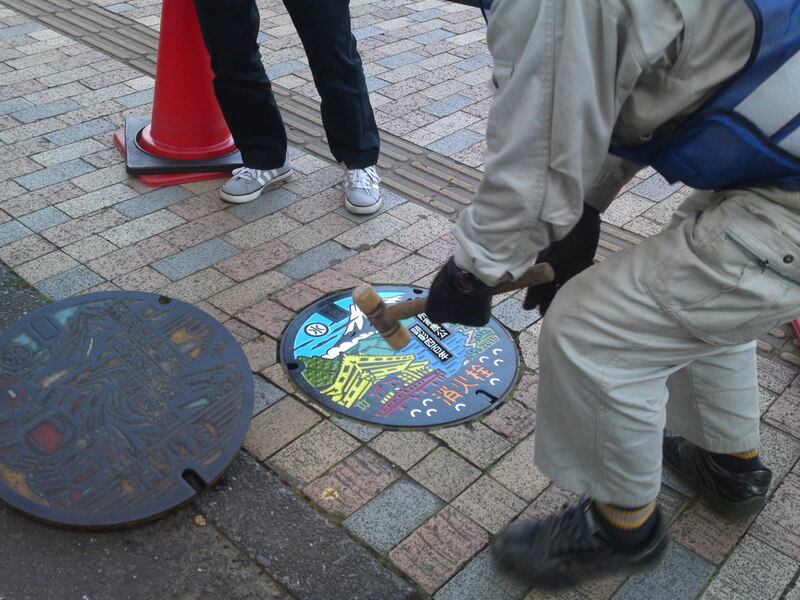 Another celebrated manhole cover over a fire hydrant and celebrating the Yaizu Harbor Festival! 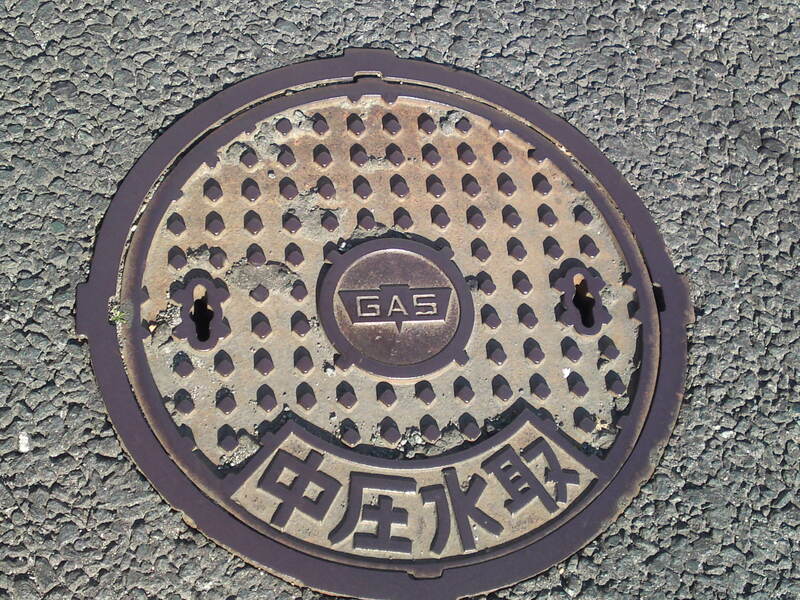 This type can be found in many cities but this is the first time I discovered one with “GAS” written in English! 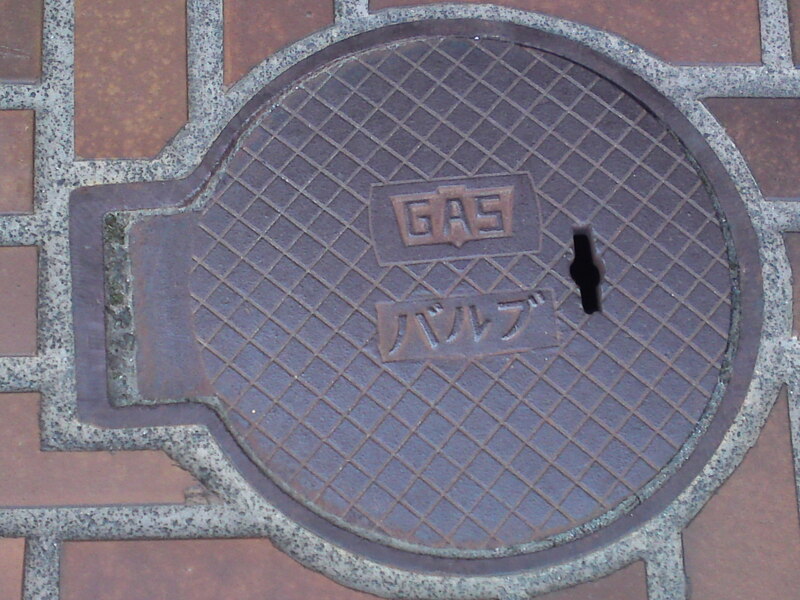 Once again a common small sized one but with “valve pit” written in English and “GAS” in Japanese! 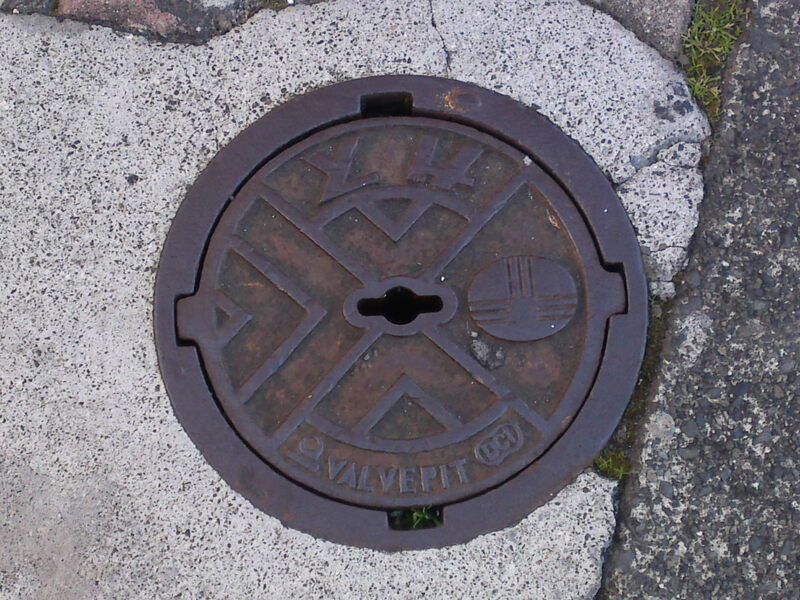 The same as above but “valve pit” both in English and Japanese! 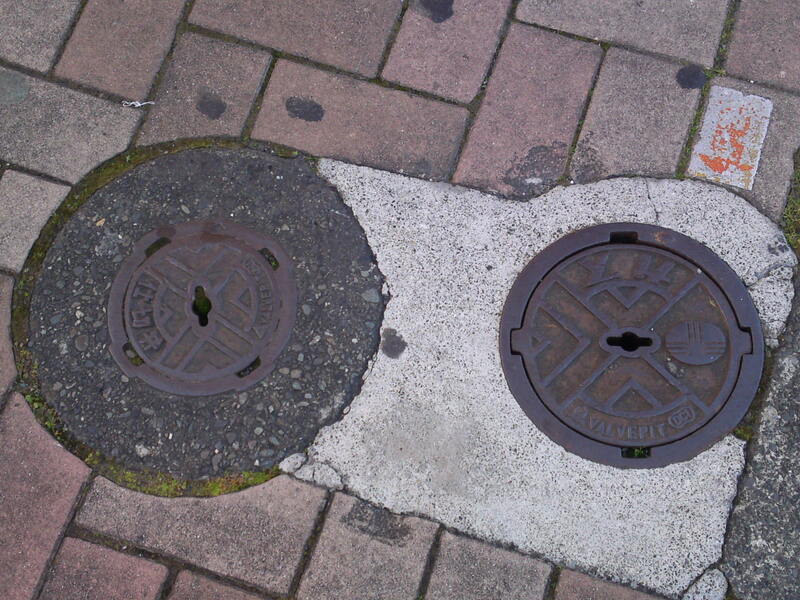 The two of them side by side! A large one “blended” in its surroundings! 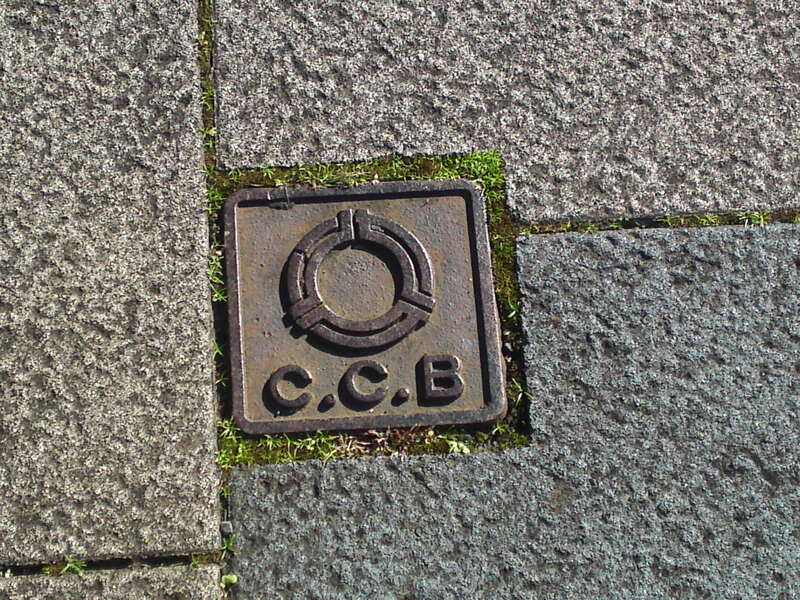 I will have to to find out what “C.C.B.” means! 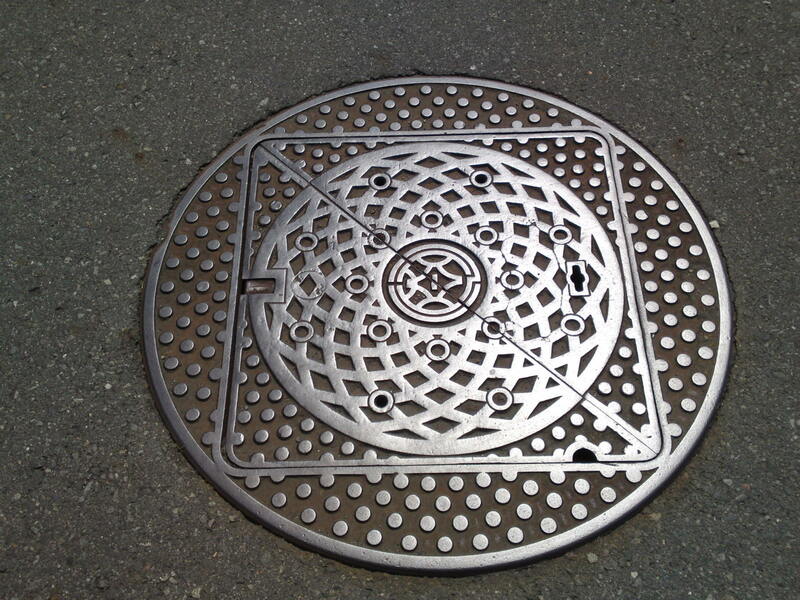 Another modern but rectangular sewer manhole cover “blended” into its surroundings! 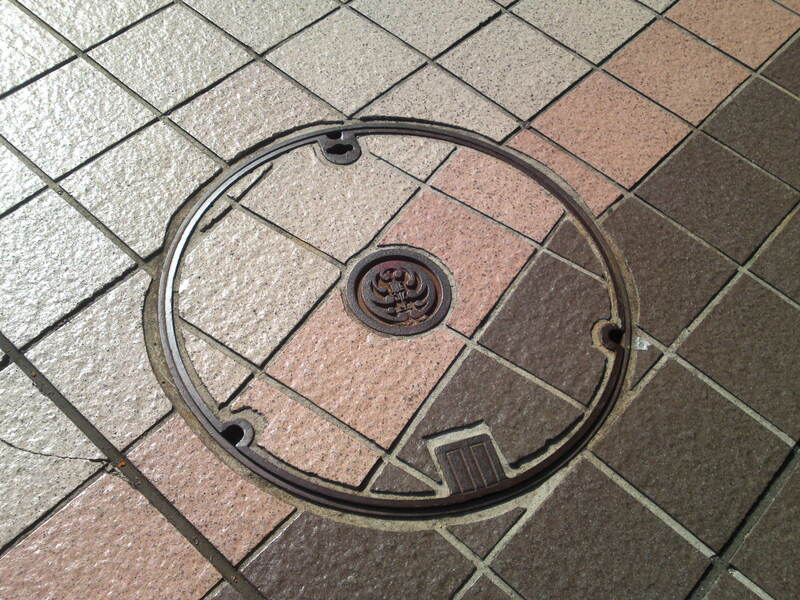 Similar as above but square! Two different types together over heavy water machinery access! 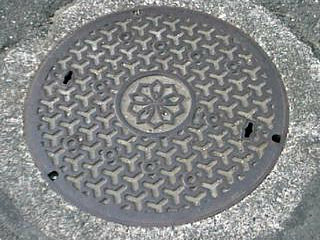 I found many of this small and cute type in the city so I doubt that they are private! An older and slightly smaller version than the above! 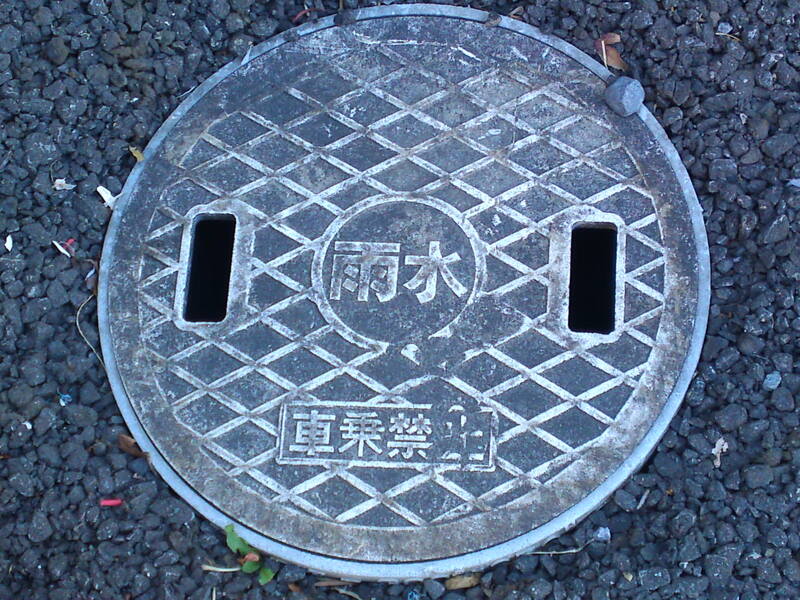 A newer type of a water valve pit cover with clear measure indications! 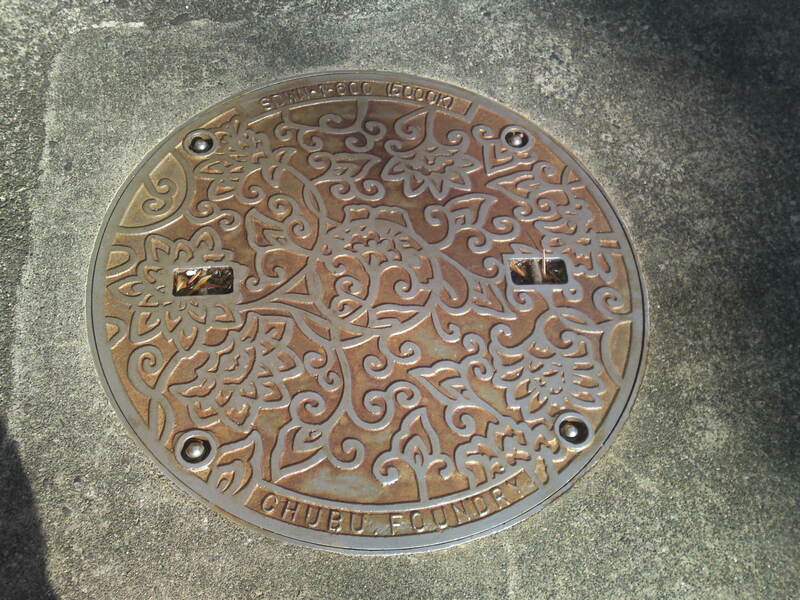 Another newer water valve pit cover,probably private! 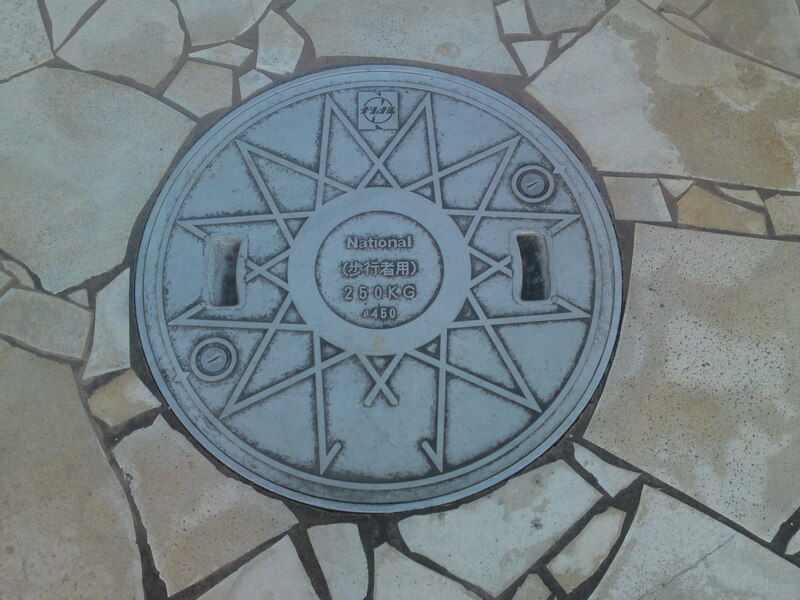 A private water valve pit cover! 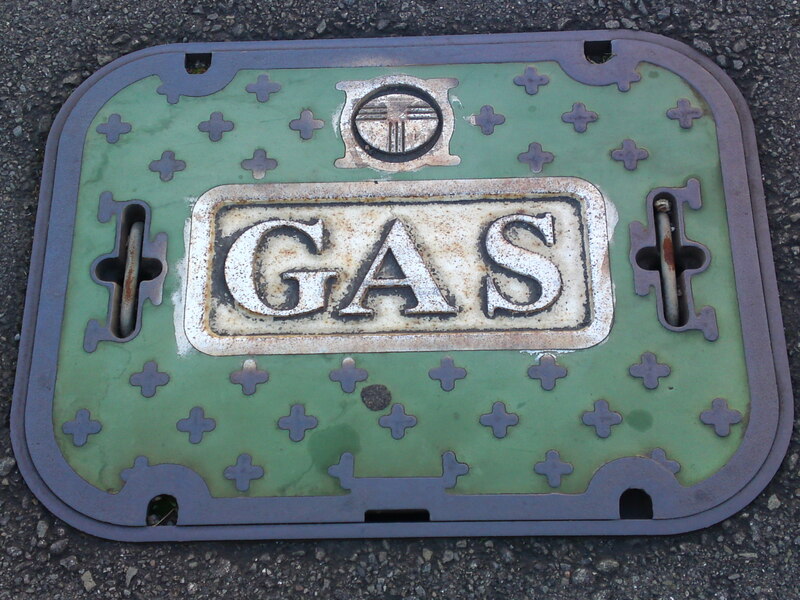 An old gas valve pit cover! 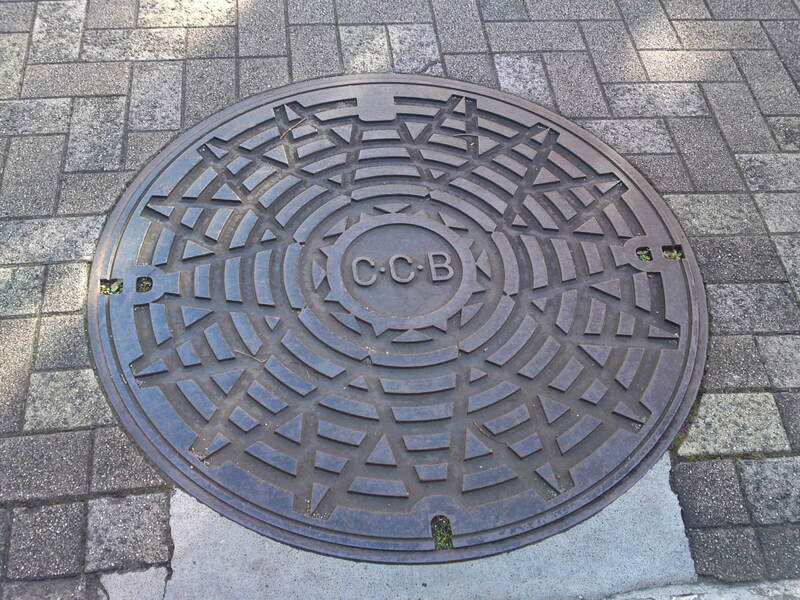 A tiny C.C.B valve pit cover with the Yaizu City motif! 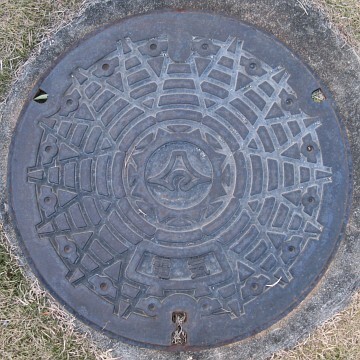 An old medium-sized sewer manhole cover! 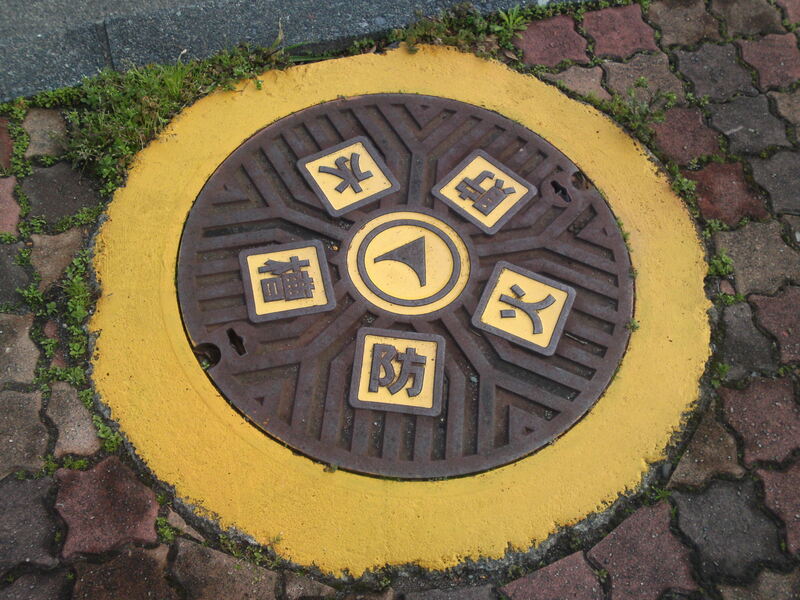 A medium-sized sewer manhole cover which can bear up to 400 kg! 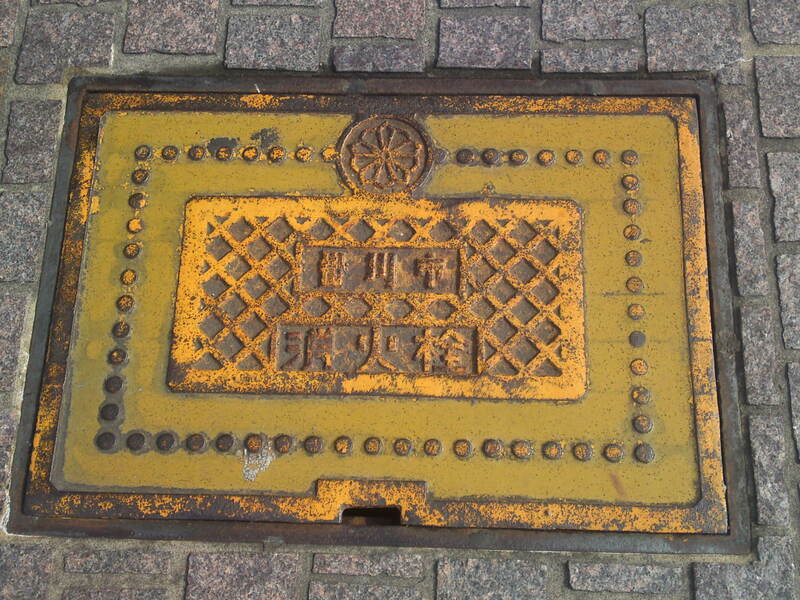 A rare old type of valve pit cover! 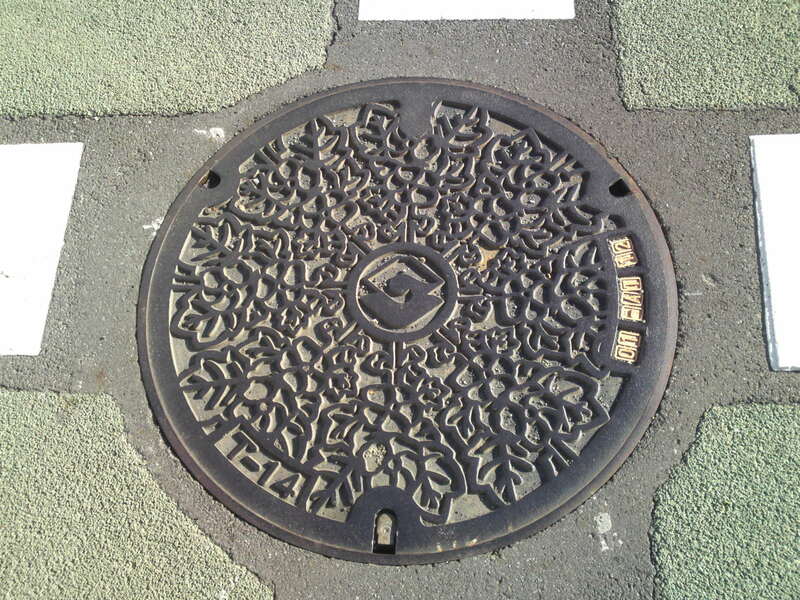 This comparatively small-sized private rain water cover is written with “No cars allowed to run over”! 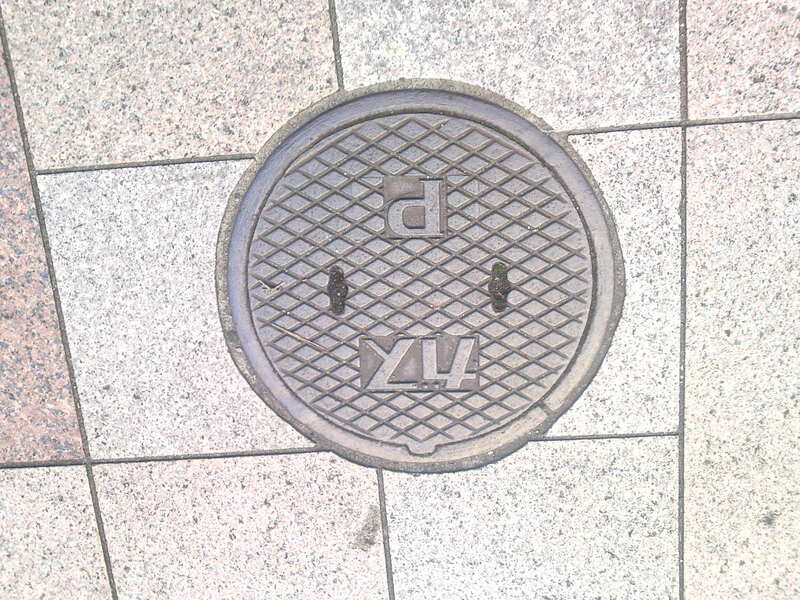 The same, but form another company! 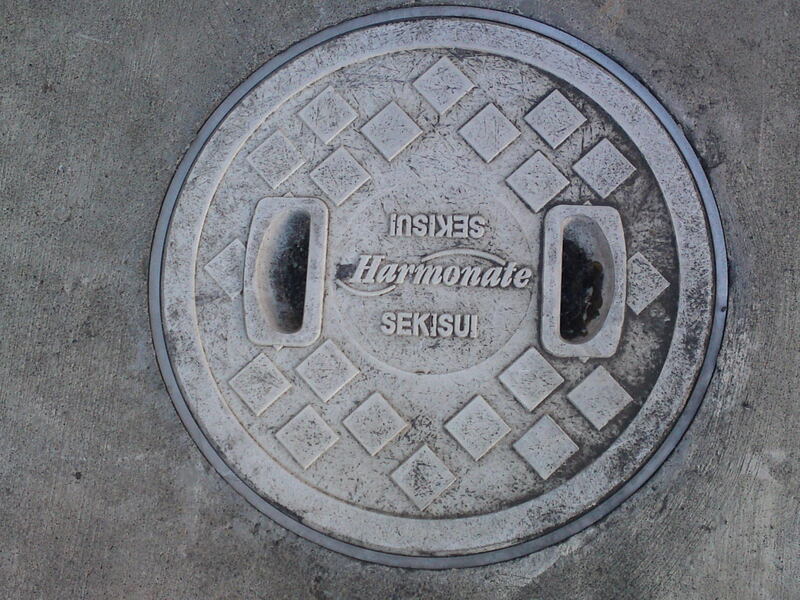 This one is owned by Harmonate Company! 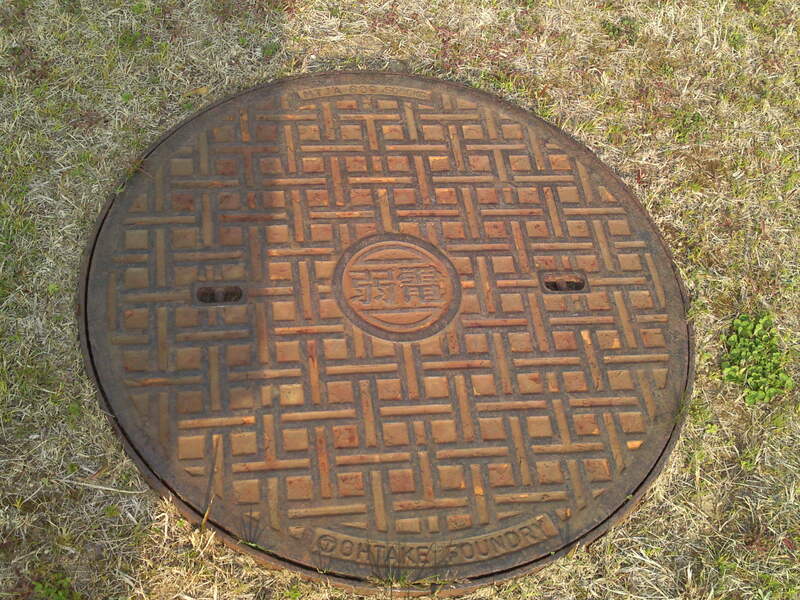 A smaller and different type from the same company! 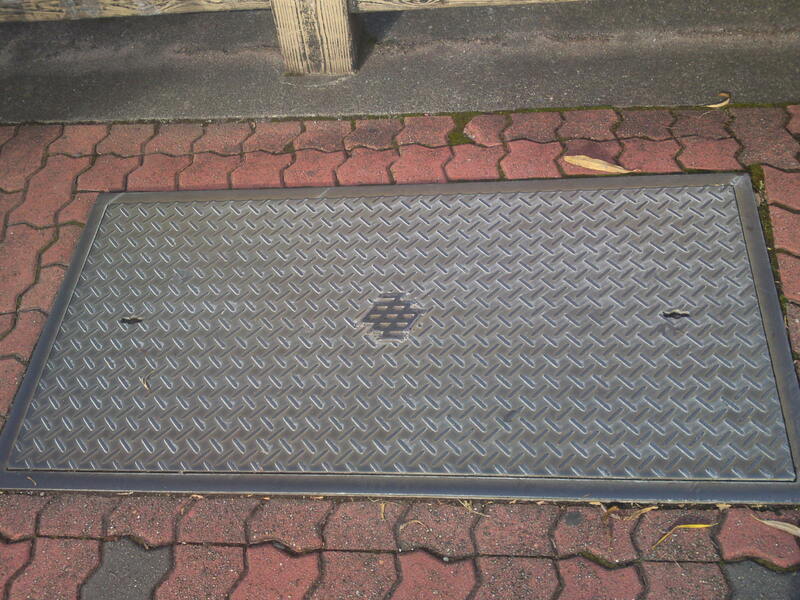 I found this medium type rain water cover on the platform of Yaizu JR station platform which can bear up to 400 kg! 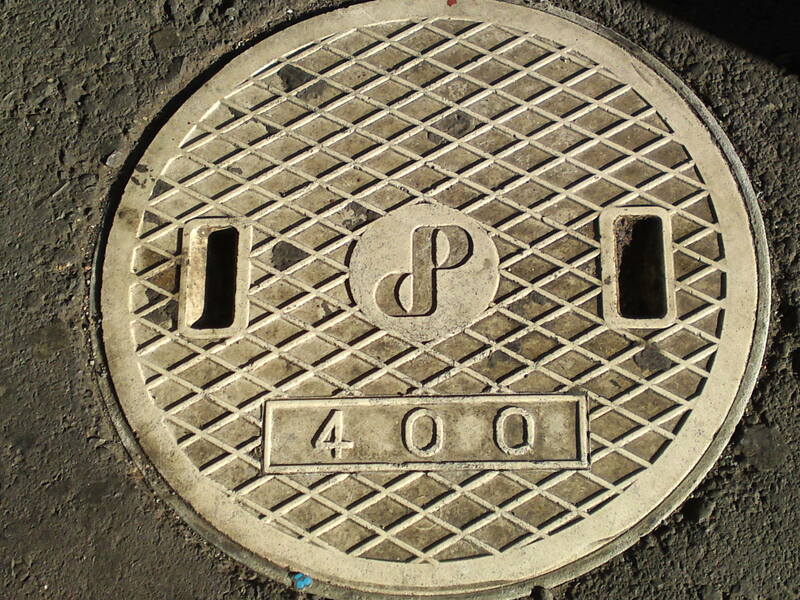 The same as above but without the central motif and the ability to bear up to 450 kg! Blimey, 37 pictures in all! 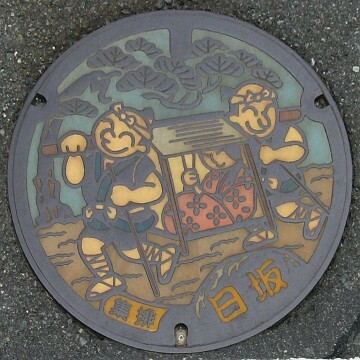 Sewer manhole cover in Maisaka! 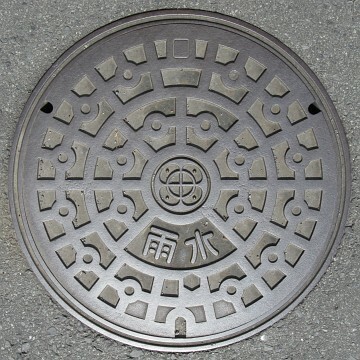 Hamamatsu City is the largest city in Shizuoka Prefecture both in area (Number 1 in Japan, too) and population in Shizuoka Prefecture and counts a lot of varieties in manhole covers , especially accounting for towns and cities recently merged! 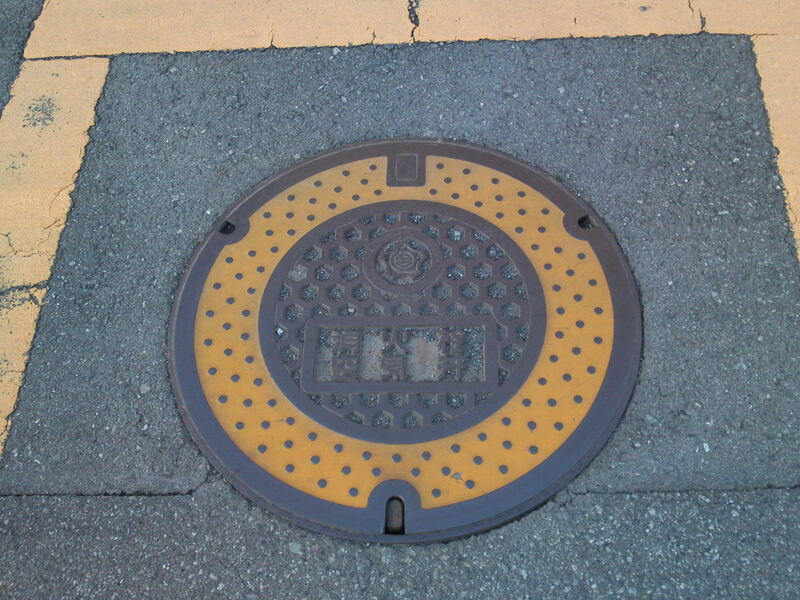 Manhole cover in Maisaka, same a s above, but in different colors! 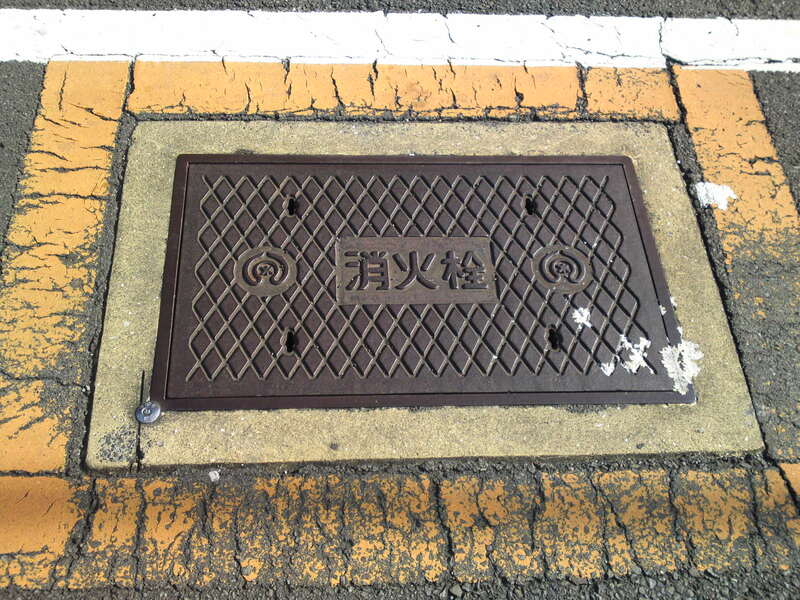 An unusual rectangular manhole cover in Maisaka over a fire hydrant access! 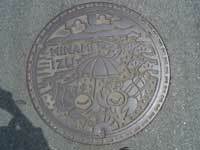 A mint sewer manhole cover in Hamakita! 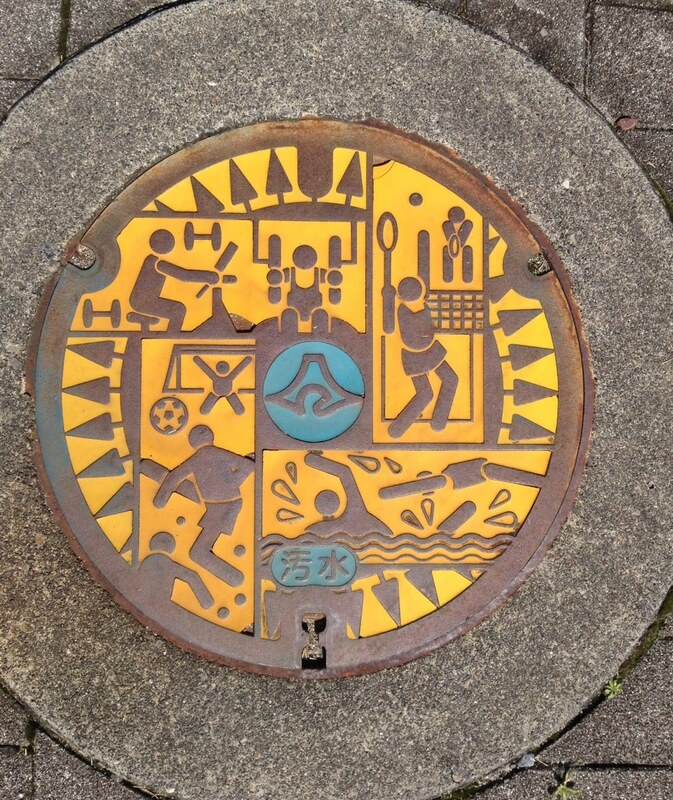 A mint water access manhole cover in Hamakita! 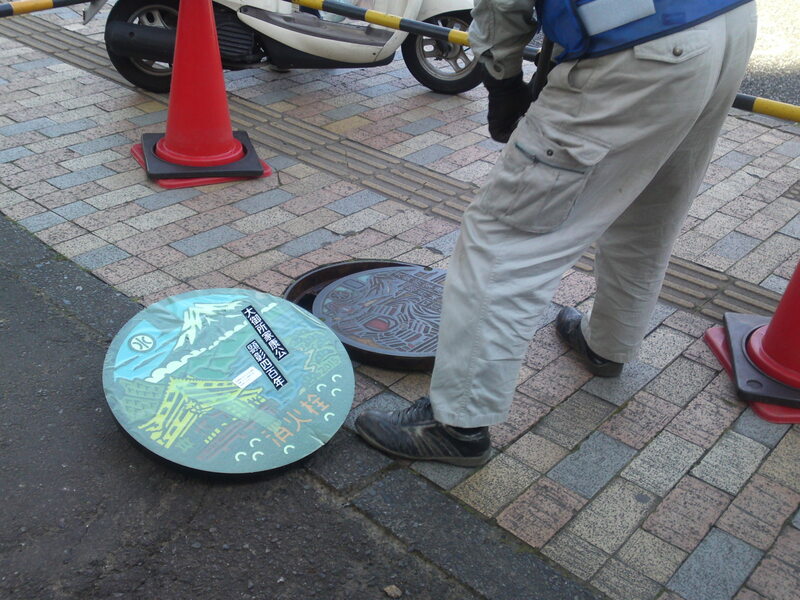 Another mint water access manhole cover in Hamakita! 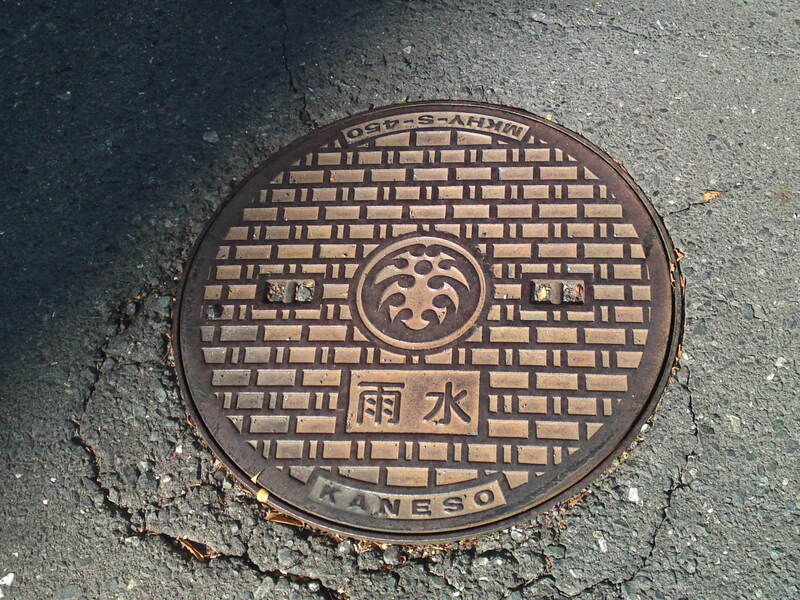 A beautiful mint manhole cover in Haruno! 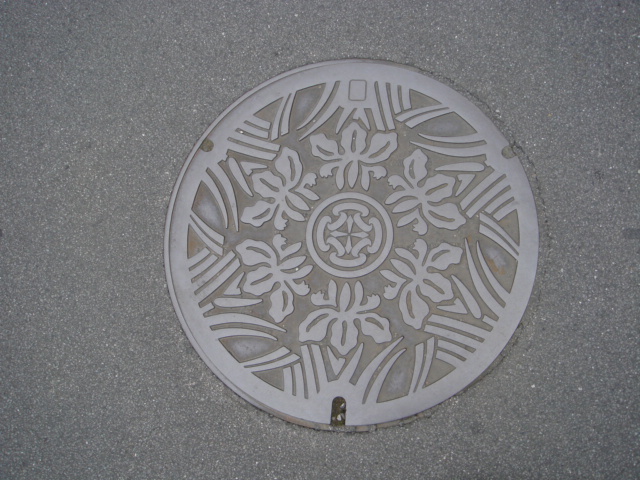 A splendid mint manhole cover in Hosoe with an ancient bell motif! 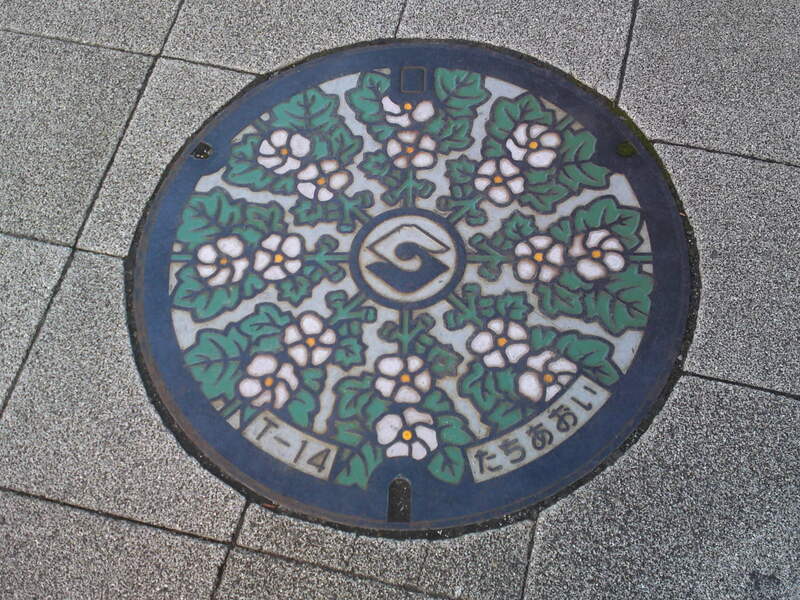 A beautiful mint manhole cover in Inasa describing it as the “Greenery and Flowers City”! 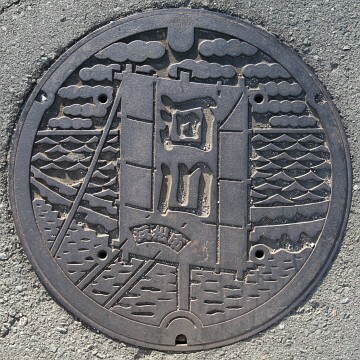 A mint water access manhole cover in Sakuma with the Sakuma Dam! 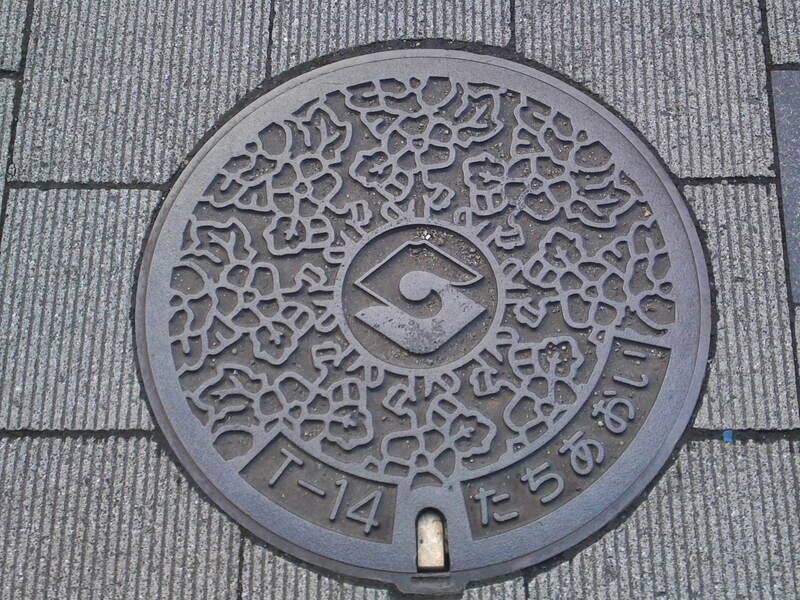 A beautiful mint manhole cover in Tenryuu! 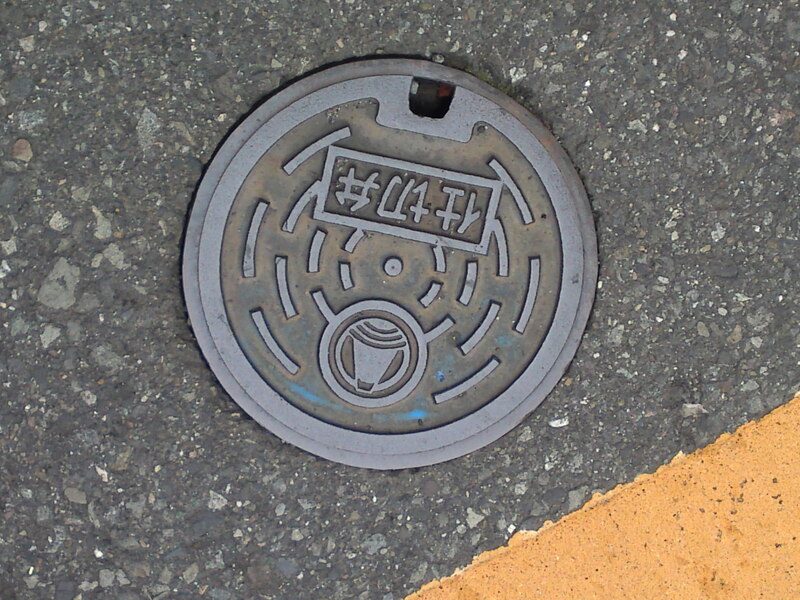 A manhole cover over a fire hydrant in Tenryuu! 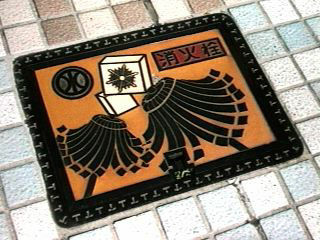 A sewer manhole cover in Yuuto! 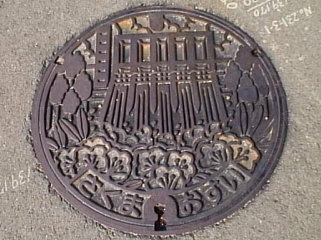 The mint of an old sewer manhole cover! 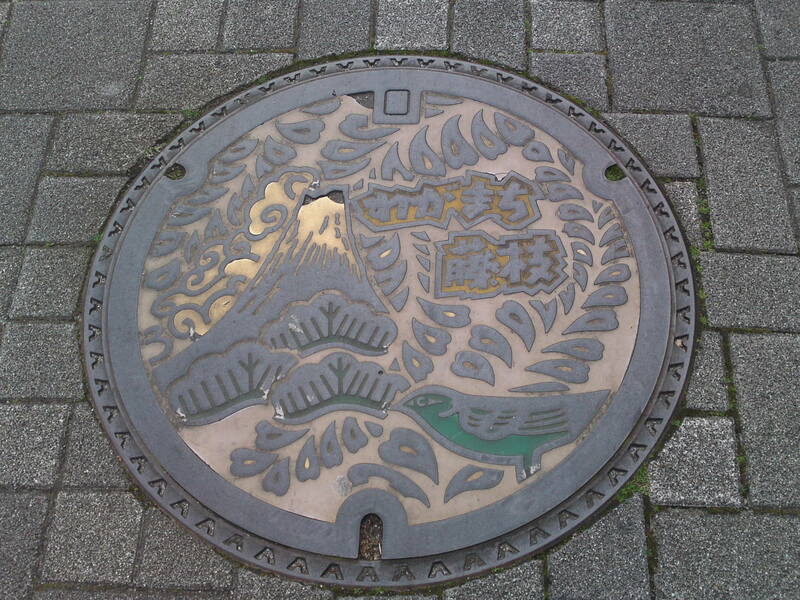 Hamamatsu City is the largest city in Shizuoka Prefecture both in area (Number 1 in Japan, too) and population in Shizuoka Prefecture and counts a lot of varieties in mnahole covers, not accounting for towns and cities recently merged in which will be for the next posting! 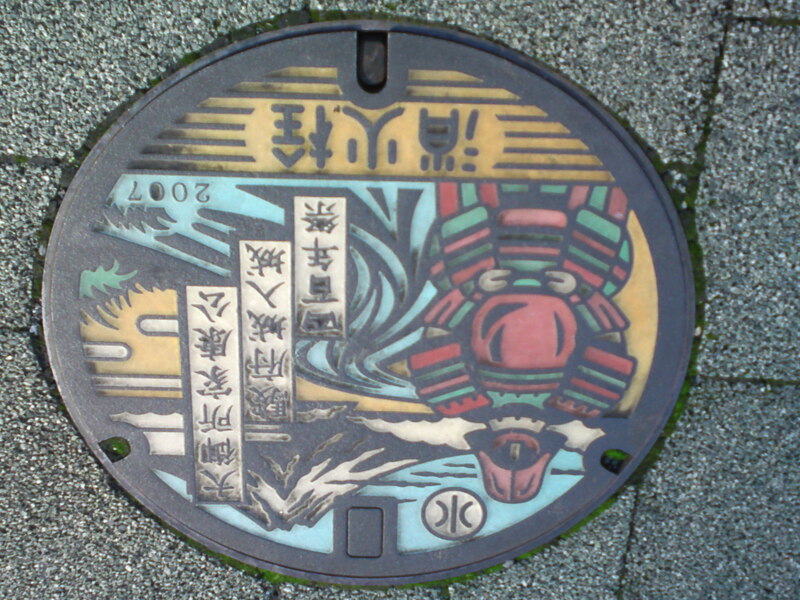 A mint for sewer manhole cover with a kite to advertise the Hamamatsu Kites Festival held every year during the first week of May! 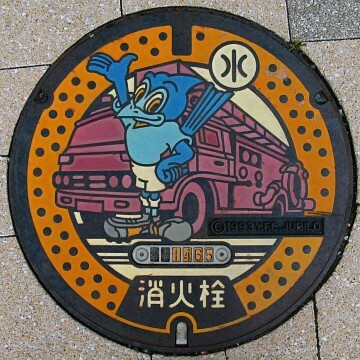 An unusual sewer manhole cover with the drawing of a “kappa”! 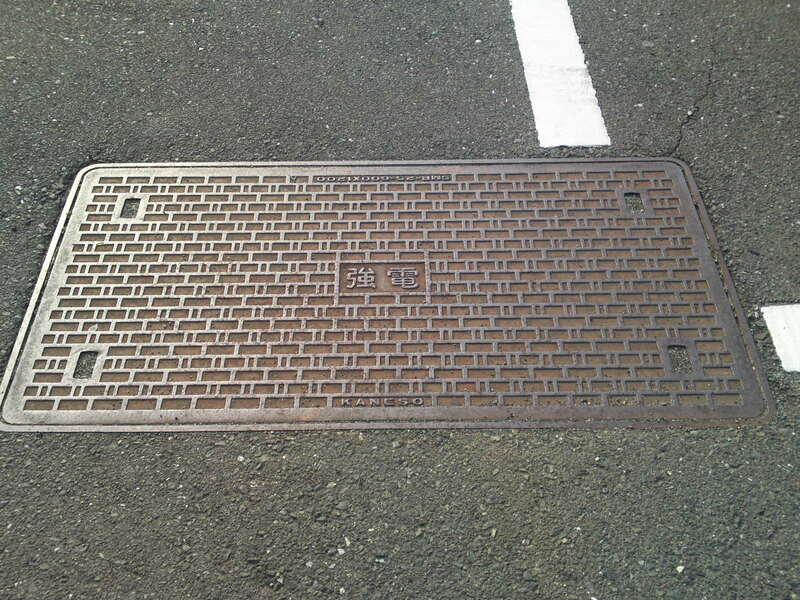 A rectangular manhole cover also with a sole! Now, what could be that fish? 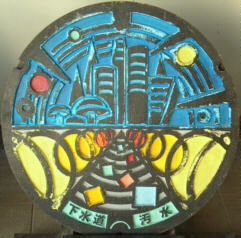 A very old one representing bamboo tree decorated with “Tanabata” Festival motive messages! 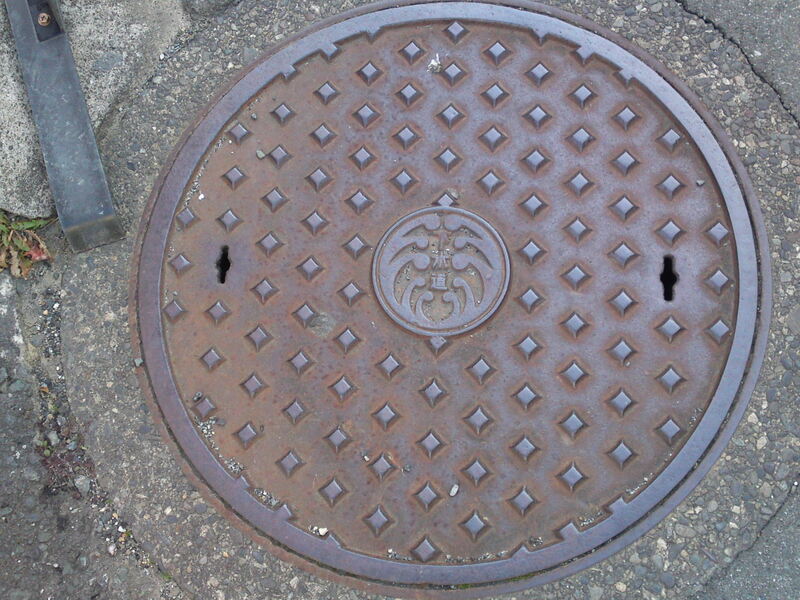 The one above and the two below have already been introduced in another article but I added them to complete the Hmamatsu City report! 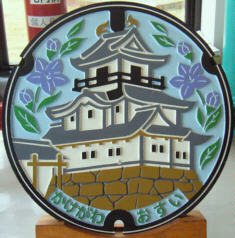 One of the Kakegawa Castle Mints! 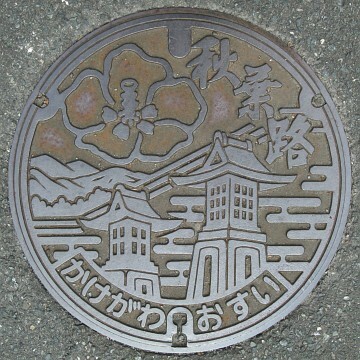 Kakegawa City in central west Shizuoka Prefecture is a city has certainly grown big, at least in area, when many surrounding towns were merged into it. 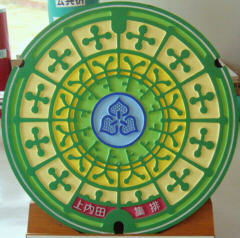 It also boasts a castle, a copy made in late 20th Century. 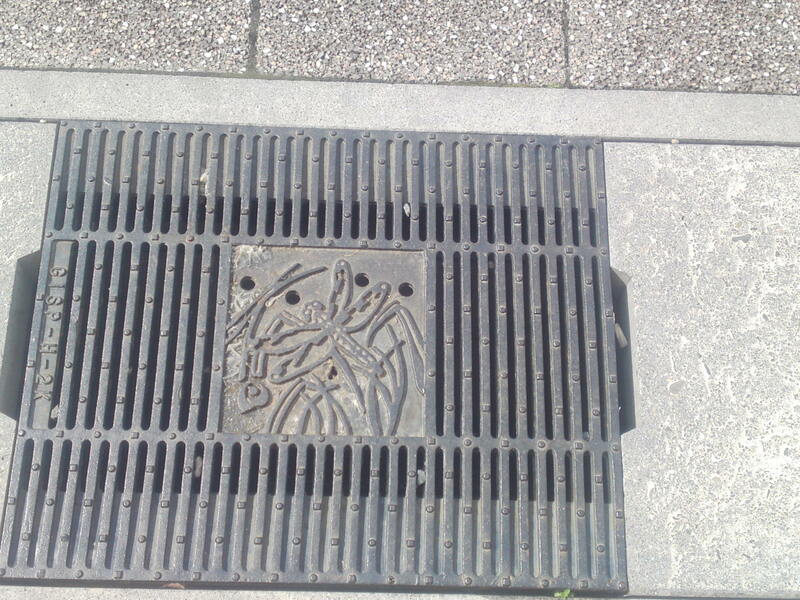 The same as above on a pavement! Another mint in different colors! 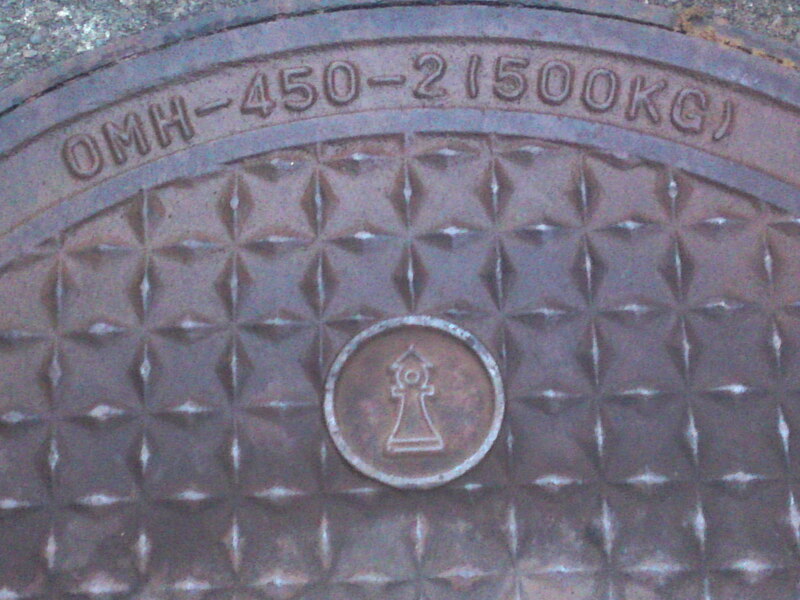 The same as above but over a Fire Station Water tank! 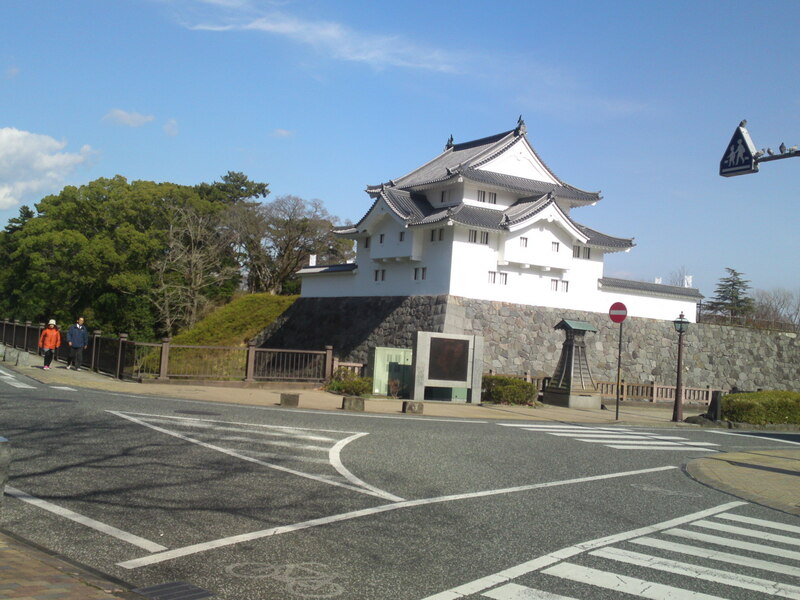 A version of the Kakegawa Castle without the colors! 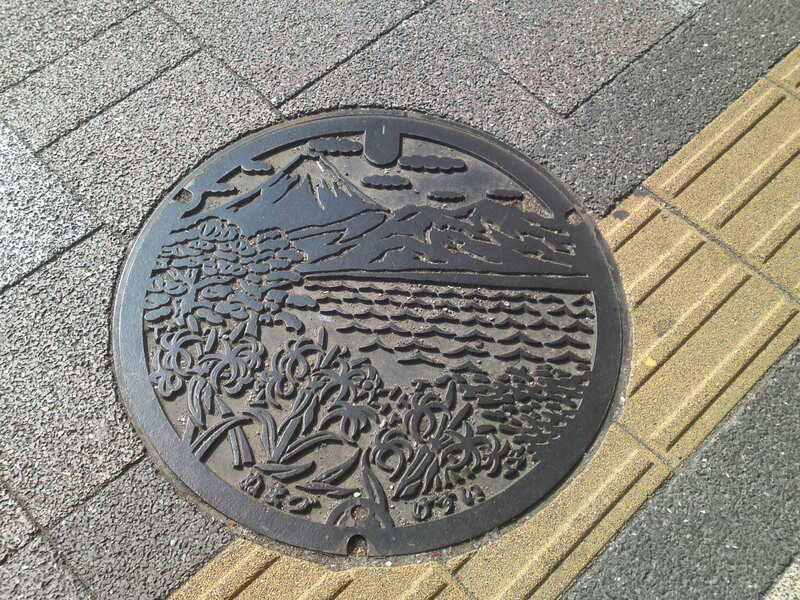 This particular manhole covers commemorates the fact that Hisaka In Kakegawa City was the 25th Station of the Old Tokaido Road as painted by Hiroshige! 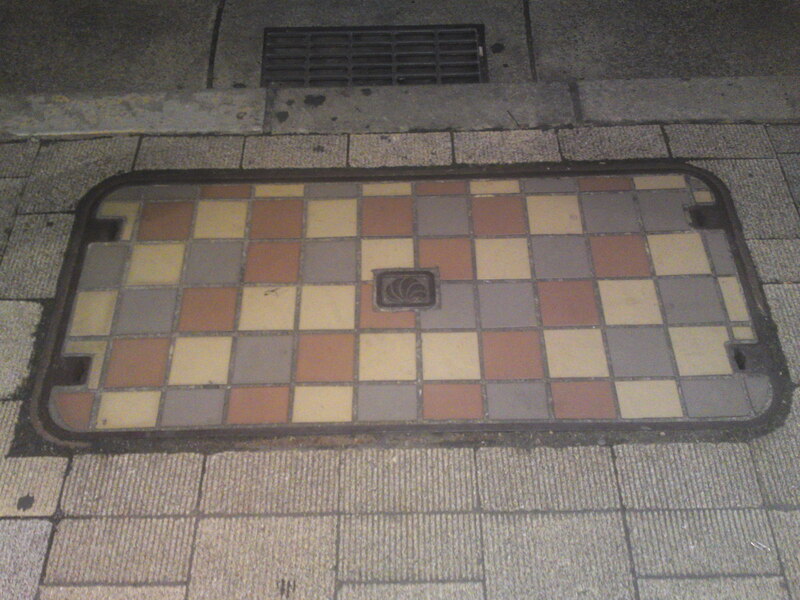 The same on a pavement without the colors! 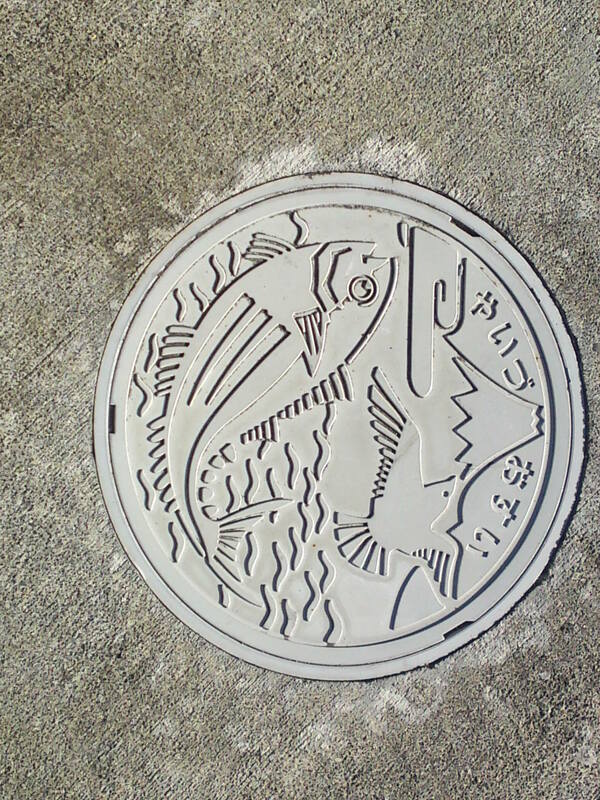 A rain water manhole cover! 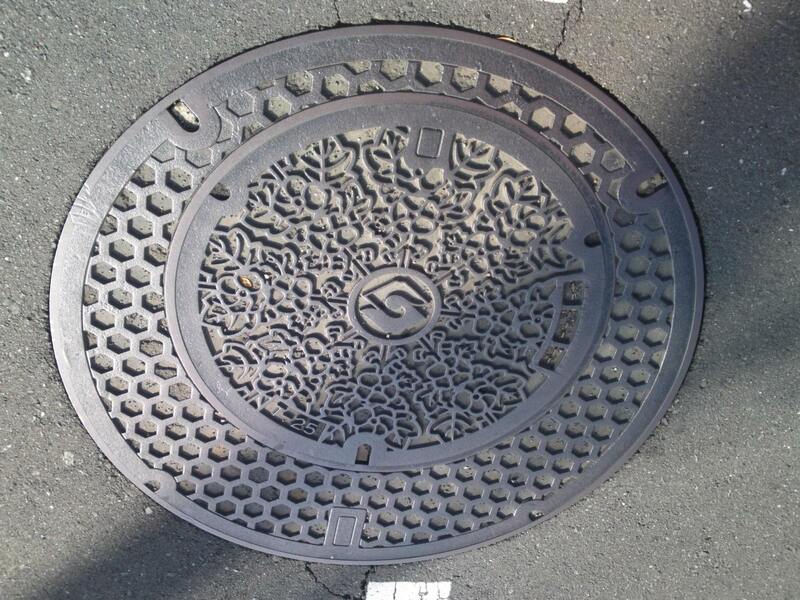 Probably a sewer manhole cover! 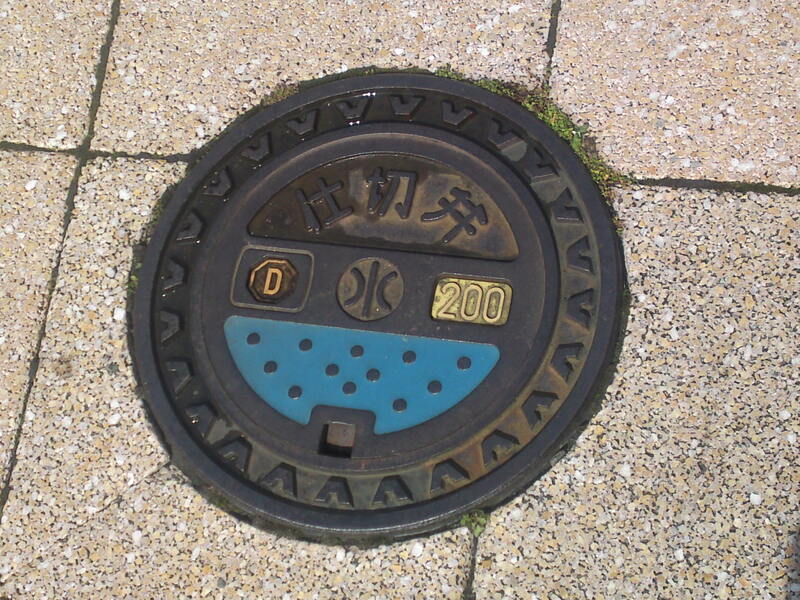 A beautiful mint for Kamiuchida District! 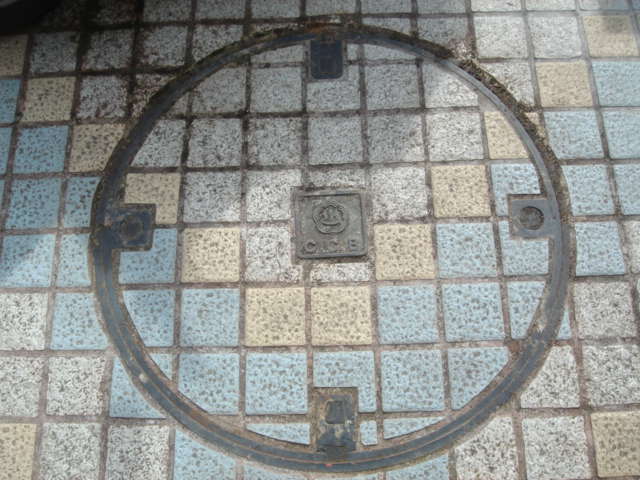 Manhole cover in Daito Cho which has since been merged into kakegawa City! 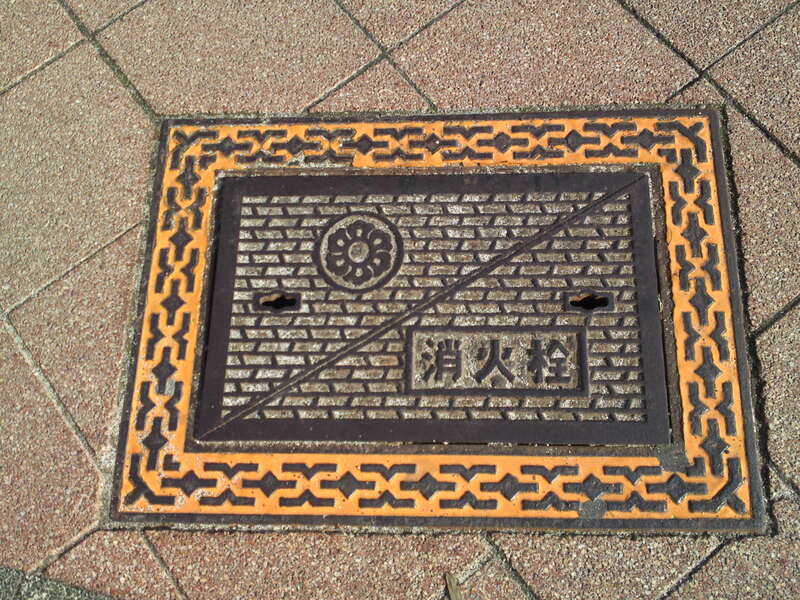 Electric cable access manhole cover in Ogasayama Sports Center! 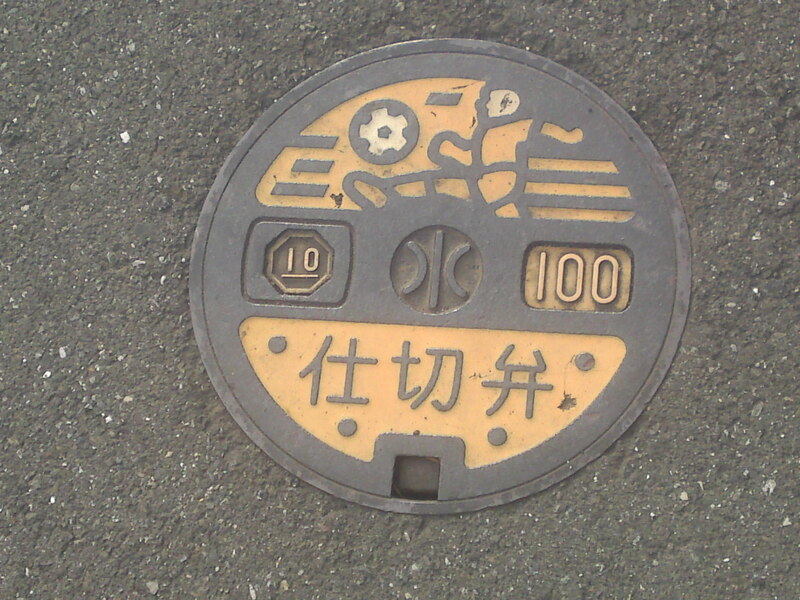 Another electric cable access manhole cover in Ogasayama Sports Center! 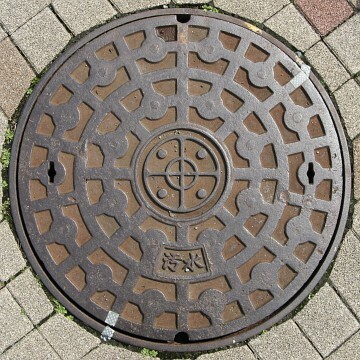 the mint for a sewer manhole cover in Osuka Town which has been merged since with Kakegawa City! 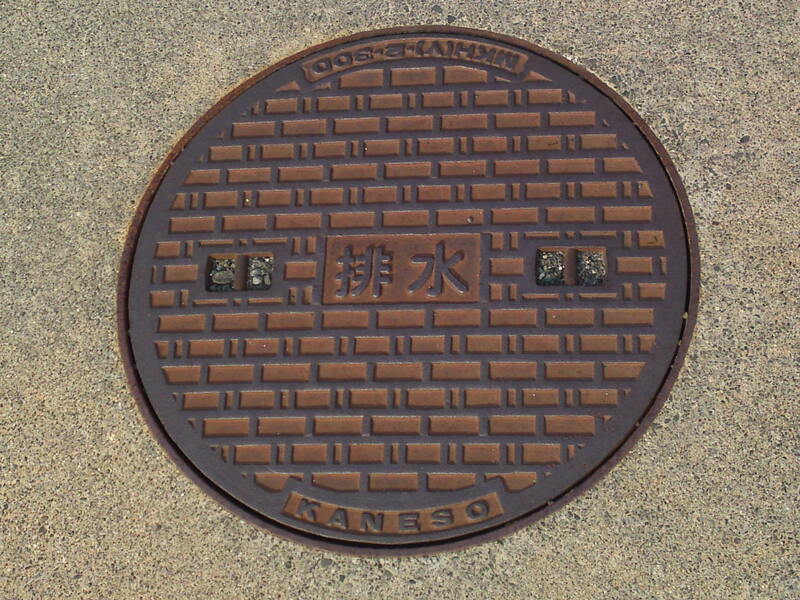 Another mint for a manhole cover in Osuka Town which has been merged since with Kakegawa City! 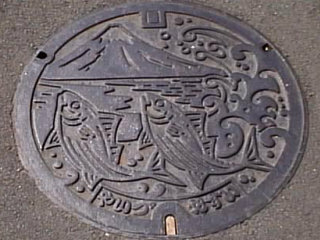 Beautiful Shimizu City (before it was merged with Shizuoka City) manhole cover for “river waters” discovered by my good friend Atsuko Kurata in Sodeshi, Shimizu Ku, Shizuoka City! 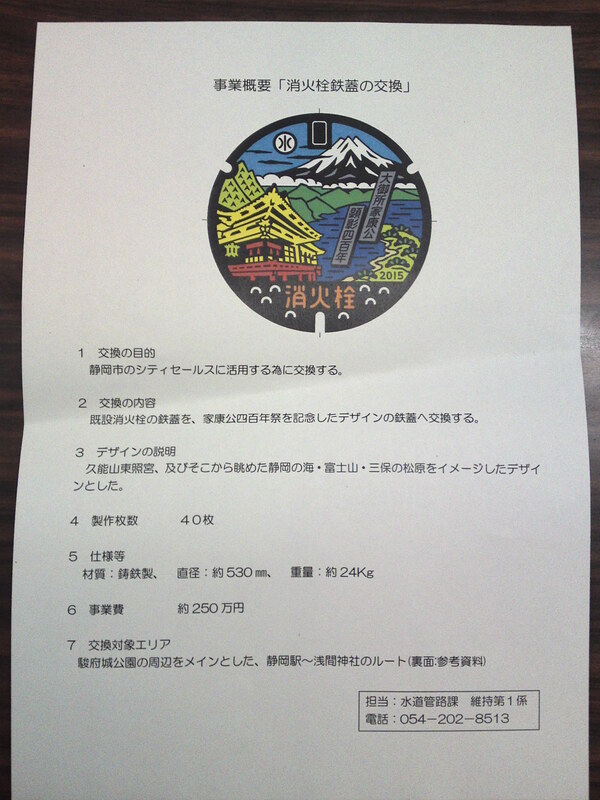 For this particular blog let me come back to Shizuoka City where I found more “technical information”! 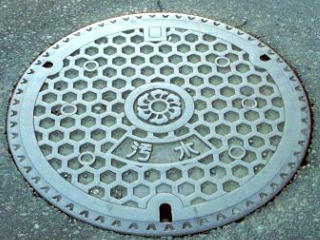 The “mint” of the above manhole cover! 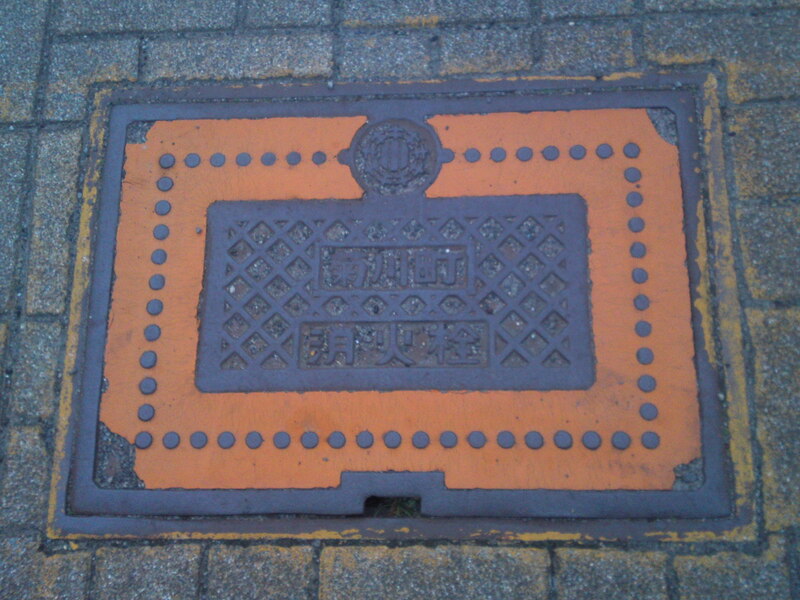 An old manhole cover in Shimizu City (now Ku) for soil running. 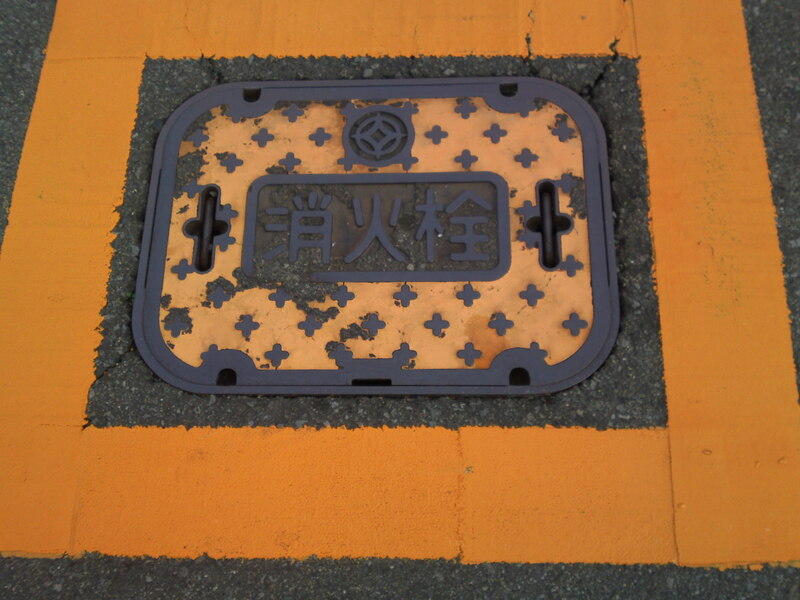 A yellow version of the original orange type in Shimizu Ku, Shizuoka City! 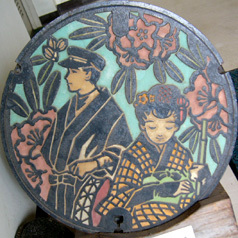 The same without enamel coating! 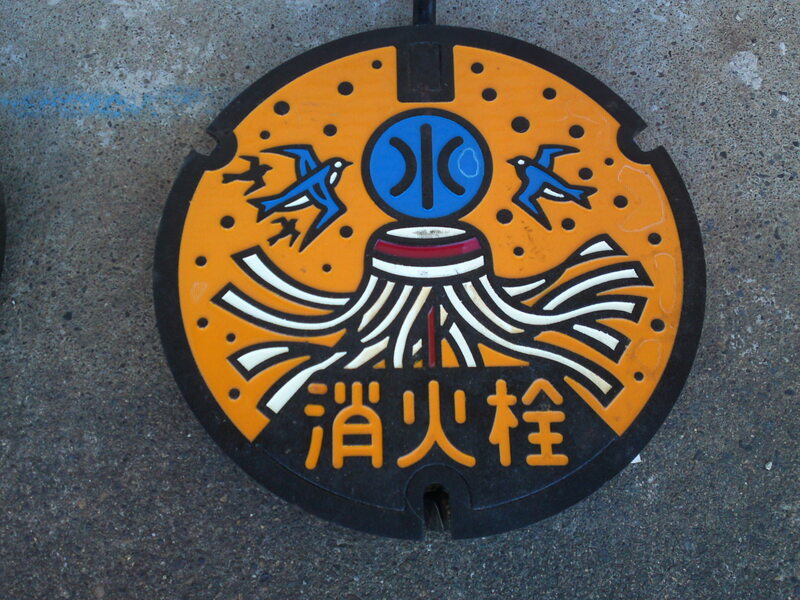 An old Shimizu City (now Ku) sewer manhole cover! 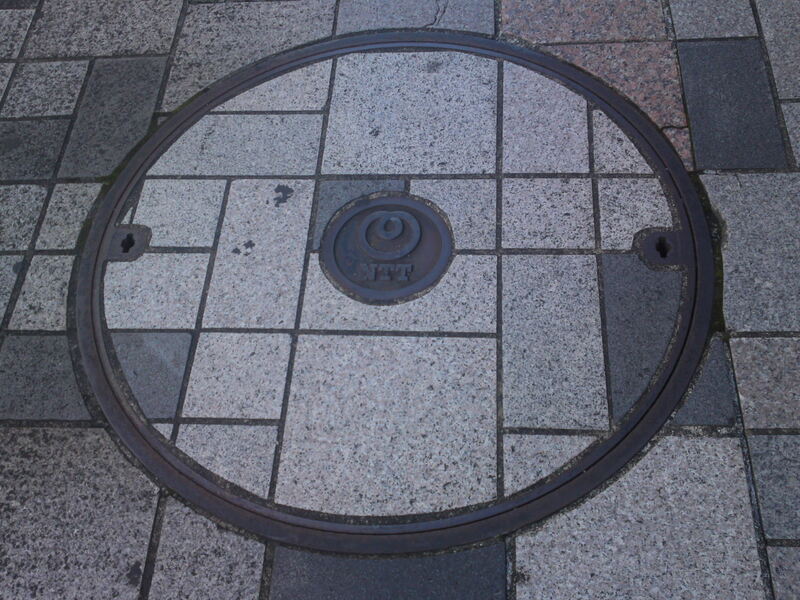 A big double manhole cover in Shimizu City (now Ku)! 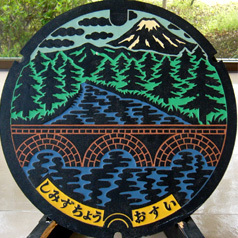 I found this one on the Internet describing a commemorative manhole cover inside the Shizuoka Prefectural Park, Suruga Ku, Shizuoka City! I will have to investigate for bigger pictures! 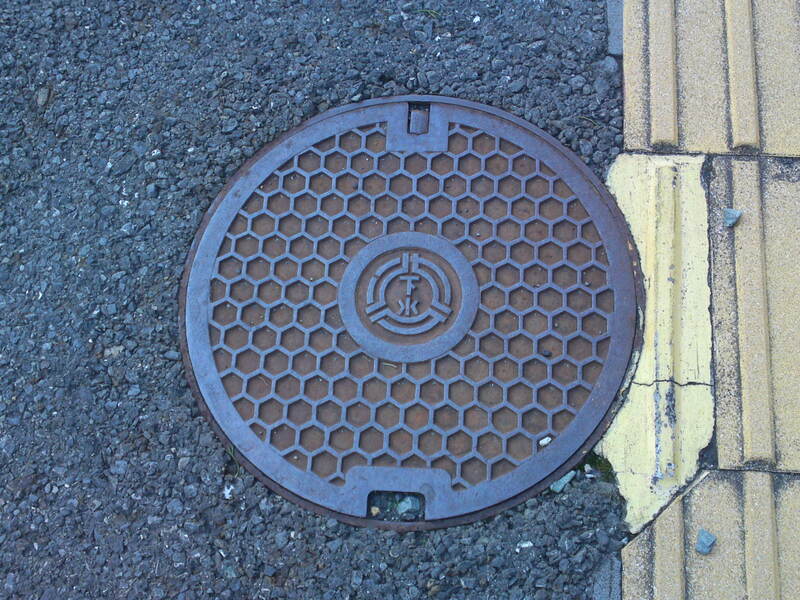 The same as above in different colors! 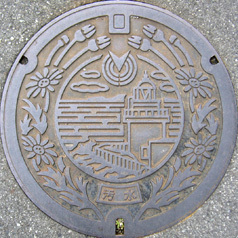 Unknown motif on a manhole cover in Yui, Shimizu Ku, Shizuoka City! 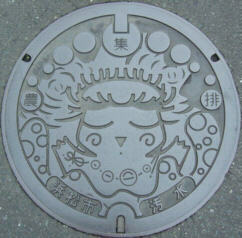 A beautiful Fire Hydrant manhole cover in Yui Cho before it became Yui in Shimizu Ku, Shizuoka City! 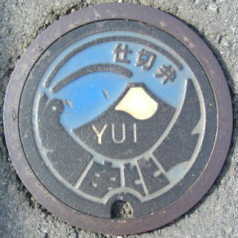 Another fire hydrant manhole cover in Yui Cho before it became Yui in Shimizu Ku, Shizuoka City! 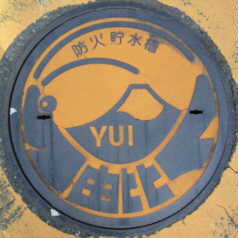 A gate bulb Manhole cover manhole cover in Yui Cho before it became Yui in Shimizu Ku, Shizuoka City! 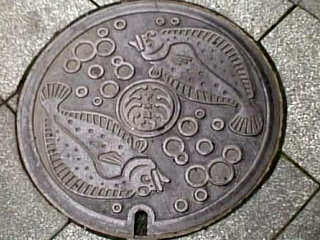 Note the sakura ebi/cherry shrimp motif! 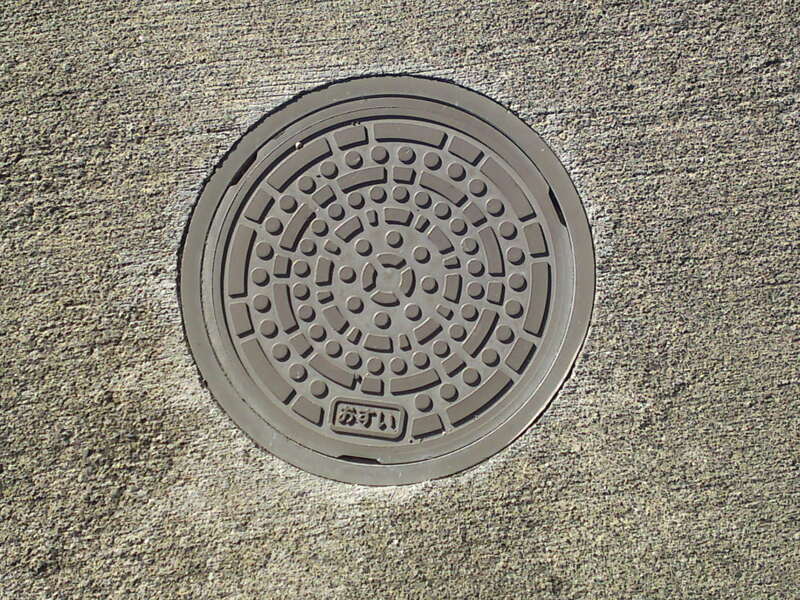 The same as above in different color over a fire hydrant! 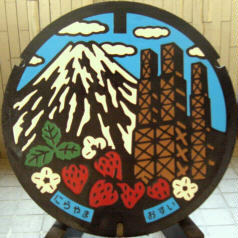 Also not Mount Fuji you can see from Yui! 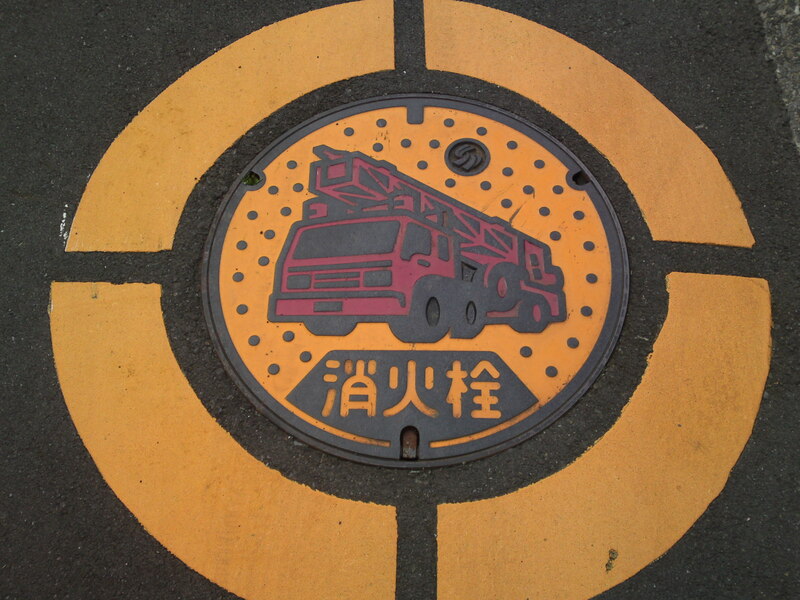 Fire hydrant Manhole cover in Kambara, Shimizu Ku, Shizuoka City! 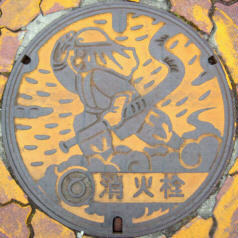 Taken in Atami city, a sewer “manhole” representing the famous story of the “Izu Dancer”! 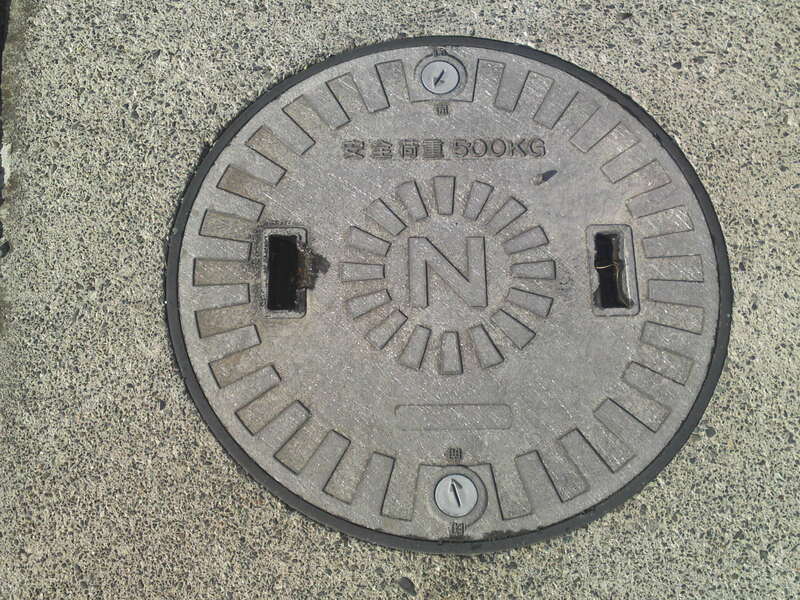 I and my friends can’t be everywhere in the Prefecture of Shizuoka, which accounts for almost 4,000,000 souls, the equivalent of New Zealand or Ireland! Moreover distance are pretty awesome due to its shape. 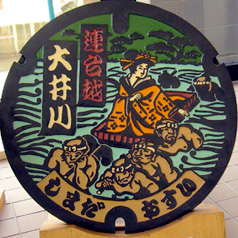 It takes 3 hours by train non-stop to travel from Shinjohara in the west to Atami in the east and more to to travel to Shimoda at the southern tip of Izu Peninsula. 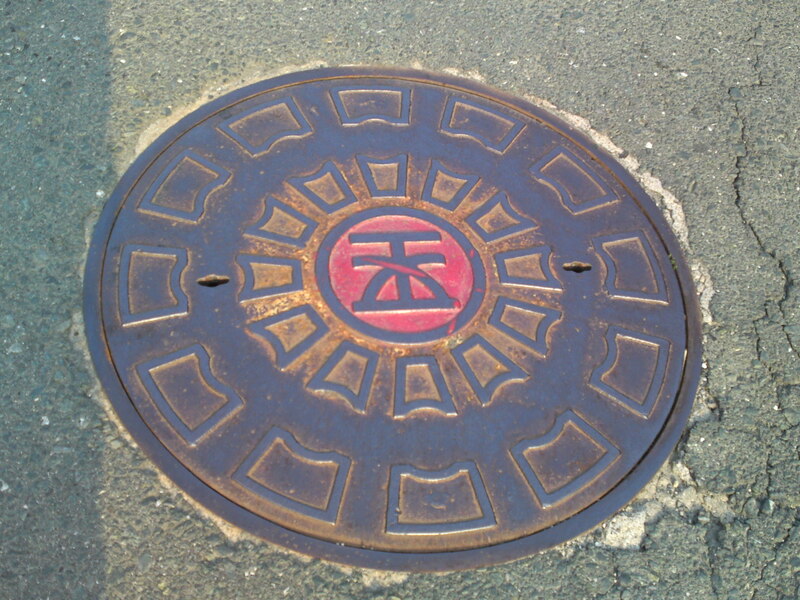 English reports or postings on manholes in Shizuoka do not exist and this is a pity, but there are many Japanese blogs, live or defunct which depict them! 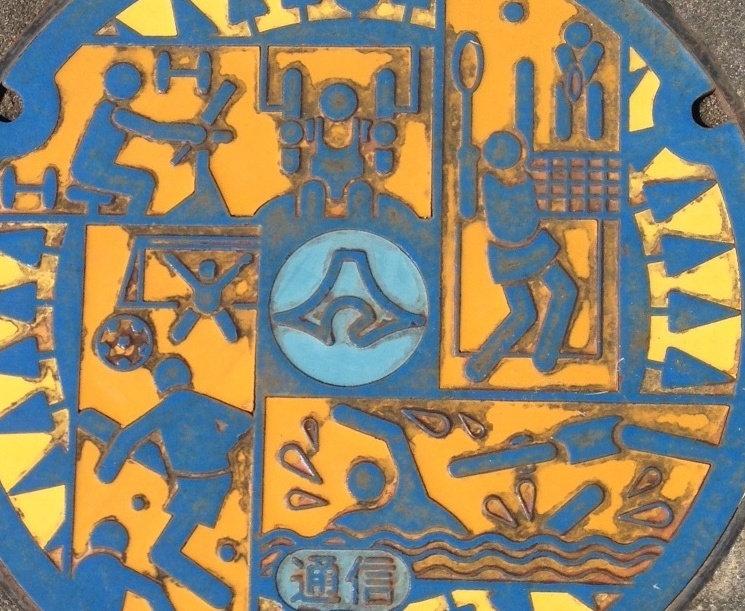 I certainly found a lot, and until I can travel and confirm them, as well as find more, I will try to run a kind of compilation to help all who are interested in such an unusual form of art! 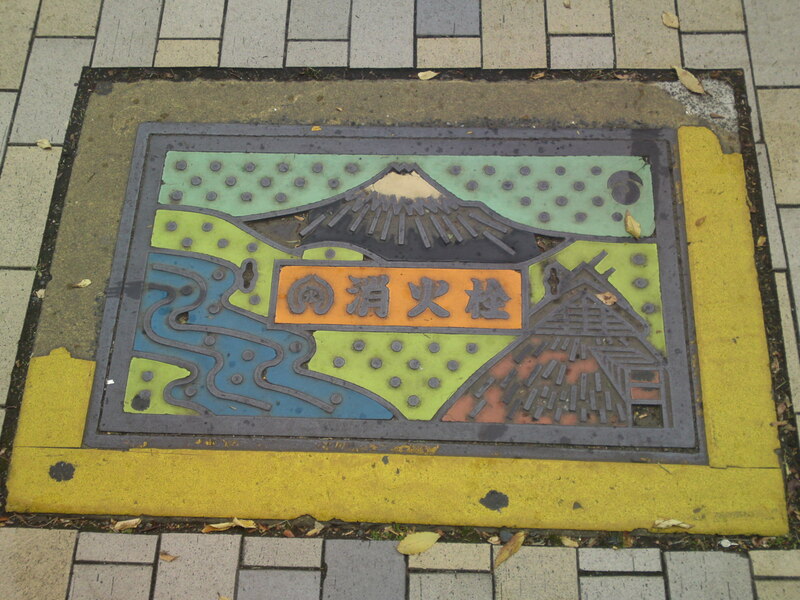 This particular post show pictures taken as far back as the 17th of July, 2007 in Atami City for a blog which has ceased quite a few years ago. 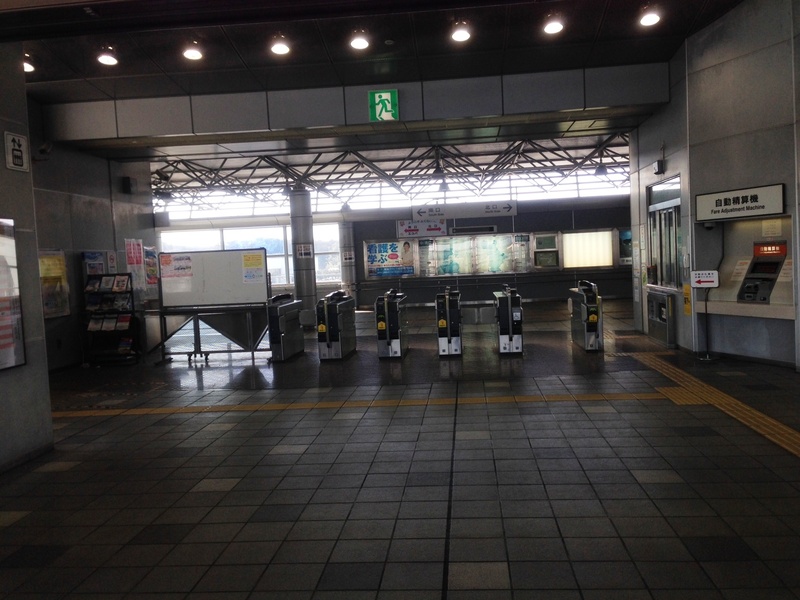 I did travel to Atami City and remember most of them! 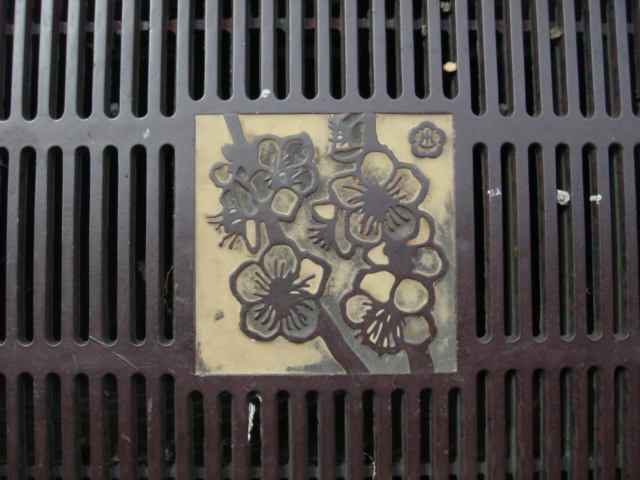 Another rectangular sewer “Manhole cover” in relation with the one above depicting not cherry blossoms but plum blossoms for which Atami City is famous! 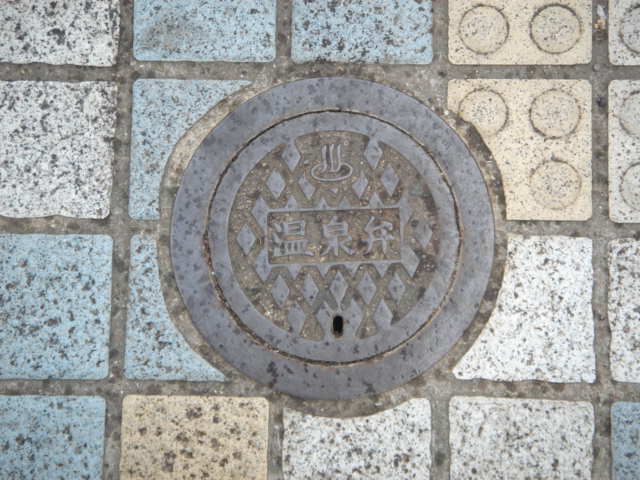 This large type blending in its surroundings also exists elsewhere but with a small and important difference, the little central hot spring motif! 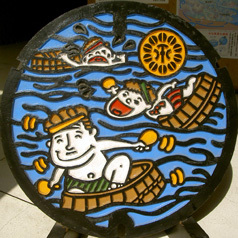 After all, Atamai City is arguably the most famous hot spring resort town in Japan! 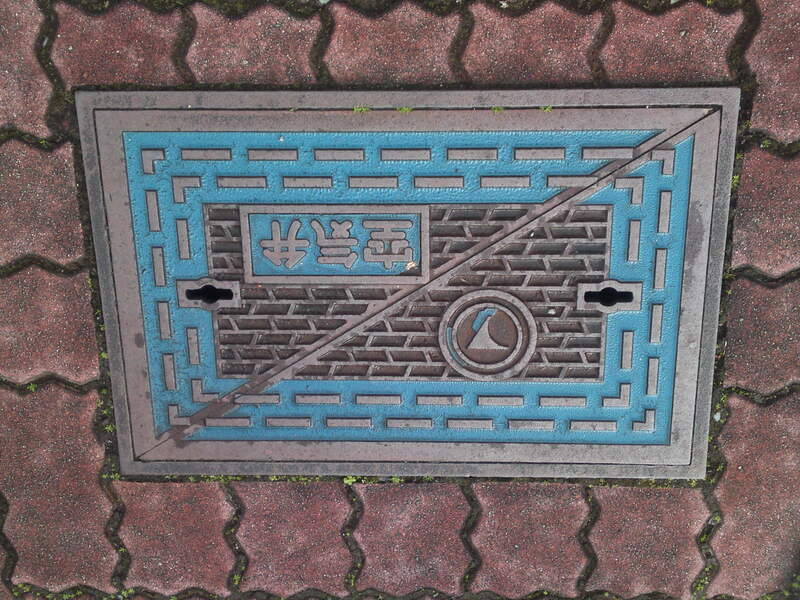 But I think this sewer type manhole cover also blending in its surroundings can be found only in Atami City! 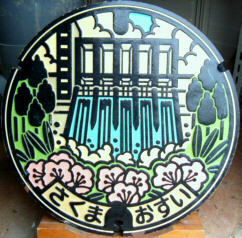 Again this type is found all over the Prefecture but not with the central hot springs motif! 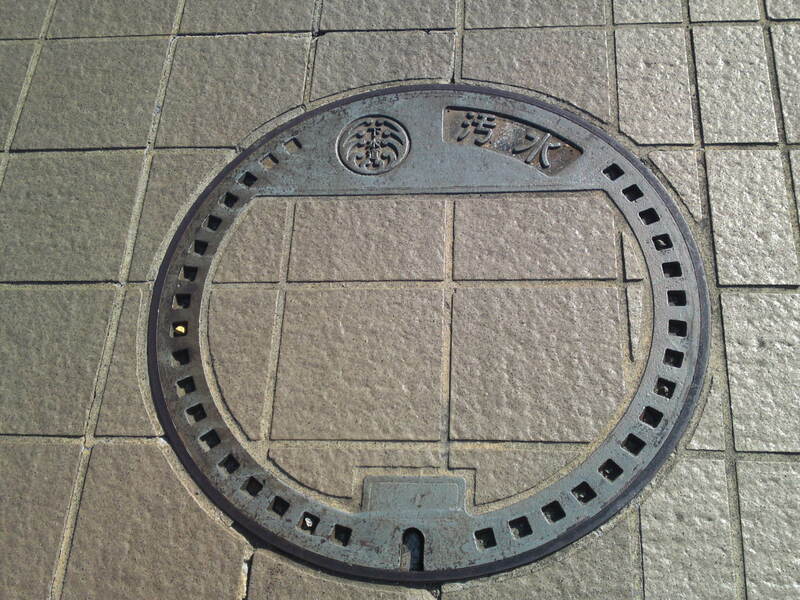 Unusual manhole cover over an access to hot springs hot water! 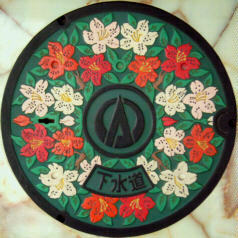 A double spent waters manhole cover with the central hot springs motif! 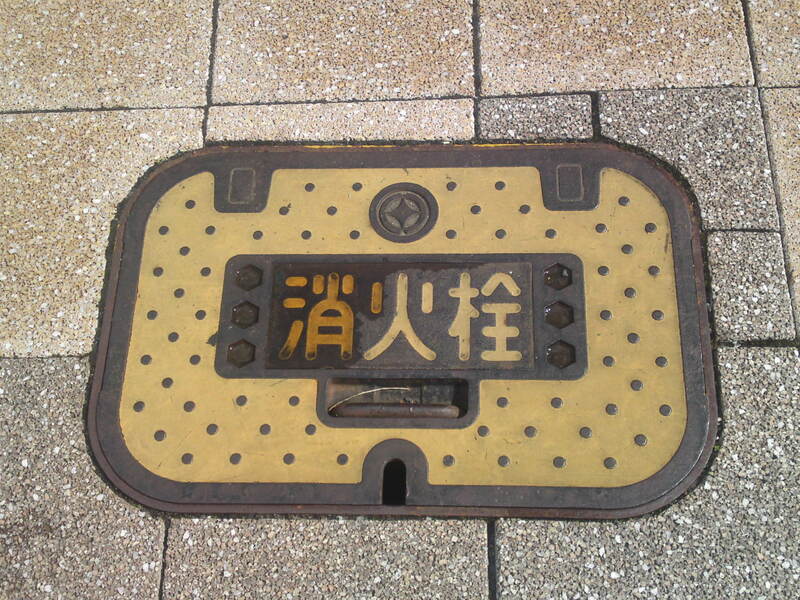 This gas and electricity meter manhole cover can be seen all over the Prefecture. 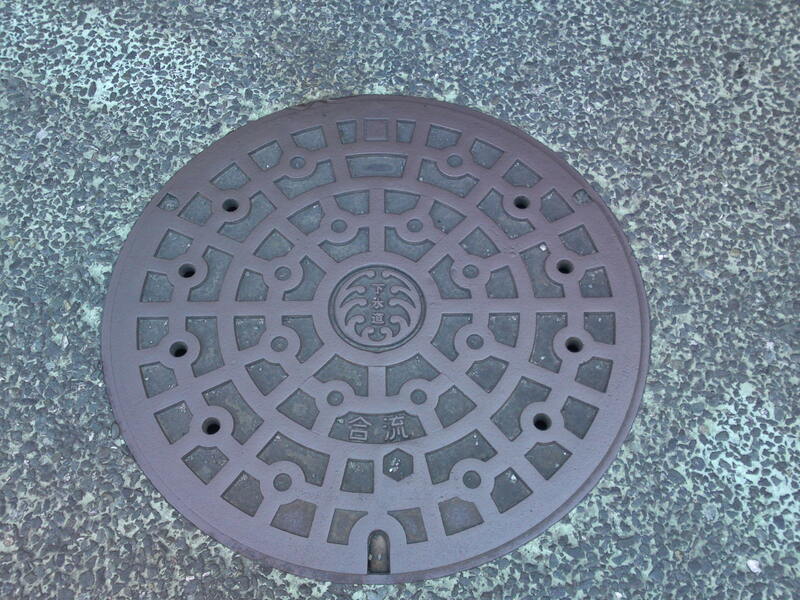 The same for this gas manhole cover although I haven’t noticed the central motif yet! 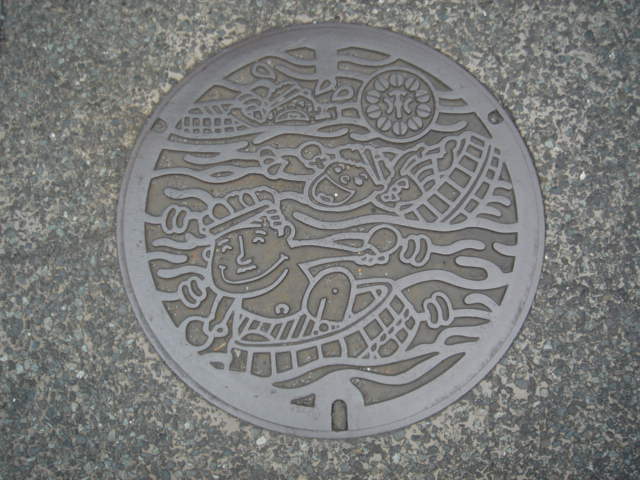 Fire hydrant manhole cover with a central hot spring motif! 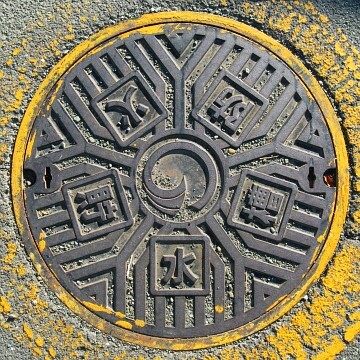 Another hot spring hot water access manhole cover! 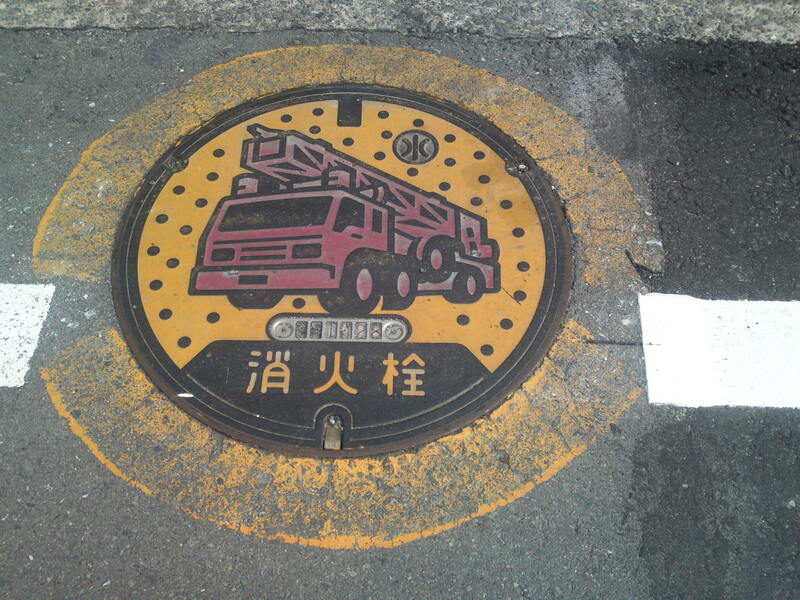 Fire hydrant manhole cover found all over the Prefecture! 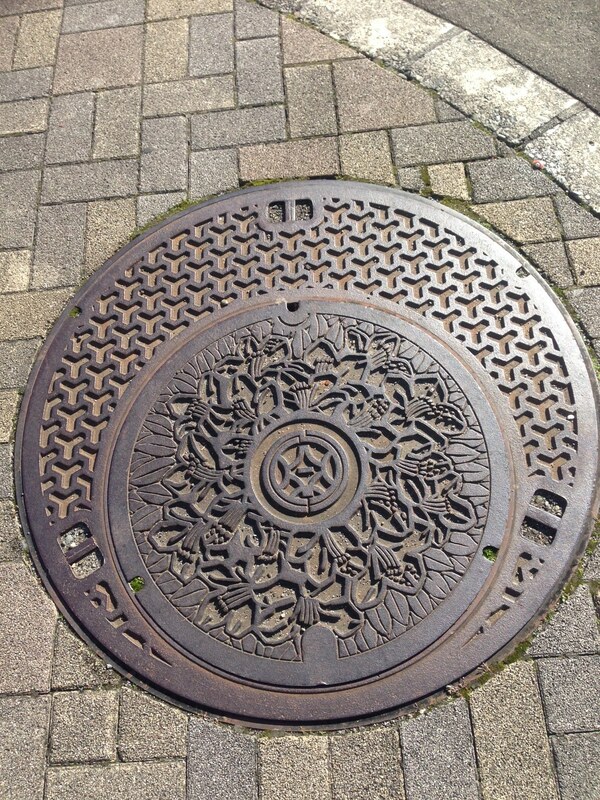 My friend Atsuko Kurata discovered this old manhole cover in Shimizu Ku, Shizuoka City. 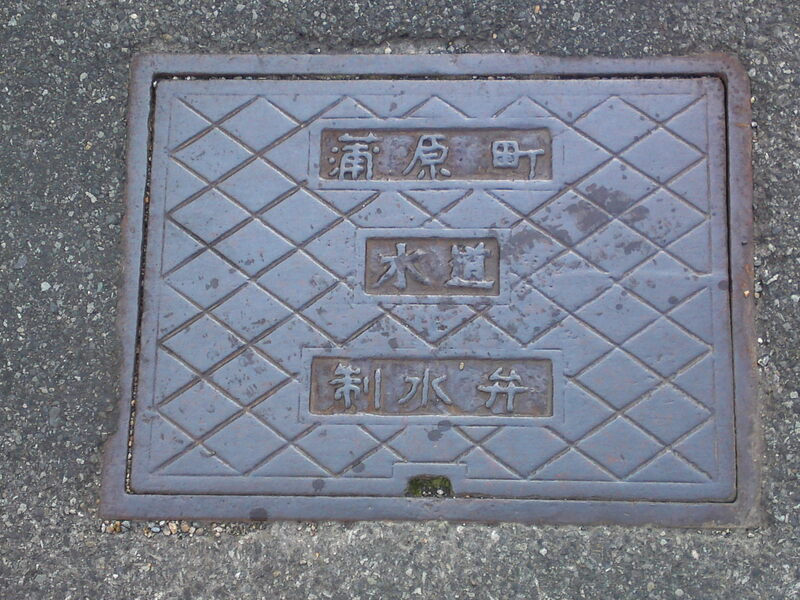 “出雲式” or (“Bursting Cloud Systme”) was apparently developed by a single company called Miyoshi Shokai. 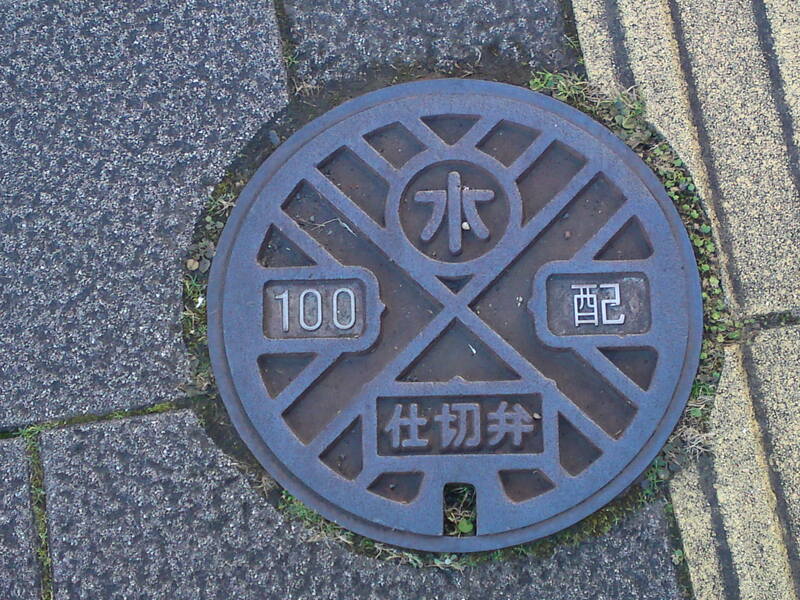 I already know of many blogging friends in Japan taking pictures of manhole covers all over this country. The reason is simple enough: as there is little chance of them being stolen (I can’t say the same thing back in our countries!) 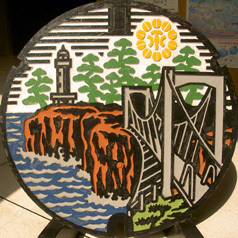 the local/municipal government often use them as touristic advertisements ! 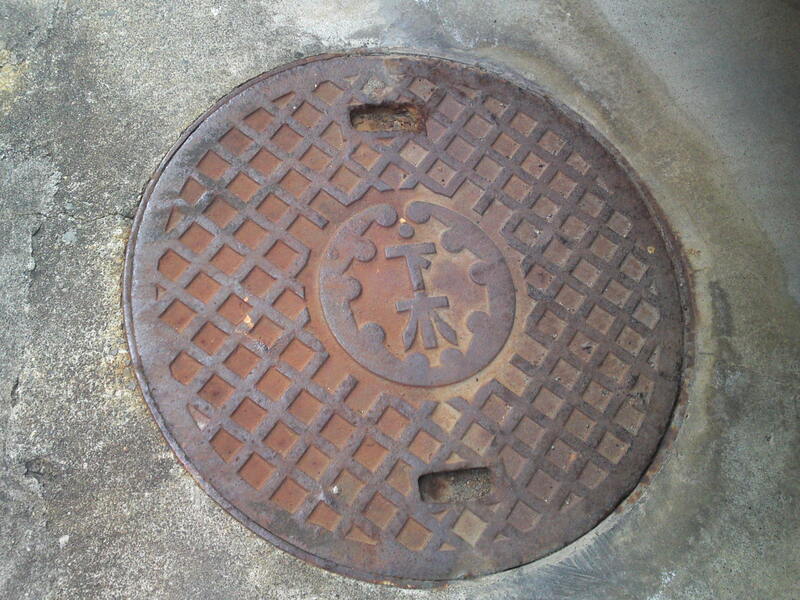 I keep on looking for them during my many travels through the Prefecture. 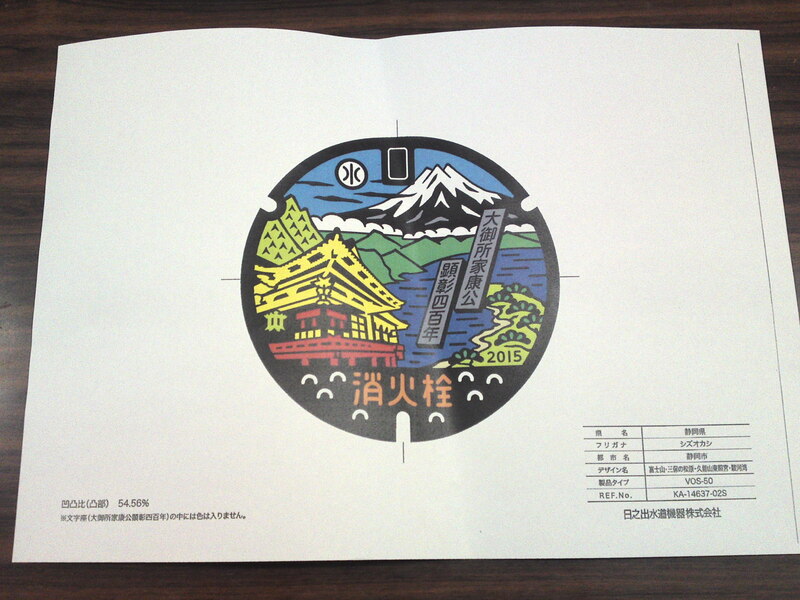 And this time again I was lucky to enjoy some great help from a new friend working for the Shizuoka City Touristic Information, namely Atsuko Kurata! 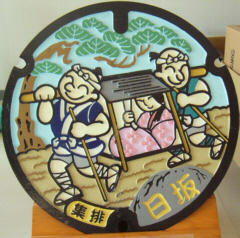 Like me she is chasing all kinds of cultural artifacts, especially the unusual ones! I’m pretty sure that we should be able to come with a “Ten Best” very soon, at least for the year 2013! 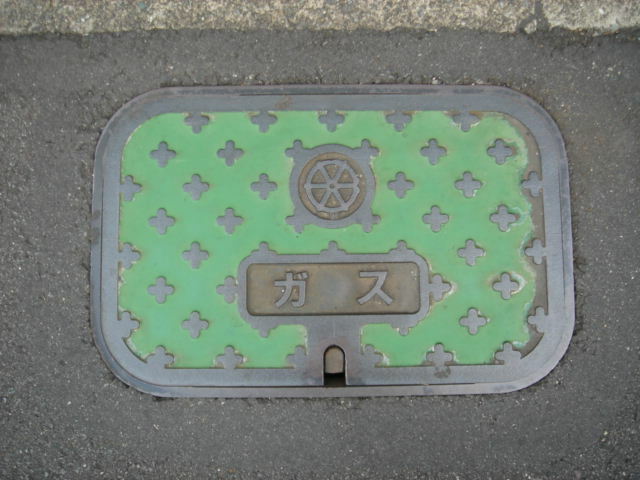 Actually I have found some interesting sources of defunct and live Japanese blogs which should direct me to dozens more soon in the whole Prefecture! 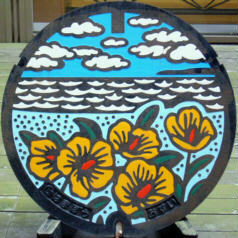 Some are real works of art! Until then the present post will be slightly “technical”! 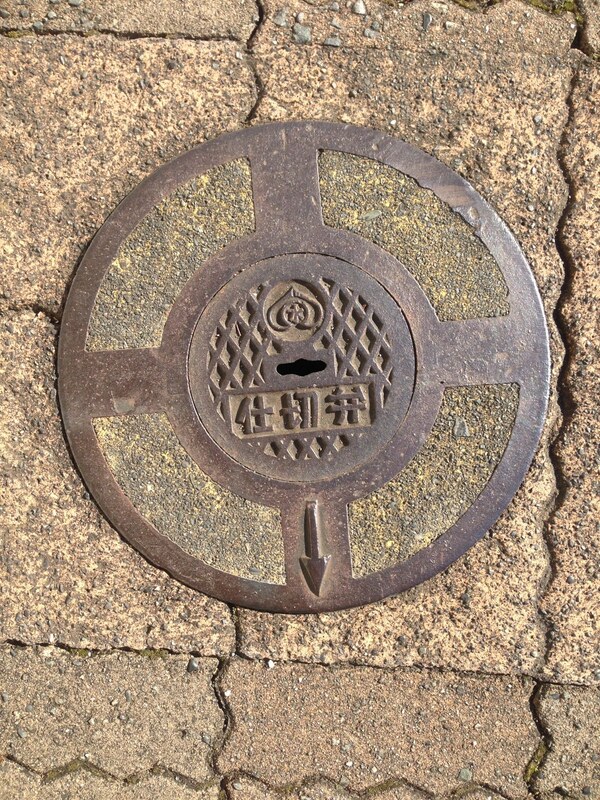 Atsuko found the above and the two below in Shimizu Ku, Shizuoka City. They seem different but they are actually the same type! They seem to point in different in different directions. 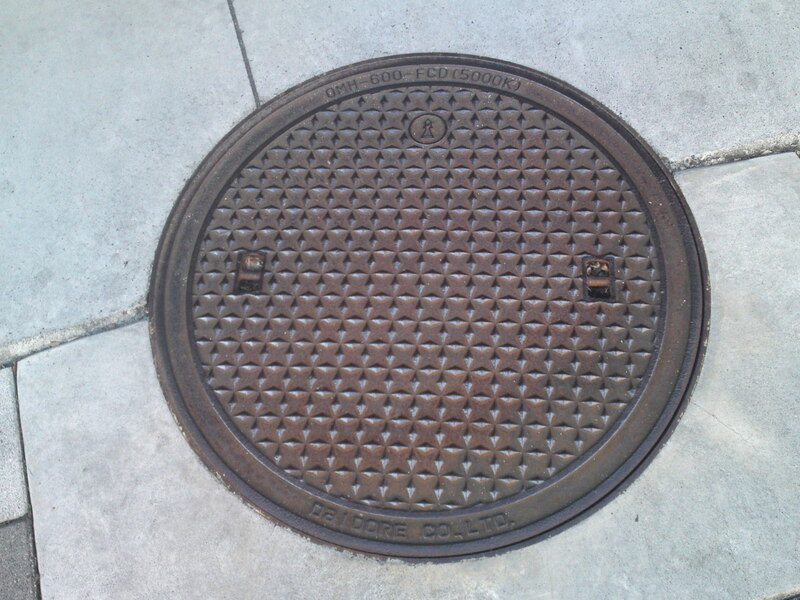 They seem to do so, but in fact the outer rim is fixed whereas the cover is movable! 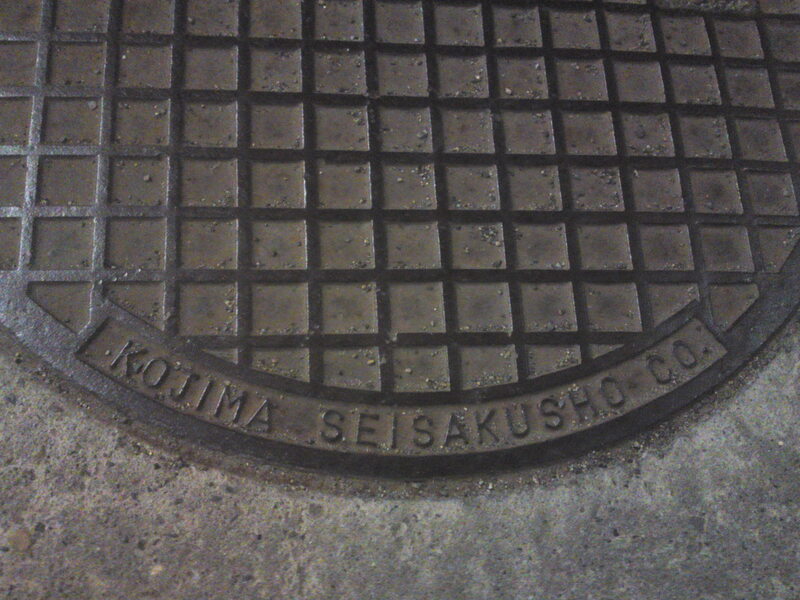 I found this in Aoi Ku, Shizuoka City. 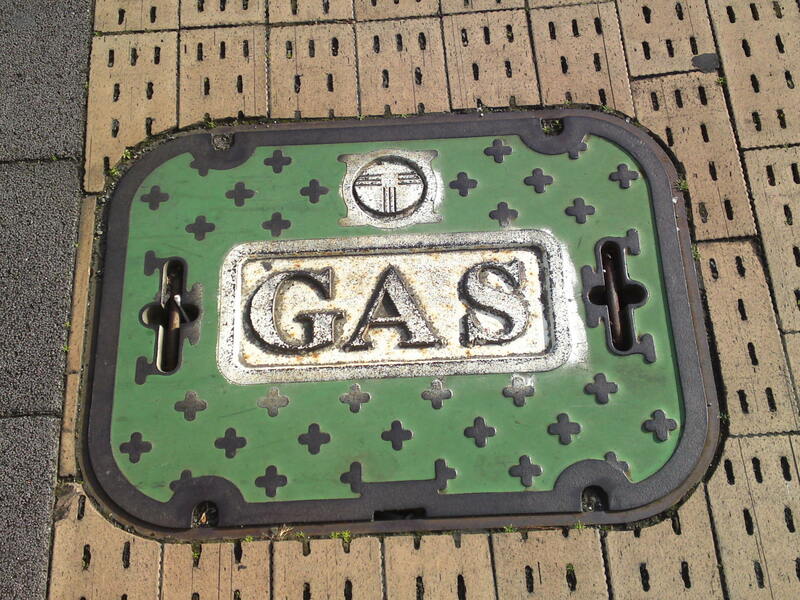 I wonder what a “gas bulb” stands for? 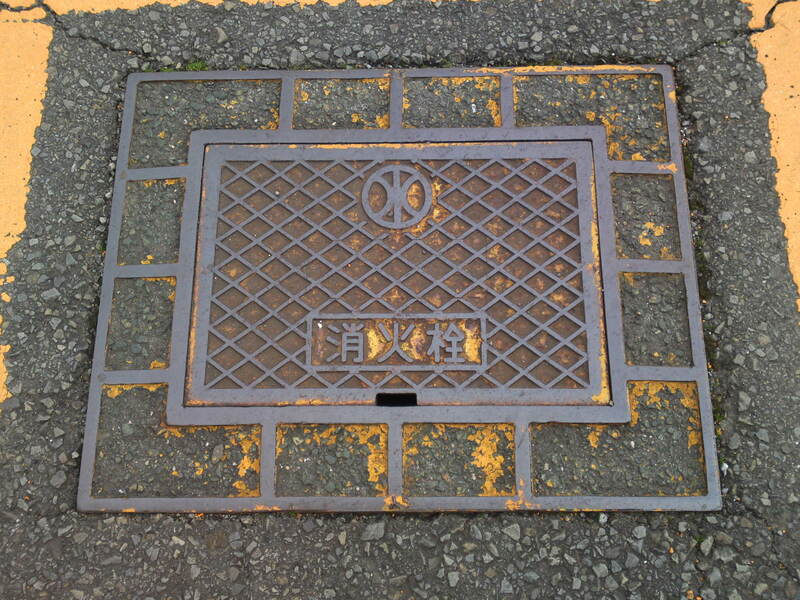 Another very large rectangular manhole cover in Aoi Ku, Shizuoka City! 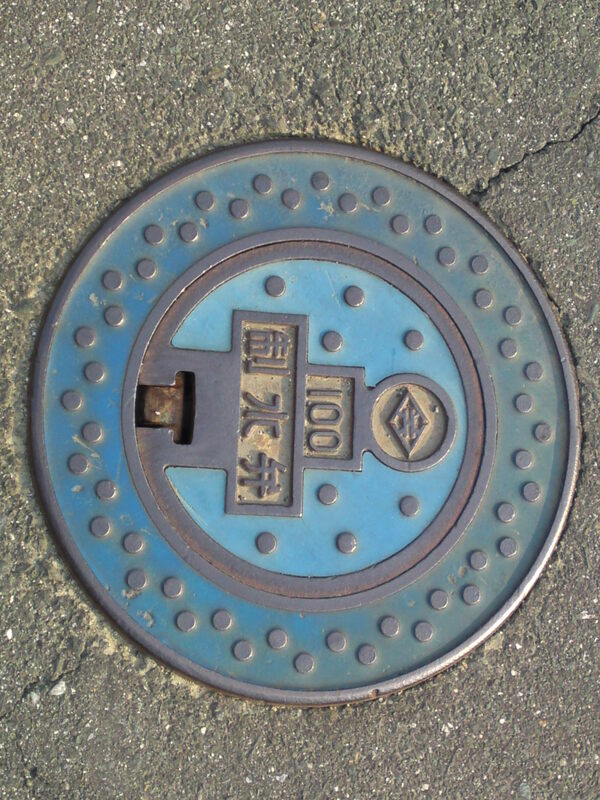 I found this one in front of the Shizuoka Main Police Station in Aoi Ku. 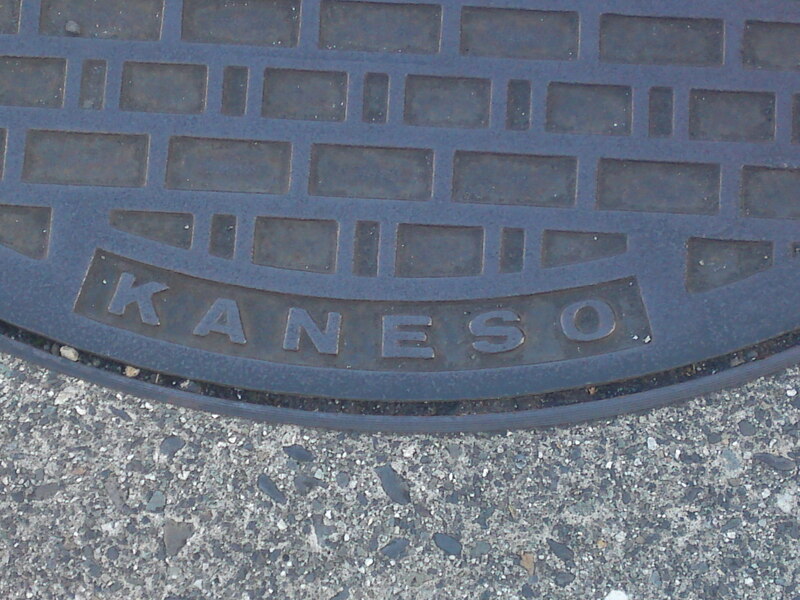 It was produced by Kaneso Foundry Co. 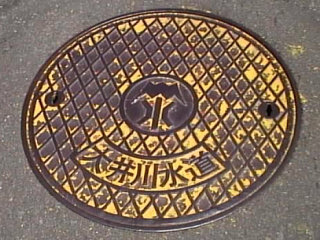 It seems that the police have their very own manhole covers as the character “警” of “警察” meaning “police” tends to indicate! 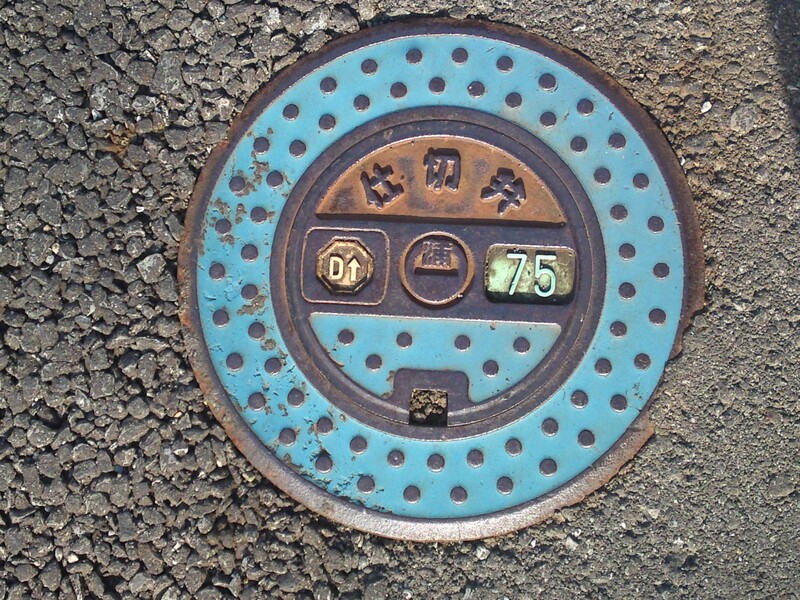 Another,almost rare, old type in Aoi ku, Shizuoka City! 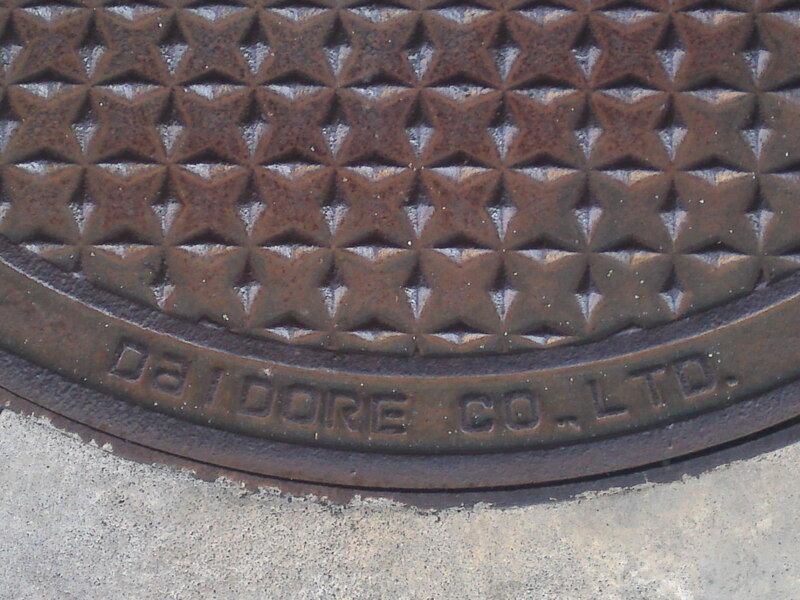 It was made by yet another foundry called Daidore Co Ltd.
A very large one for Chubu Denryoku Electric Company in Aoi Ku, Shizuoka City! 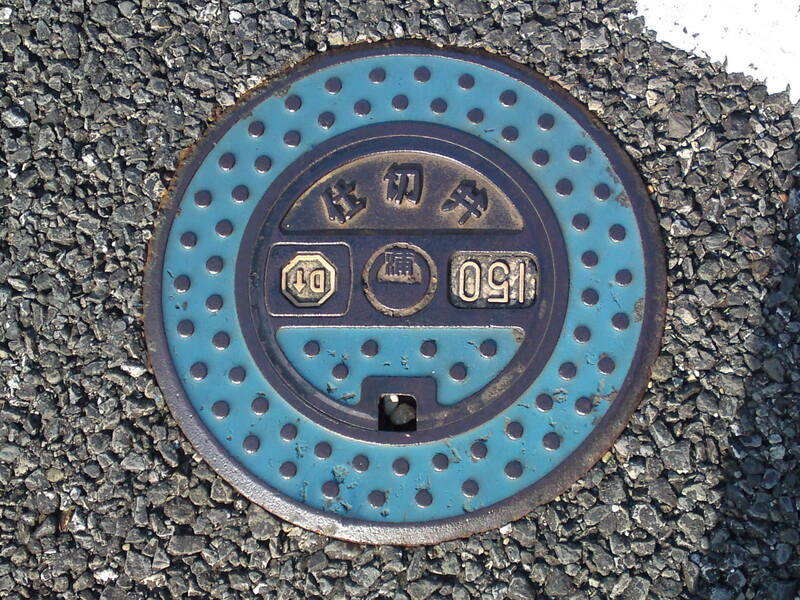 Not all the manhole covers of Chubu Denryoku/中部電力” are marked such! 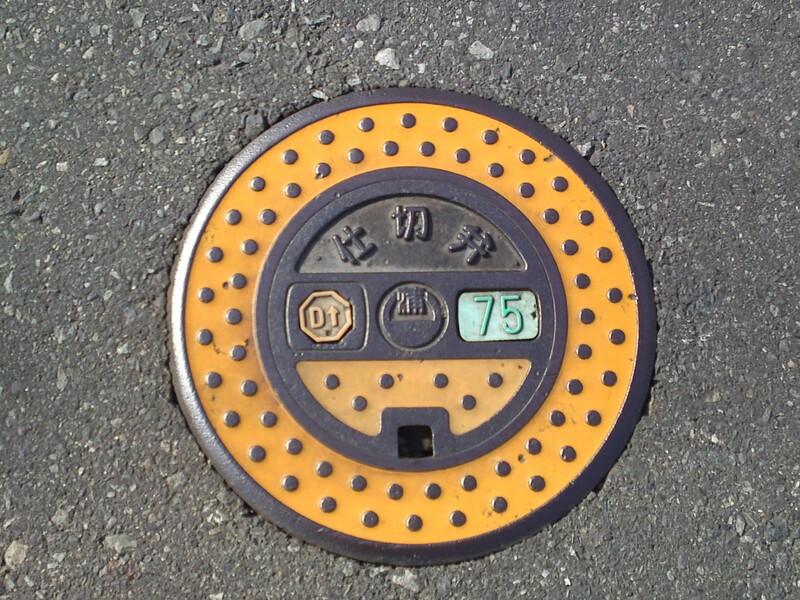 A smaller one with an indicator in Aoi Ku, Shizuoka City! 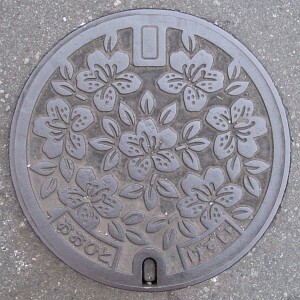 This is a reminder of a type found in Aoi Ku, Shizuoka City which comes in different color or with none, and can be subdivided into groups, one station “shi no hana aoi/市の花葵”/”Shizuoka Flower: Hollyhock” or with a “T” foolwed by a number! 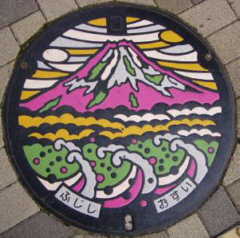 A medium-sized one for a fire hydrant in Aoi Ku, Shizuoka City! 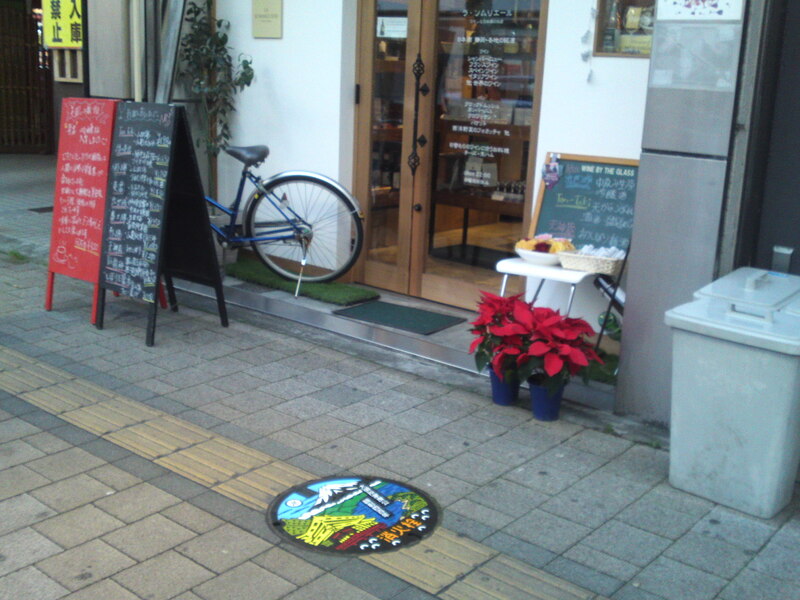 We see more and more of these large ones blending into the surrounding decor in Aoi Ku, Shizuoka City! 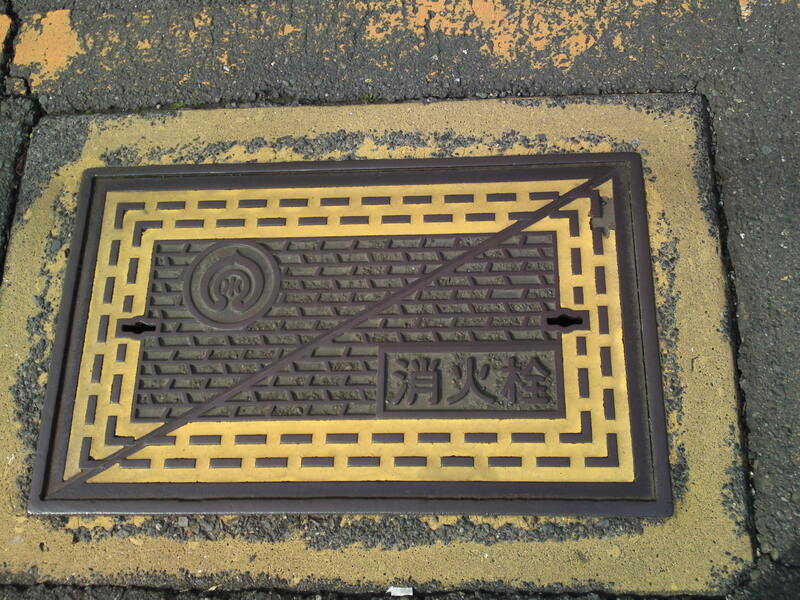 The same type as above blending into the surroundings but for NTT/National Telephone & Telegraph Co.in Aoi Ku, Shizuoka City! 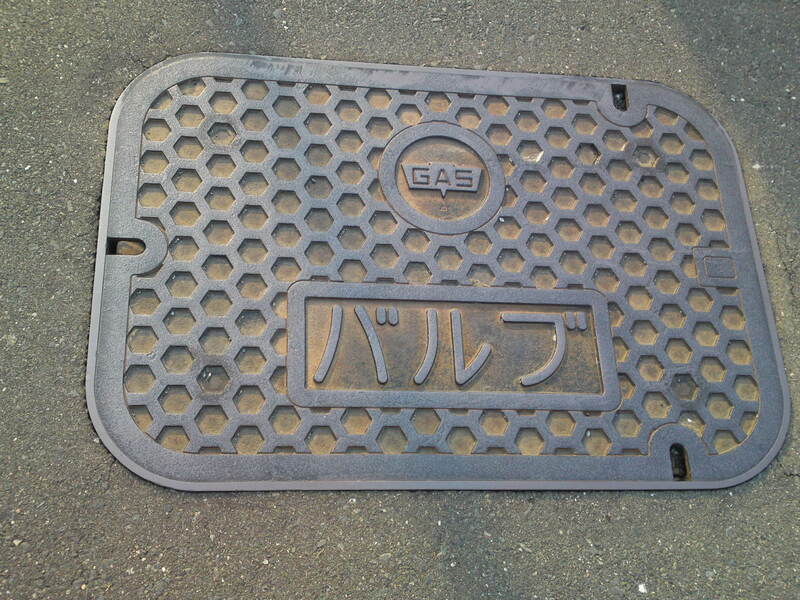 I don’t have a clue what ” Gas P” stands for! 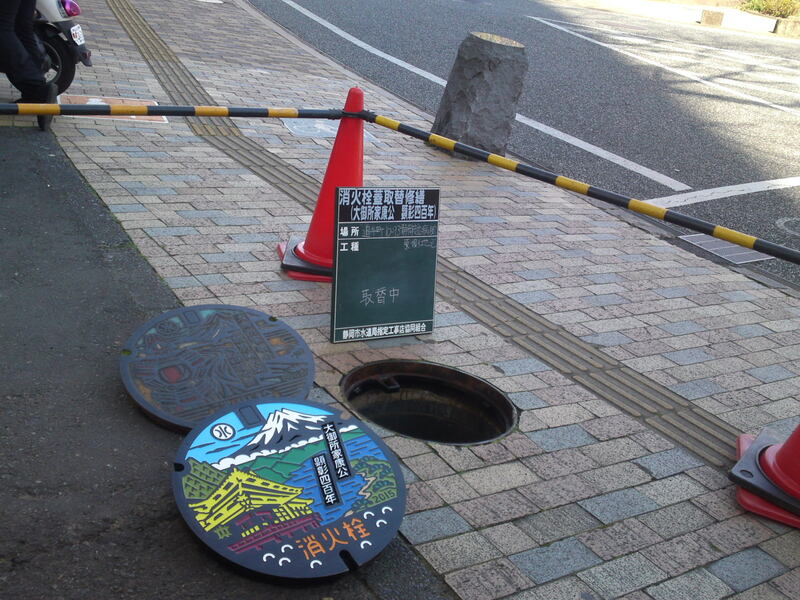 Shizuoka Fire Department Water tank Access! 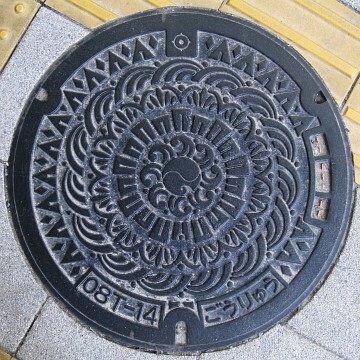 She found this very unusually patterned manhole cover in her neighborhood near Kusanagai JR Station in Shimizu Ku, Shizuoka City! 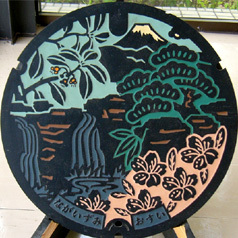 The next 4 picture all taken by Atsuko Kurata show the variations on a beautiful design! 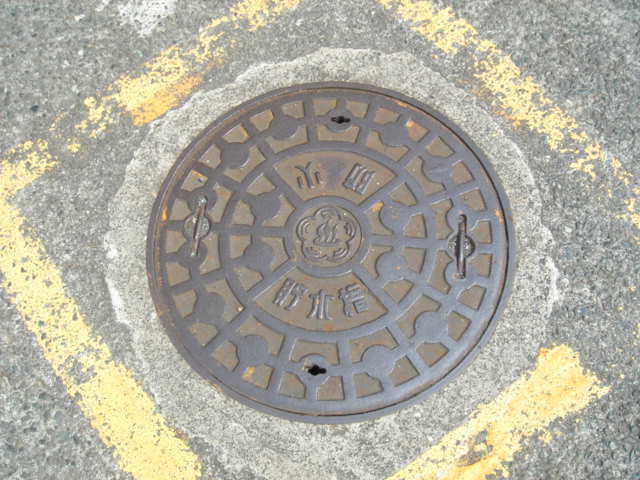 The manhole cover above and the next three below were ordered by the Municipal Government of Shizuoka Prefecture. 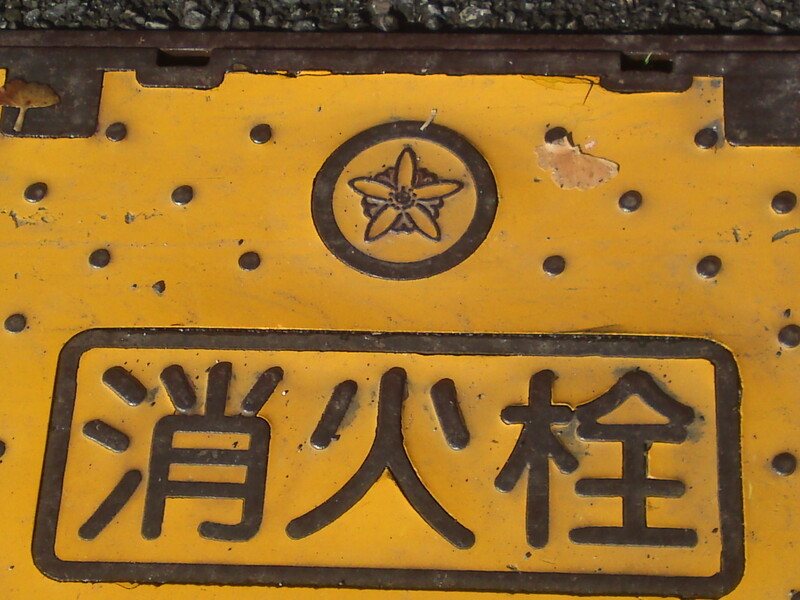 “道路・維持” could be loosely translated as “Road Development”. 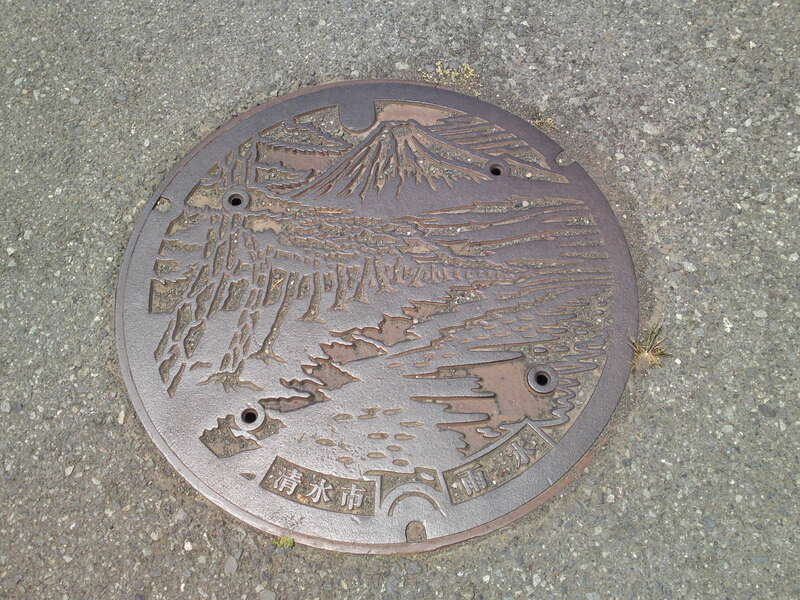 The above was discovered at the gate of Kunozan Toshogu Shrine, at the foot of mountain, in Suruga Ku, Shizuoka City! 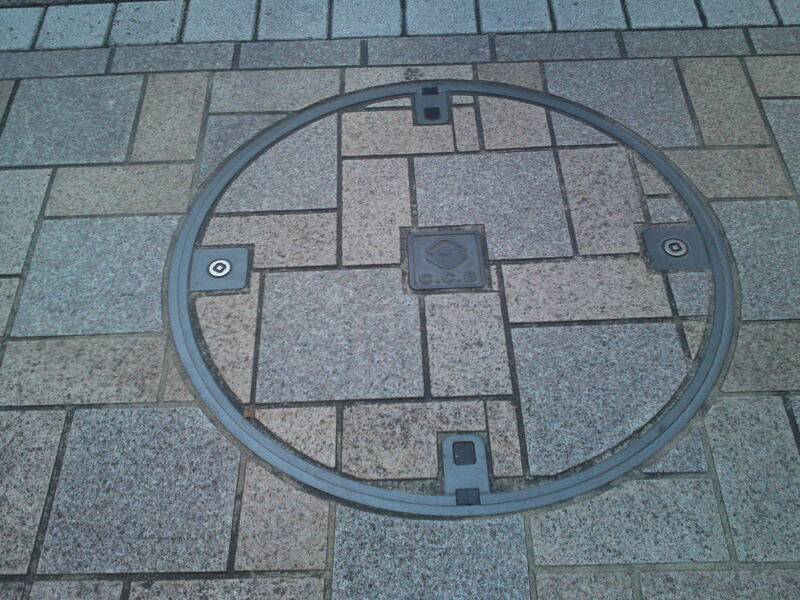 The above was discovered in Suruga Ku, Shizuoka City, at the Ishida crossroad, right in front of the APITA shopping mall! 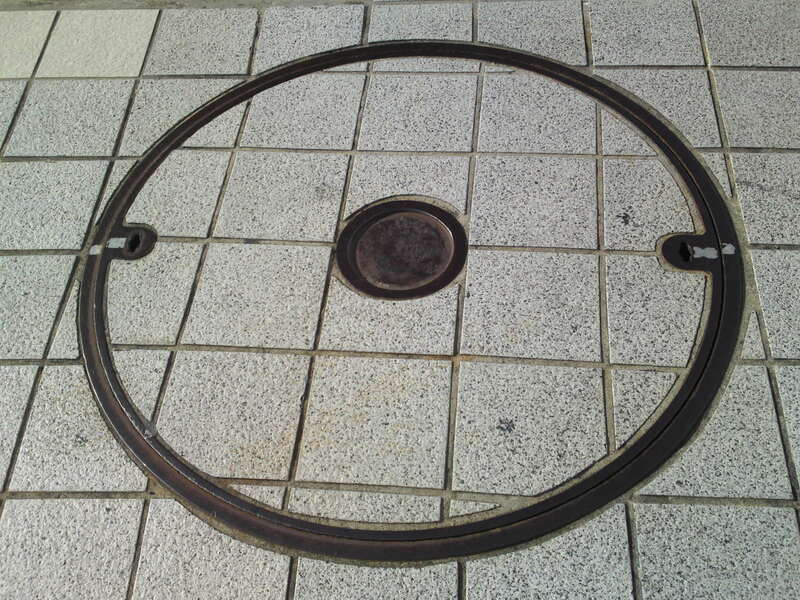 The above was discovered in Aoi Ku, Shizuoka City, at the front entrance of the Shizuoka Prefectural Government Office! 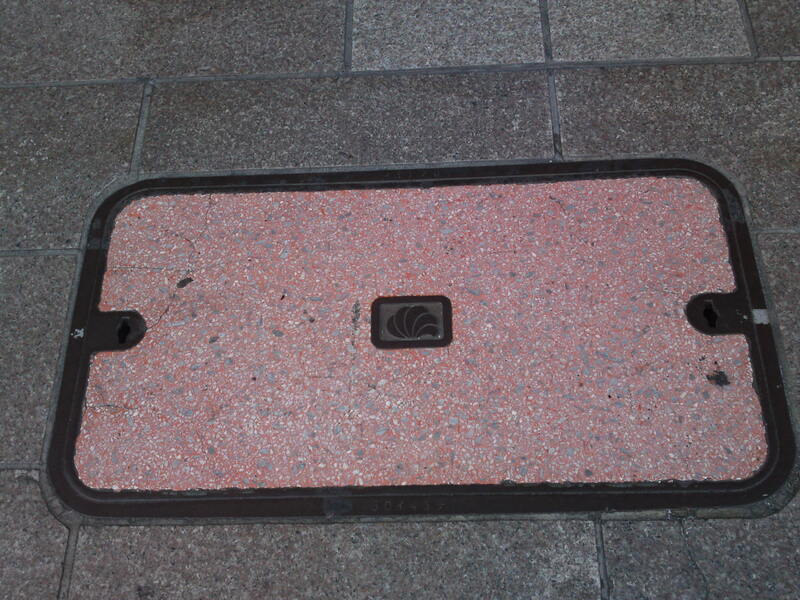 Manhole covers are sometimes designed to blend with their surroundings, but this one was “blinded” by a relief marker to help blind people walk along pavements! 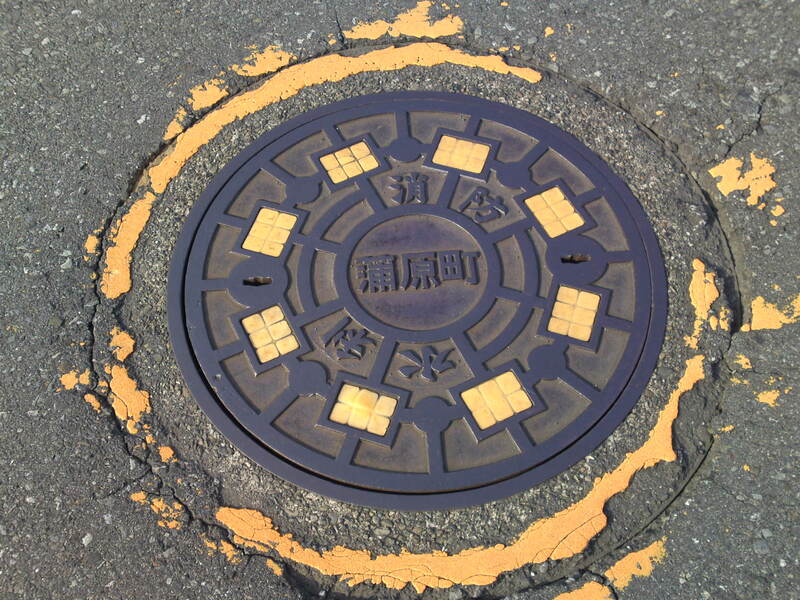 Atsuko Kurata discovered this extraordinary double manhole cover near Manseicho crossroads in Shimizu Ku, Shizuoka City one her way to Satsuki Street from S-Pulse Dream Plaza. 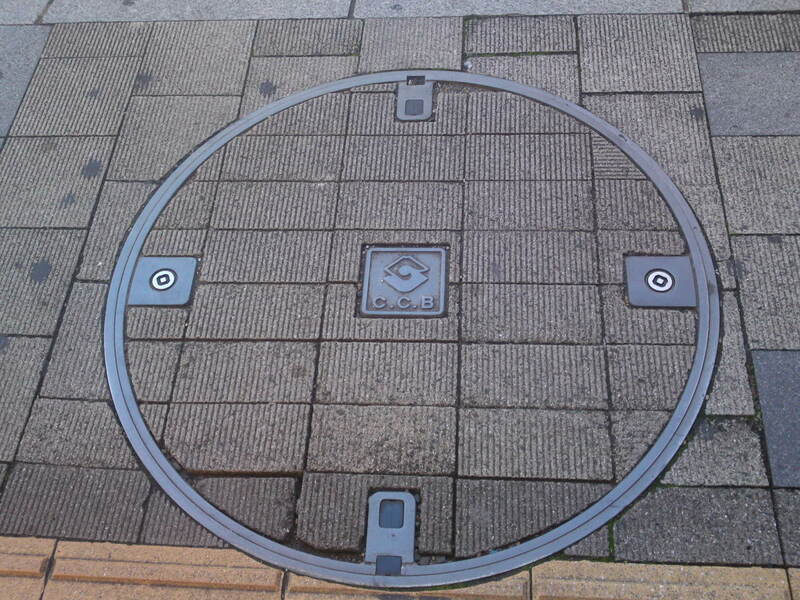 It is made of two known manhole covers to allow for two different sizes of access! 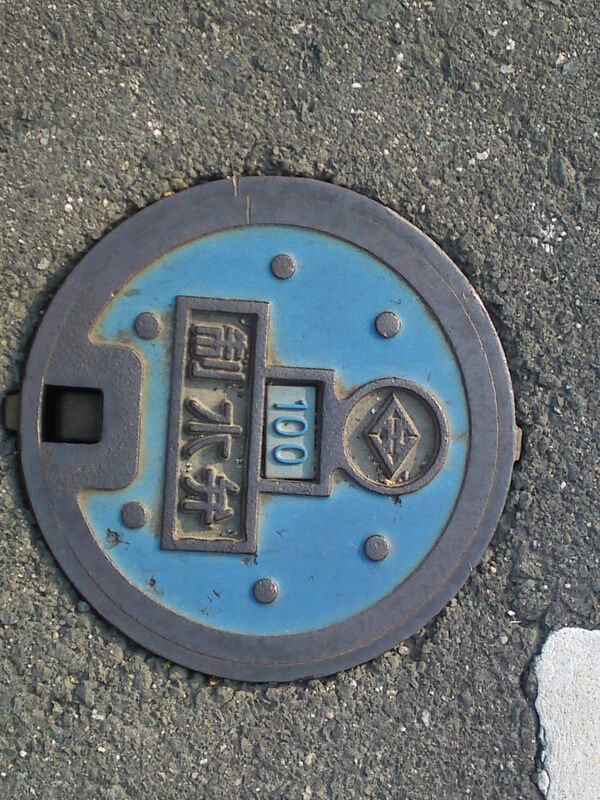 I found this one and the ones below near the National Sports Training Center in Shimizu Ku, Shizuoka City. 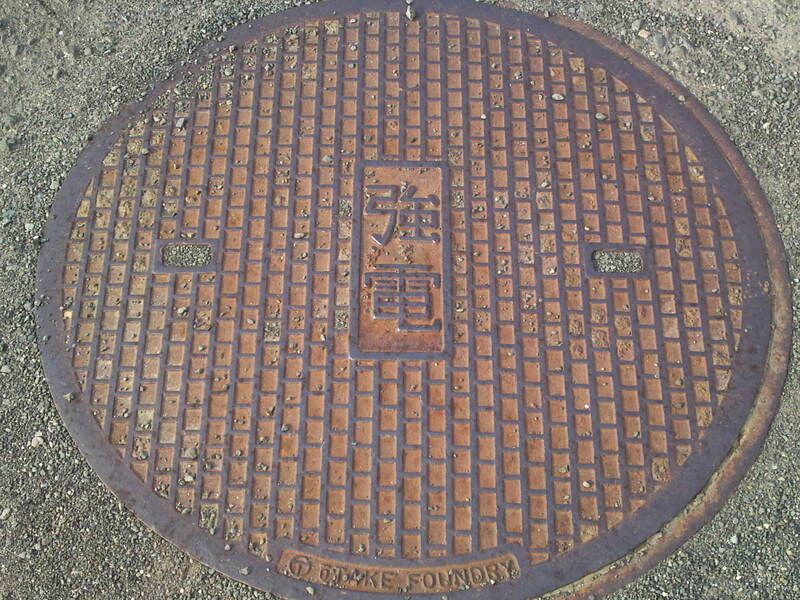 The one above is the smaller size manhole cover by Kojima Foundry Co. for ”汚水” or waste waters. 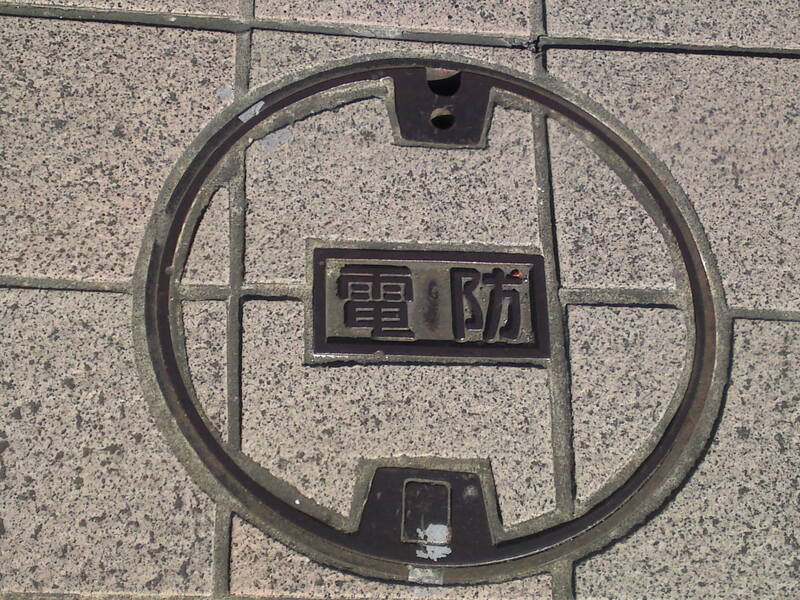 This large one is of an old design for electric cables with an interesting notice! 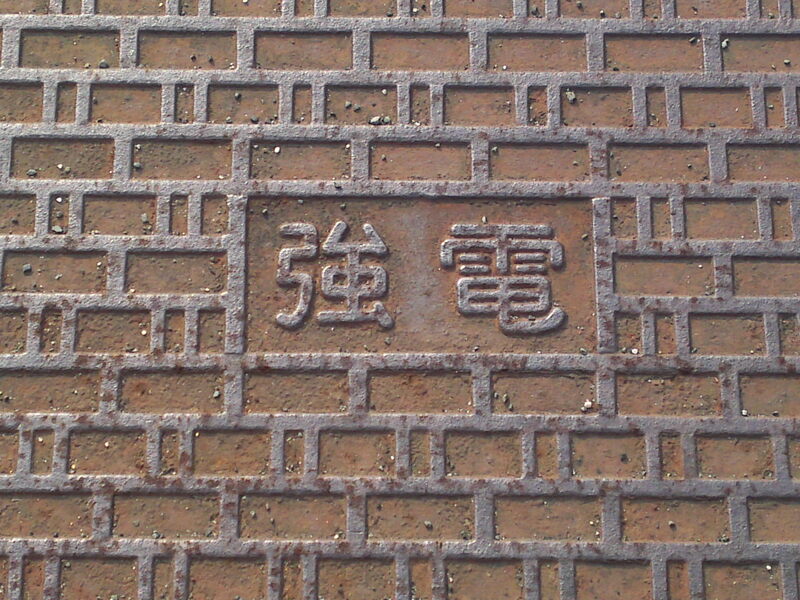 The same type (also seen at Kikugawa JR Station!) 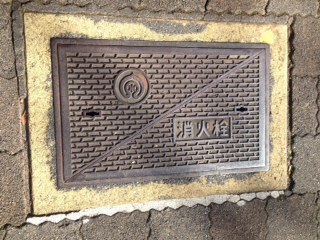 but for “雨水” or rain waters but a different notice at the bottom allowing for maker’s identification! 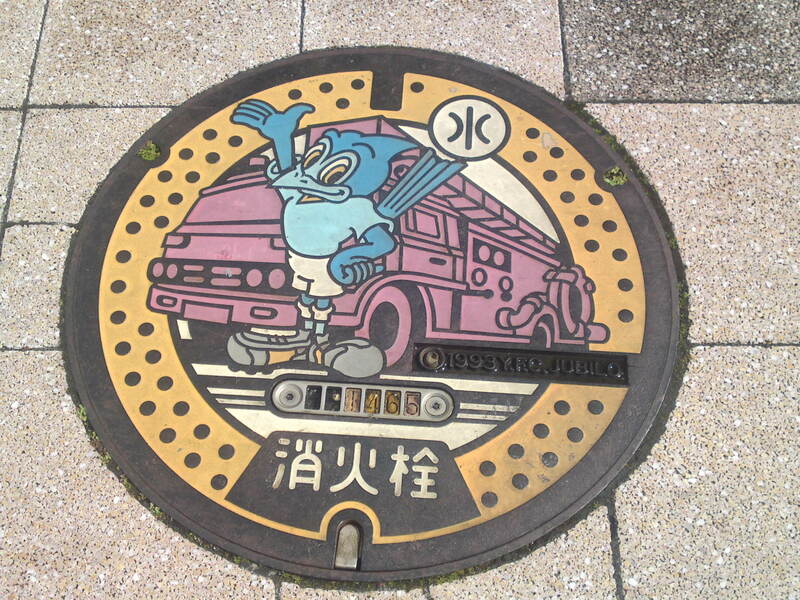 Fire Department water hydrant manhole cover in Aoi Ku, Shizuoka City! I must admit this time I have become a bit “technical” but I supposed it is needed! 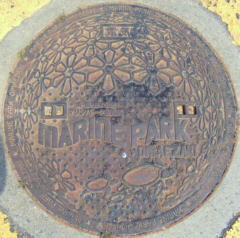 Another municipal (probably electricity) manhole cover blended wit its pavement surroundings! 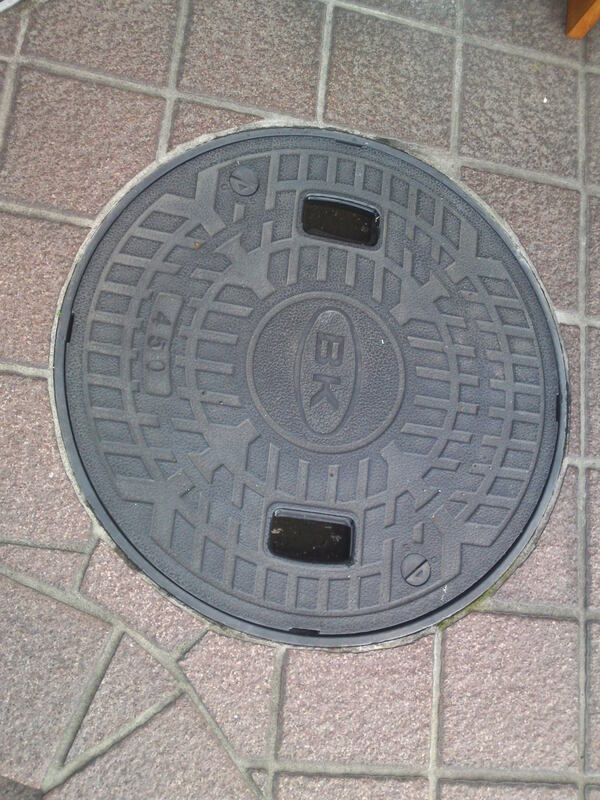 i discovered this slightly surprising one in Kikugawa City belonging to the big private National Electric Company! 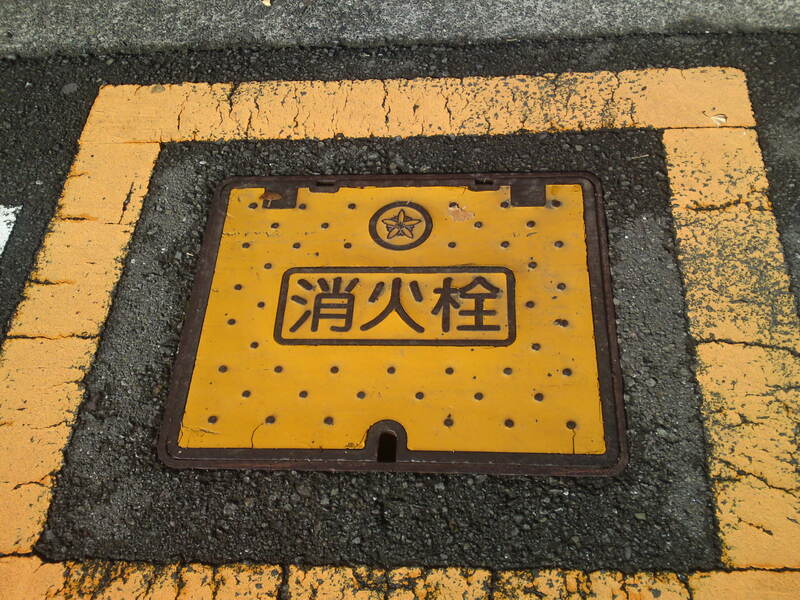 It states that it can bear up to 250 kg from human pedestrians! 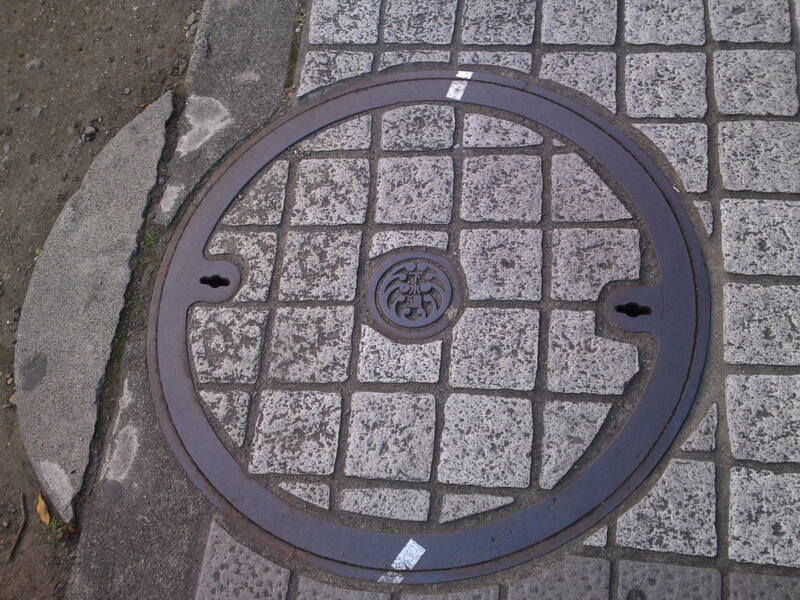 I’ll have to call a sumo wrestler to check that! 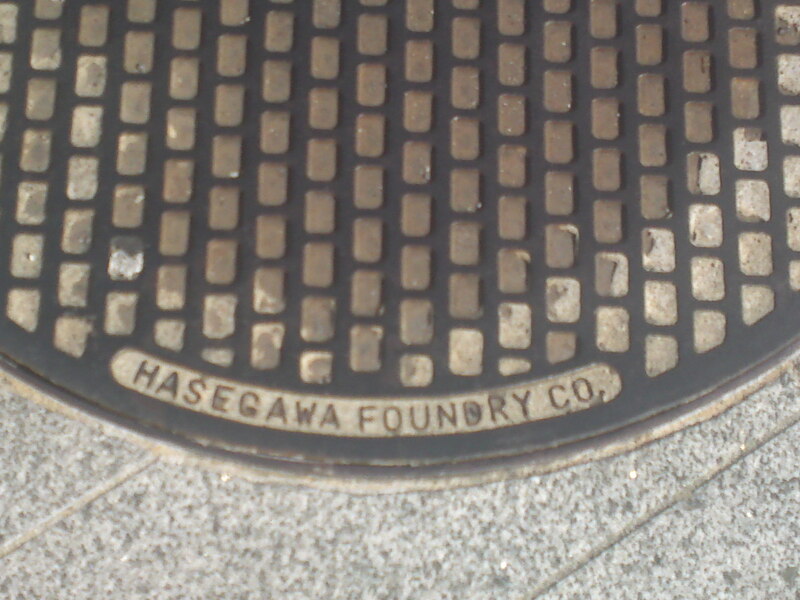 I found this one bearing another foundry name inside Kikugawa JR Station! 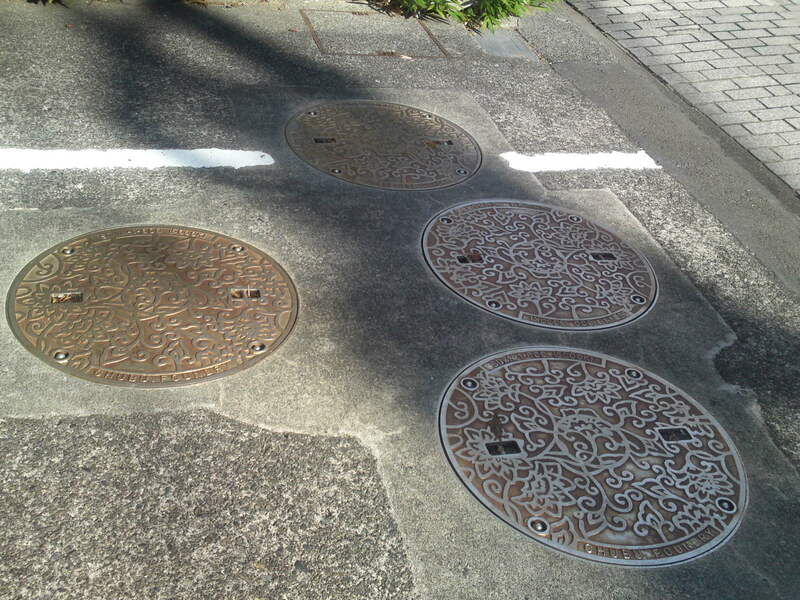 A new pattern found in Okitsu, Shimizu Ku, Shizuoka City! 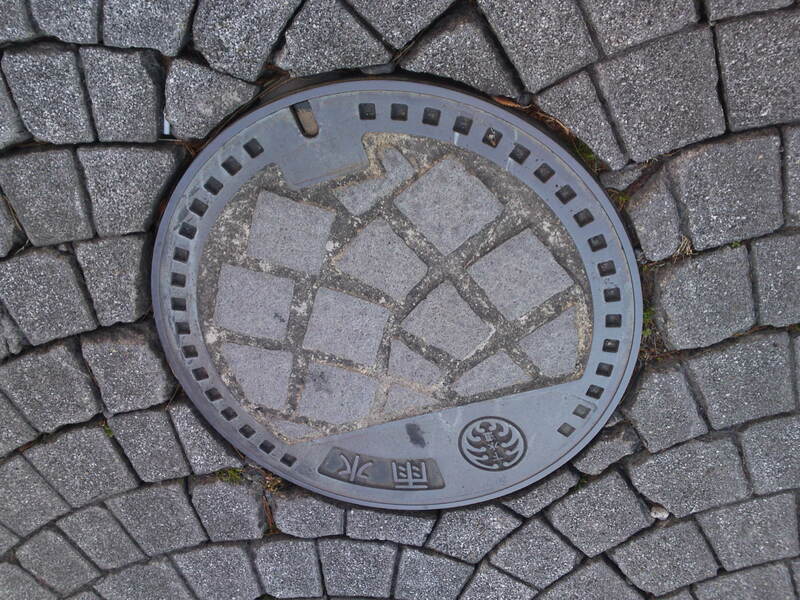 An old surviving pattern and shape used when Shimizu Ku was still Shimizu City! 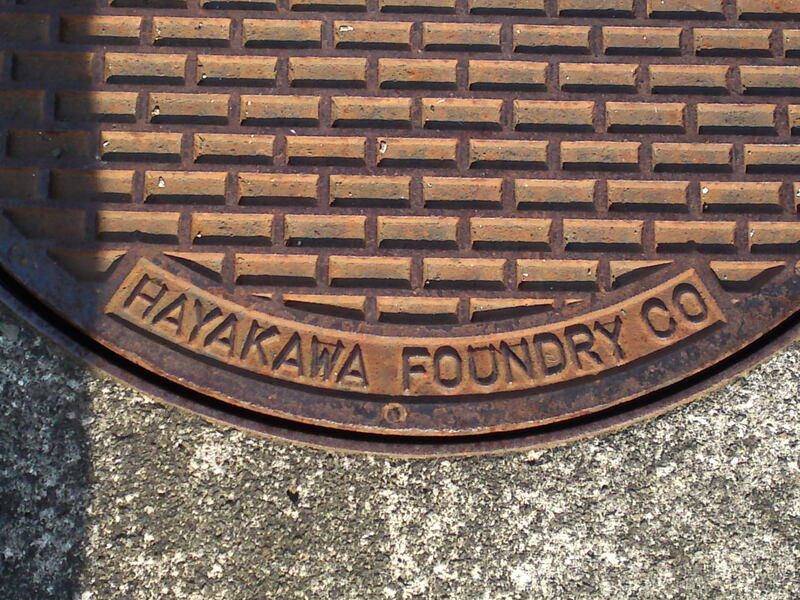 Another foundry Company found in Okitsu, Shimizu Ku, Shizuoka City! 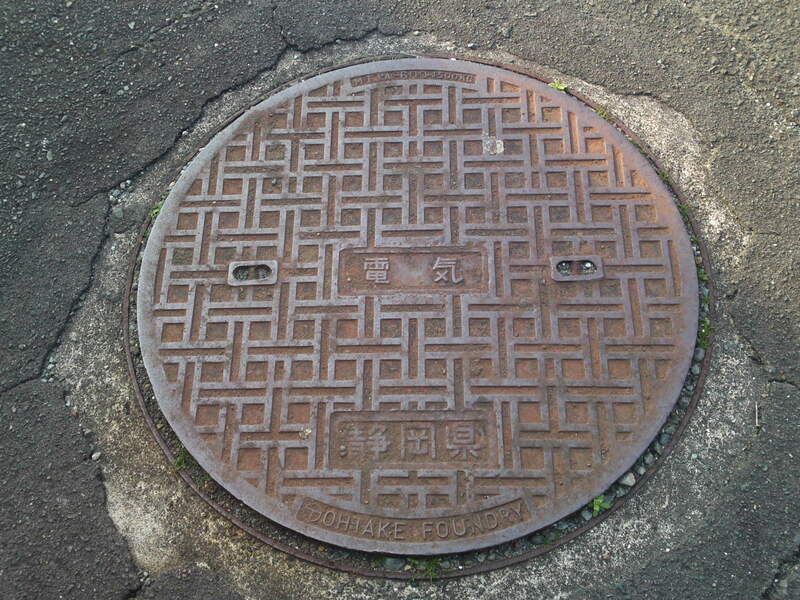 A different and ancient pattern I discovered near my home in Aoi ku, Shiuoka City! 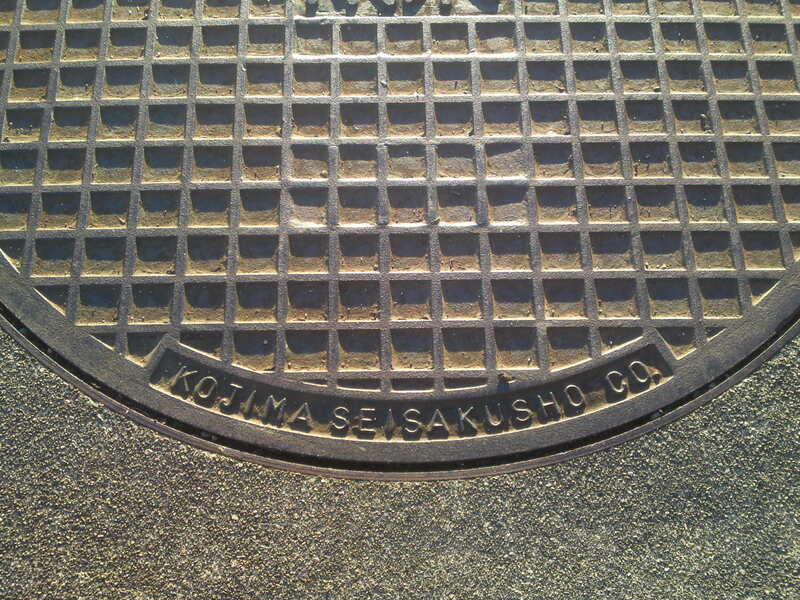 I also found this one near my g\home with still another company name! It seems there is a lot of competition for making them! 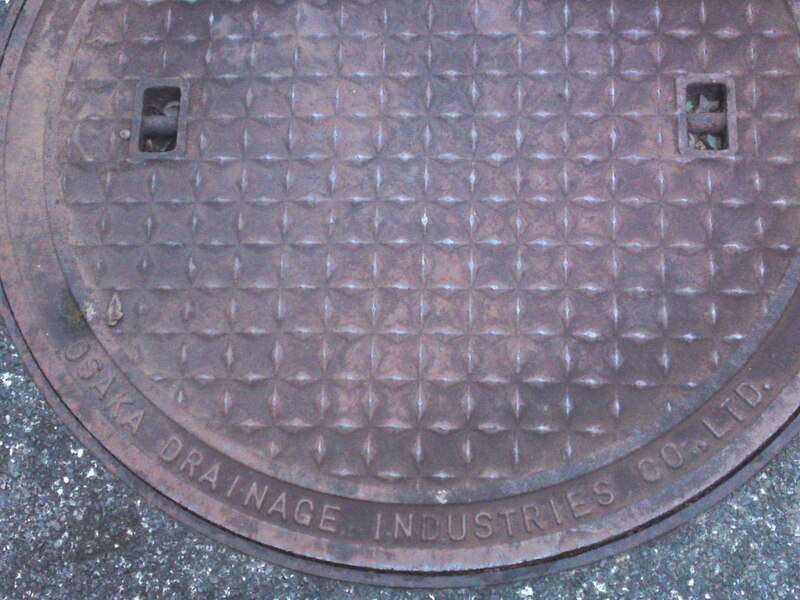 Osaka Drainage Industries Co. Ltd! Now that comes from far away! 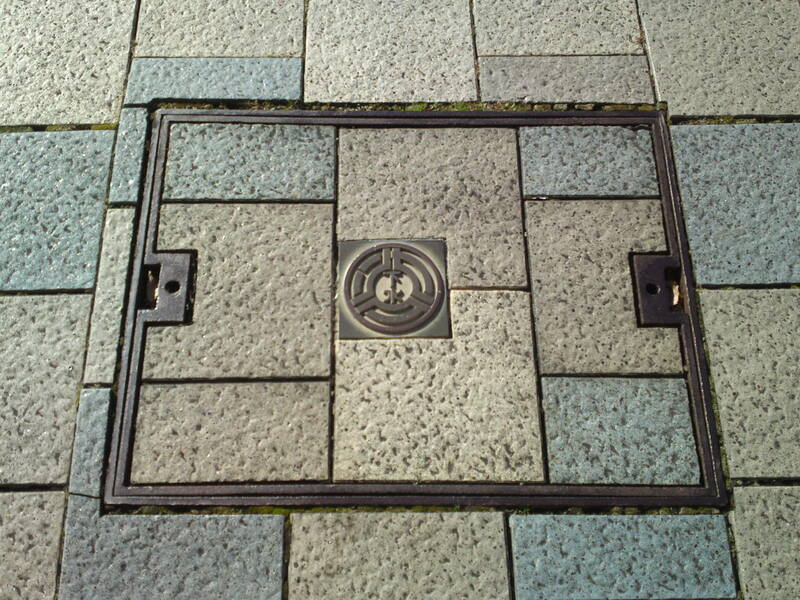 These day new manhole covers tend to become more inconspicuous as the city have them blended into the pavements patterns such as this one above and the three following I found lining up along renovated Komagata Street in Aoi Ku, Shizuoka City! 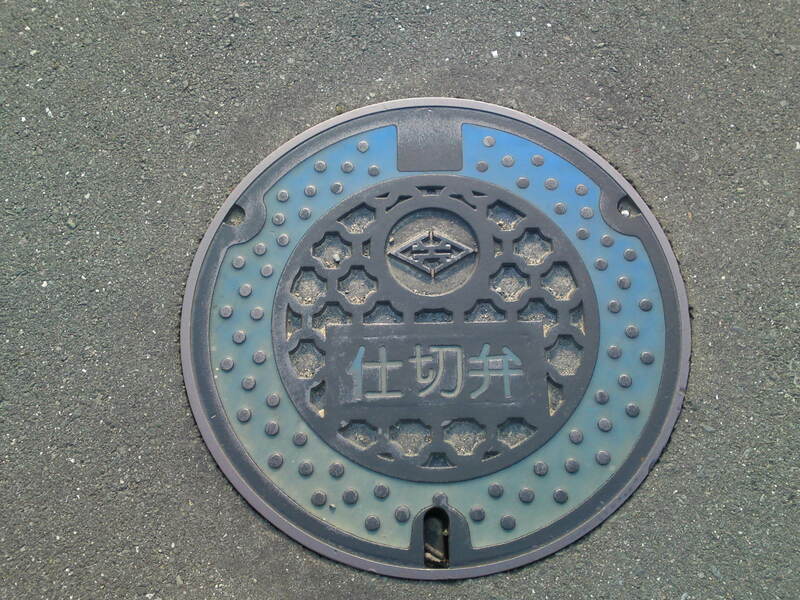 “Double-door” manhole cover from Chubu Electrics Company! 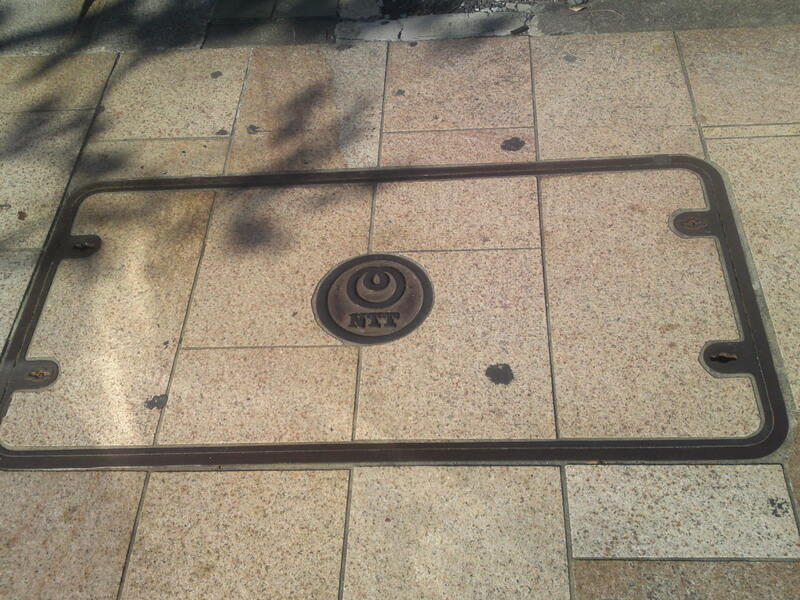 NTT/National Telephone & Telegraph cables! 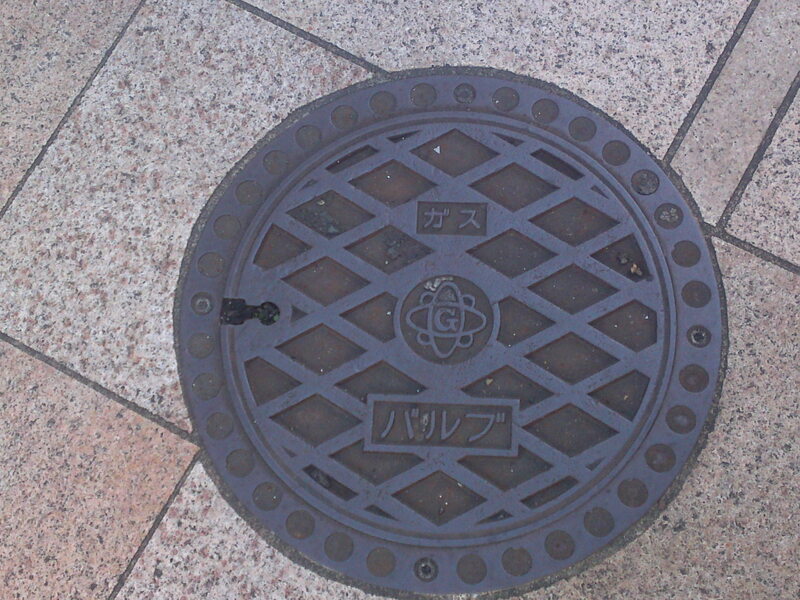 Another one from Chubu Electrics Company! 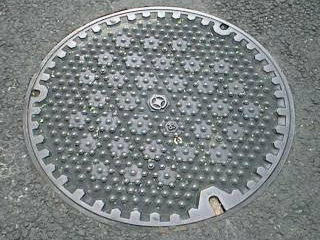 Manhole covers do not have to be round but can come as squre, rectangular and even “double-doored! 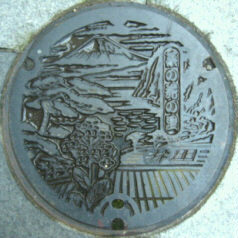 as this one above! 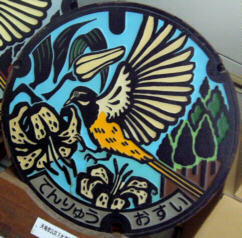 I continued looking around Aoi Ku and Shimizu Ku in Shizuoka City and in other cities. As I’m sure there are quite a few around there should quite a few more articles about the subject in the offing! I might even close this series with another “Ten Best”! 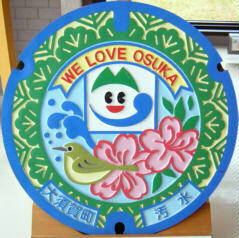 This time I concentrated in Aoi Ku, Shizuoka City, which allowed me to go a bit more technical all about it! 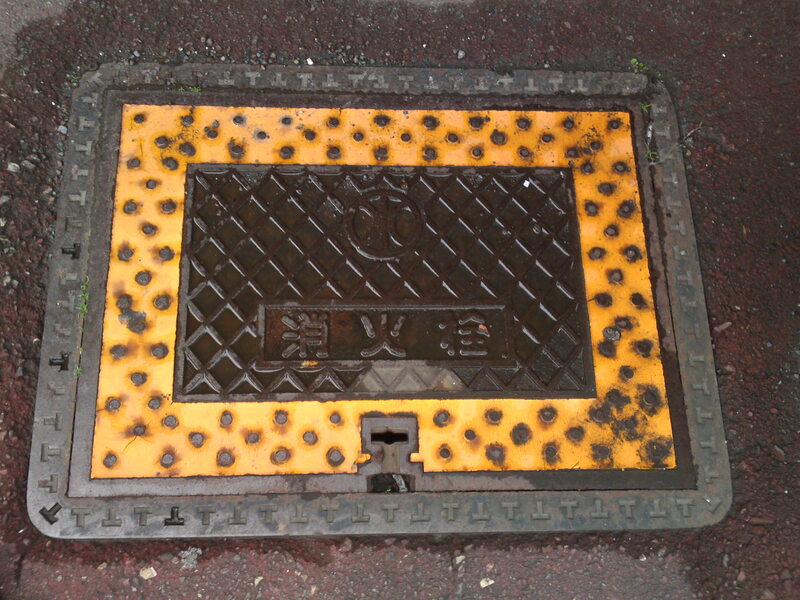 Another large rectangular manhole belonging to NTT/Nihon Telephone & Telegraph Company! 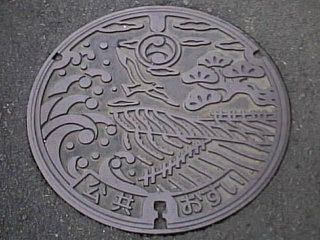 The log/arms/”mon” in the middle of this water duct/outlet manhole cover is actually the real seal of a Japanese family! 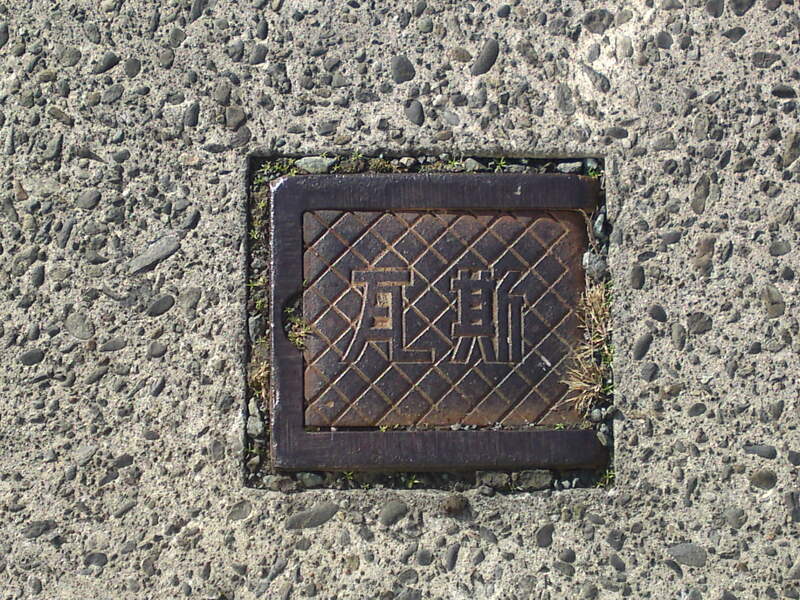 Haisui/排水 means “drainage”. 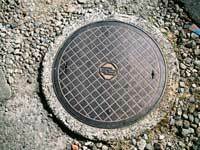 In that case, access to ducts and pipes taking care of excess or rain water! 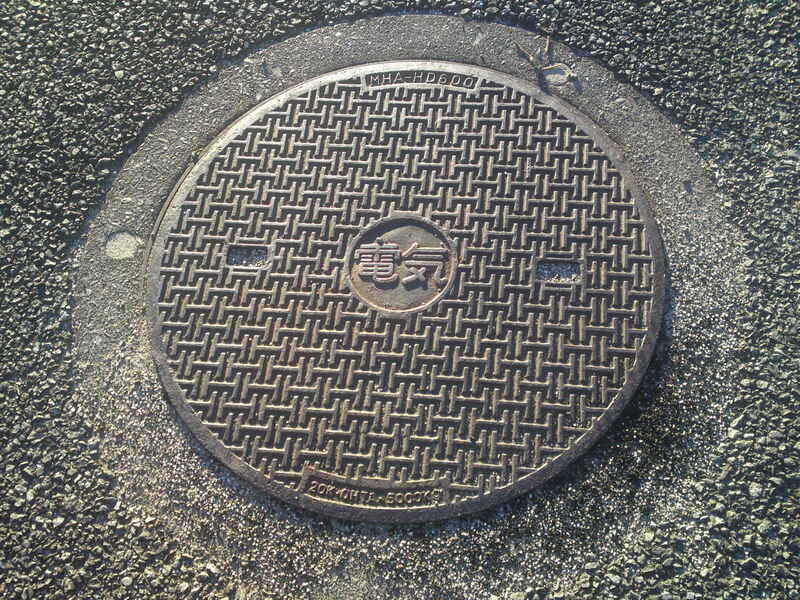 A large circular manhole owned by the Chubu Denryoku/Shizuoka Central Electric Power Company with their logo in the middle! 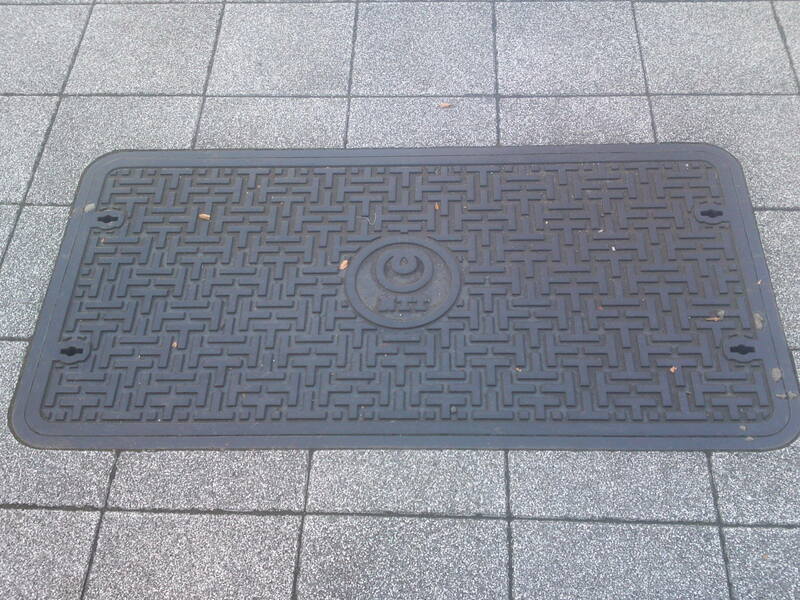 The same company has a few rectangular ones with the same pattern and material as surrounding pavement tiles! 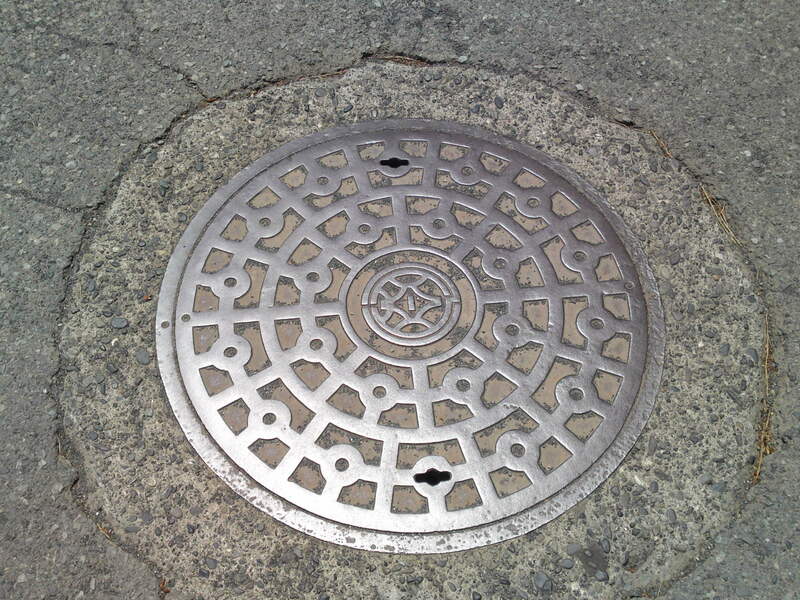 I’ve finally found the name of one Company fabricating these heavy wrought iron manholes! 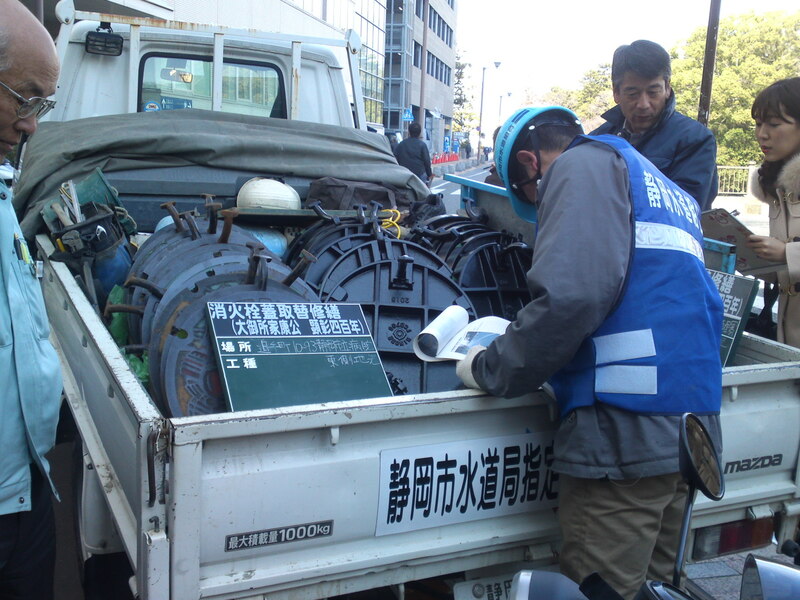 Access to the Municipal heavy water equipment! 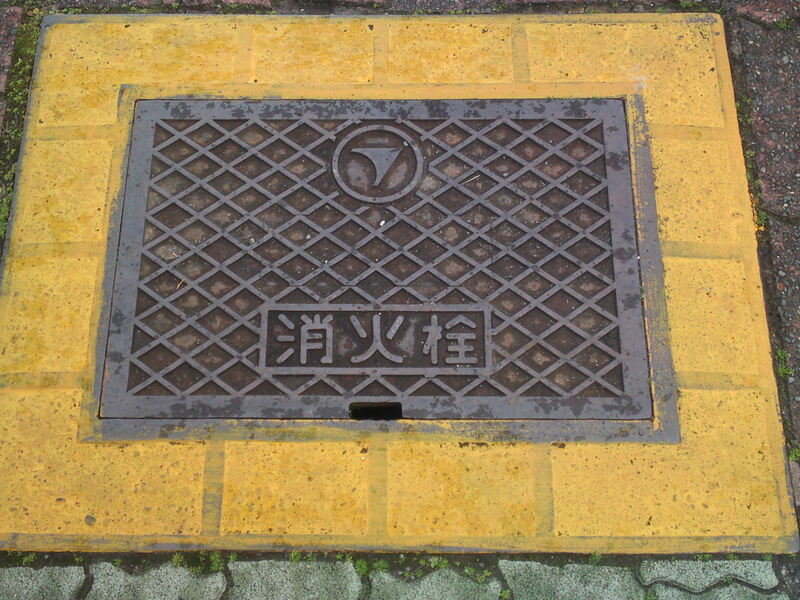 Another Haisui/排水/”drainage manhole cover blending into the surrounding pavement! Care to join the search? 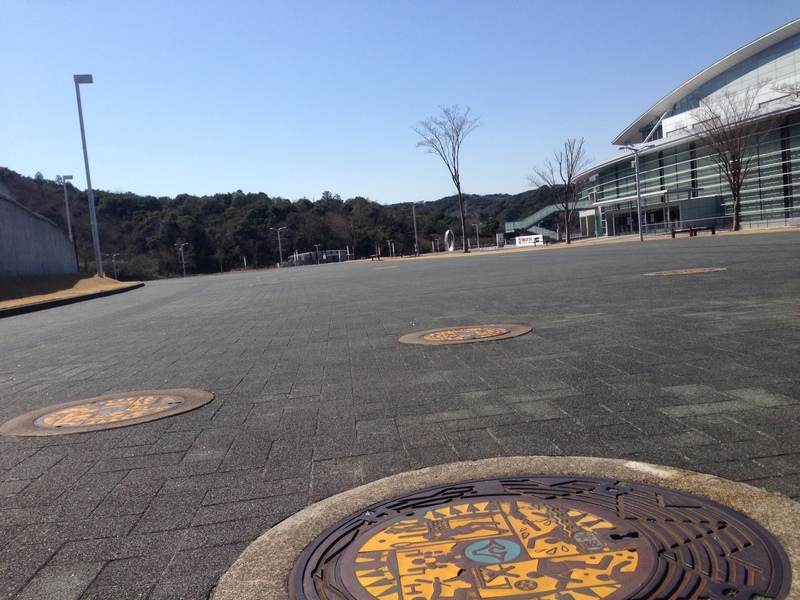 Taken in Shimizu Ku, Shizuoka City, the home of Shimizu S Pulse pro Soccer Team! 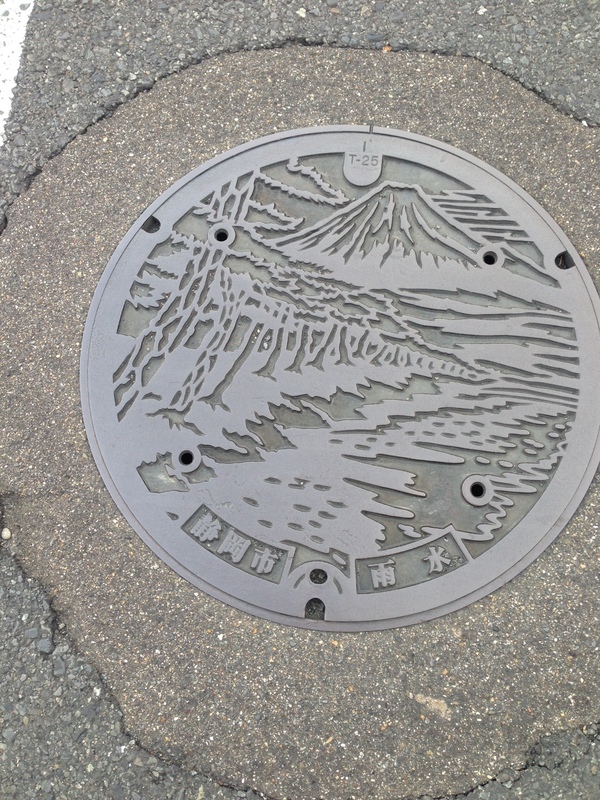 I found this one in Numazu City representing its harbor and Mount Fuji! 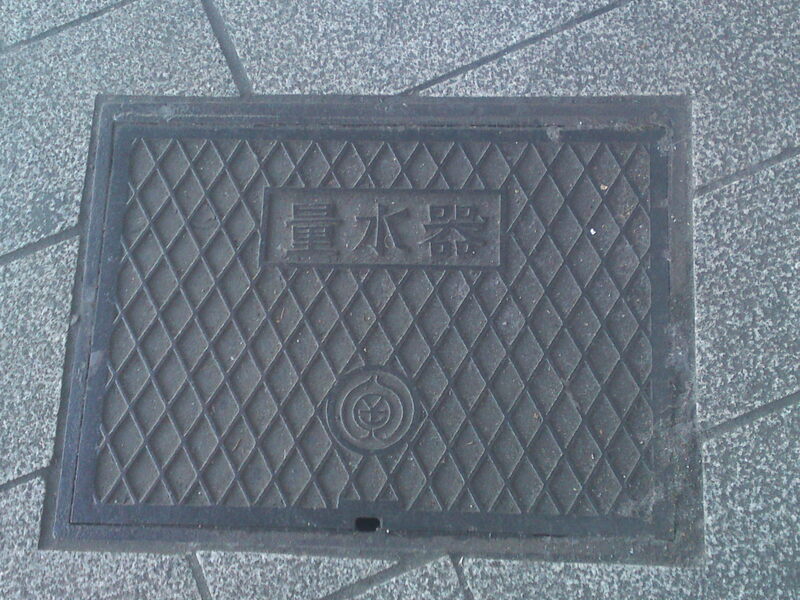 I found this manhole cover in Kikugawa City over a pressured air duct! 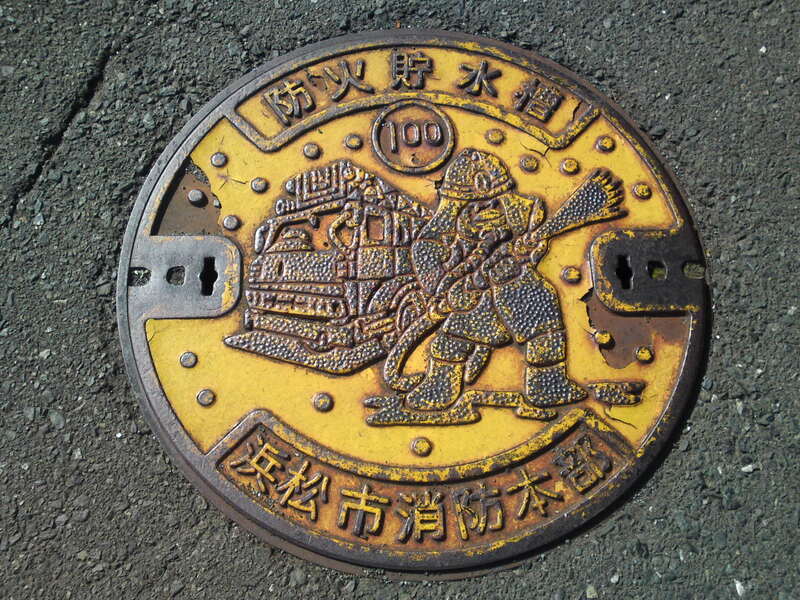 I found this one In Aoi Ku, Shizuoka City over a water hydrant reserved to local firemen! 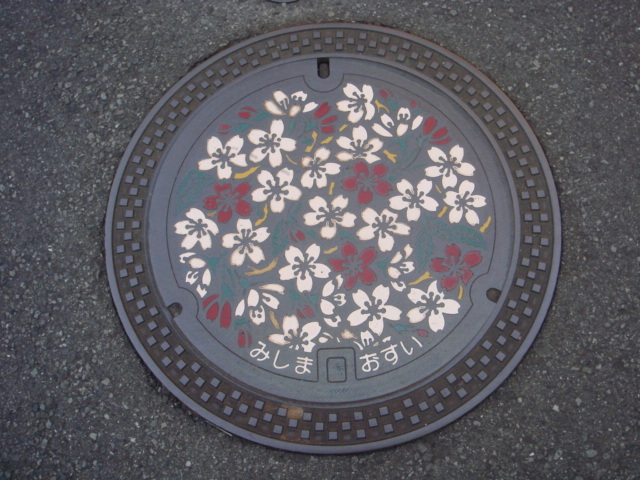 This design exists in different colors in Aoi Ku, Shziuoka City! 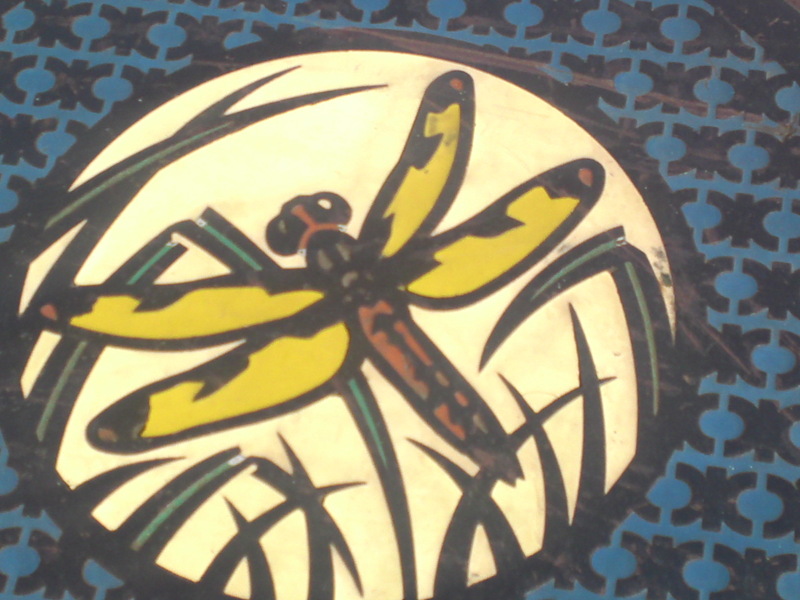 The same as above, but without the enameled colors! 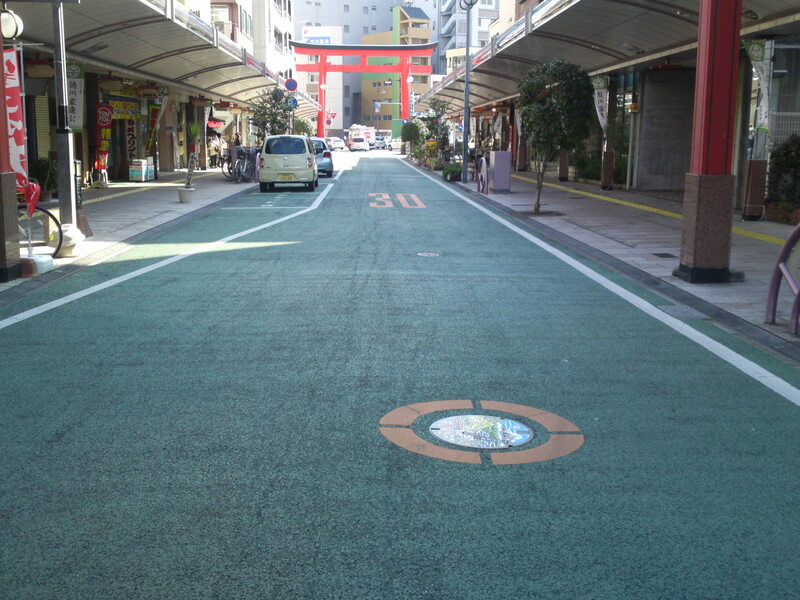 This one in Shimizu Ku, Shizuoka City, both exists with and without colors! 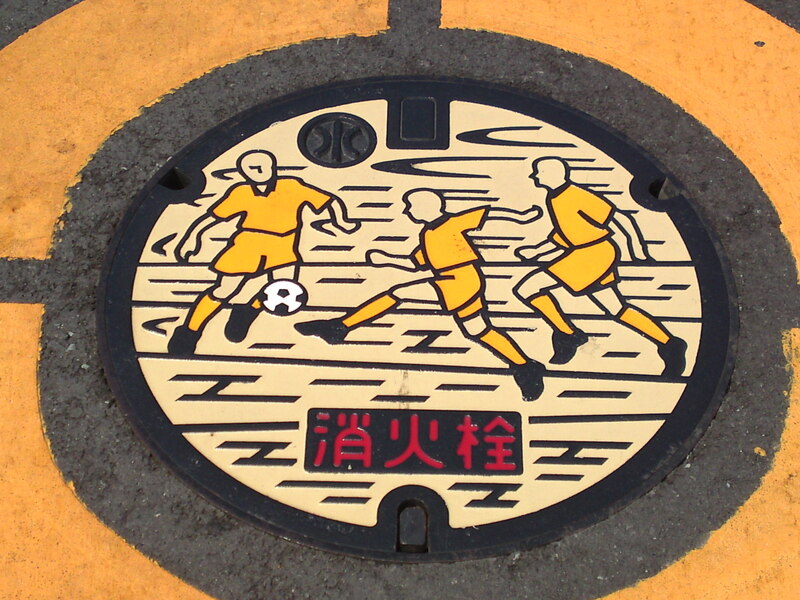 Soccer in Shimizu Ku, Shizuoka City, over a fire hydrant! 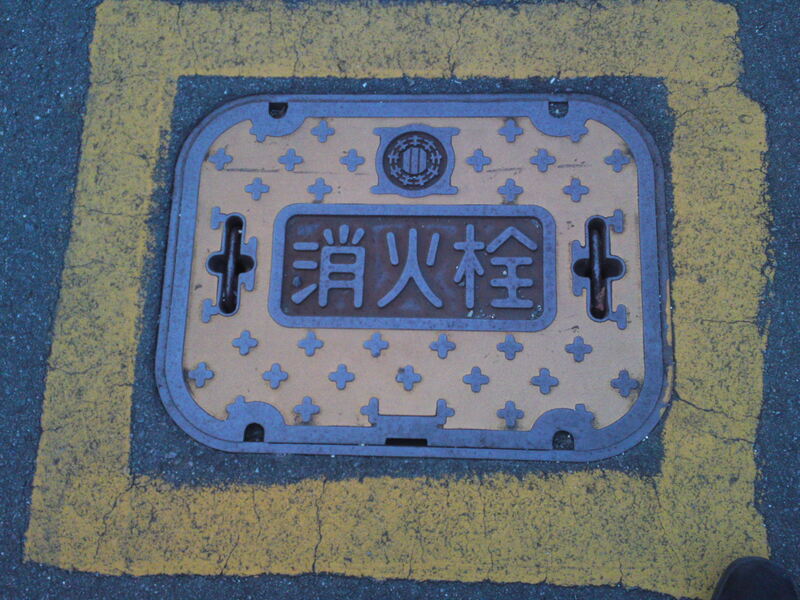 This one over a gas duct of the notorious Shizuoka Gas Co. in Shimizu Ku, Shizuoka City! 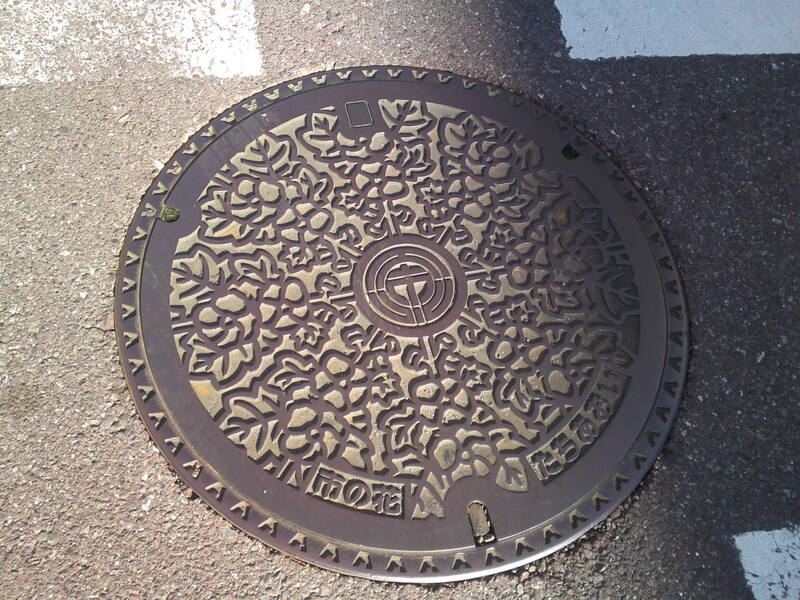 No colors but an intricate flower pattern in Shimizu Ku, Shizuoka City! 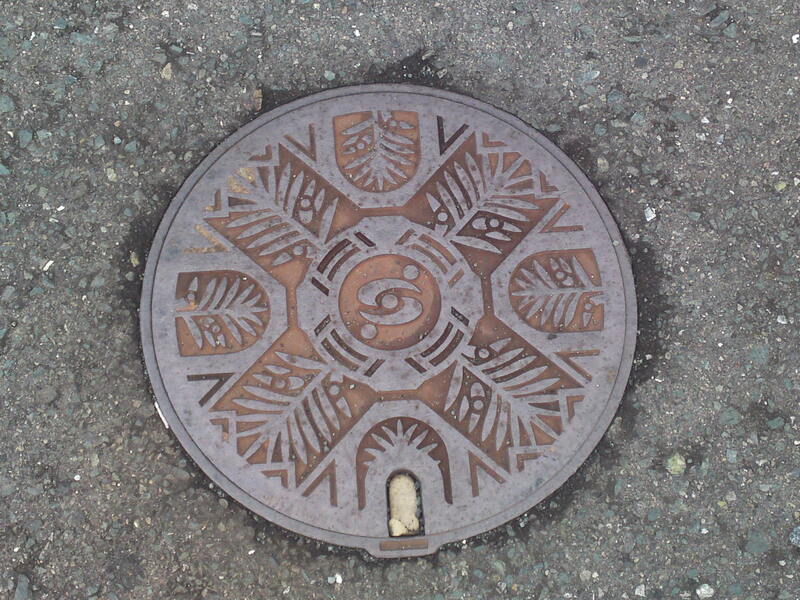 An older intricate motif in Shizmizu Ku, Shizuoka City! 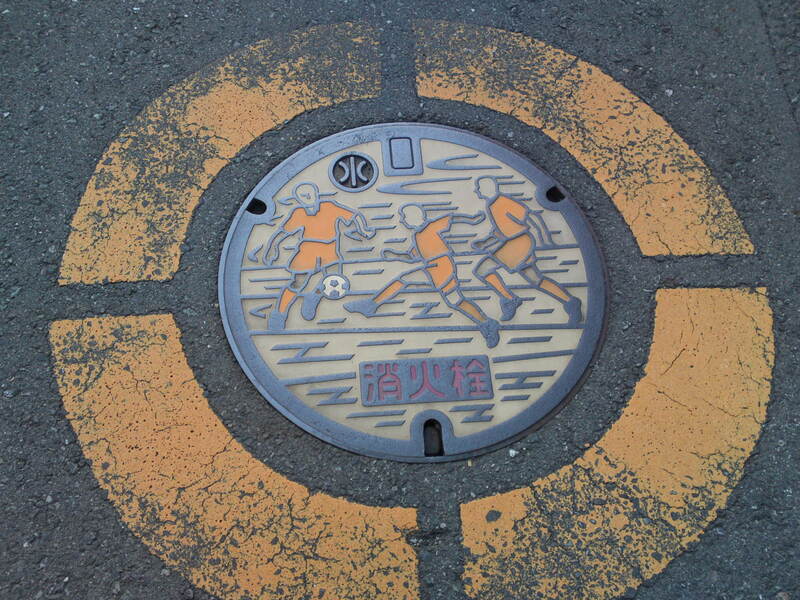 Soccer again on this tiny water duct manhole cover in Shimizu Ku, Shizuoka City! 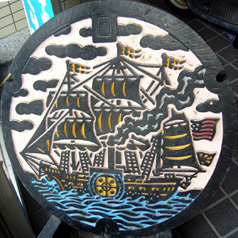 An old one in Shimizu Ku, Shizuoka City, unless the near sea sat winds accelerated its rusting! It still makes for a beautiful color! 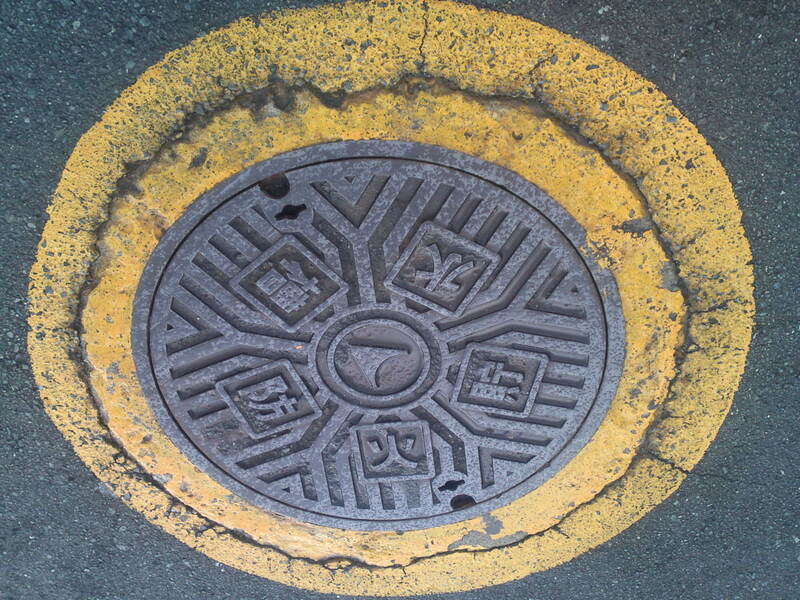 A manhole cover over the access to a subterranean fire hydrant! 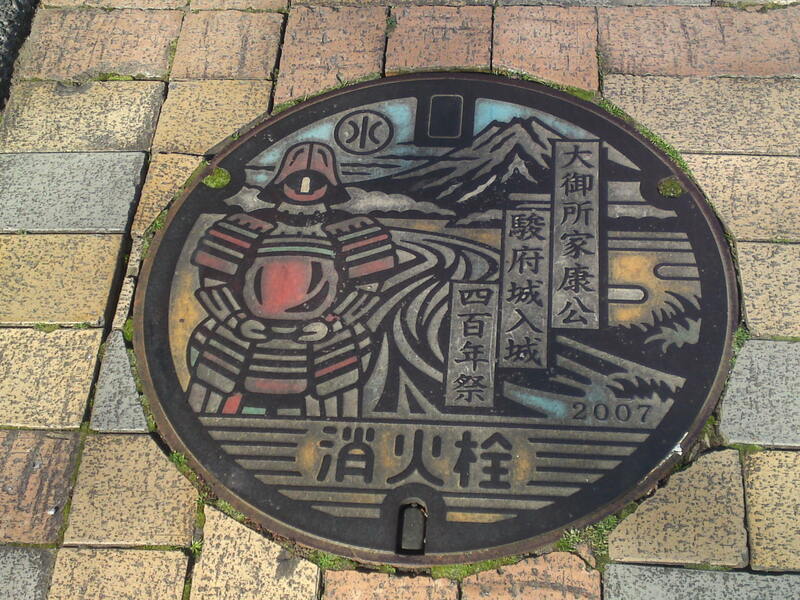 The design advertises the fact that Shizuoka City , Sumpu at the times, was the city chosen by the greatest Japanese Shogun, Tokugawa Ieyasu, when he chose to retire from politics! 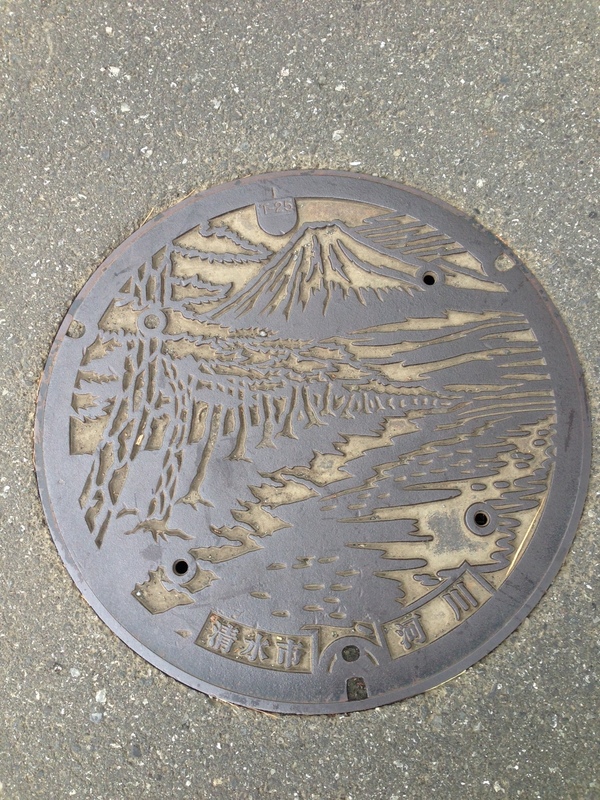 With Mount Fuji and the Abe River! 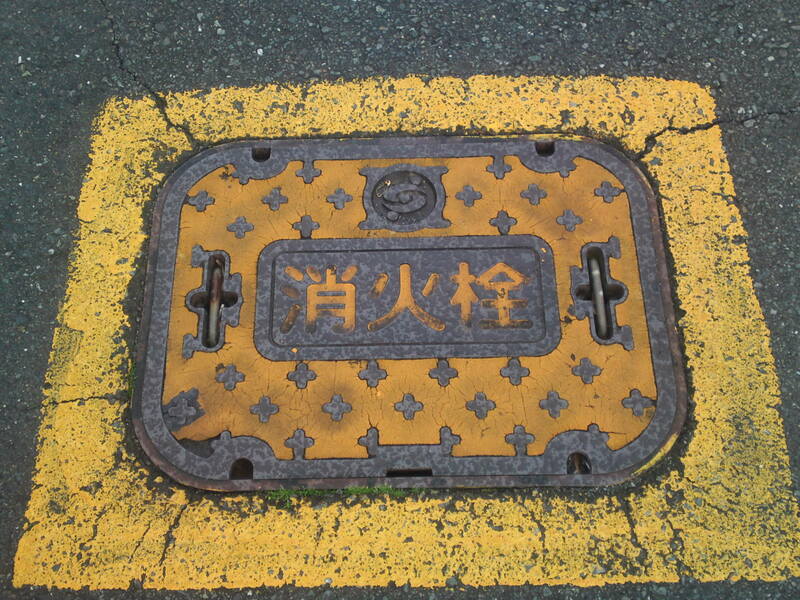 I already know of many blogging friends in Japan taking pictures of manhole covers all over Japan. 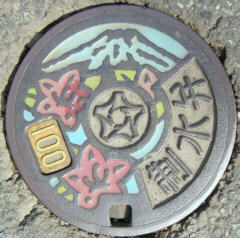 I decided to start looking around when I found quite a few in Shimada City during the Shimada Obi Festival. As I’m sure there are quite a few there should quite a few more articles about the subject in the offing! 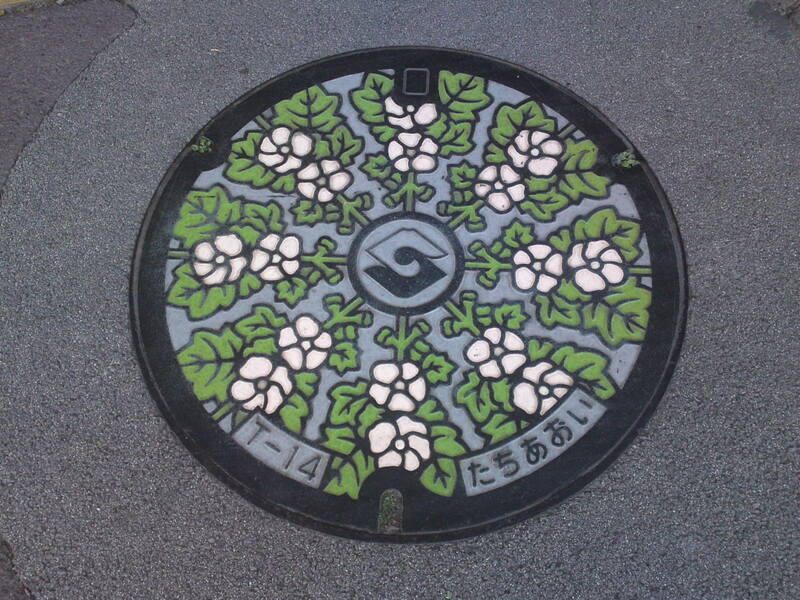 Stylized Tea leaf on a manhole cover in Kikugawa City! 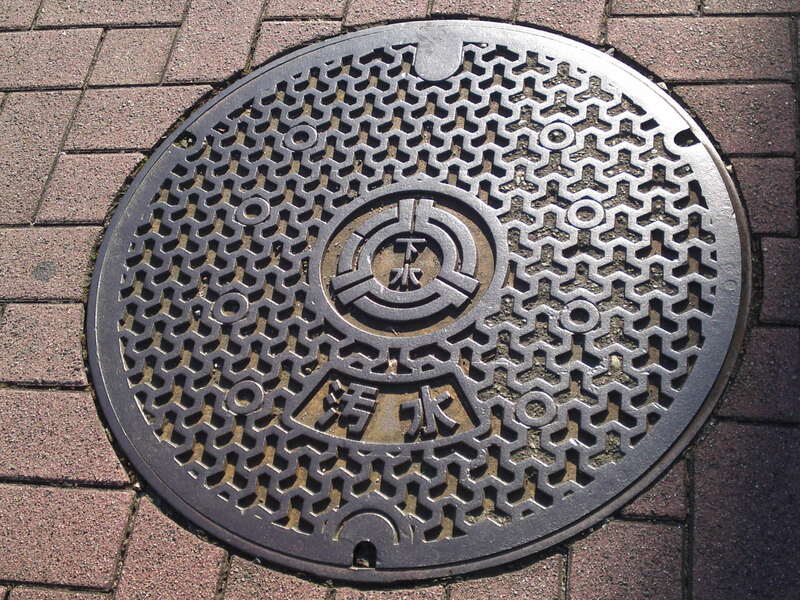 In Japan manhole covers are not only found above accesses to sewers but also to electric cables, phone cables, gas conduits and water accesses. 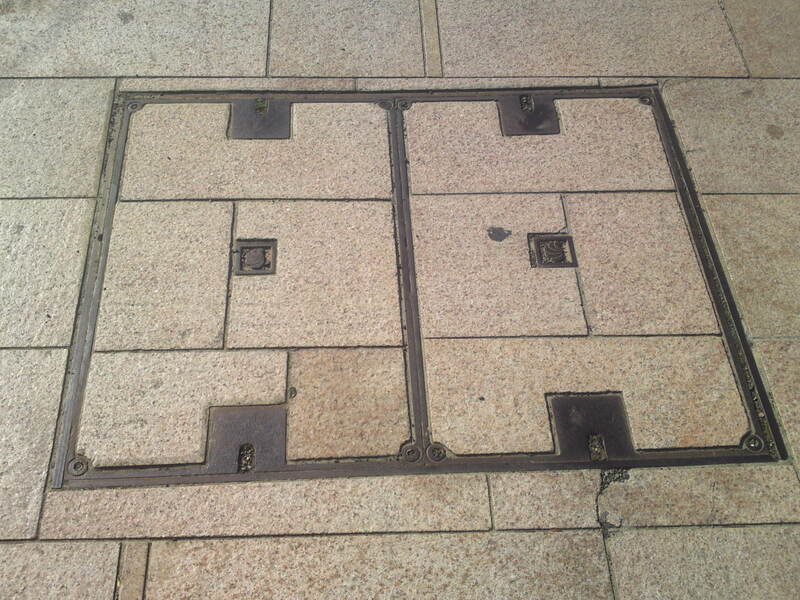 There not always round but also square, rectangular and square. 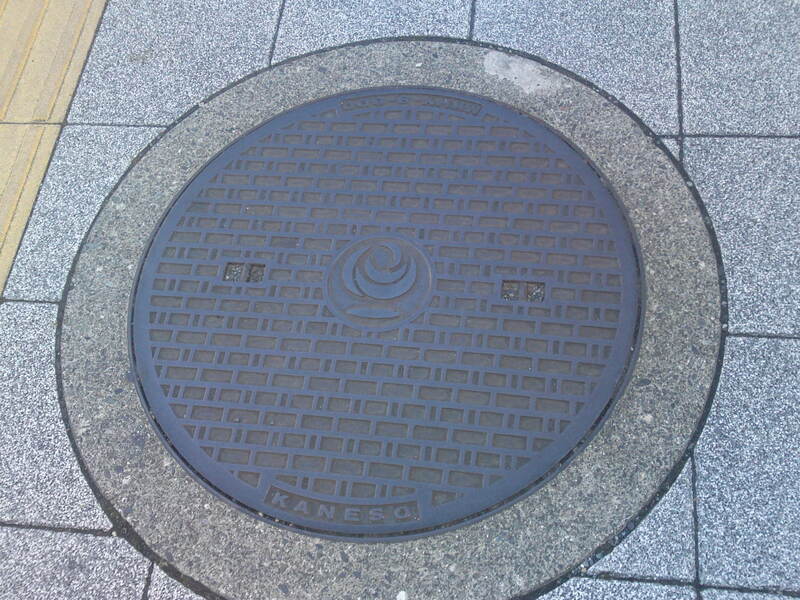 You might add the many small ones used for access to electric or phone cables, too! 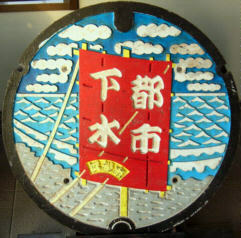 Kikugawa City is very famous for its green tea. 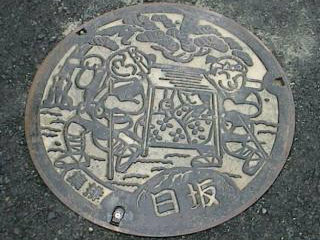 The design above is that of a young lady picking the new leaves by hand and wearing traditional Japanese farmer clothes! 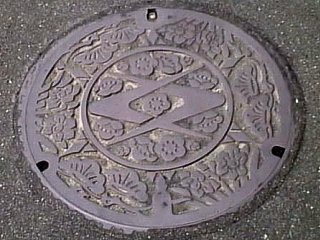 The design of this manhole was inspired by an old ukiyoe/woodblock print depicting the crossing of Oi River at Hourai in Shimada City! 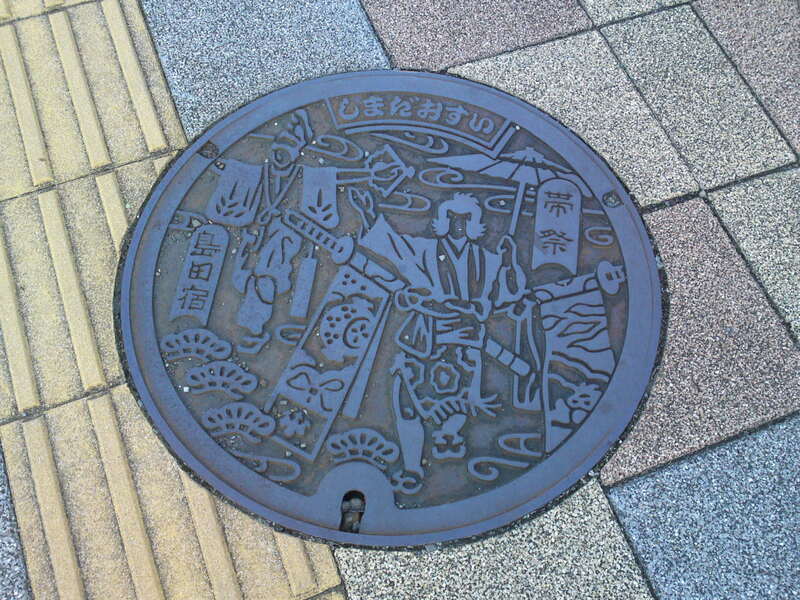 Shimada Obi Festival on a manhole cover! 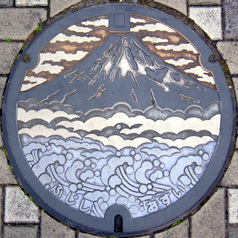 The crossing of the Oi river at Hourai In Shimada City with Mount Fuji in the background. The bridge crossing the river there is the longest wooden bridge in the whole world! A Sabre Dancer at the Shimada Obi Festival! 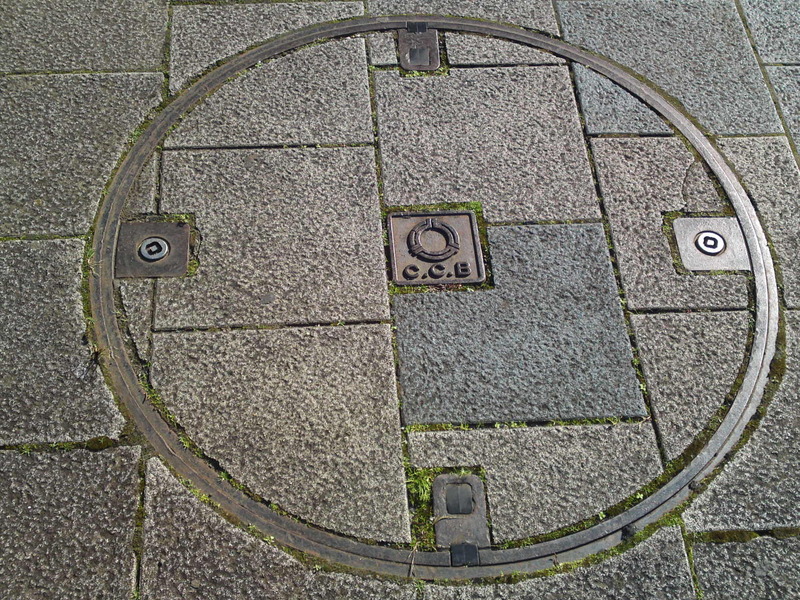 A symetrical design for a manhole used by the notorious Shizuoka Gas Company! If you to know why I said “notorious” I can explain in a separate article! 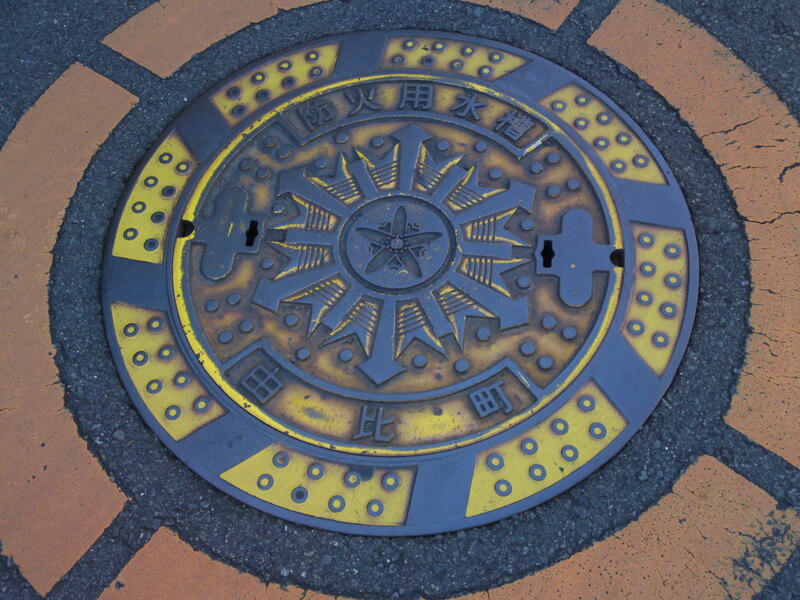 An enameled manhole cover in Aoi Ku, Shizuoka City. 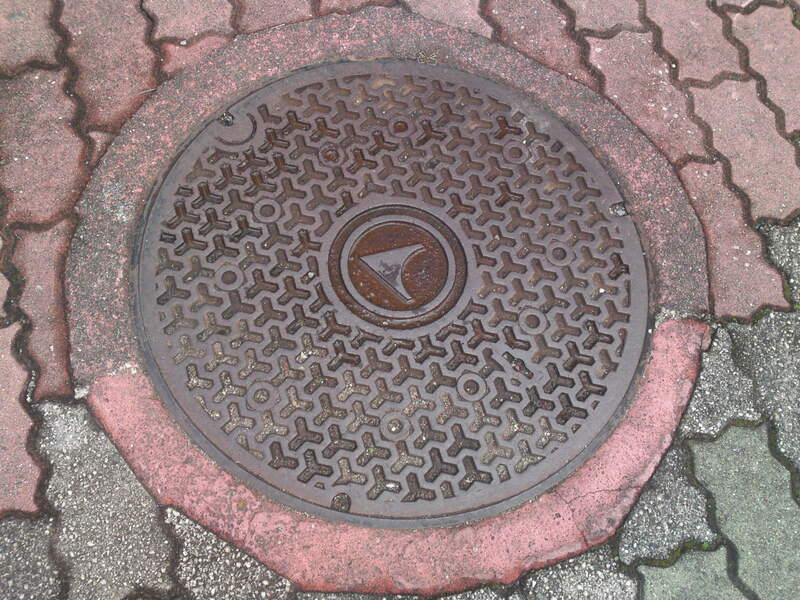 Probably that of an electric company! 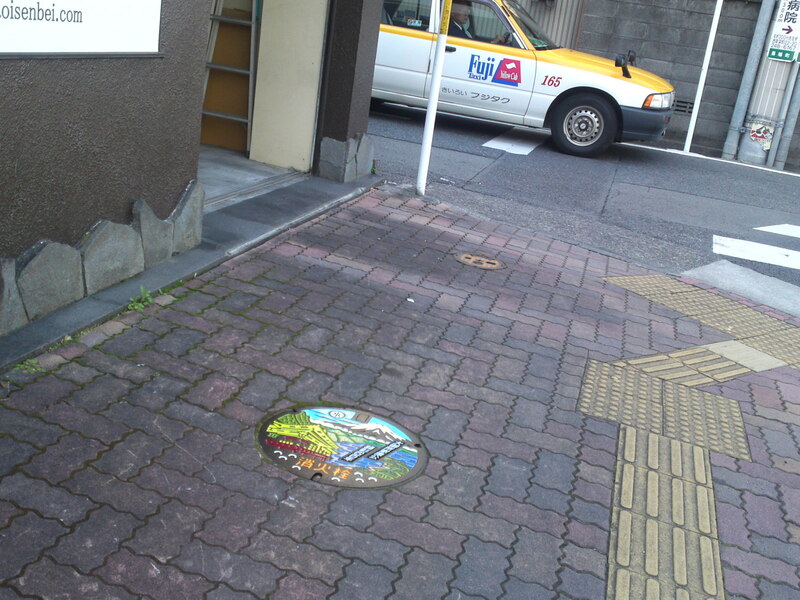 A very small manhole cover to access to another fire hydrant in Shizuoka City! 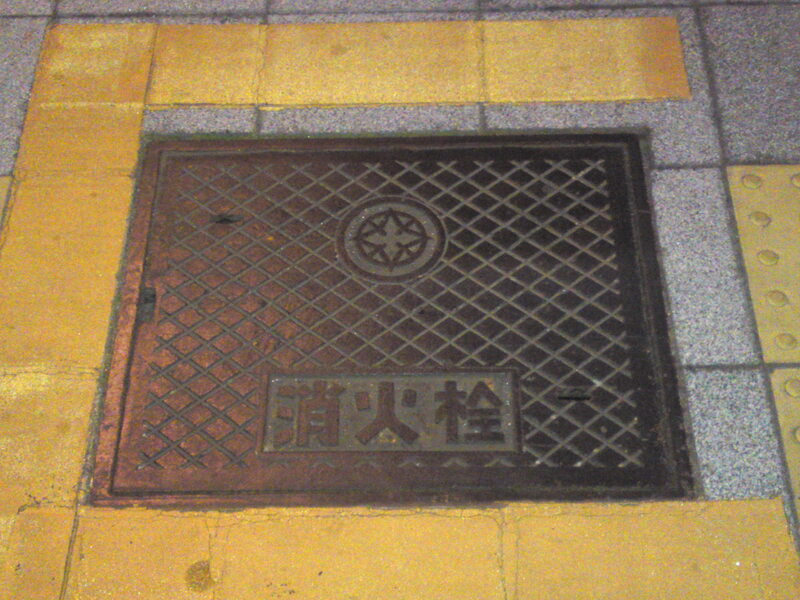 A rectangular manhole in Shizuoka City over the access to another fire hydrant. 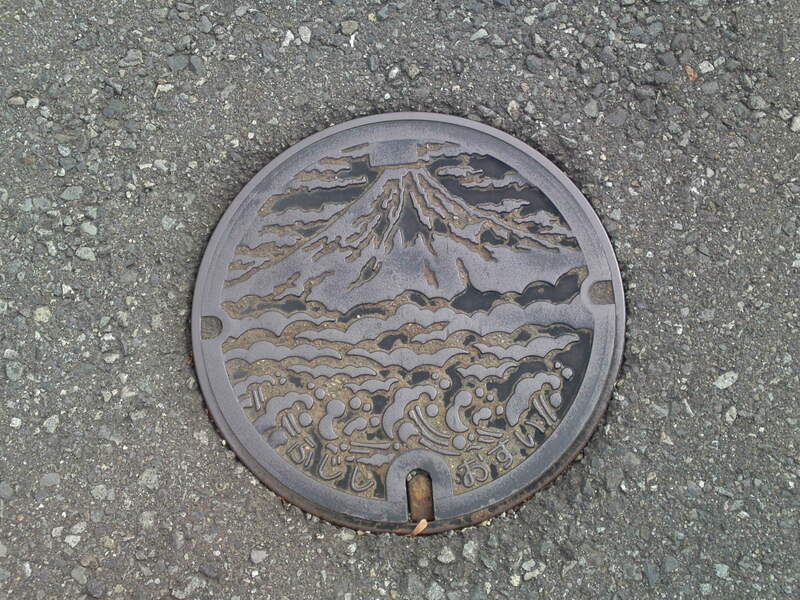 The design represents Mount Fuji, tea fields, the Abe River and the Toro Ruins!